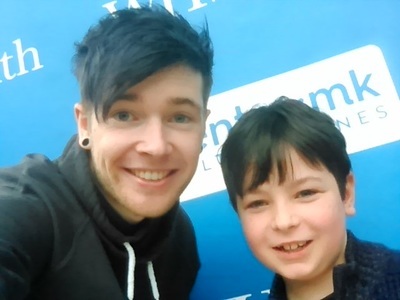 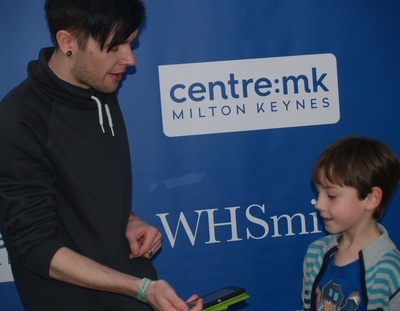 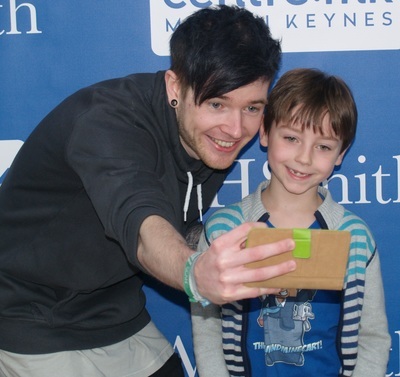 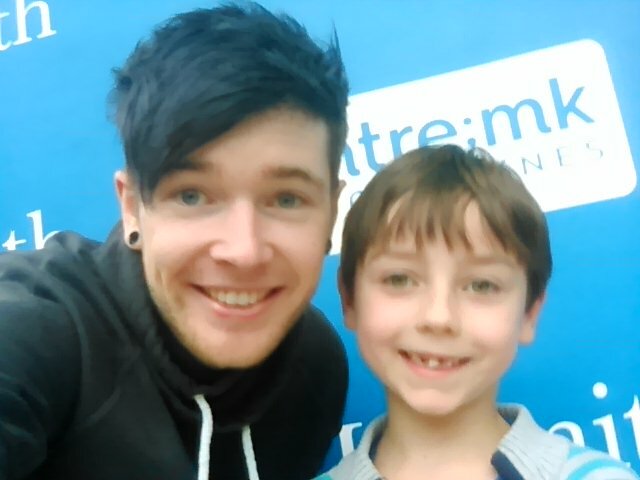 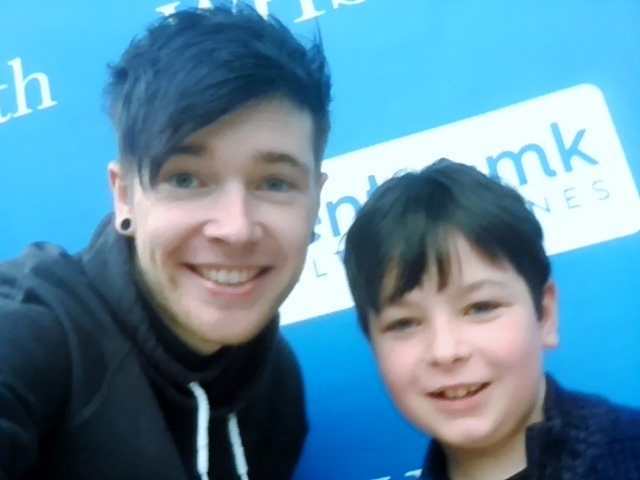 Today as a special treat for James's birthday we all went to Milton Keynes to a book signing. 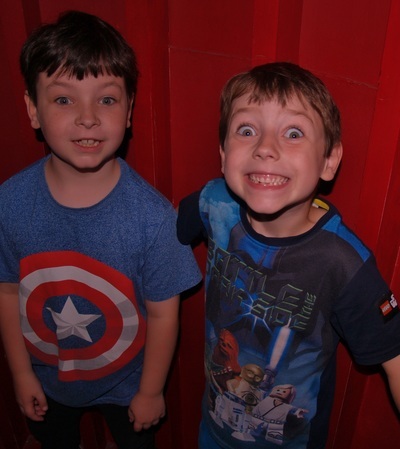 Both boys really like watching You Tube videos and thier hero is a man callled Dan TDM. 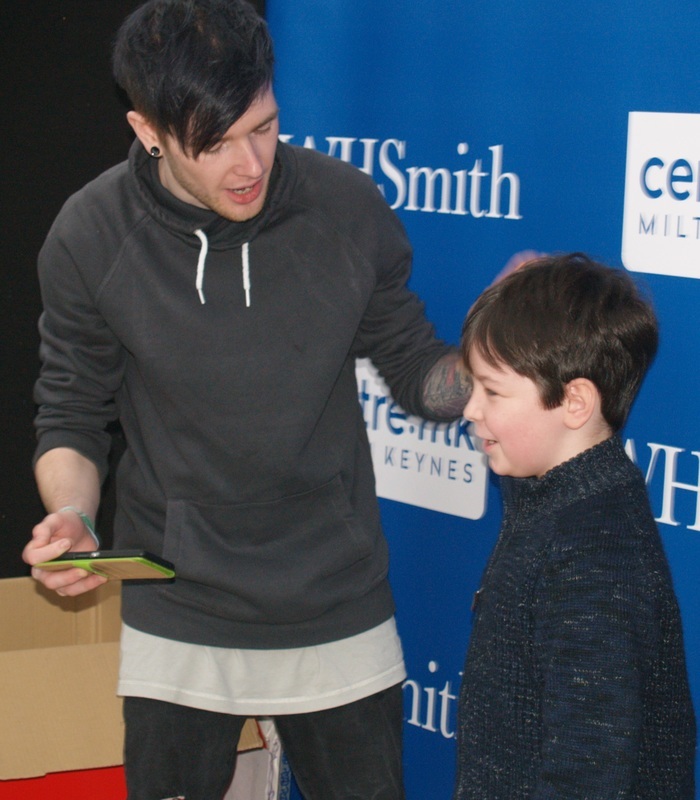 We had to go to the Centre MK and line up to meet him and he gave the boys a signed copy of his new book "Trayaurus And The Enchanted Crystal". They both loved meeting him and he took the time to speak to each child, take a picture with them and give them all a high five. 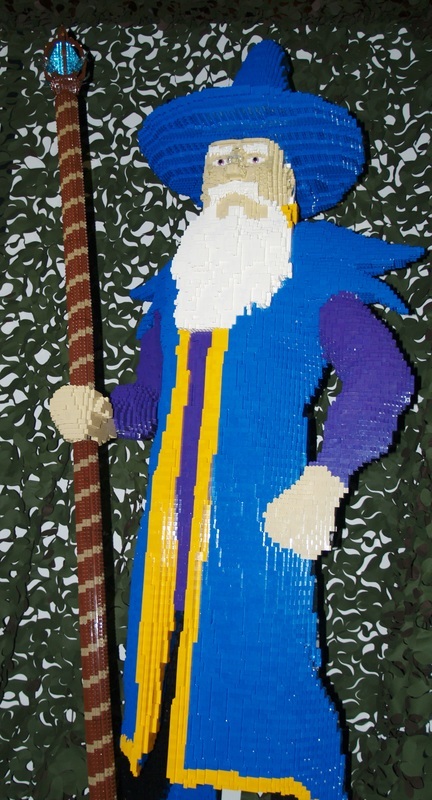 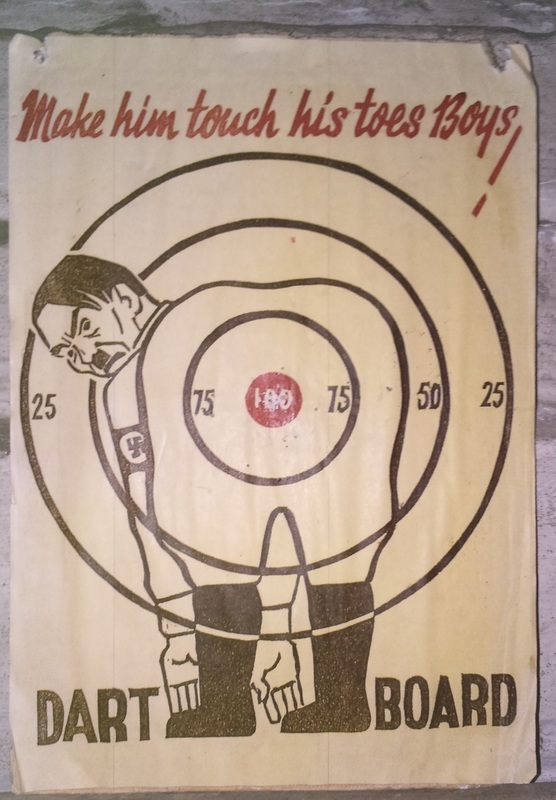 He was a lovely guy. 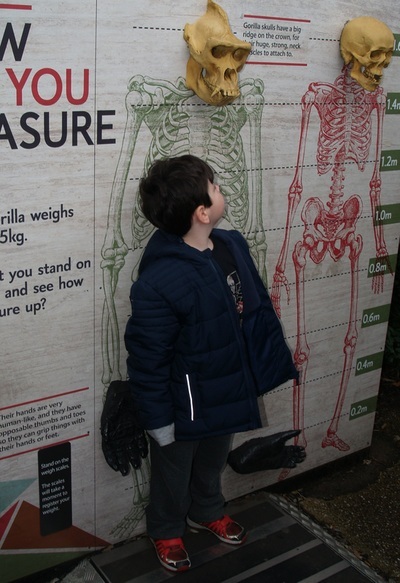 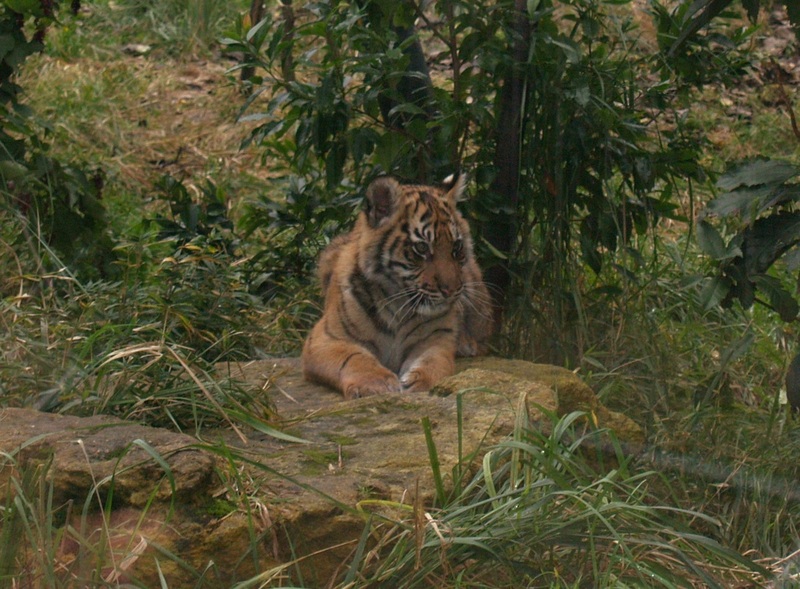 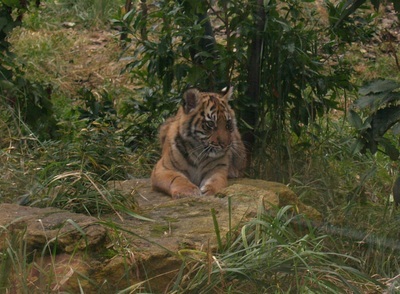 Yesterday we visited London Zoo which is located within Regents Park in central London. 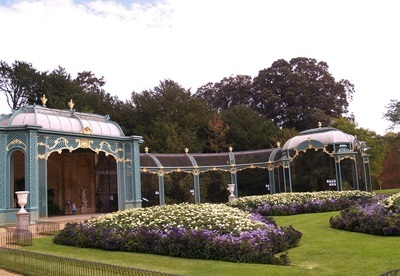 It is easily accessible by both train and bus and is a short walk from Lords Cricket Ground. 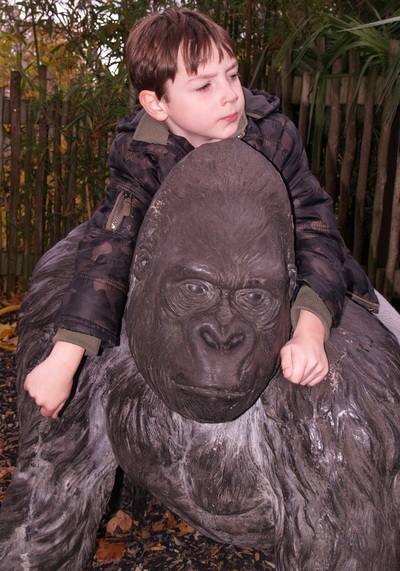 We were really impressed with the zoo as there were some animals there we had not seen in a British zoo before such as gorillas and kangaroos. 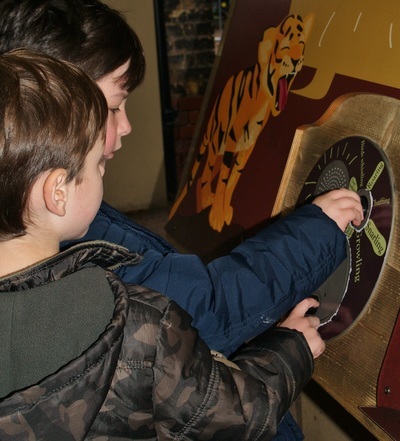 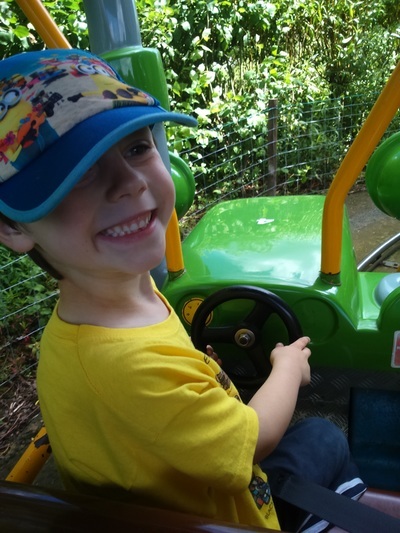 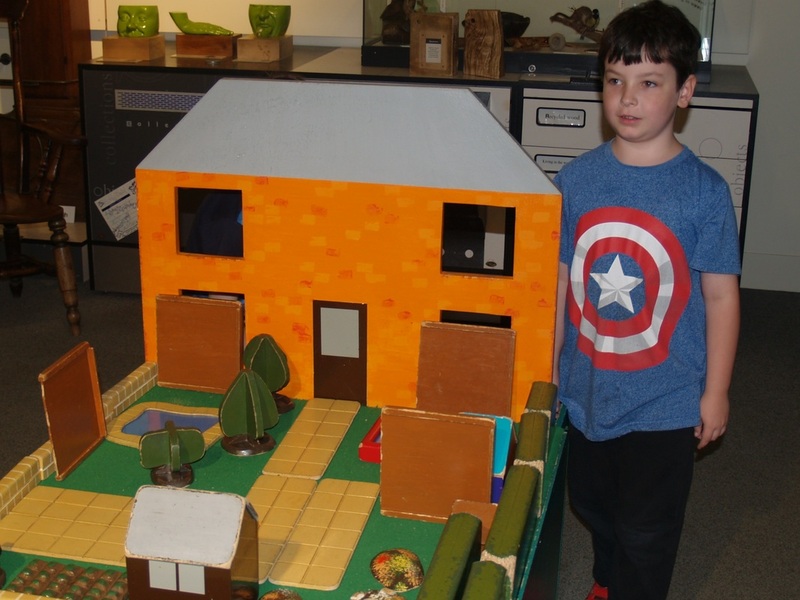 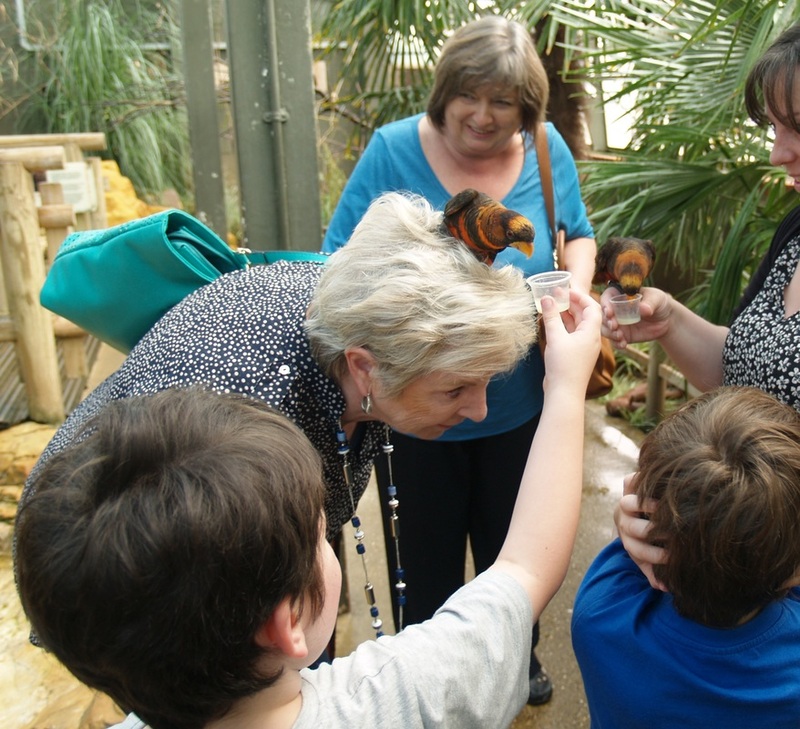 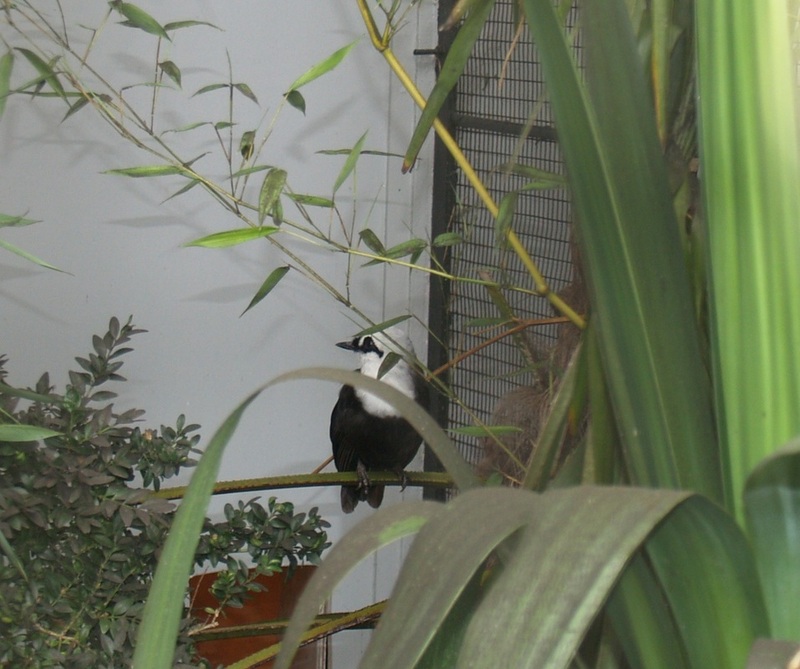 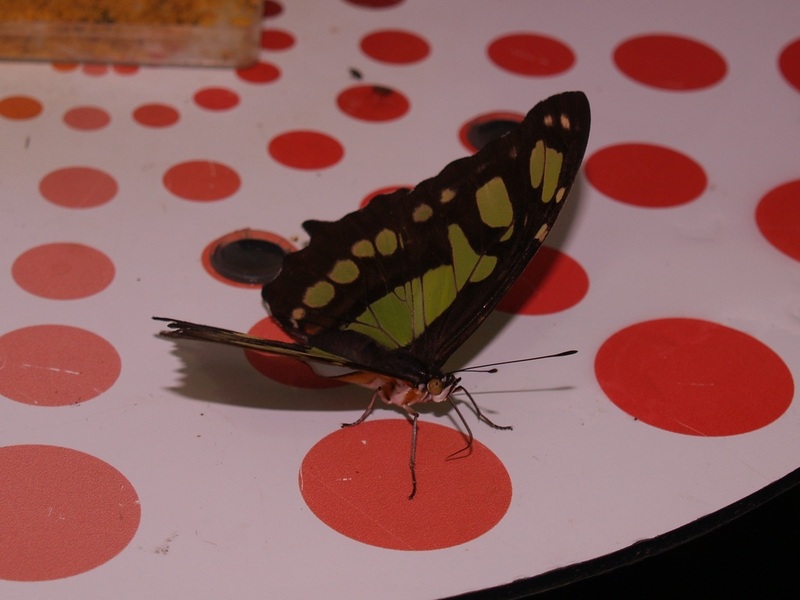 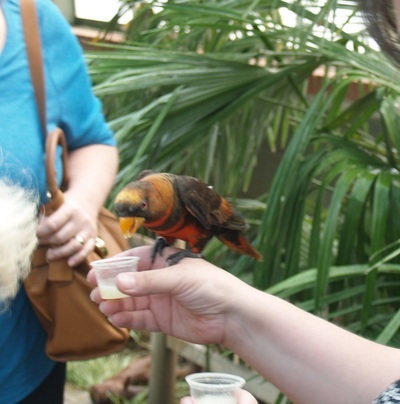 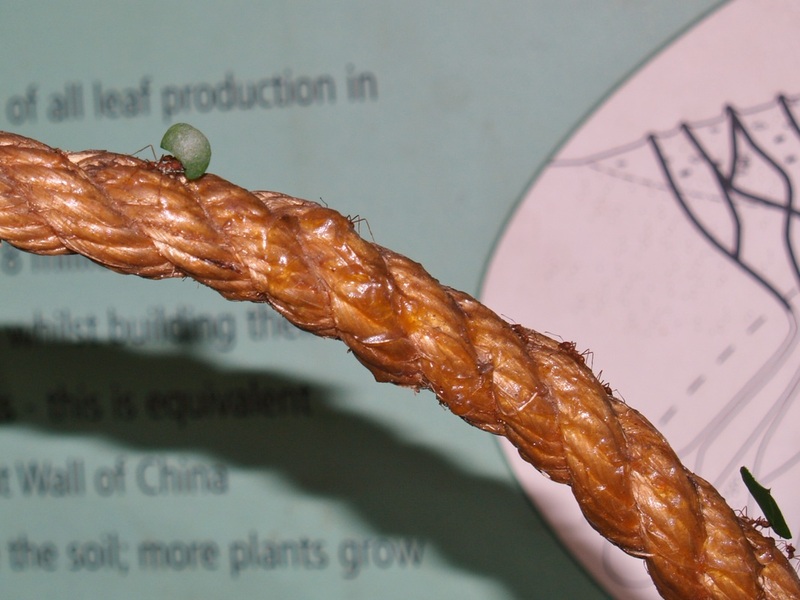 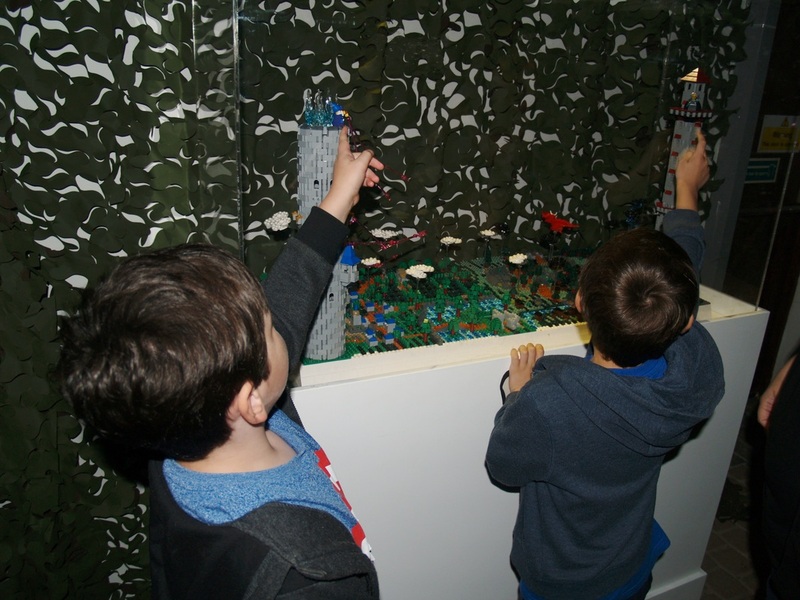 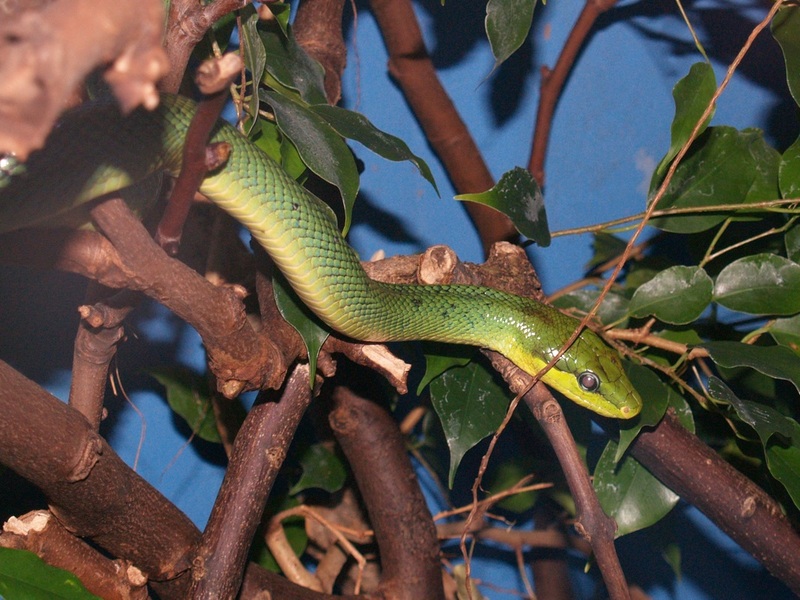 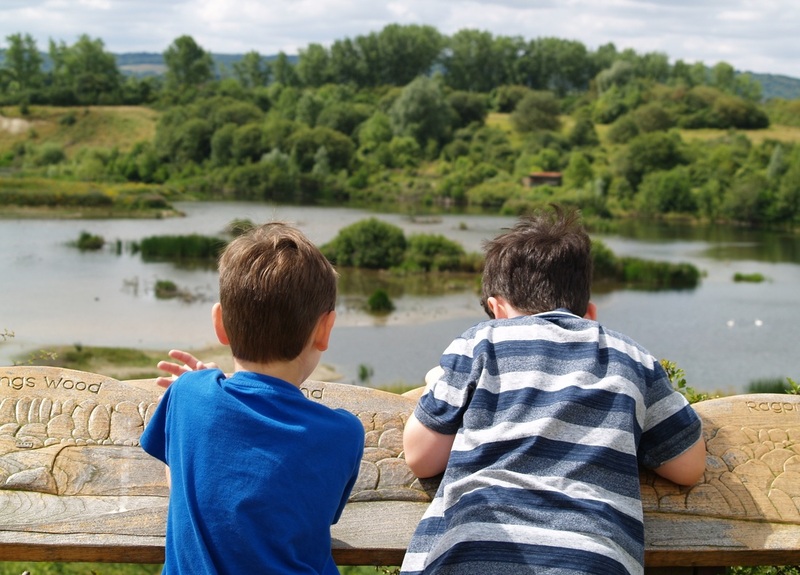 There are lots of interactive features around the site and so many different areas to explore such as a butterfly house, aviary, aquarium, reptile house etc. There are shows and feedings going on throughout the day that you can watch too. 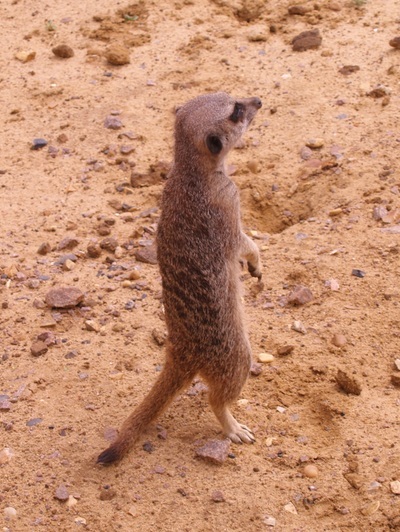 We saw one about mammals but there are others about reptiles and nocturnal animals too. 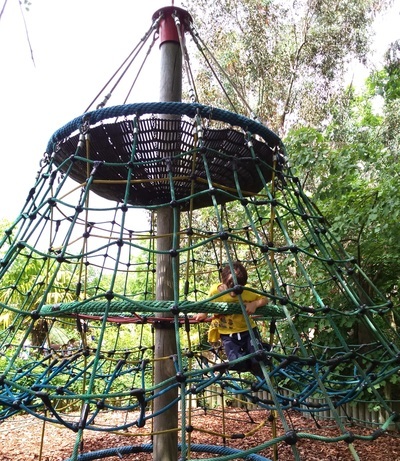 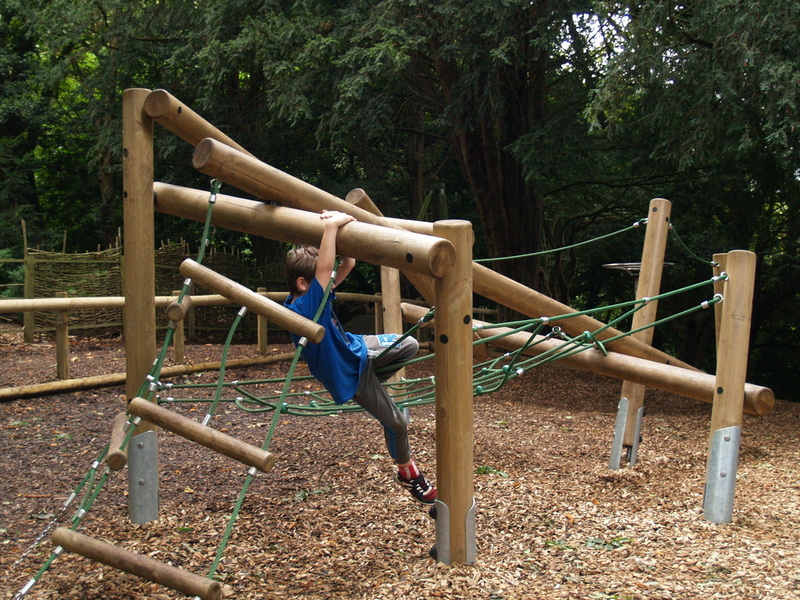 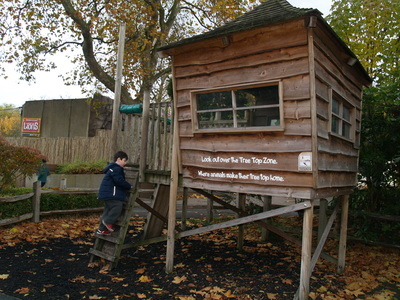 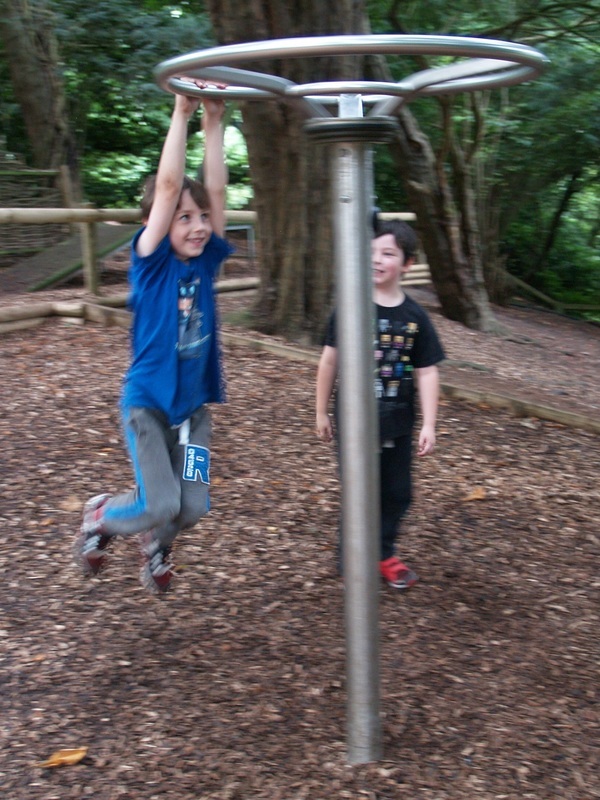 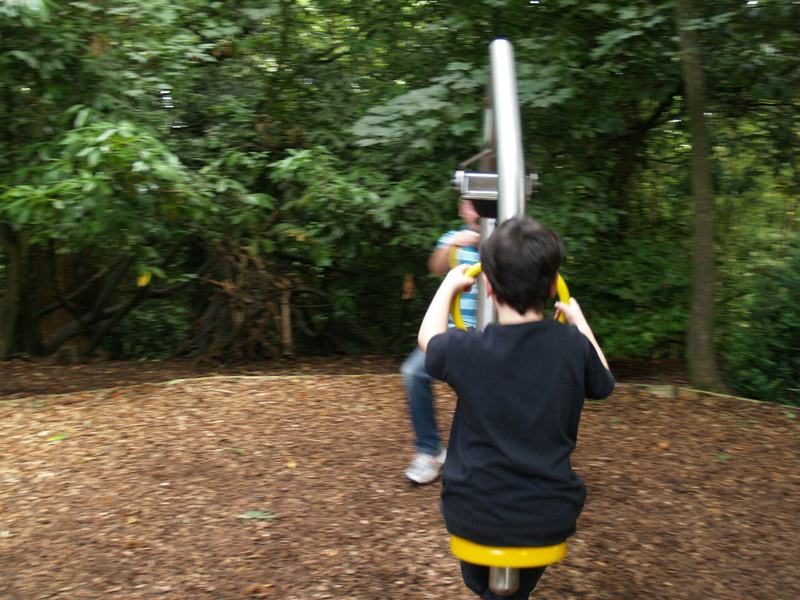 There are also plenty of play areas with climbing equipment dotted throughout the zoo for the kids to let off steam on. 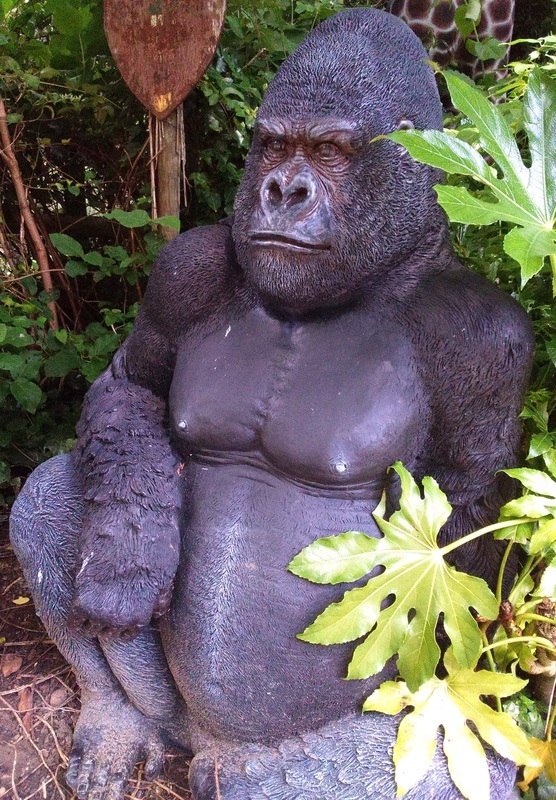 A great thing about the zoo is just how close you can get to the animals, in particular the penguins, tigers and gorillas. 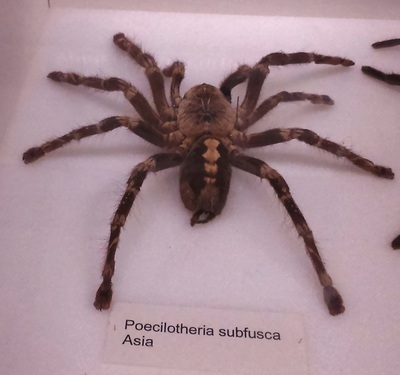 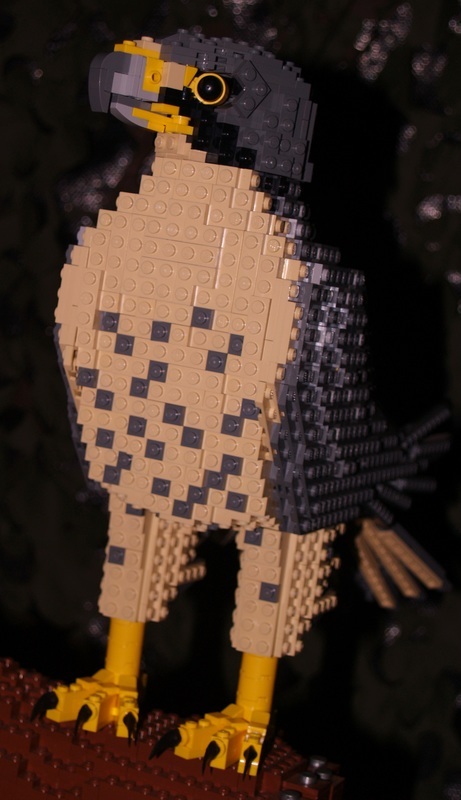 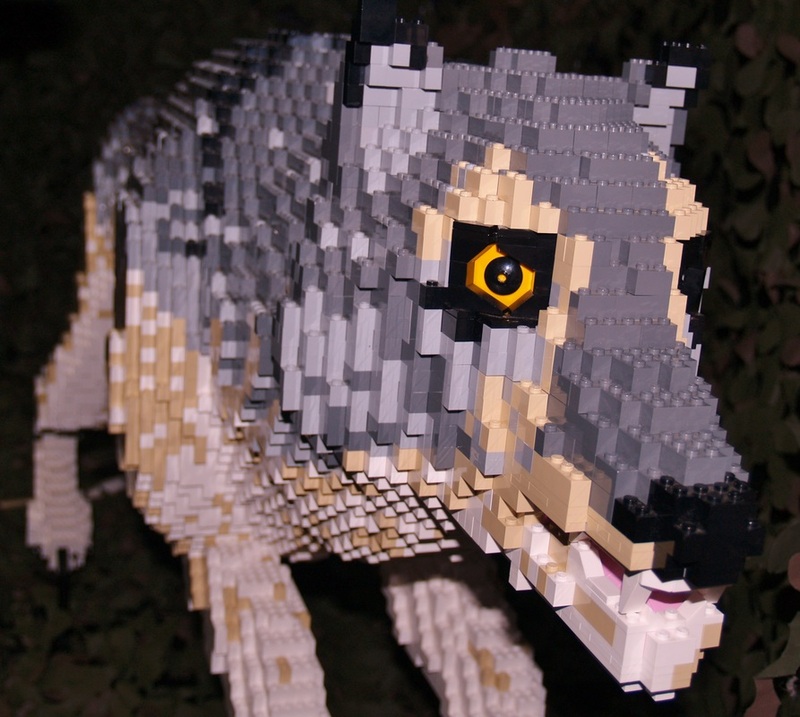 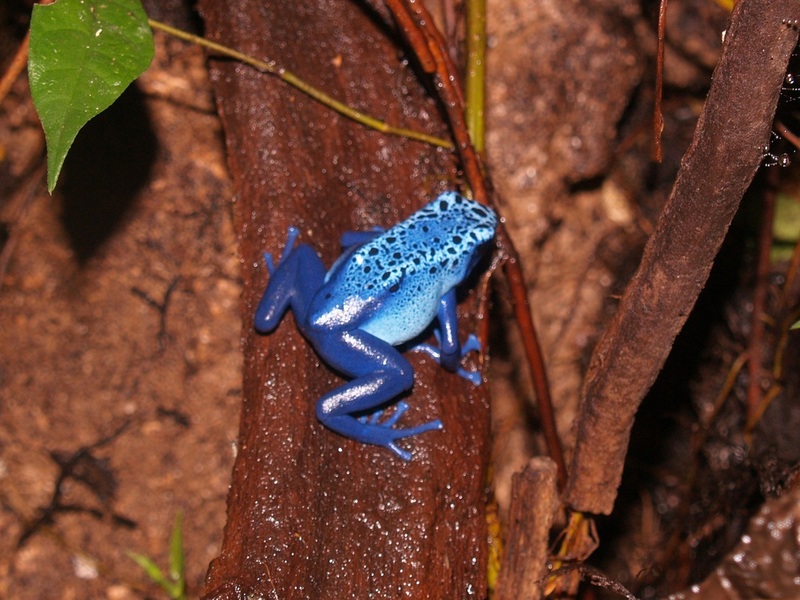 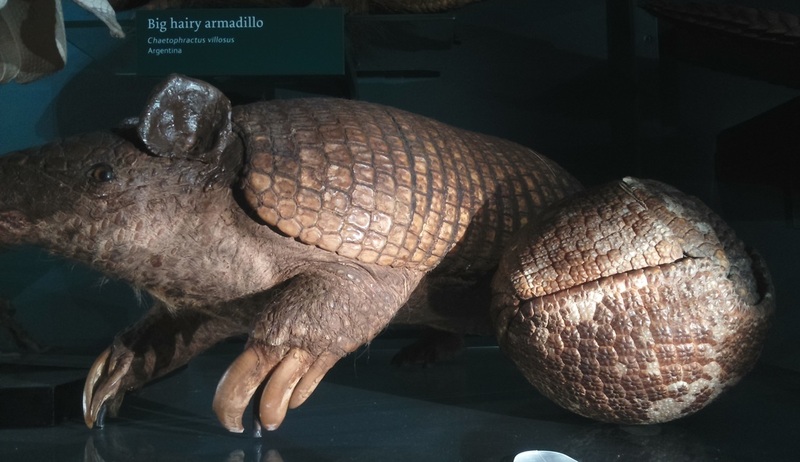 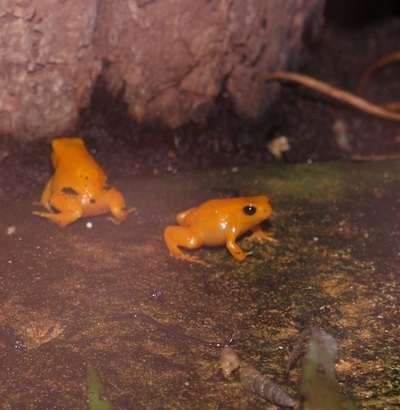 There were some really interesting features too such as a bug gallery where you could look at images in 3D, a balmy rain forest complete with sloths, armadillos and various other creatures and even a nocturnal animal section with bats, bush babies and Loris's. 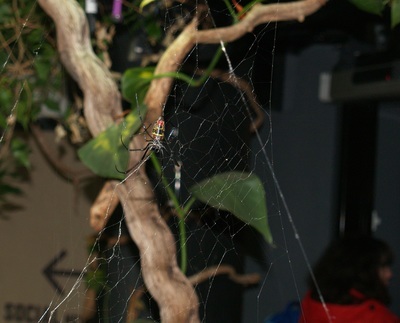 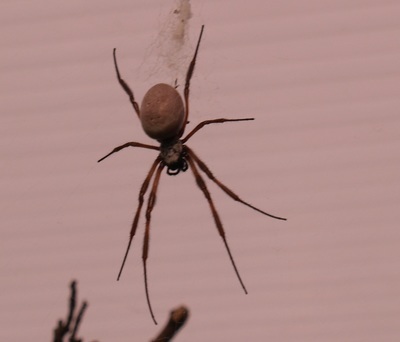 There is also the worlds only free roaming spider walk through which luckily for me is not that big !! 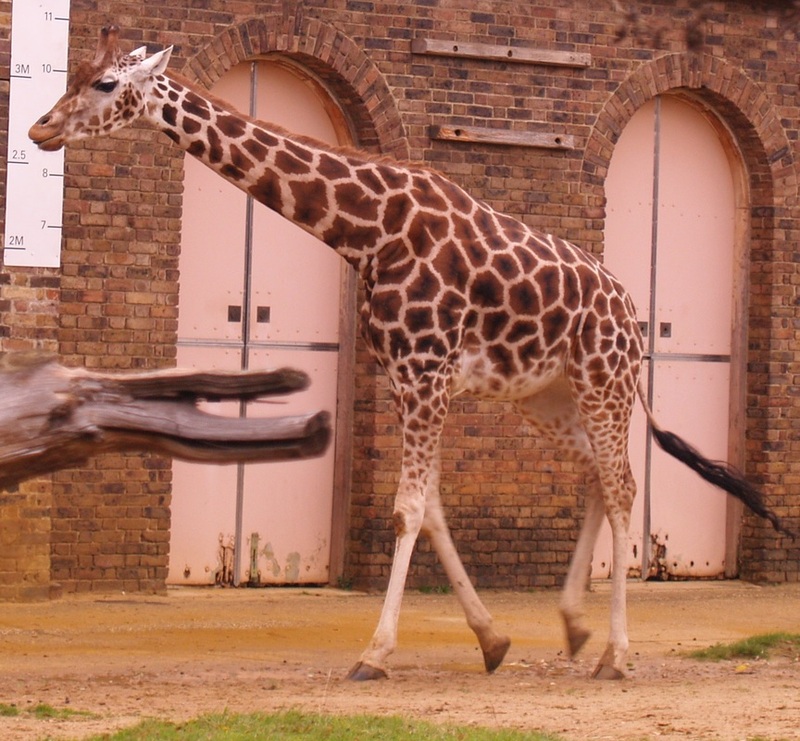 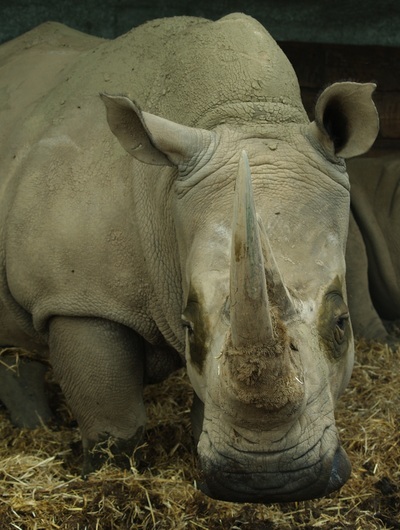 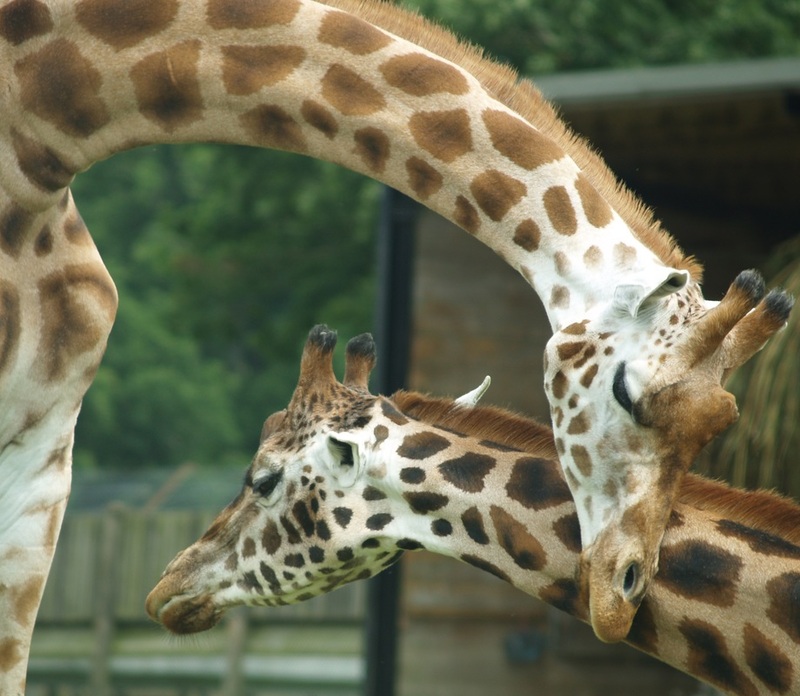 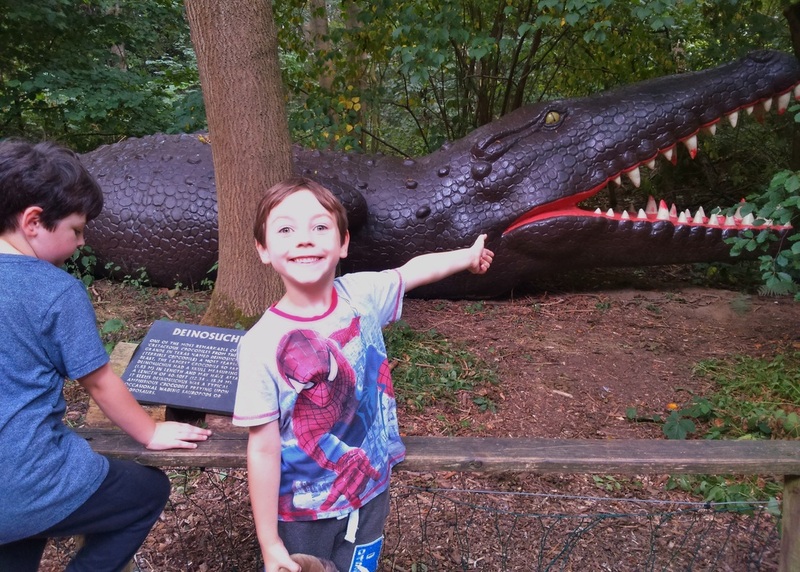 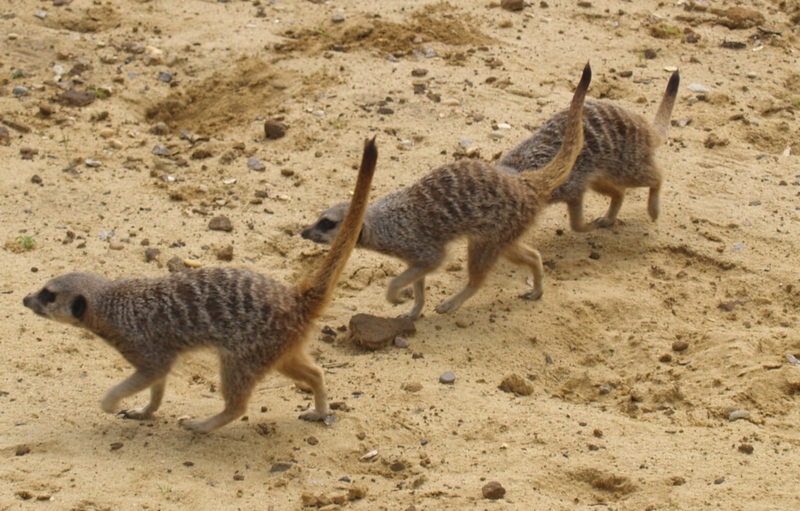 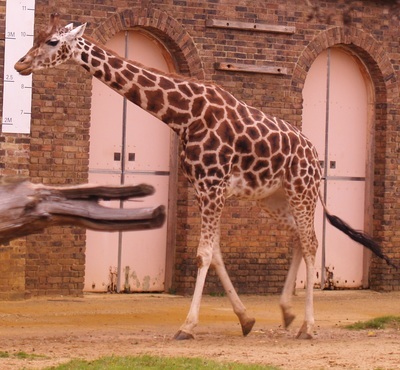 We would highly recommend London Zoo for a day out. 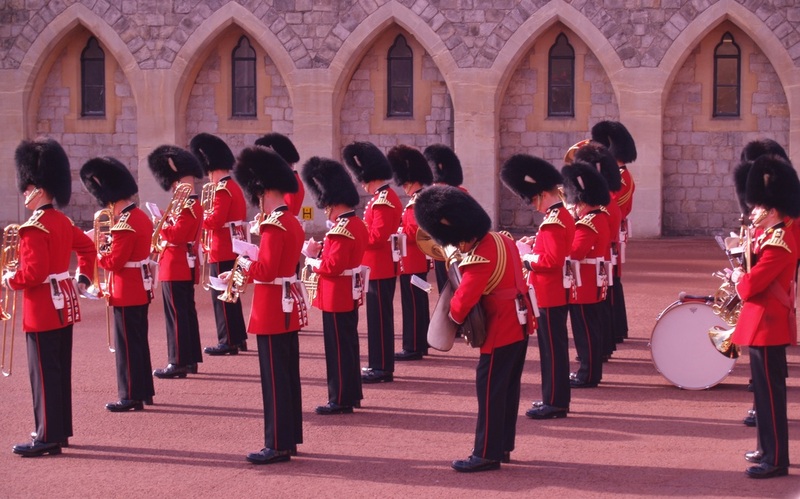 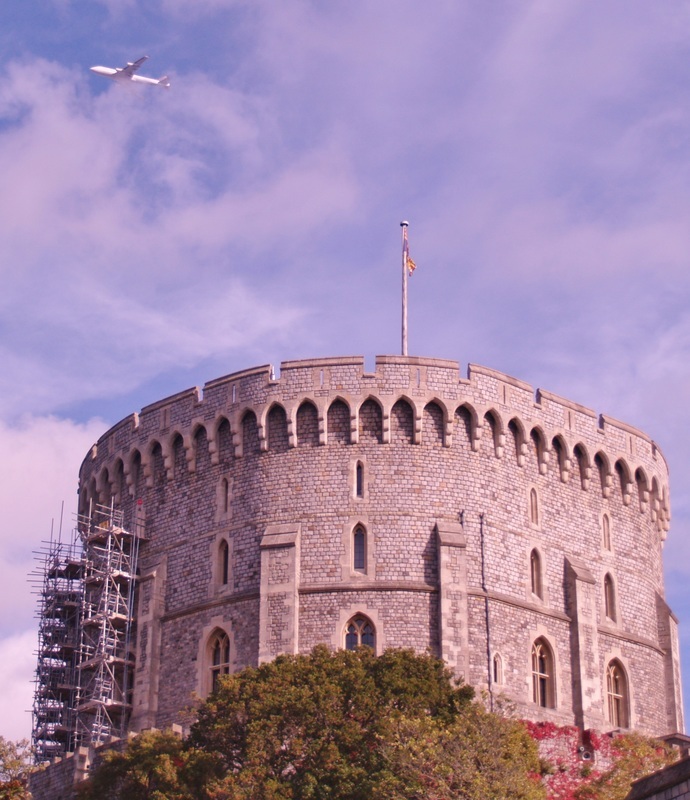 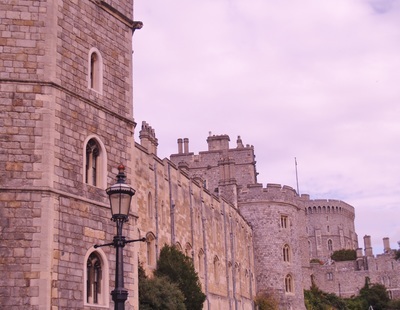 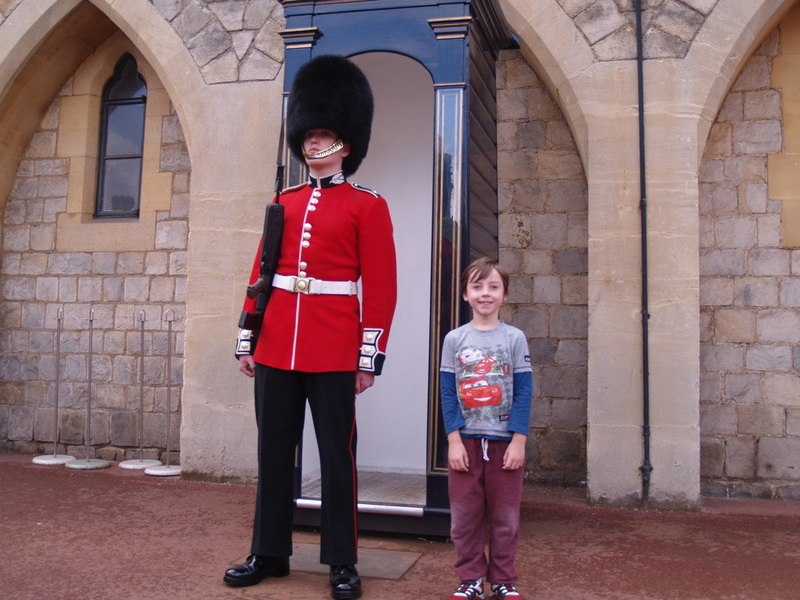 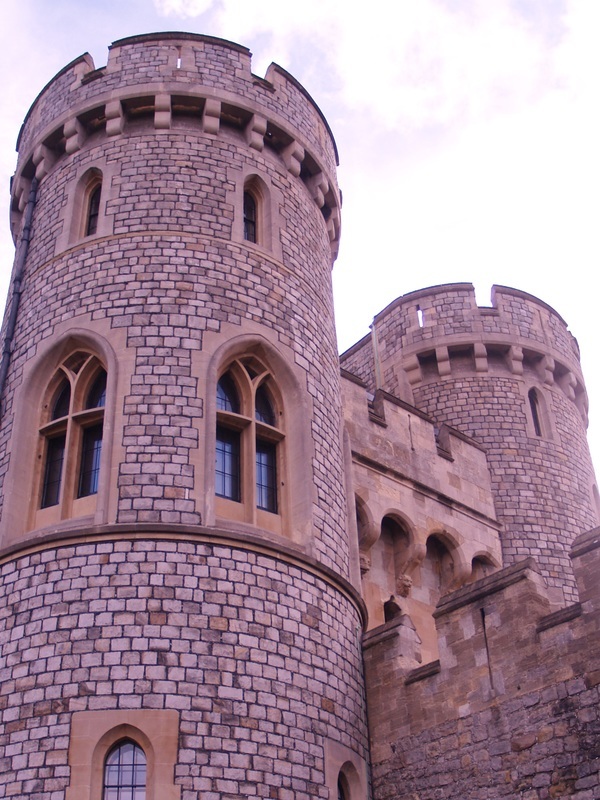 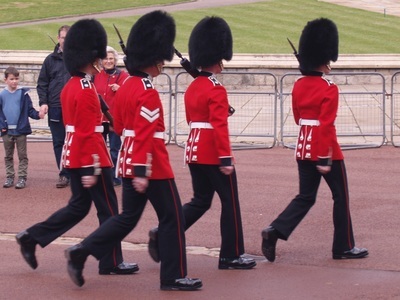 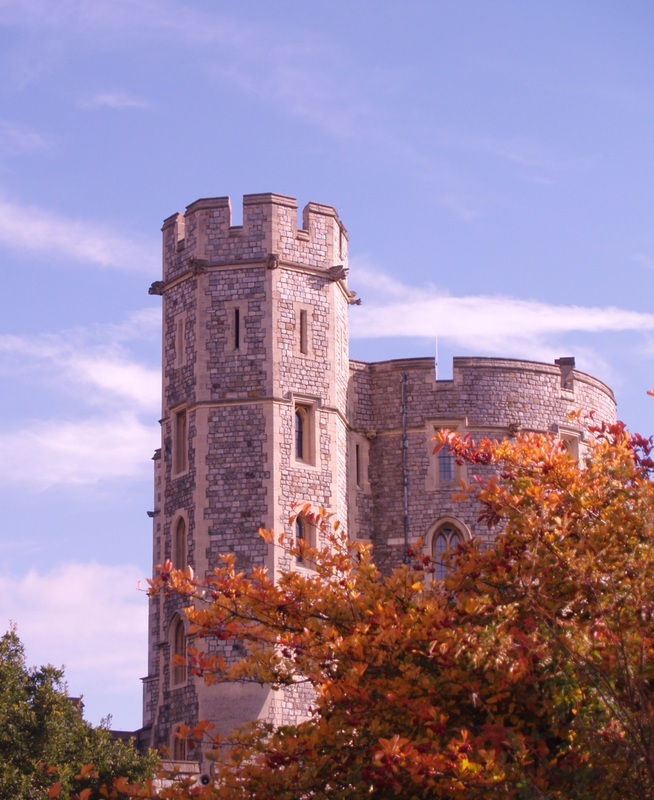 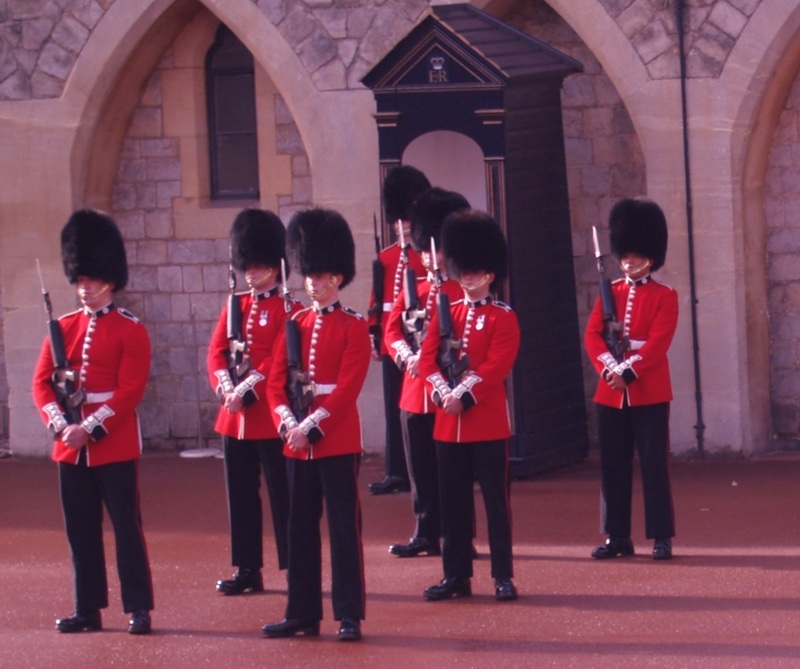 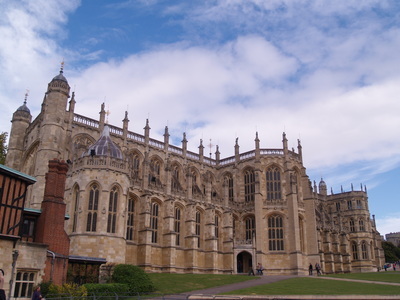 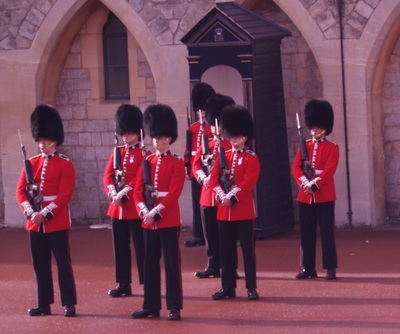 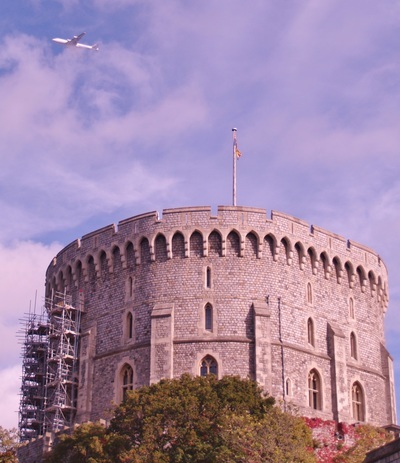 We have recently visited Windsor Castle which is in the town centre of Windsor. 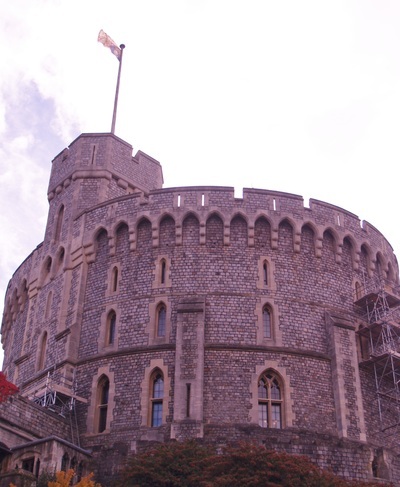 Its really well signed and there are lots of car parks near to the castle but they are pretty expensive though so take lots of change. 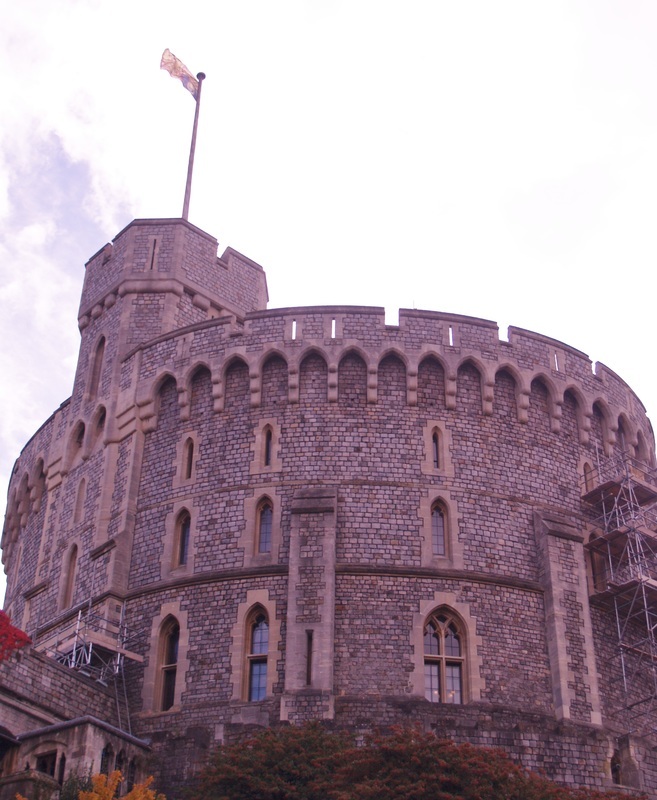 Windsor castle is the largest inhabited castle in the world and is one of the Queens official houses. 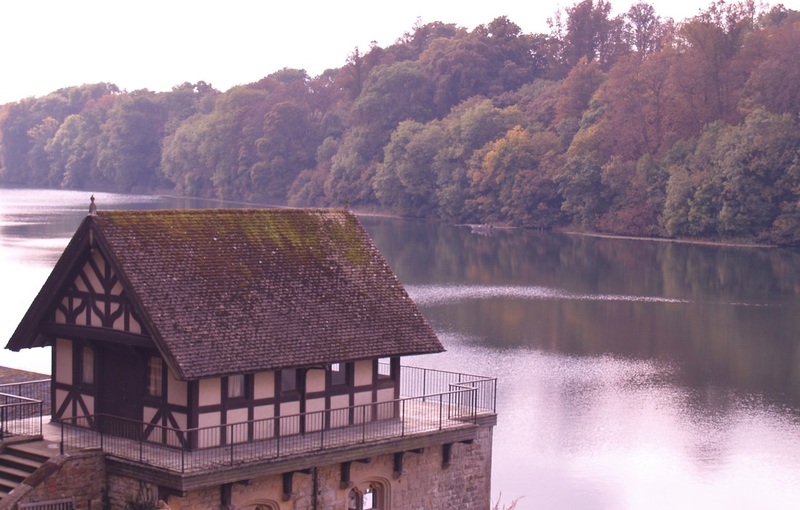 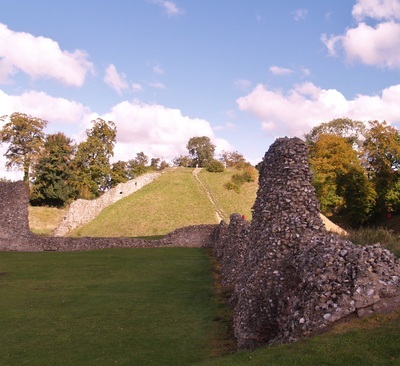 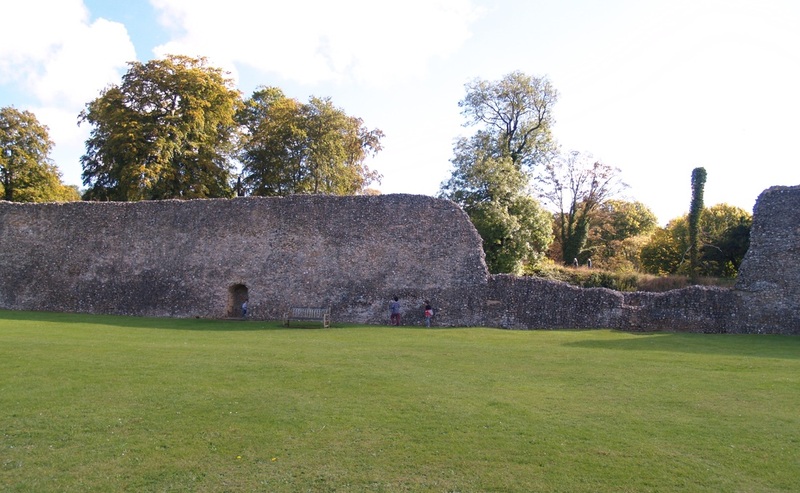 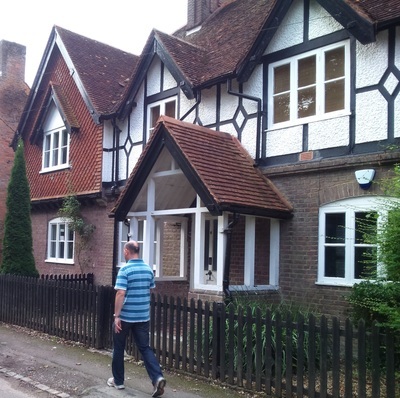 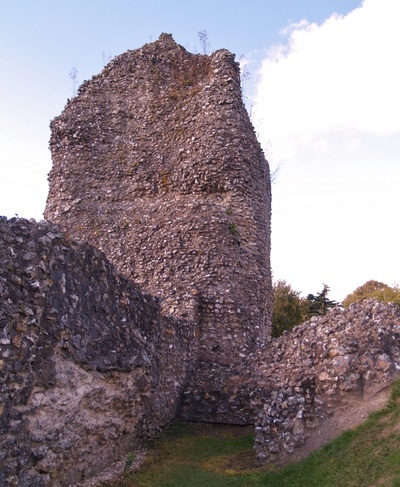 It was originally built for William the Conqueror. 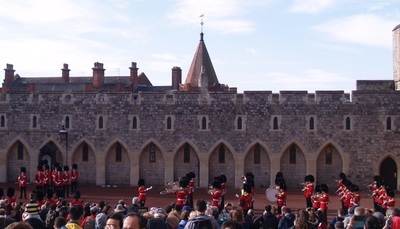 We arrived just as they were about to do the changing of the guard which was great to watch with marching and music etc. They do this when the Queen is in residence which luckily for us she was, although we didn't actually see her. 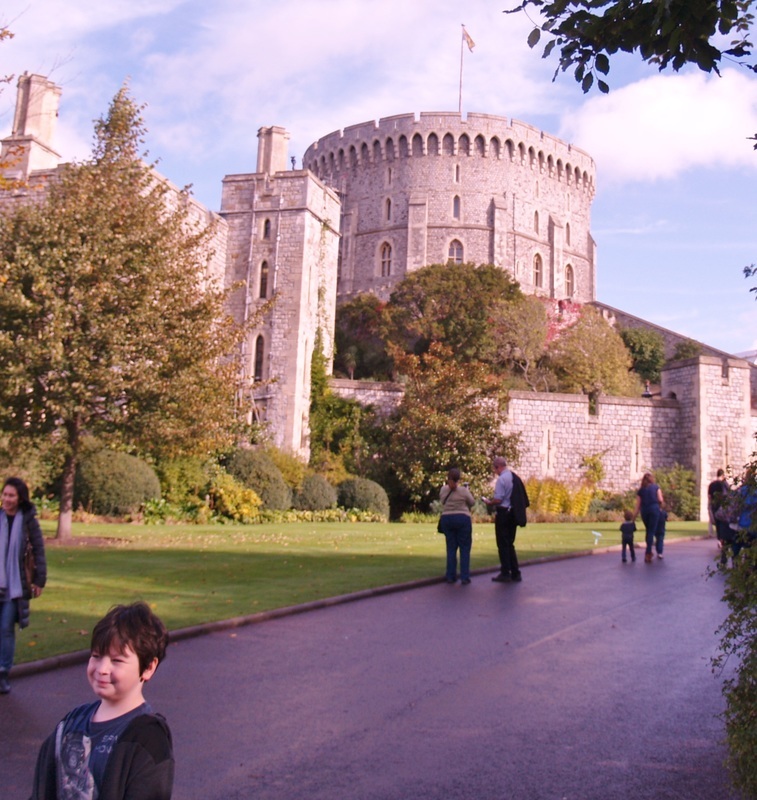 James was far more interested in following the Queens cat Mimi around rather than watching the ceremony. 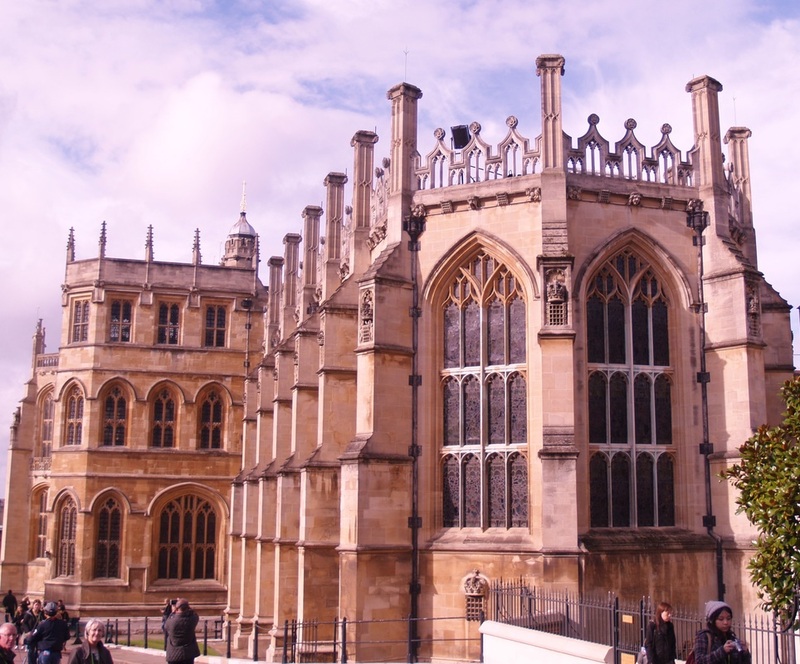 We headed first to St Georges Chapel where many of the most famous monarchs are buried such as Victoria and Albert, Charles I and Henry VIII and Jane Seymour and many others. 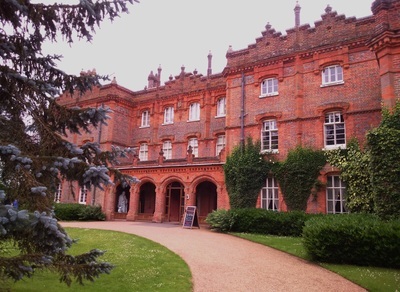 It was interesting inside and a beautiful chapel. 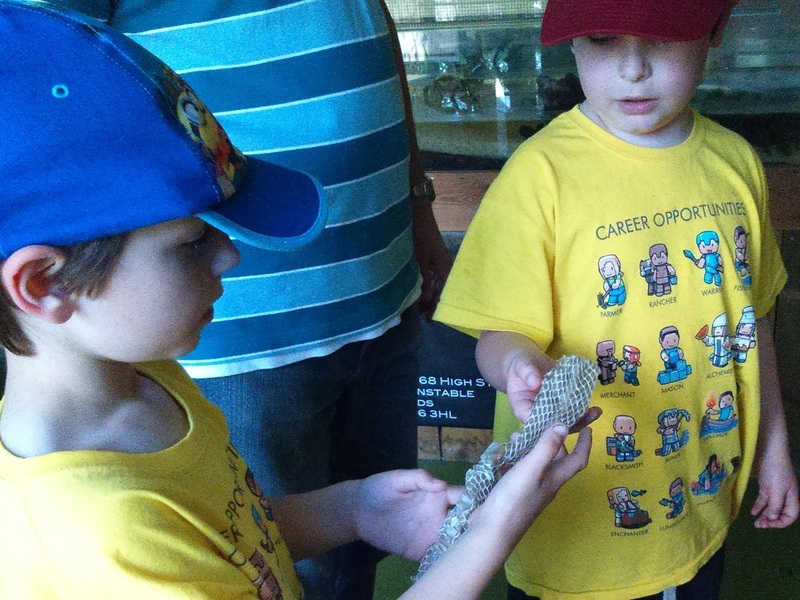 There were guides in the area who were really helpful and great with the kids, pointing out different things to them and explaining them. 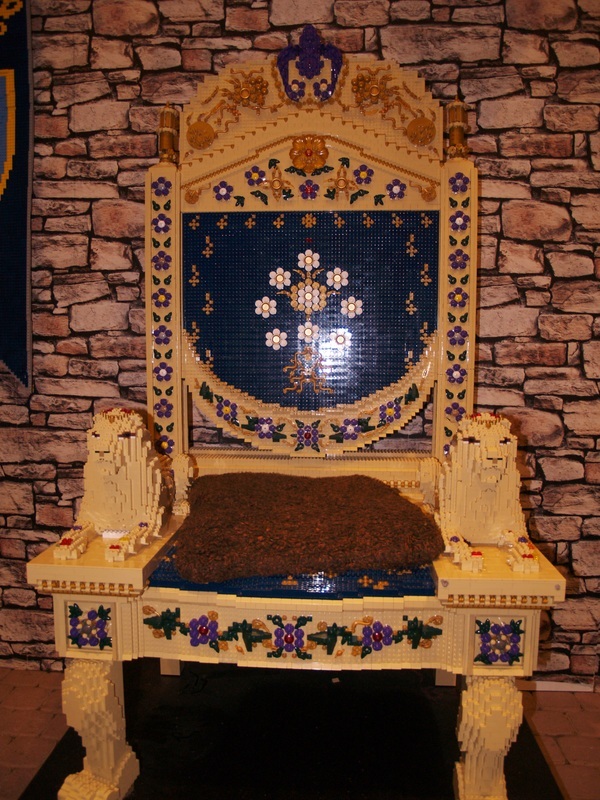 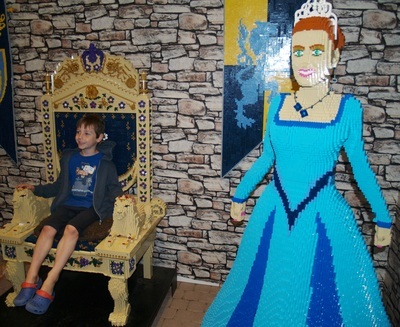 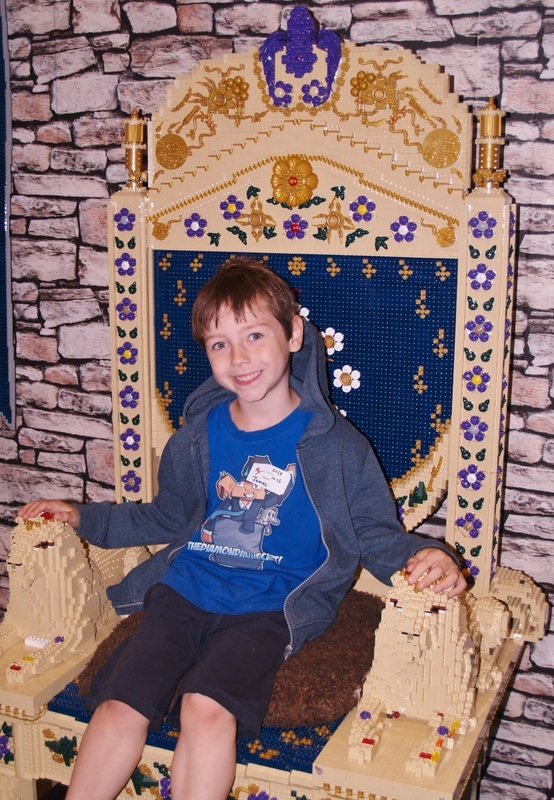 We then headed to see Queens Mary's Dolls House which for a dolls house is massive and comes complete with vehicles, petrol pumps, a room for the Crown Jewels and a throne room among many other things. 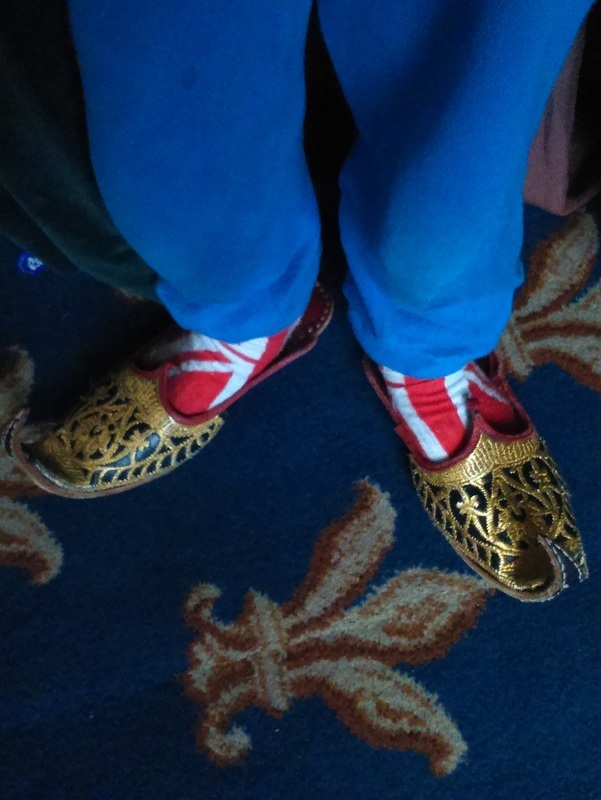 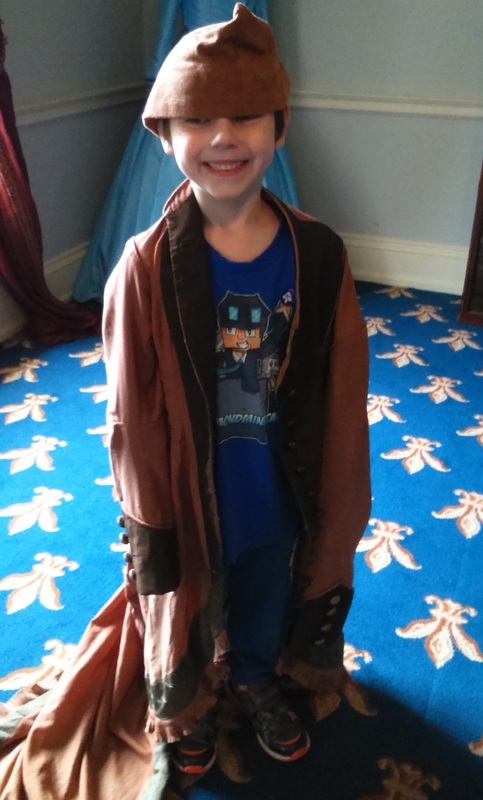 We then went on to visit the State Apartments where we saw famous paintings, Henry VIII's armour, various outfits worn by the Queen, rooms full of suits of armour and coats of arms, a whole room dedicated to Waterloo and Wellington and another to Nelson. 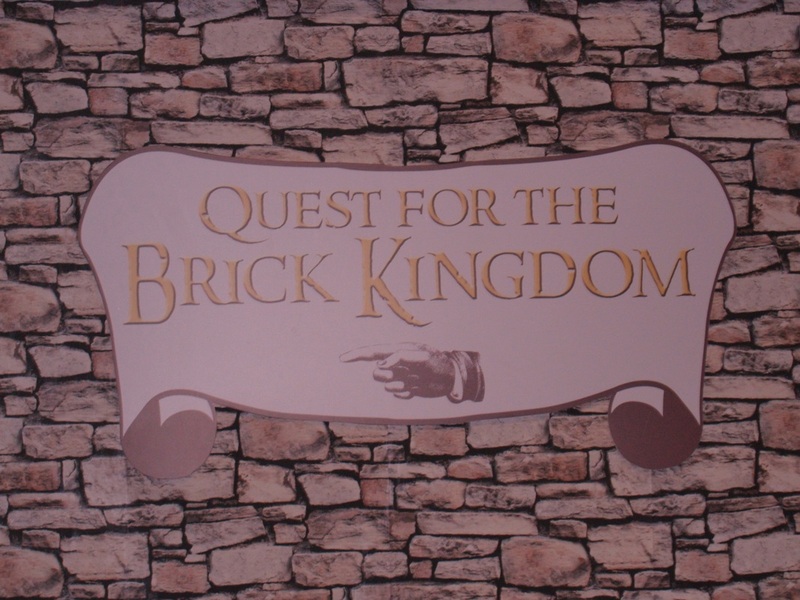 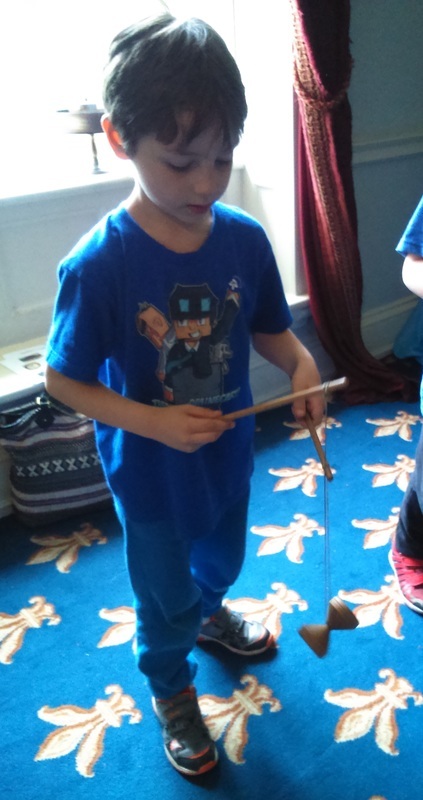 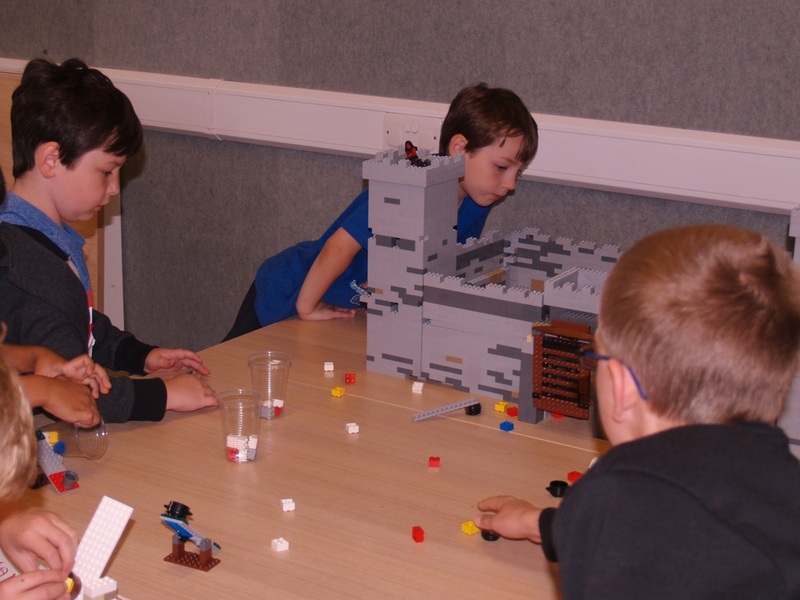 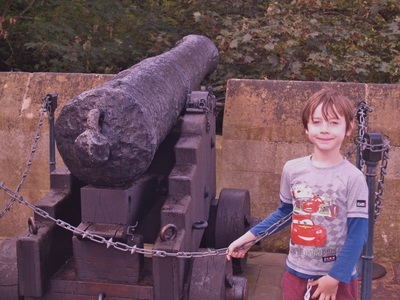 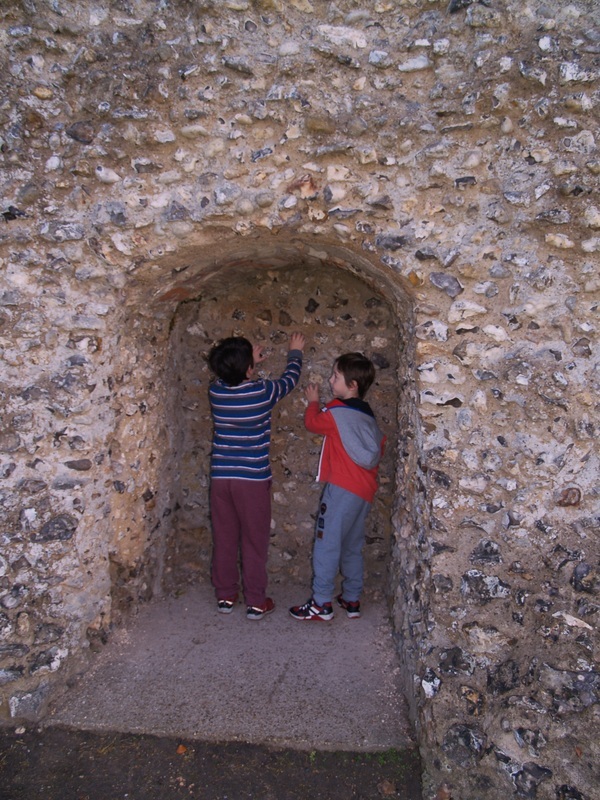 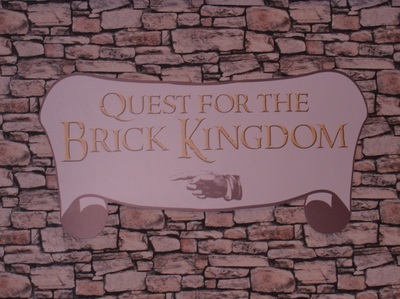 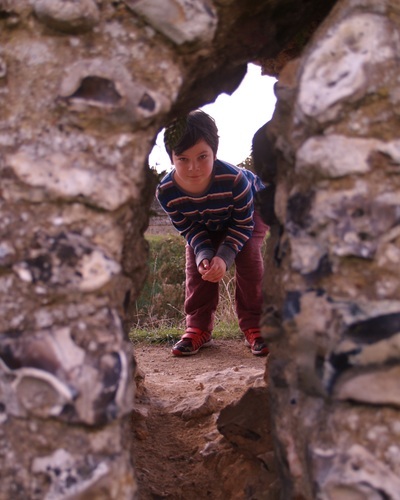 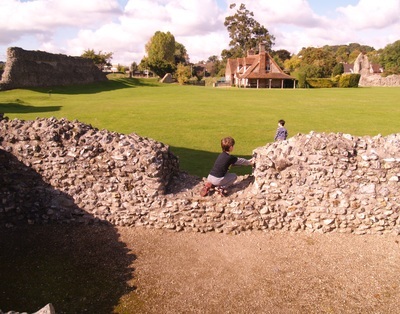 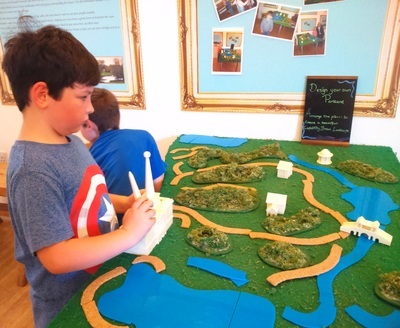 The castle has many features you would associate with a classic castle such as cannons, battlements, a portcullis, arrow slits etc and the boys really enjoyed pretending that they had to defend the castle. 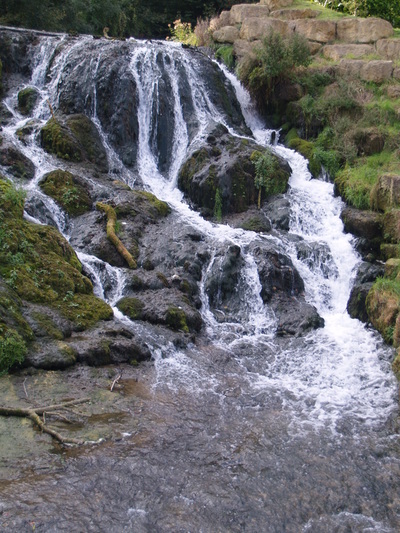 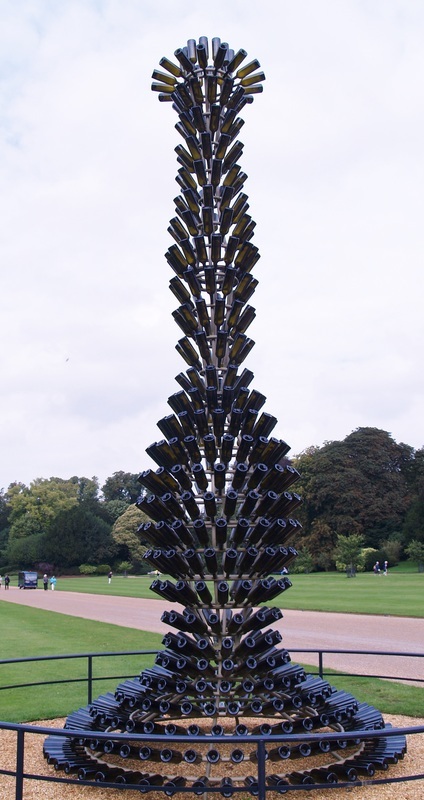 If you are making a day trip to Windsor we would also recommend Windsor Great park and Viriginia Water which are nearby. 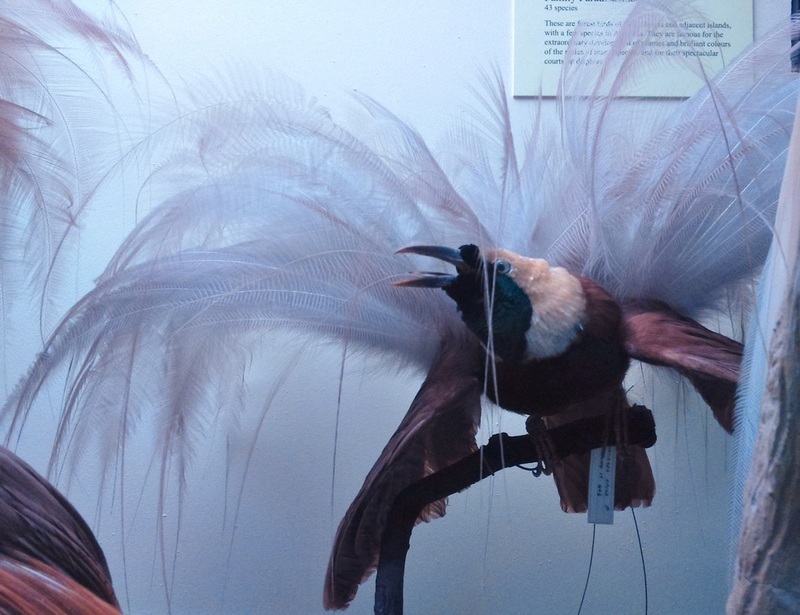 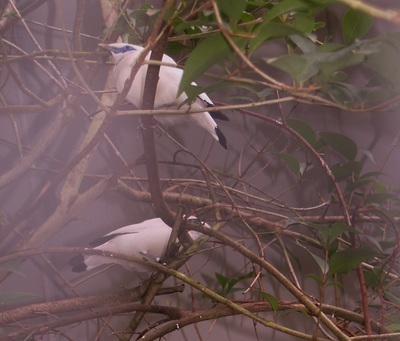 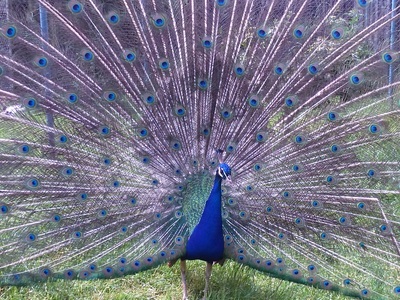 ﻿Birds And Butterflies At Blenheim. 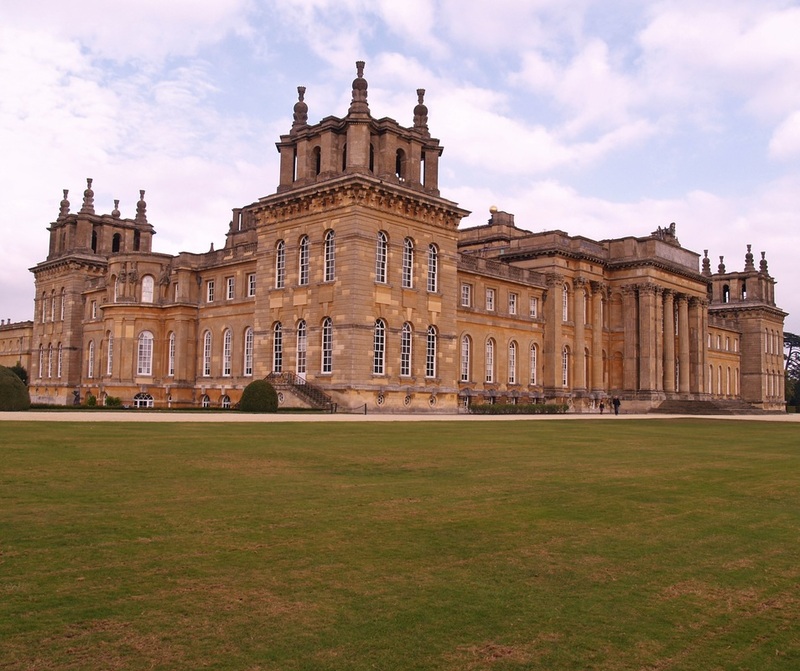 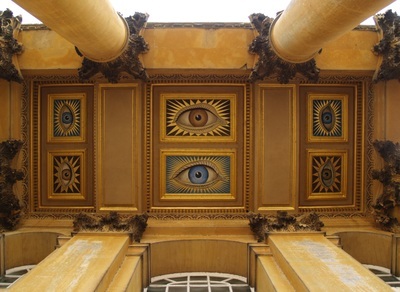 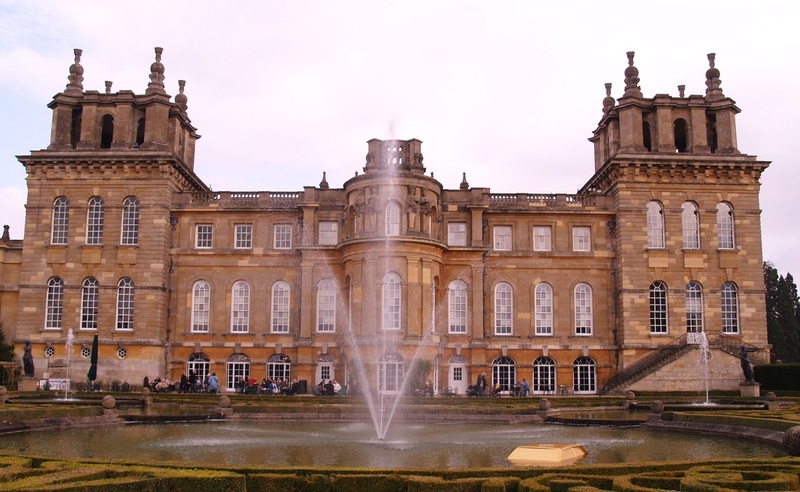 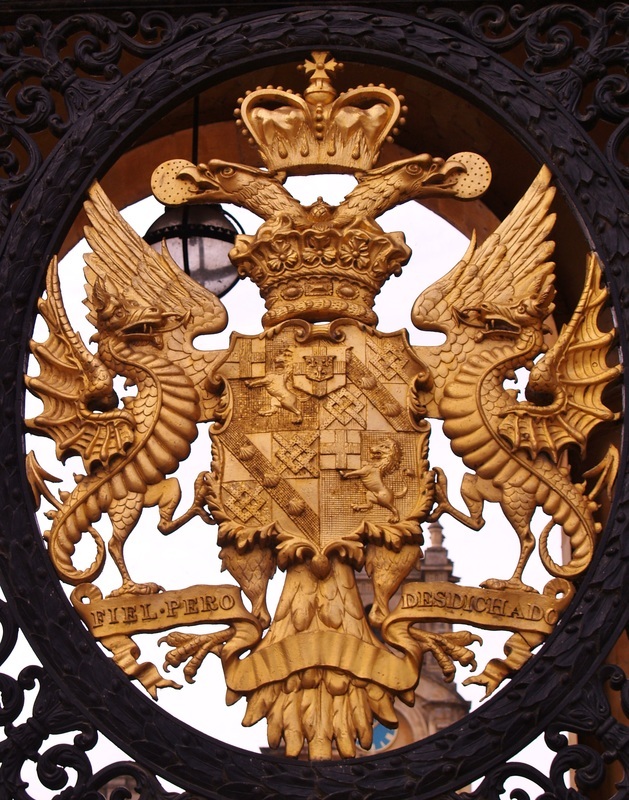 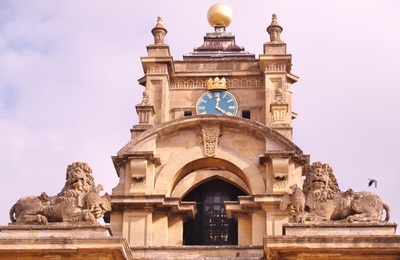 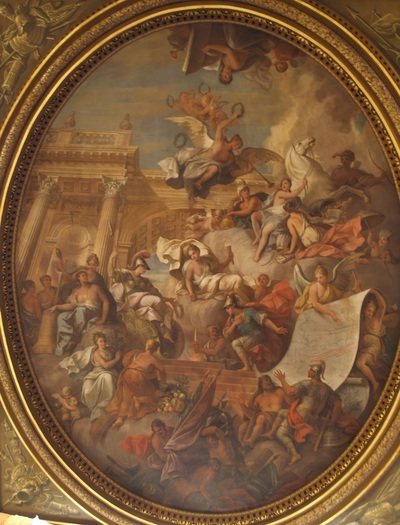 Recently we visited Blenheim Palace which is just outside of Oxford and is well signed. 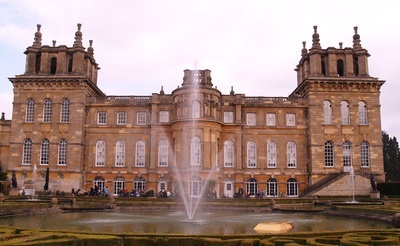 Blenheim Palace is a world heritage site, a palace where Sir Winston Churchill was born, and is home to the Duke of Marlborough. 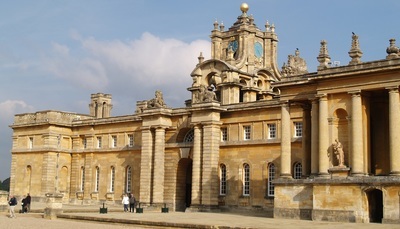 It has been used as the setting for many films such as Spectre, Transformers, Gullivers Travels, Mission Impossible: Rogue Nation and many others. The palace itself is interesting to go round. 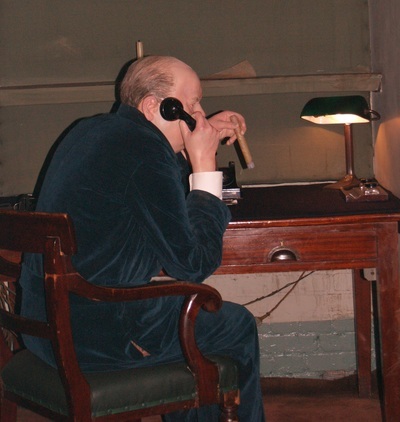 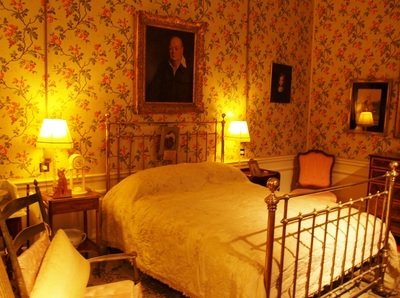 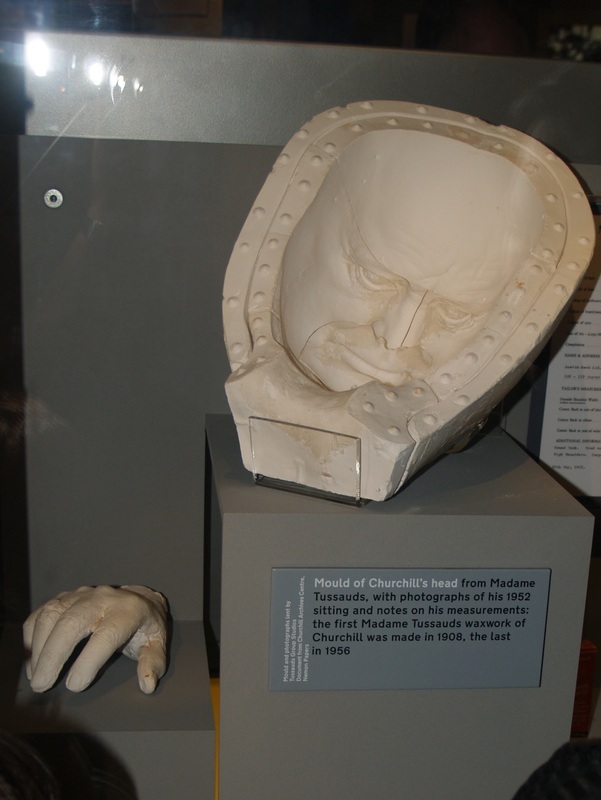 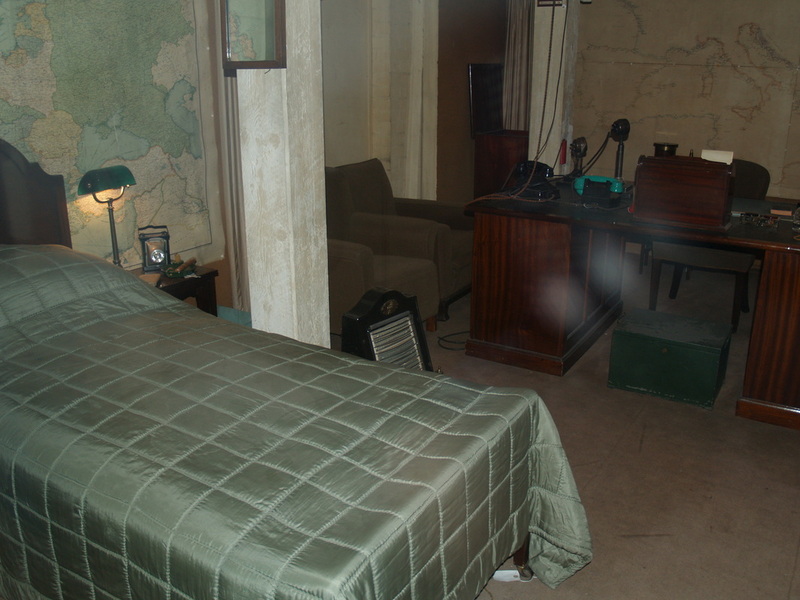 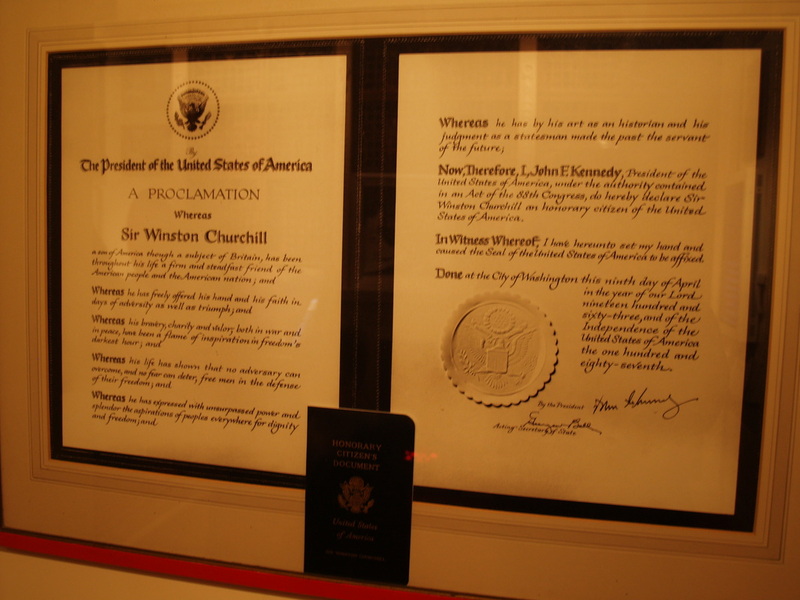 There is a Churchill Exhibition with interactive features and you can see the room where he was born as well as many other interesting rooms. 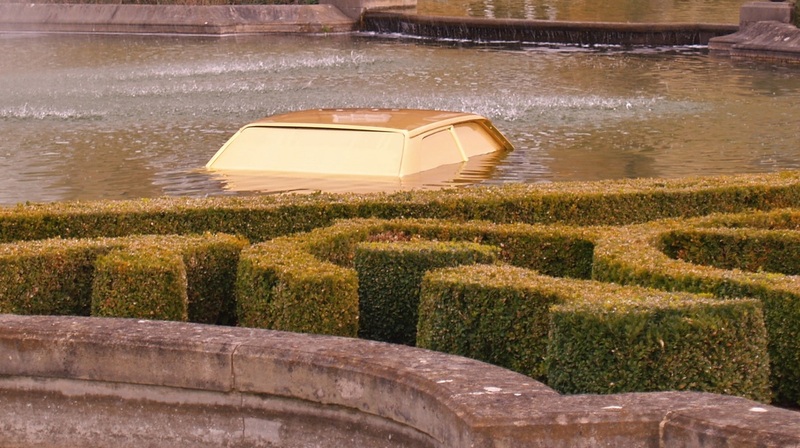 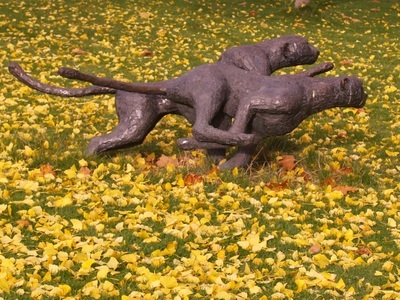 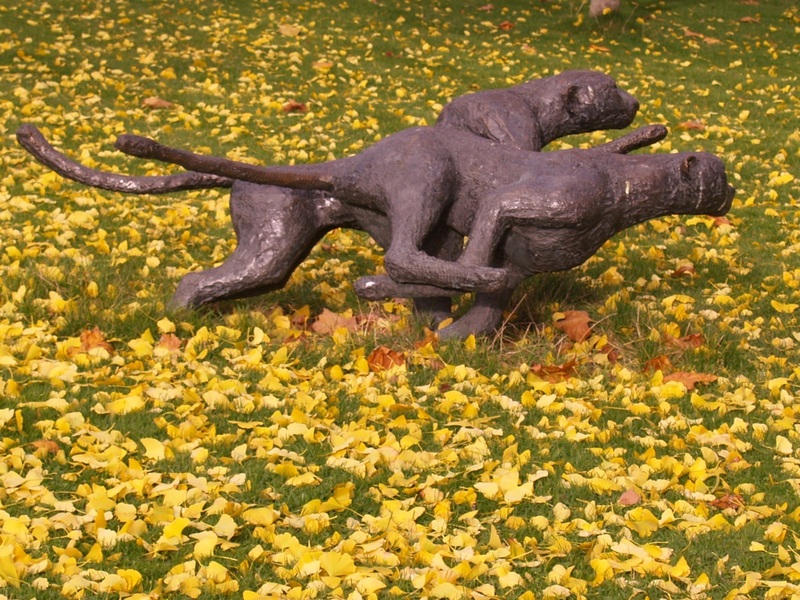 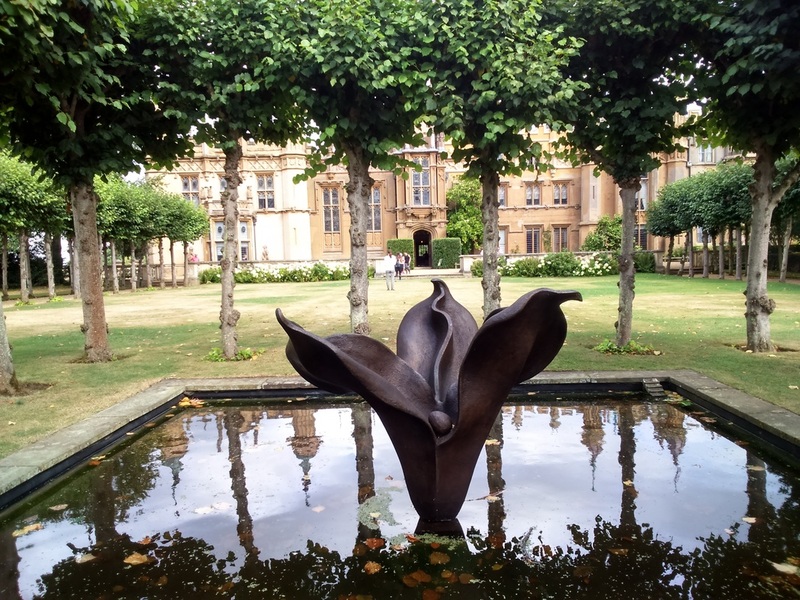 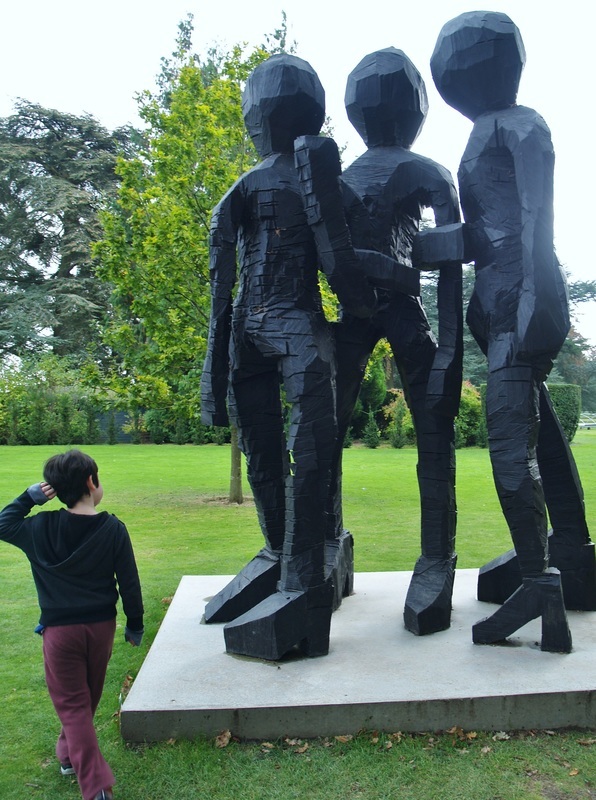 When we visited they also had a modern art exhibition on with different things in each room to look at and this also extended to the gardens with lots of different sculptures etc including a golden sunken car in one of the fountains ! 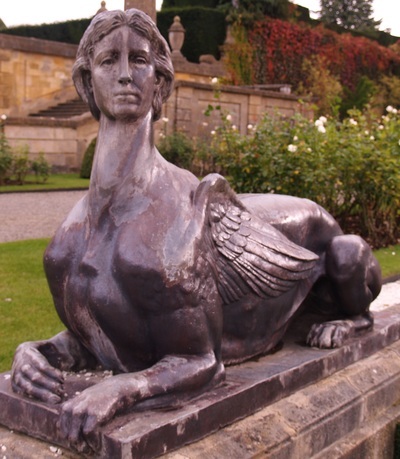 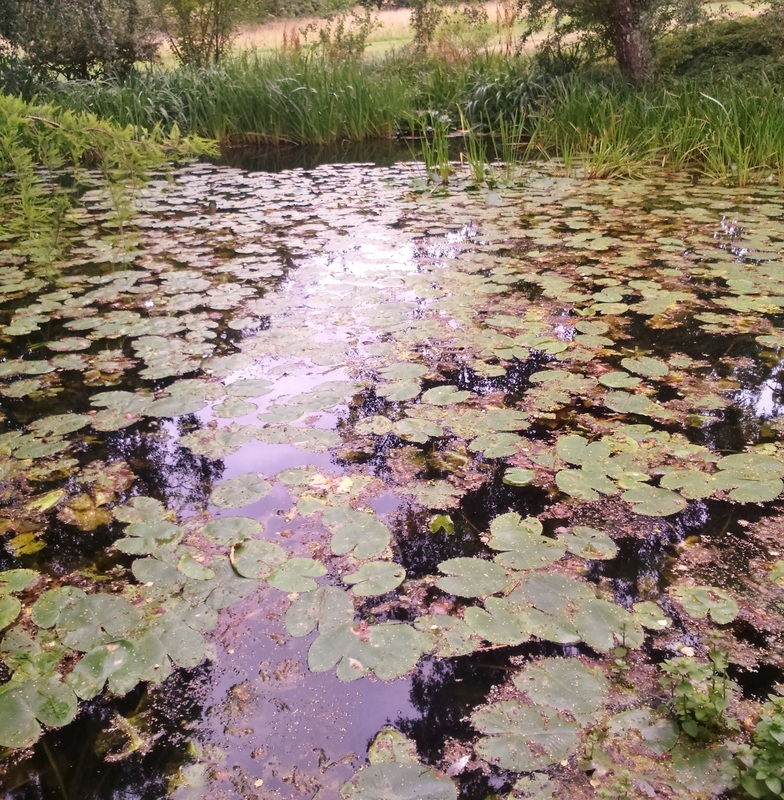 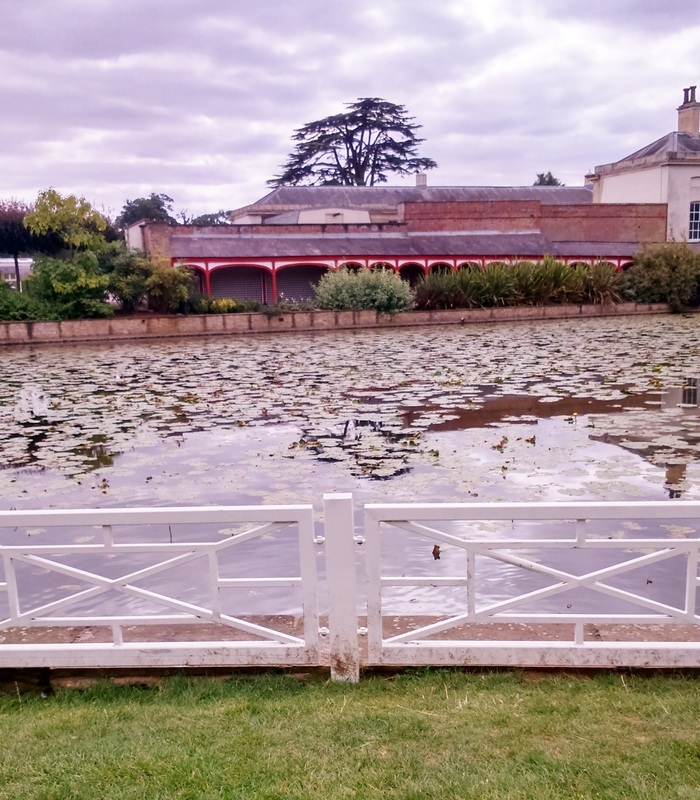 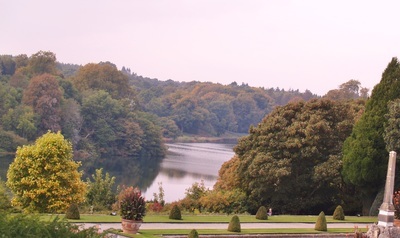 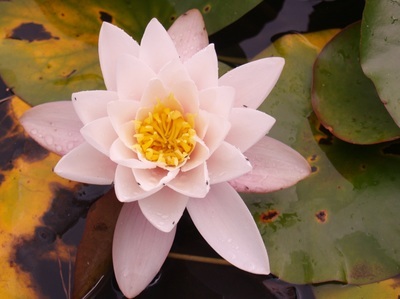 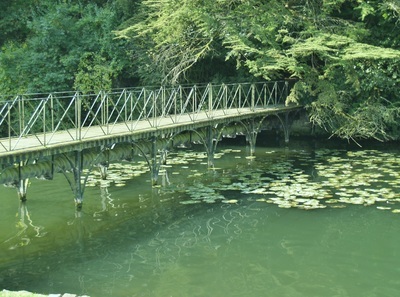 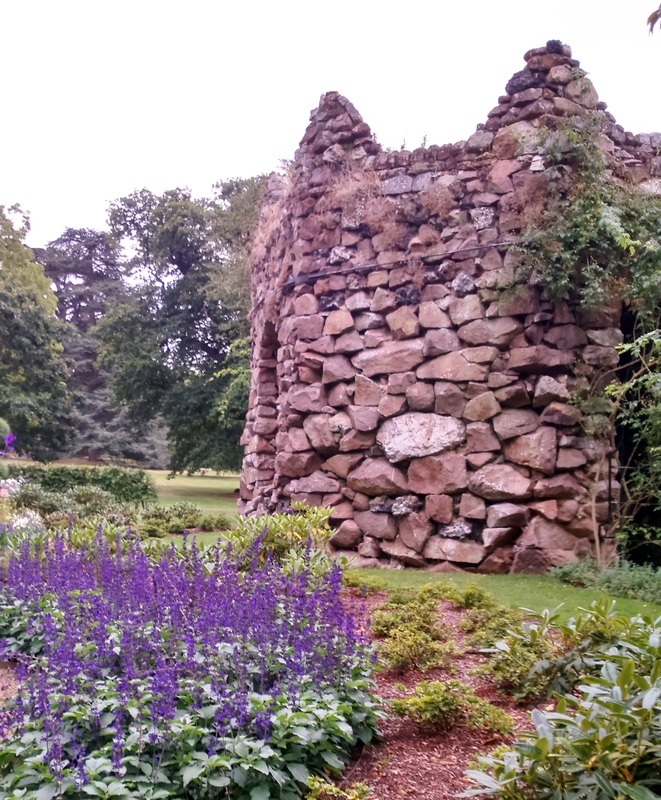 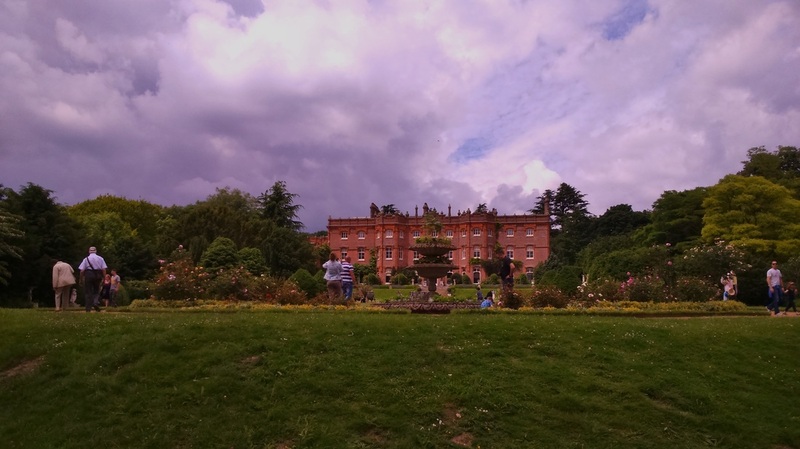 The gardens are really lovely and have lots of different areas to explore from the water gardens to Italian gardens, rose gardens and even a waterfall and there are lovely walks around the lake and grounds. We also saw hundreds of pheasants - I have never seen so many anywhere before. 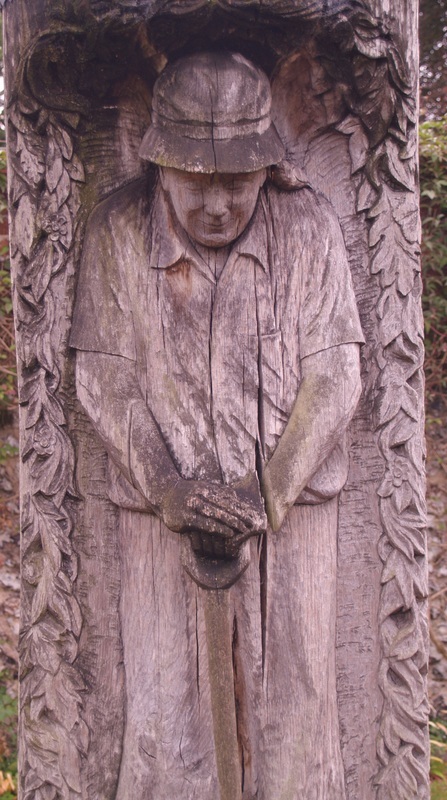 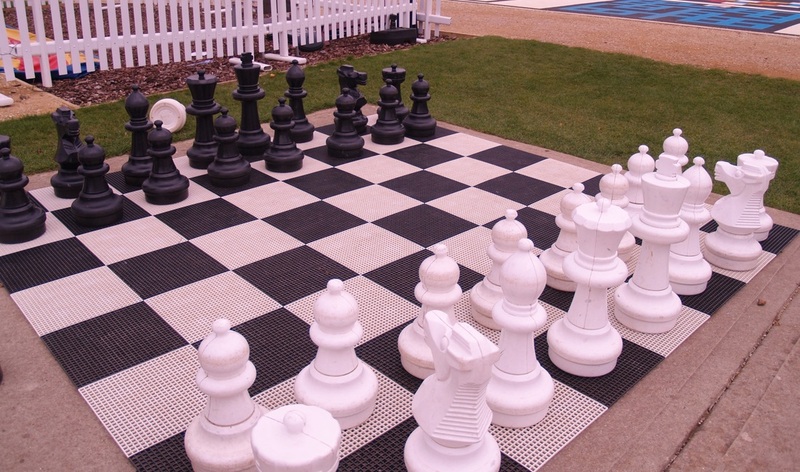 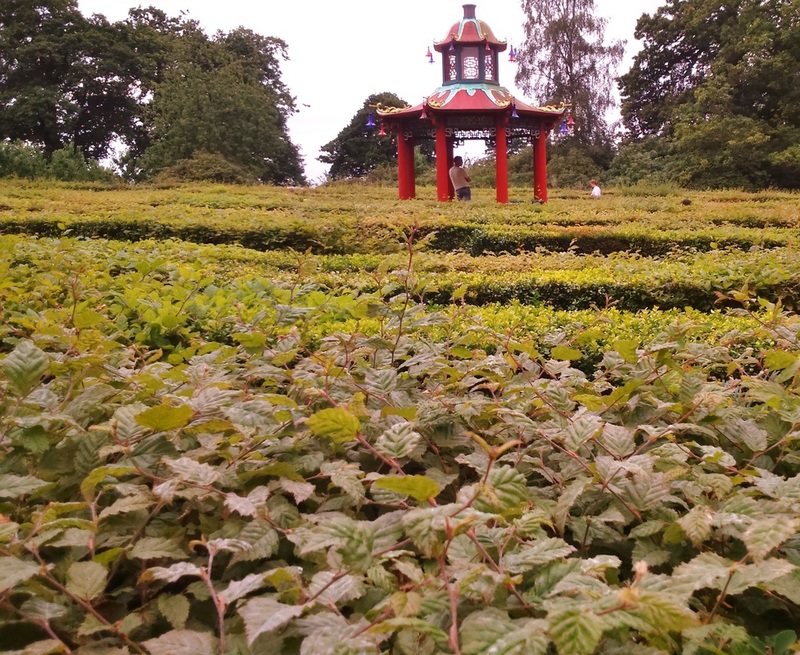 The Pleasure Gardens are designed for families and have play equipment, a small model village area, adventure playground, sand playground, puzzles, outdoor chess and other features such as the Blenheim maze which is the second largest hedge maze in the world and is now features on the top of the new £5 notes. 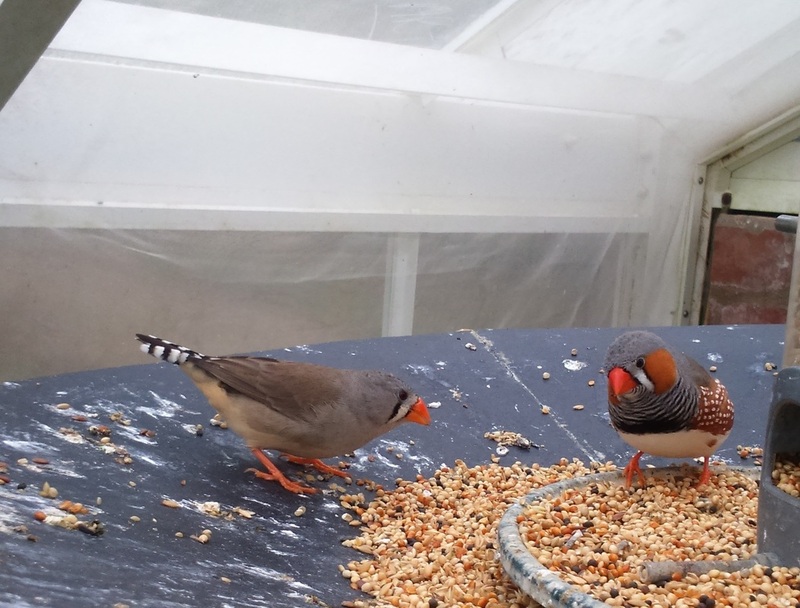 There is also a butterfly house with free flying butterflies and zebra finches which were adorable. It was really interesting as you could see butterflies that had just hatched and others that were in the process of hatching. Blenheim has something for everyone and is a beautiful place to visit. 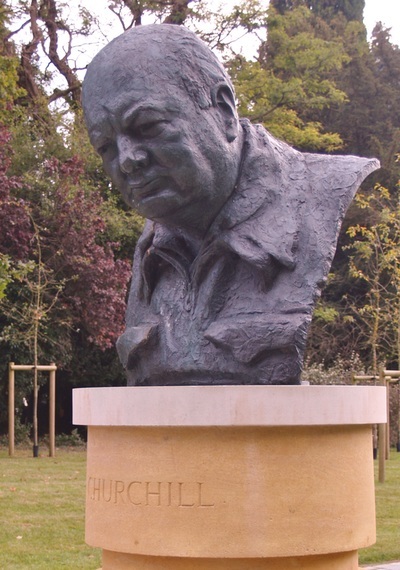 If you are interested in Winston Churchill he is buried in the nearby village of Bladon at the villages church along with his wife. 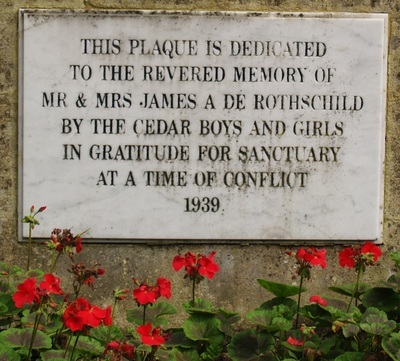 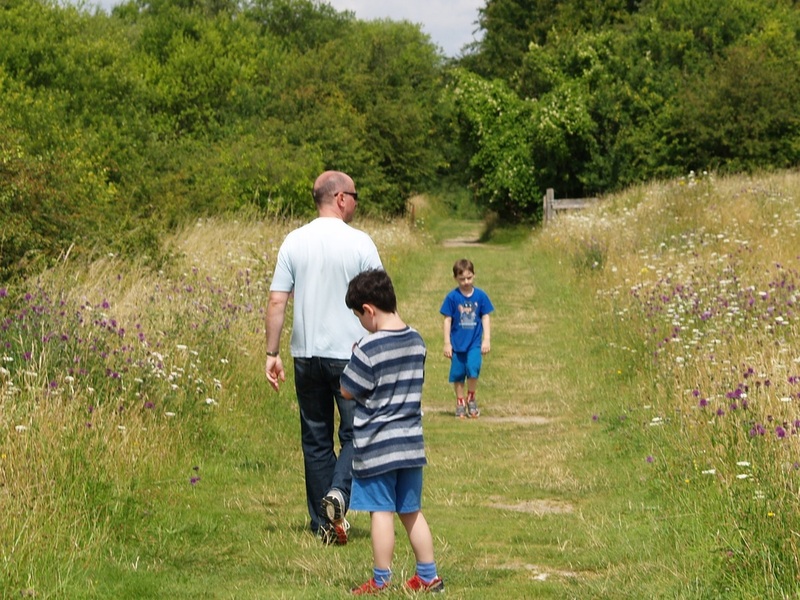 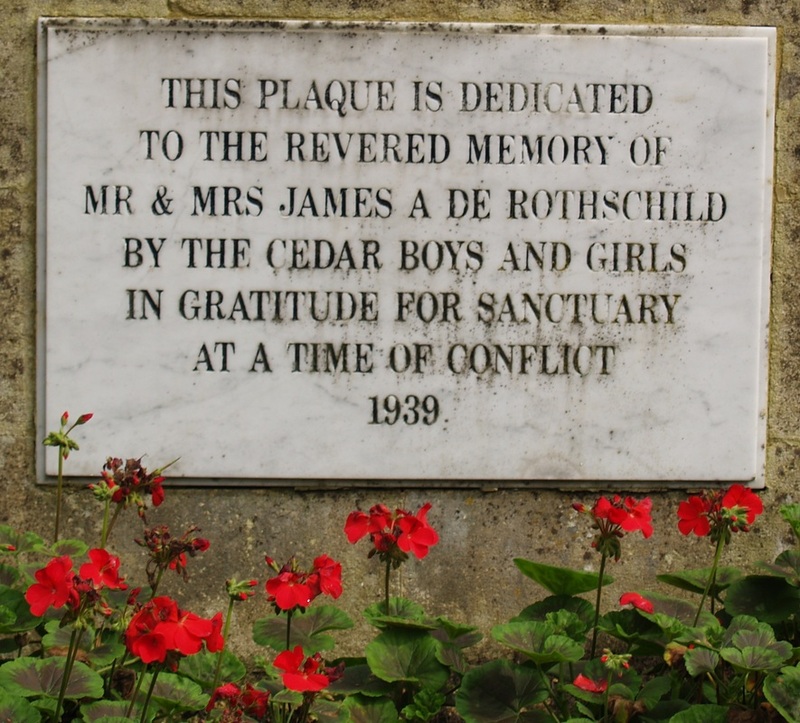 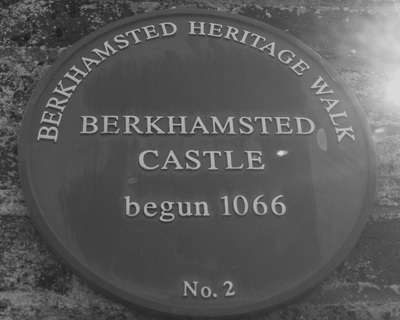 Today I took the boys to Berkhamstead which is a small town close to Tring in Hertfordshire. Berkhamstead is a lovely town to take a walk through and the Grand Union Canal passes through it, along which there are lovely walks. 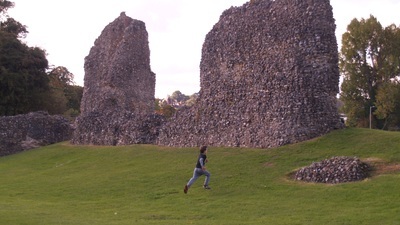 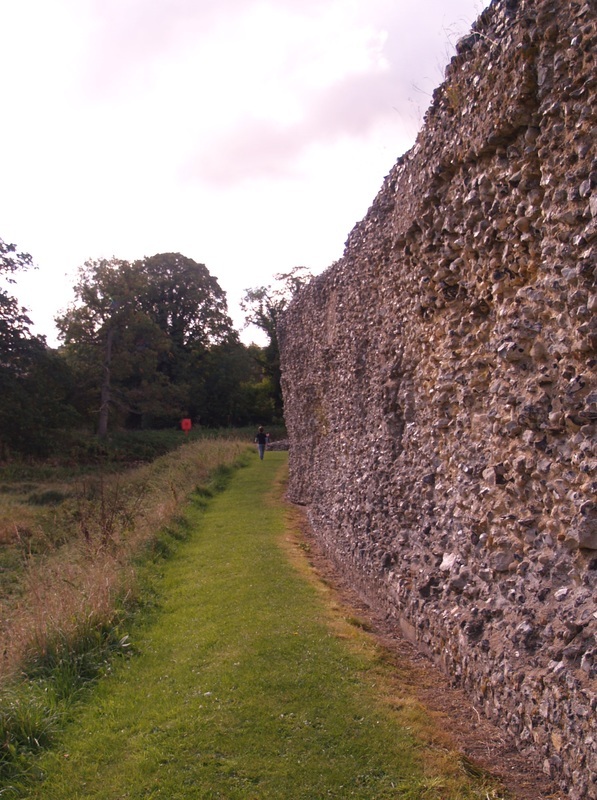 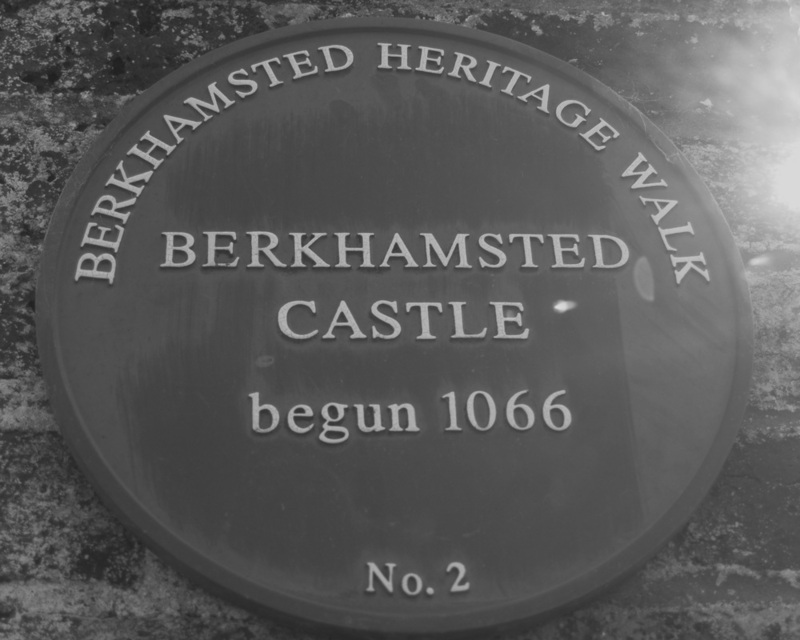 We were headed to Berkhamstead Castle. 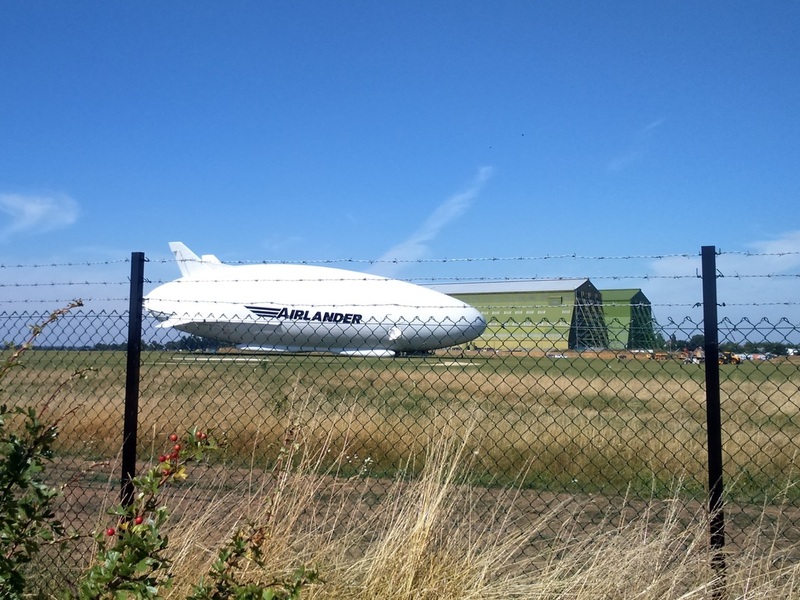 Its not brilliantly signed unfortunately, however it is right next to the train station which is well signed !! 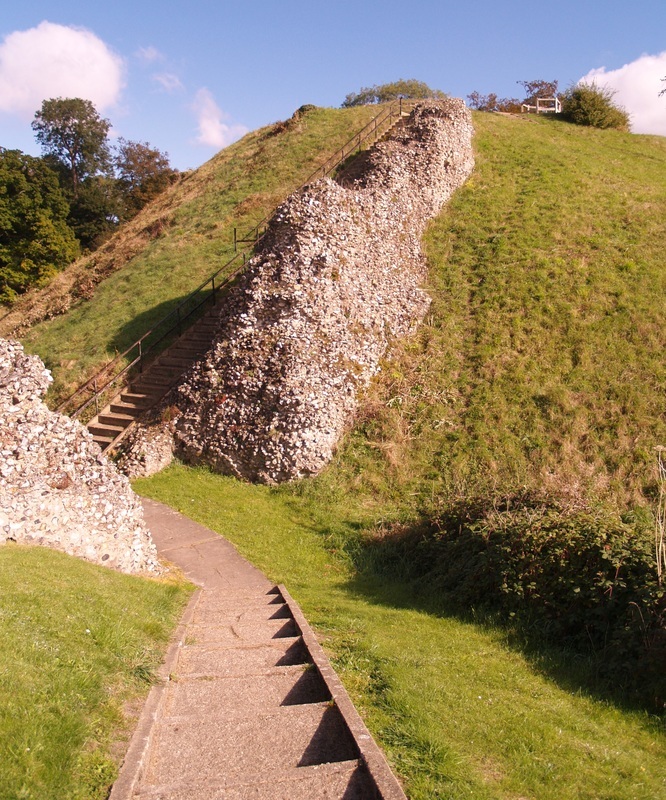 The castle is managed by English Heritage and is completely free to enter. 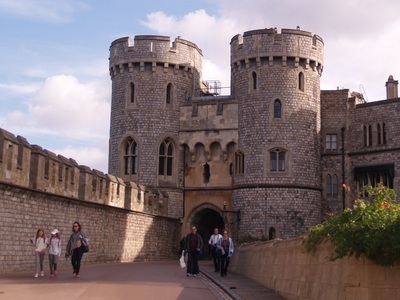 The original castle was built by William the Conquerors brother and is meant to be a days march away from the Tower of London. 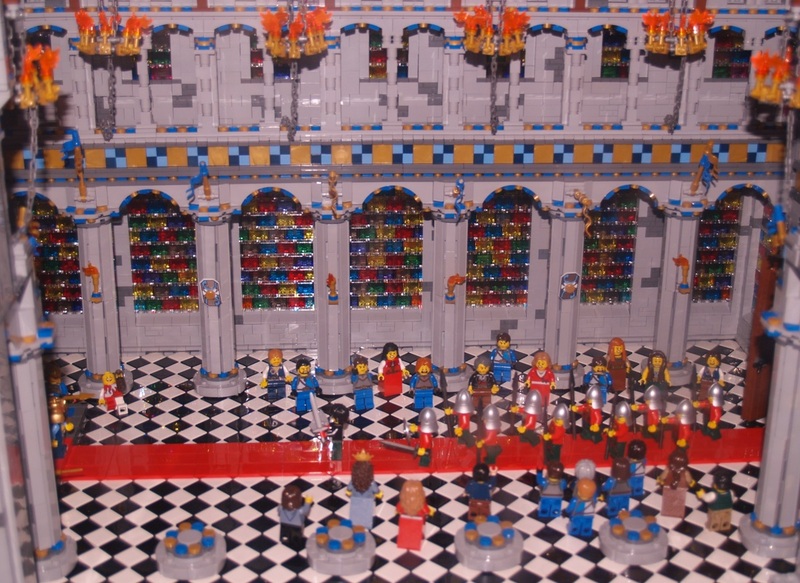 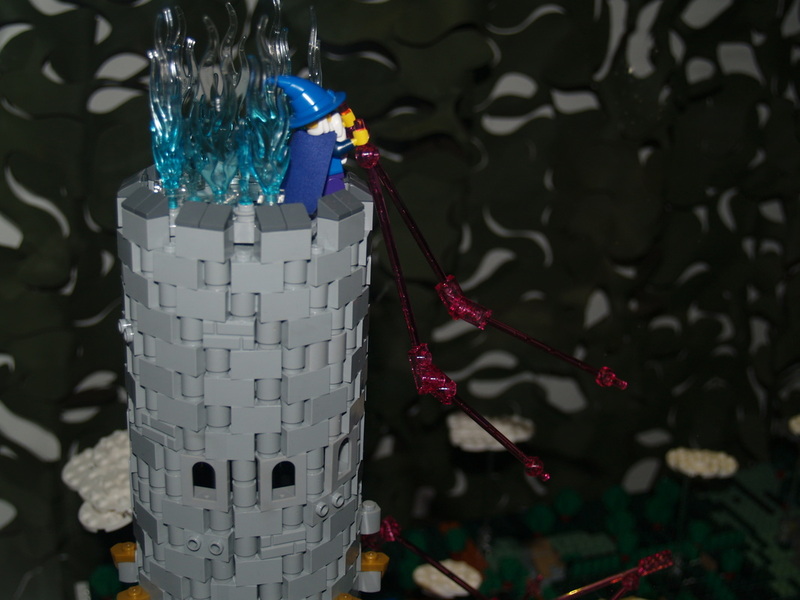 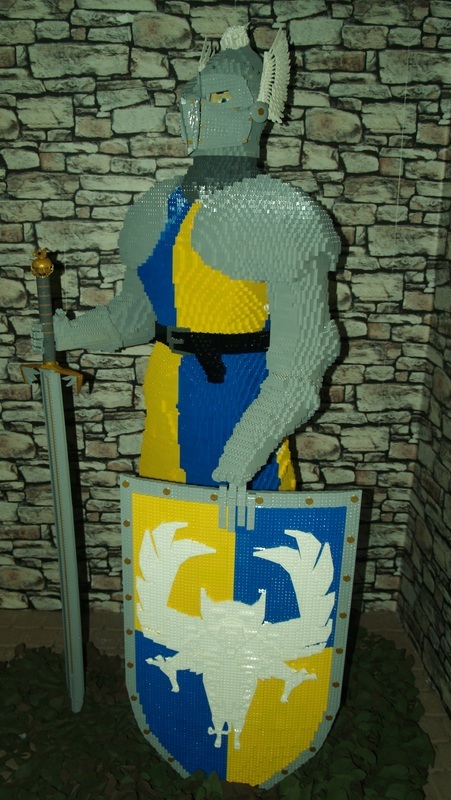 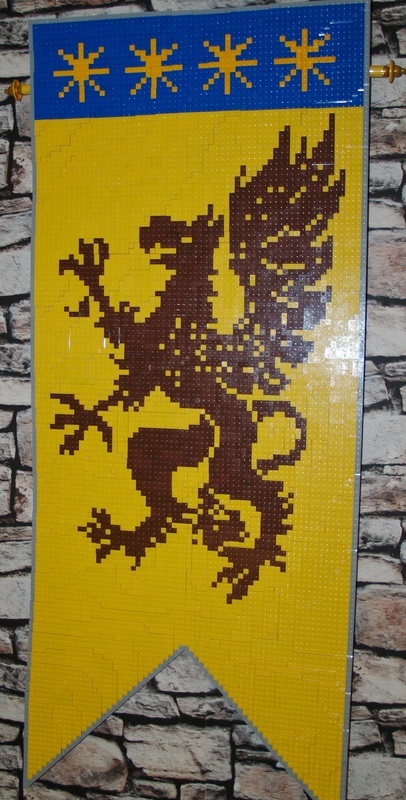 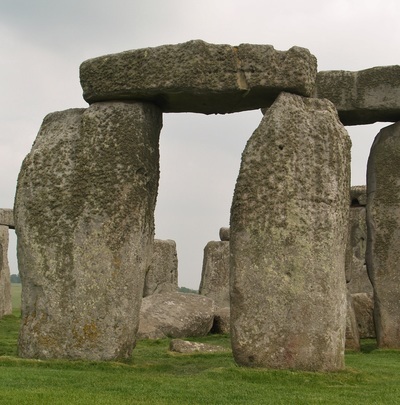 Construction on it began in 1066. 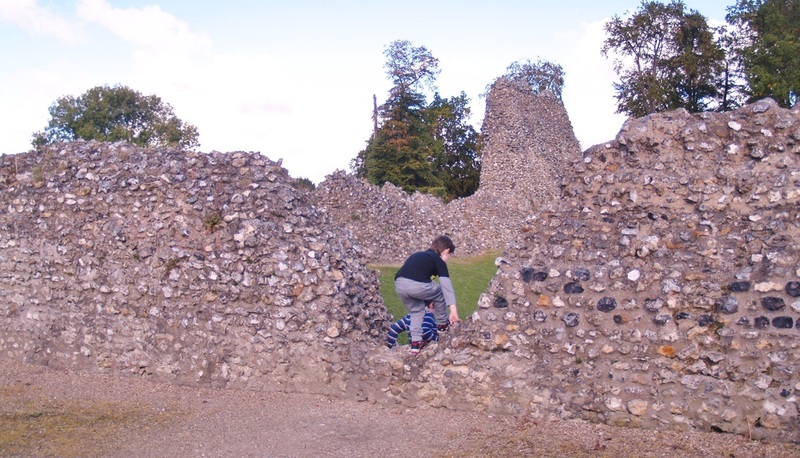 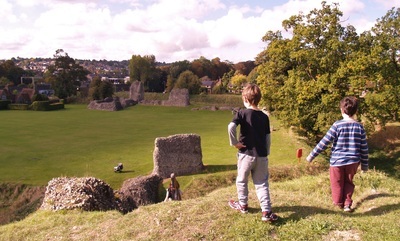 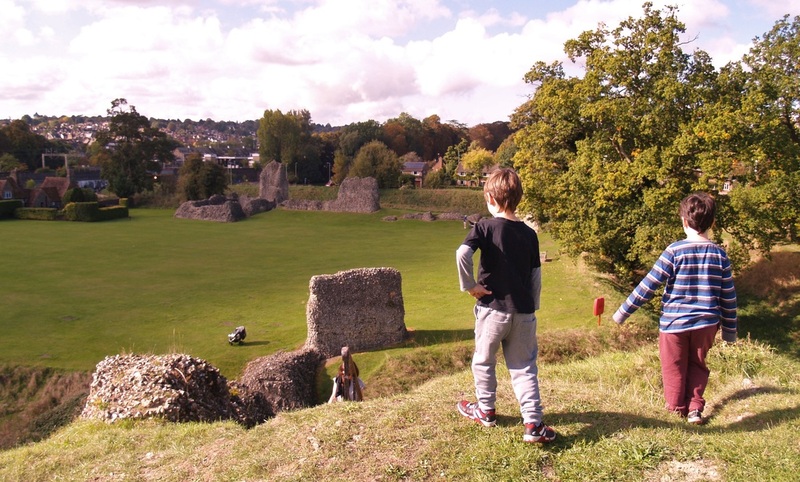 Berkhamstead Castle is mainly now in ruins but its great for the imagination as the boys were trying to imagine how it would have looked when it had water in the moat and all its walls in tact etc. 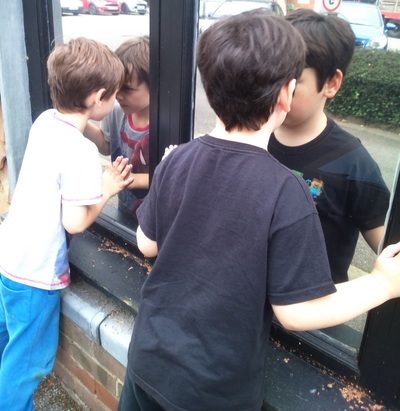 They really enjoyed playing hide and seek around the site and in the centre there is a great big open space ideal for running around ! You can walk up to the top of the "Bailey" and there are two wells on site to look at. 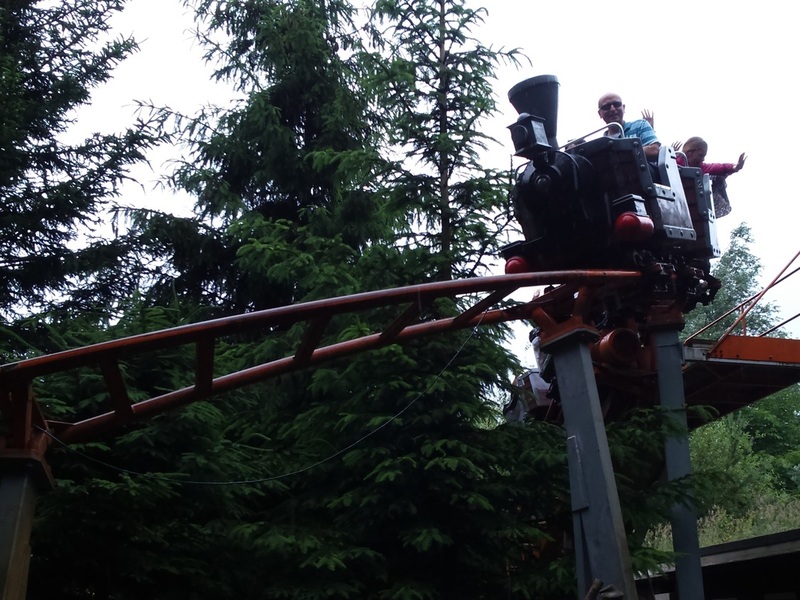 There is a good view from the top and if you like trains a railway line passes right next to the site and every couple of minutes we saw trains passing through. 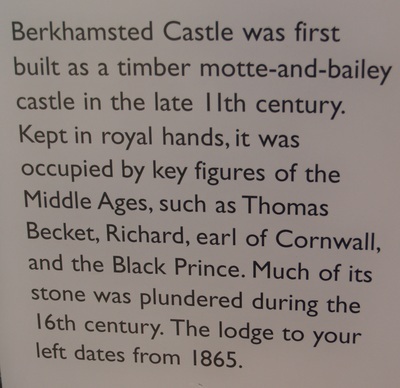 There are lots of handy information boards around the grounds which were useful in gaining some facts about the site and an idea of what it would have looked like when complete. 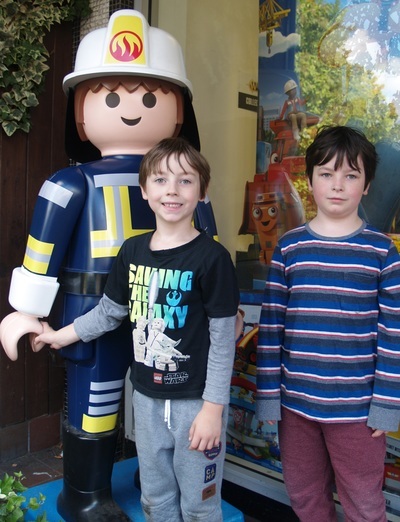 We then took a walk by the Canal before the boys spotted a fab little independent toy shop complete with massive playmobil firefighter outside of it !! 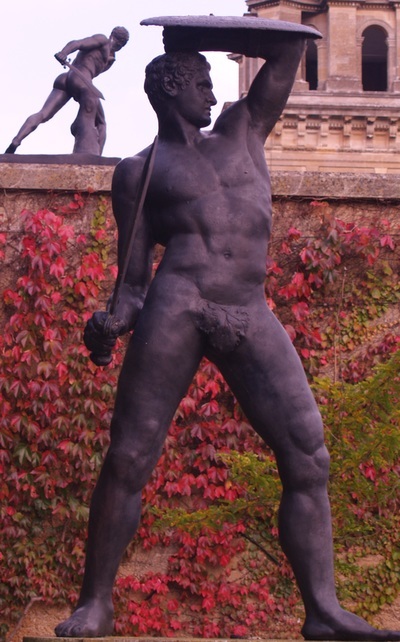 Wadd a lot to see at Waddesdon Manor. 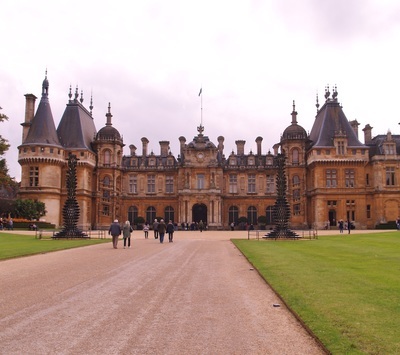 Today we visited Waddesdon Manor which is a stately home close to Aylesbury. 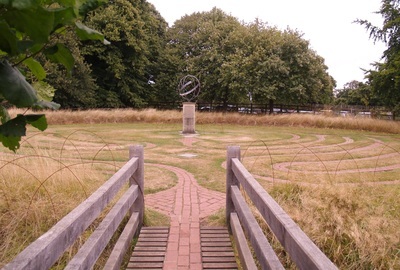 It is well signed and just off the Aylesbury to Bicester road. 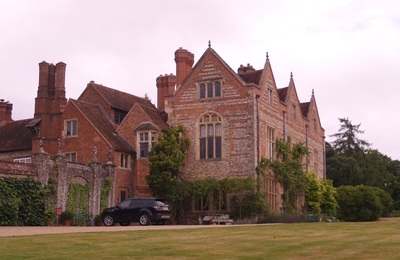 The manor has been featured in Downtown Abbey and various films such as Mummy: Tomb of the Dragon Emperor. 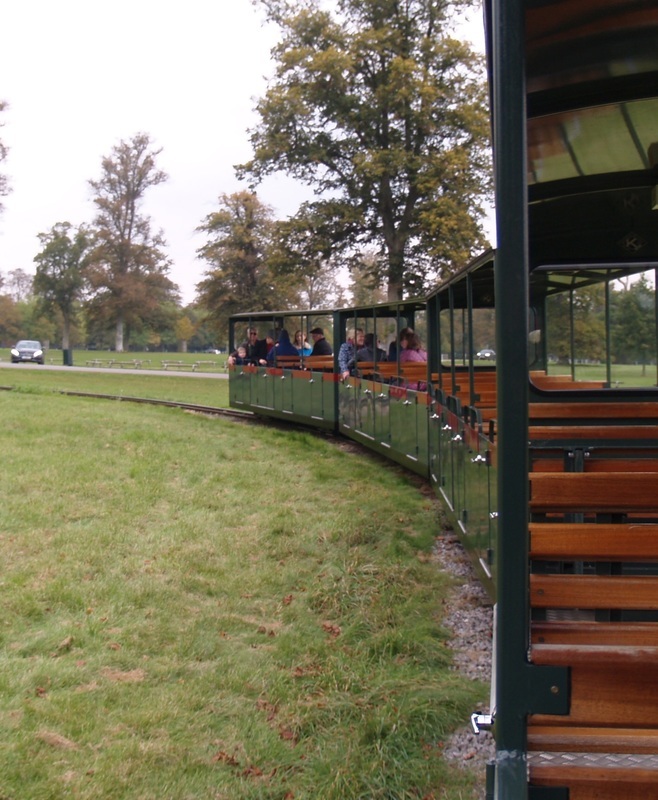 As you enter the site you come to a big car park where you leave your vehicle before catching a shuttle bus up through the parkland to the Manor itself. 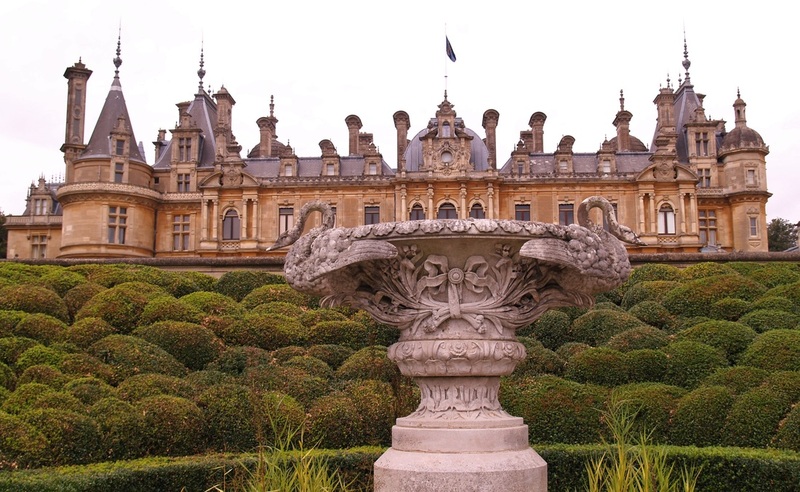 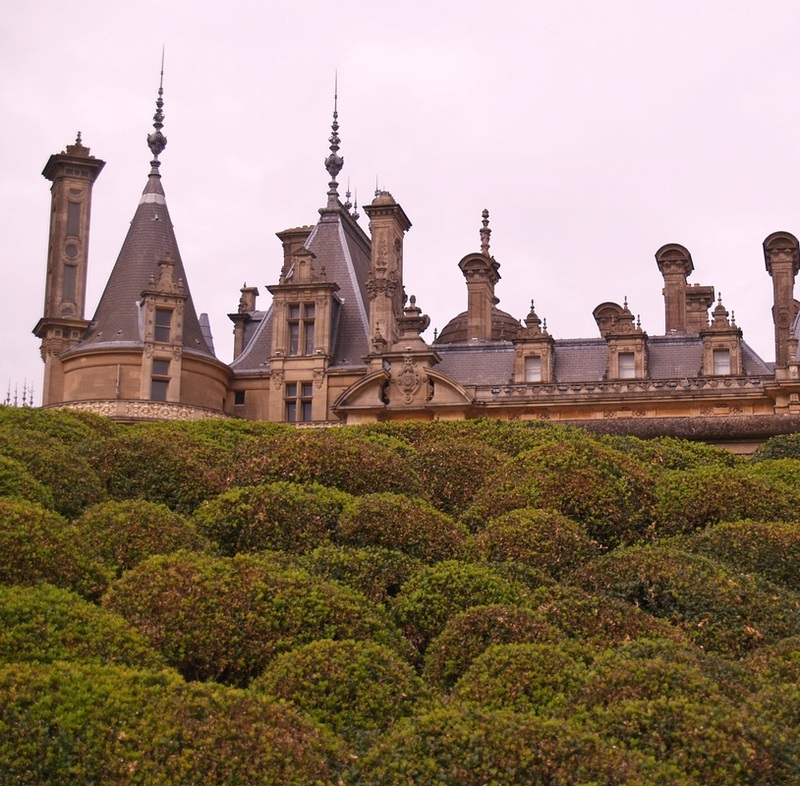 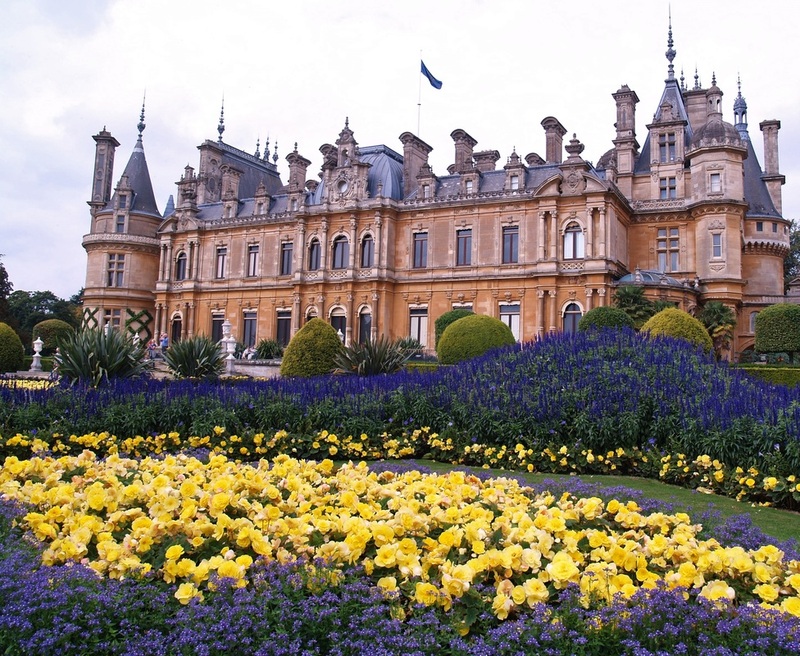 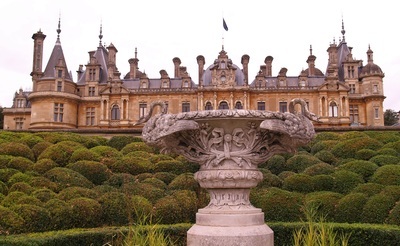 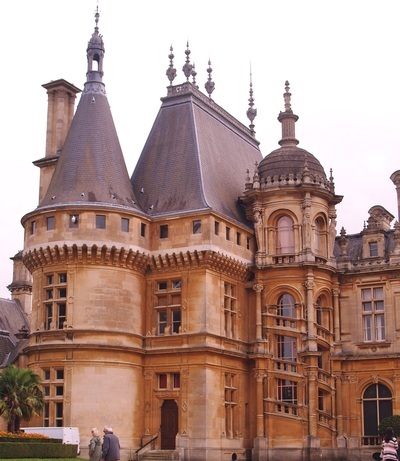 Waddesdon Manor is in my opinion the most beautiful stately home in the UK and was designed to look like a French Chateau. 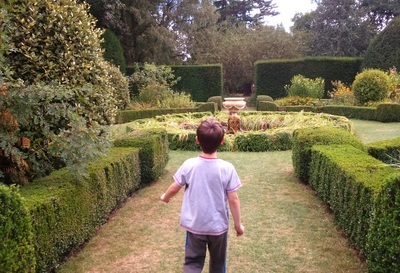 The house itself is interesting inside and very luxurious but our highlight is the gardens. To the rear of the house there is a stunning parterre which is planted up each season in a really lovely display, there are also other areas to explore such as woodlands and little hideaways with statues etc. 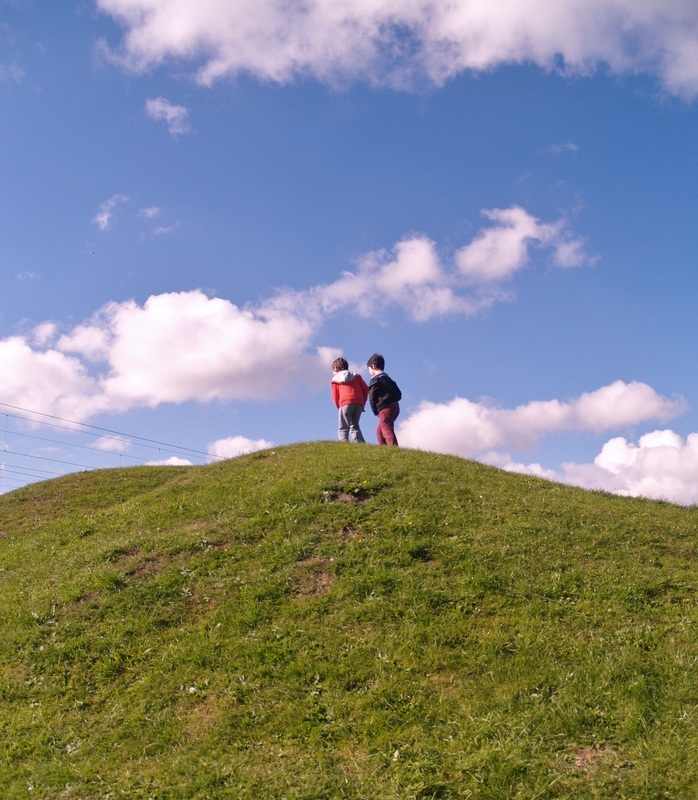 The boys also found a massive hill with a great view that they were running up and down. 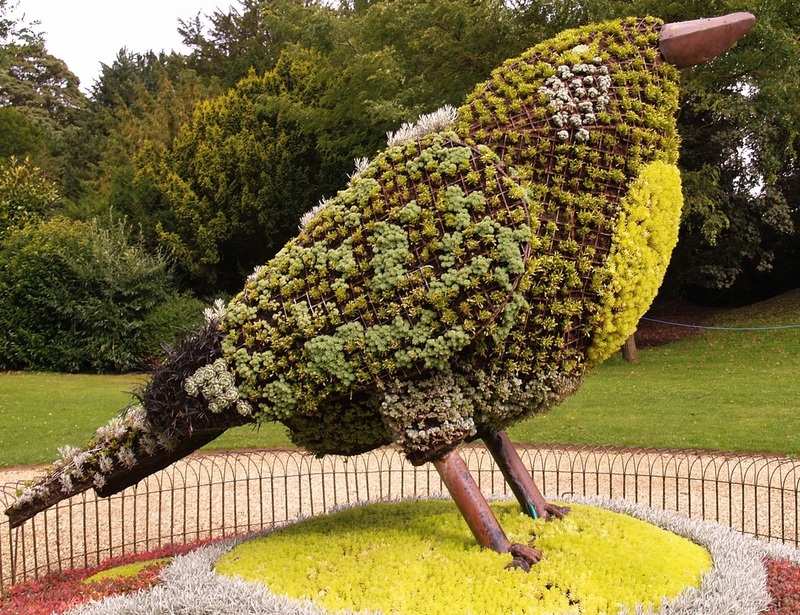 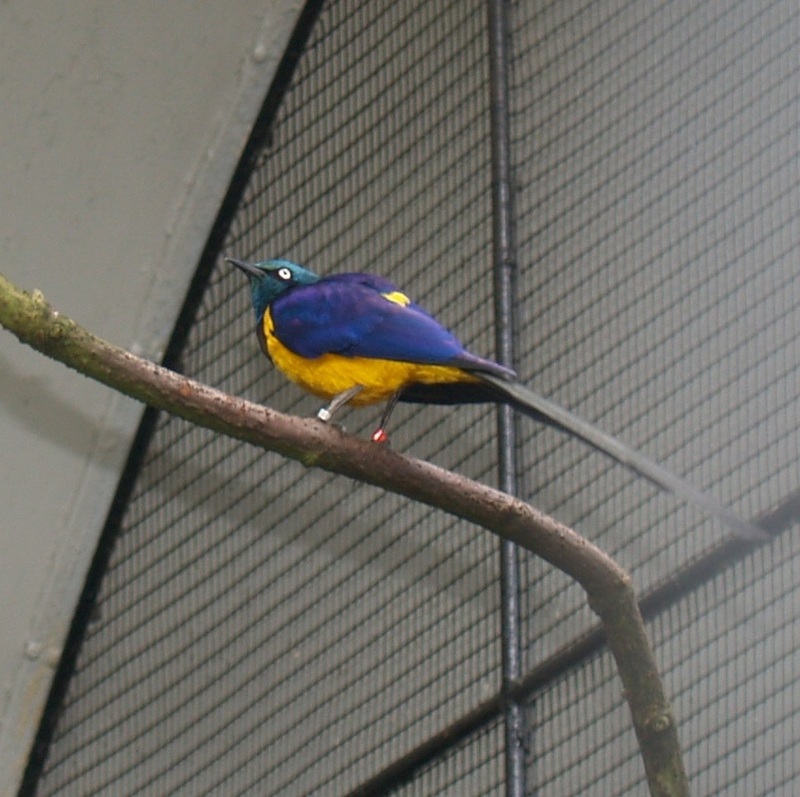 Near to the main gardens are two large birds made completely of flowers.They lead you towards the Aviary in which there is a great variety of tropical and unusual birds. There is information about each one and they are usually easily visible. 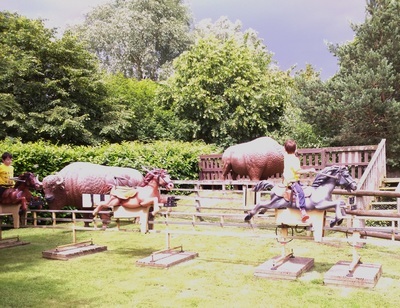 We headed from here down to the Stable Block which has a sweet shop, toy shop, cafe, National Trust shop. bookshop and an exhibition space. At the moment it has an exhibition about ceramics. 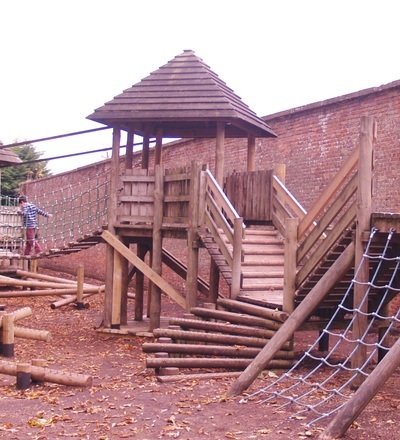 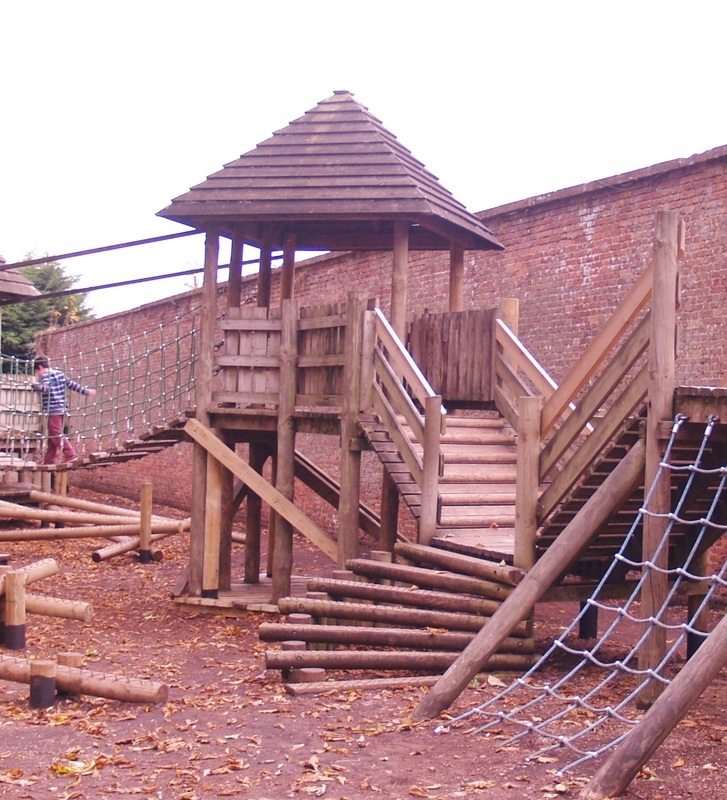 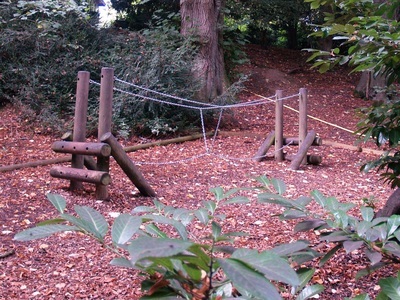 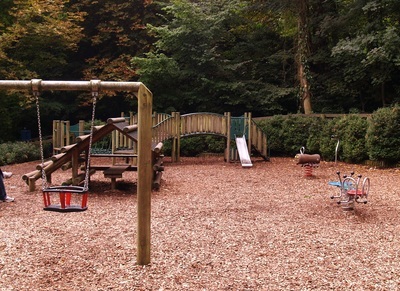 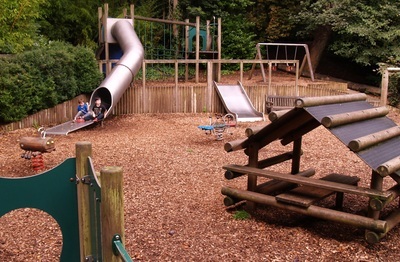 Just above the stable block is the woodland play area. 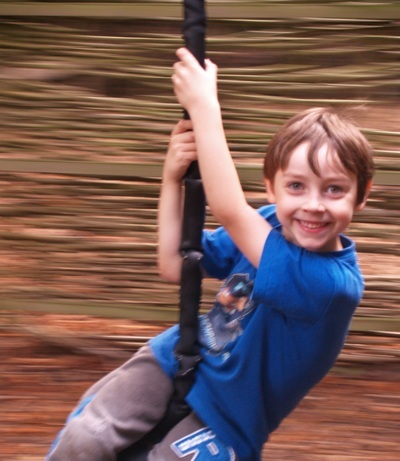 This is fantastic for all ages of children, as there is an under 9's area with swings, climbing equipment, slides, see saws etc and as you go up through the woodland you come across different areas with more balancing and climbing equipment and a great big long green slide which was great fun. 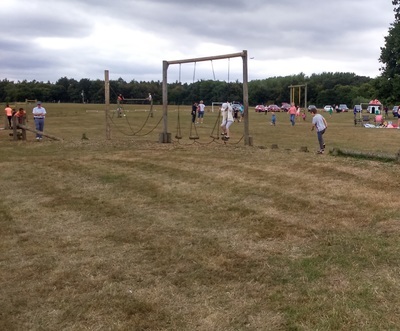 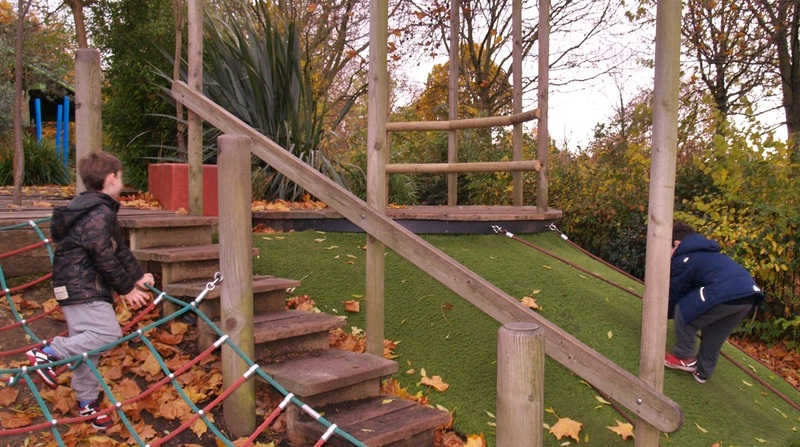 At the top of this area is equipment for older children such as a zip wire, basket swing, balancing items, climbing frame etc all of which is designed for children aged 6 to 14. 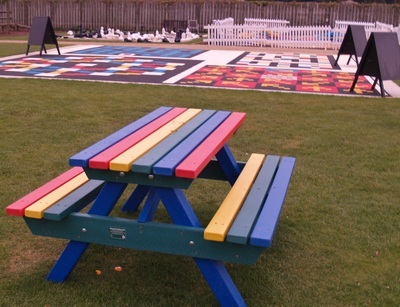 Close to this area there is a small cafe selling hot and cold drinks and ice creams which has lots of seating outside plus a picnic area and natural auditorium. 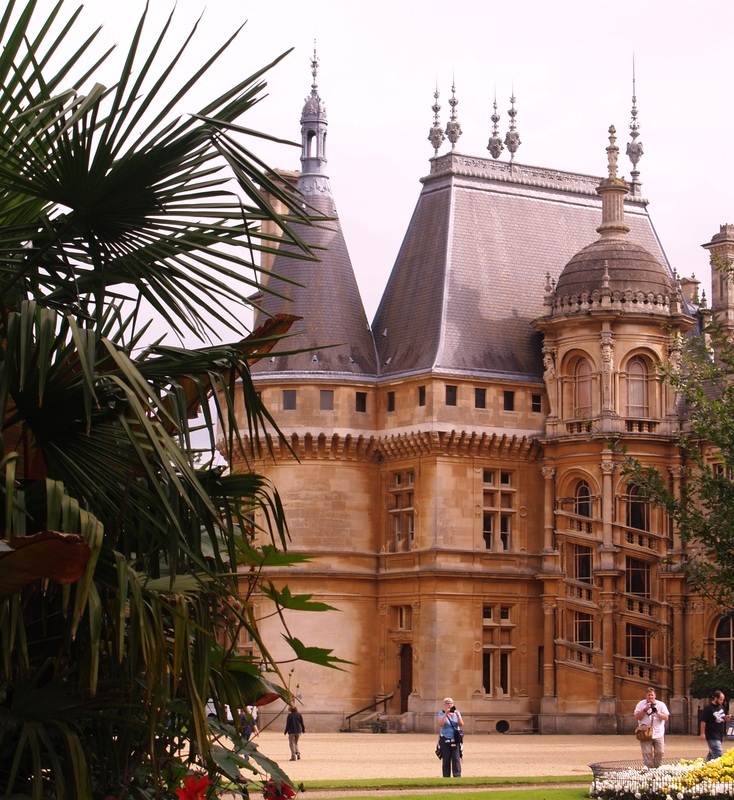 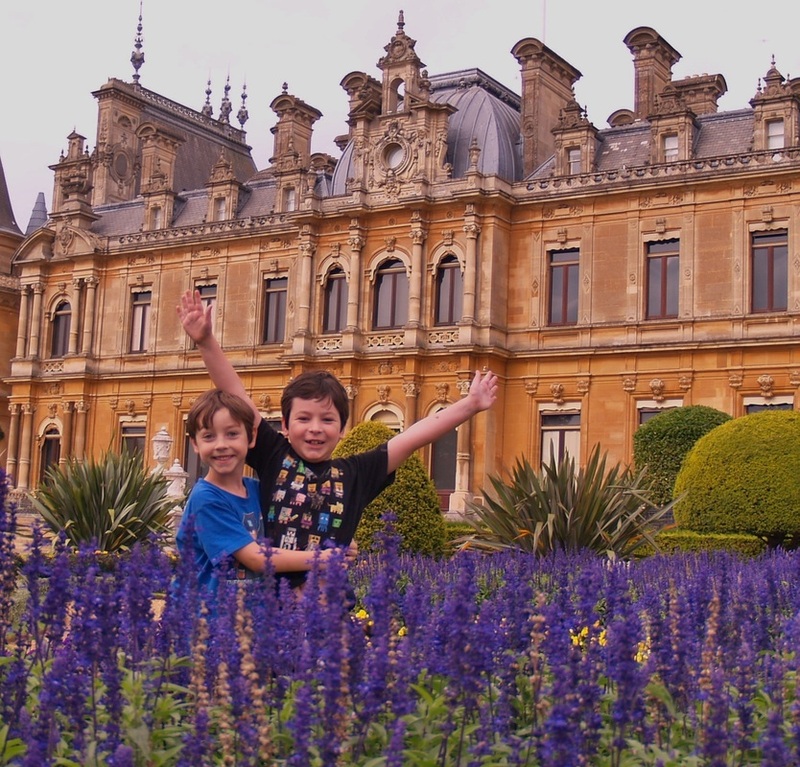 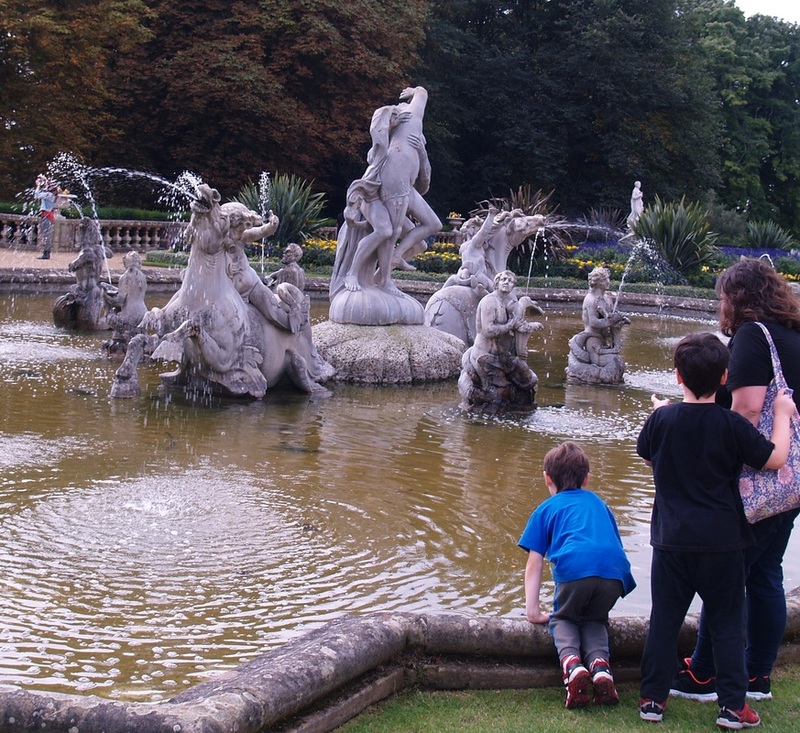 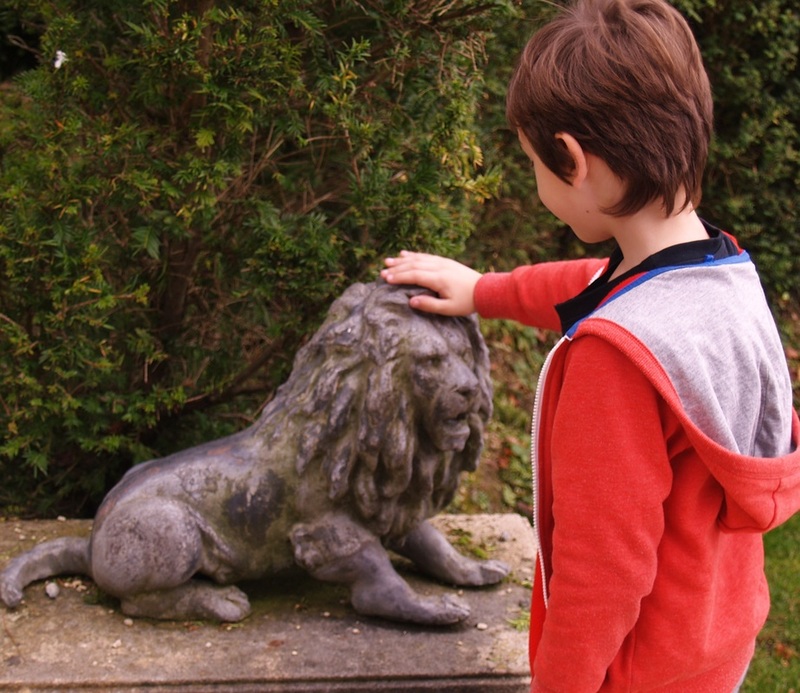 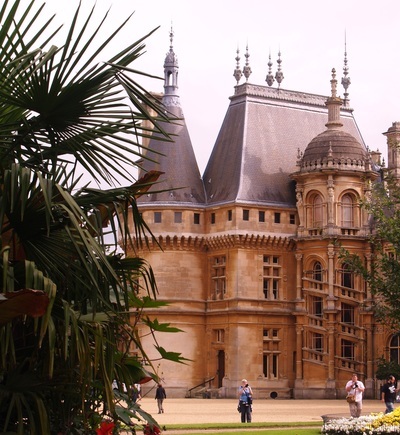 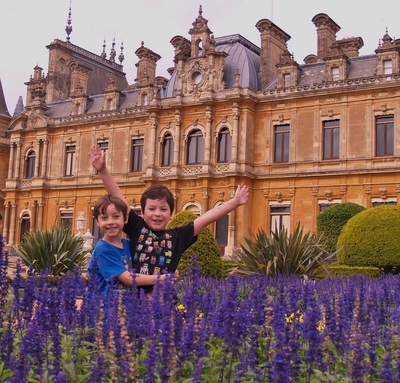 We would highly recommend Waddesdon as a day out as it is really beautiful, has lots to see and the play area was great fun too. 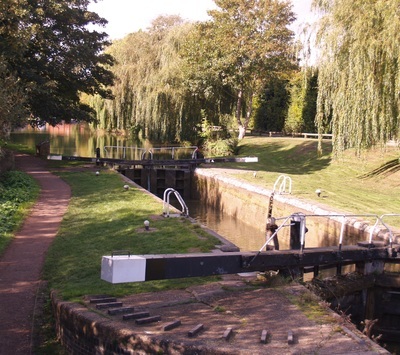 Today we visited Tring, which is a town in Hertfordshire close to Aylesbury. 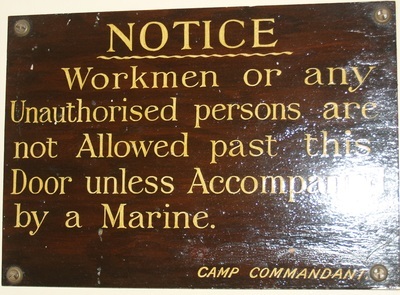 Its well signed locally. 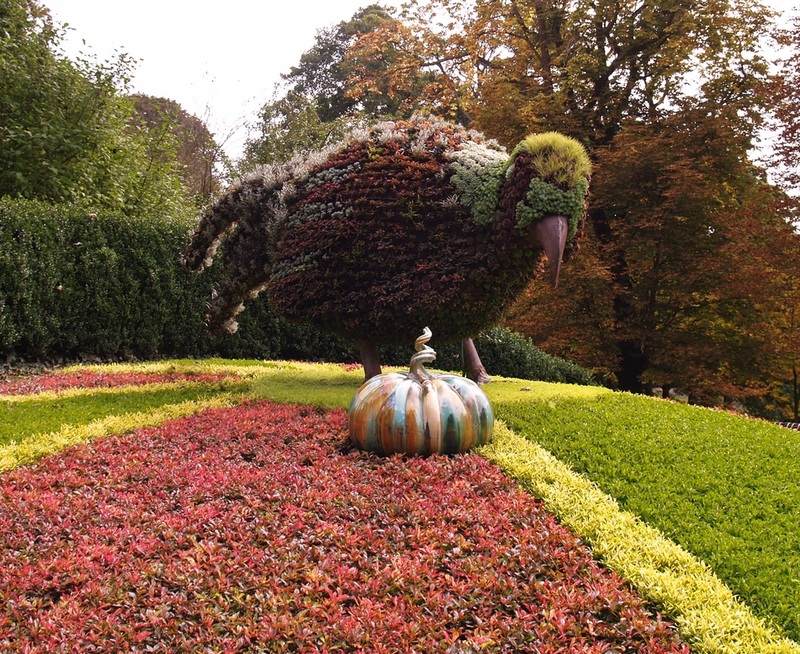 The town itself is very pretty and has a small duck pond, church and other features to look at (including a maze in the shape of a zebras head). Trings main tourist attraction is its museum which is part of the Natural History Museum. 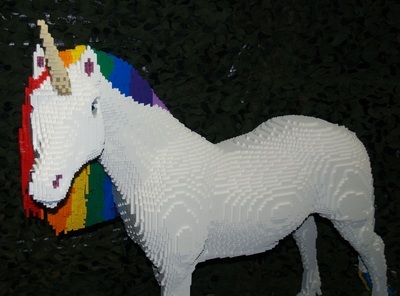 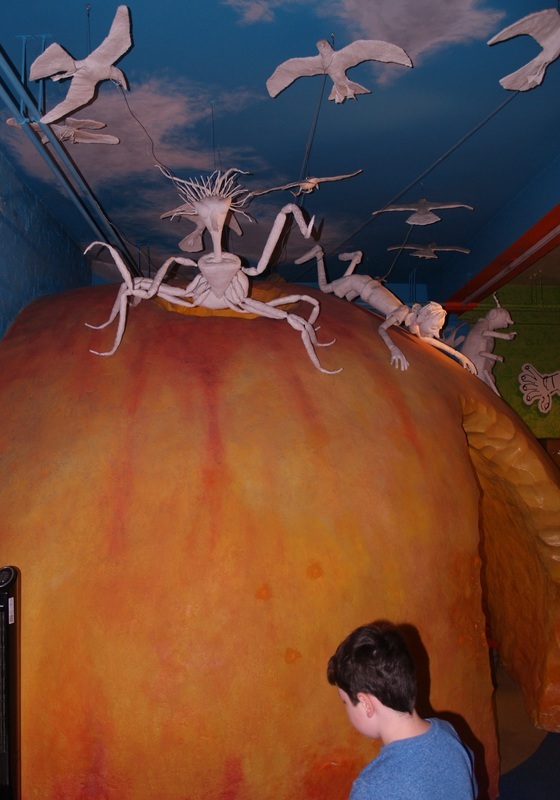 It houses four floors of stuffed animals ranging from tiny insects up to an elephant seal. 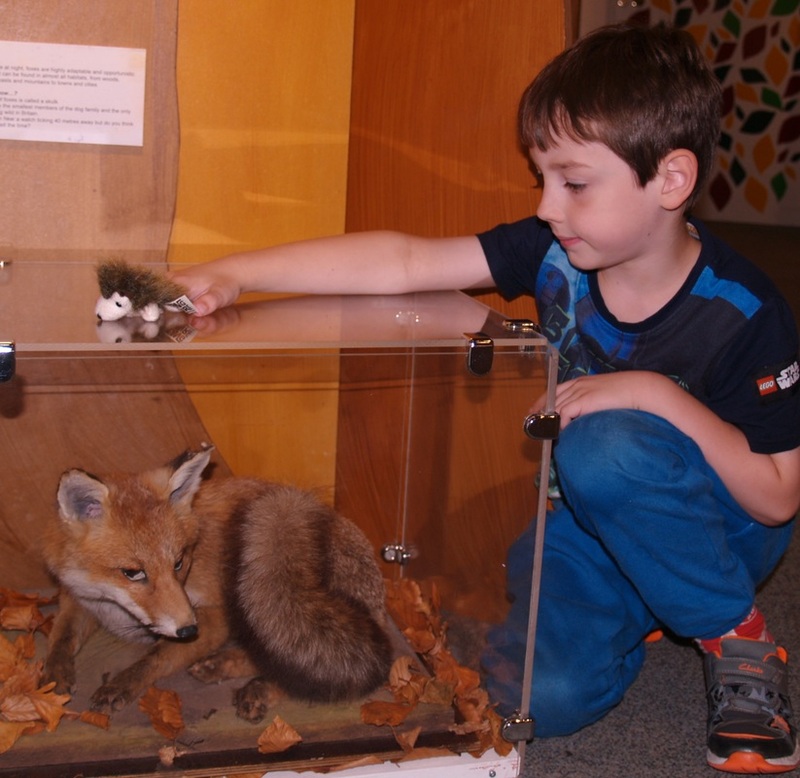 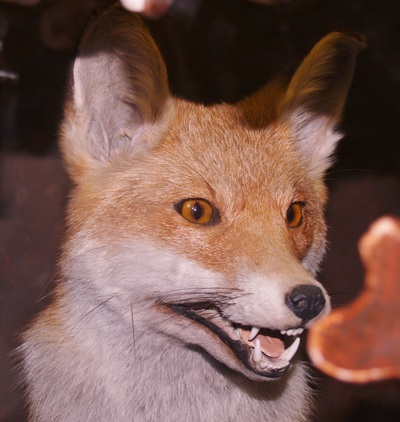 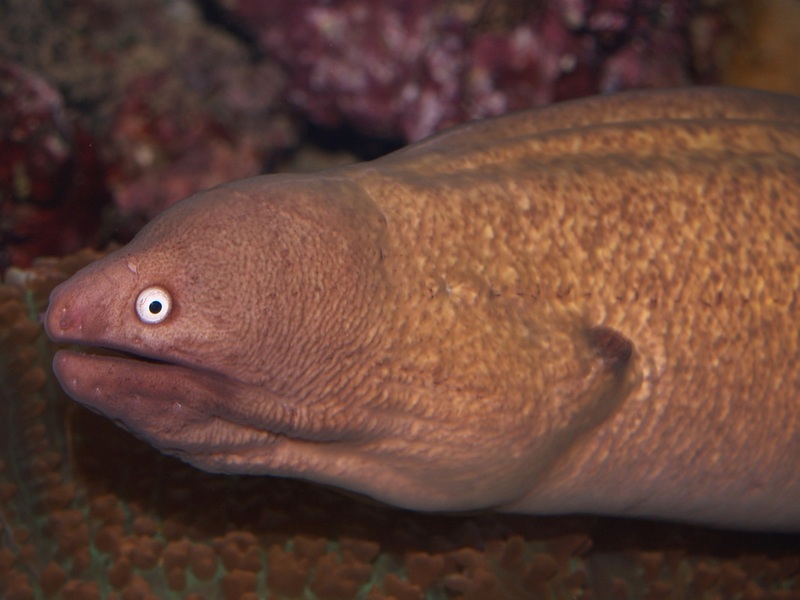 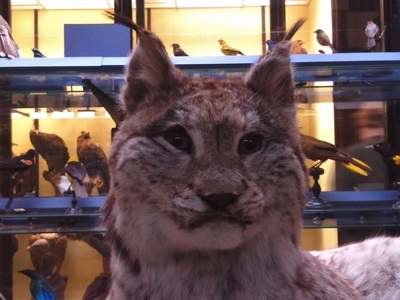 Its completely free and interesting for all ages, you can borrow paper and a clipboard from reception to draw your favorite animals, watch a video about taxidermy (not for the squeamish!) and there is a hands on children's room for younger ones. At the moment they have a small exhibition on about early man with a few objects to touch and information about what creatures were around at the time. The museum also has a picnic area directly behind it and a cafe and small shop. 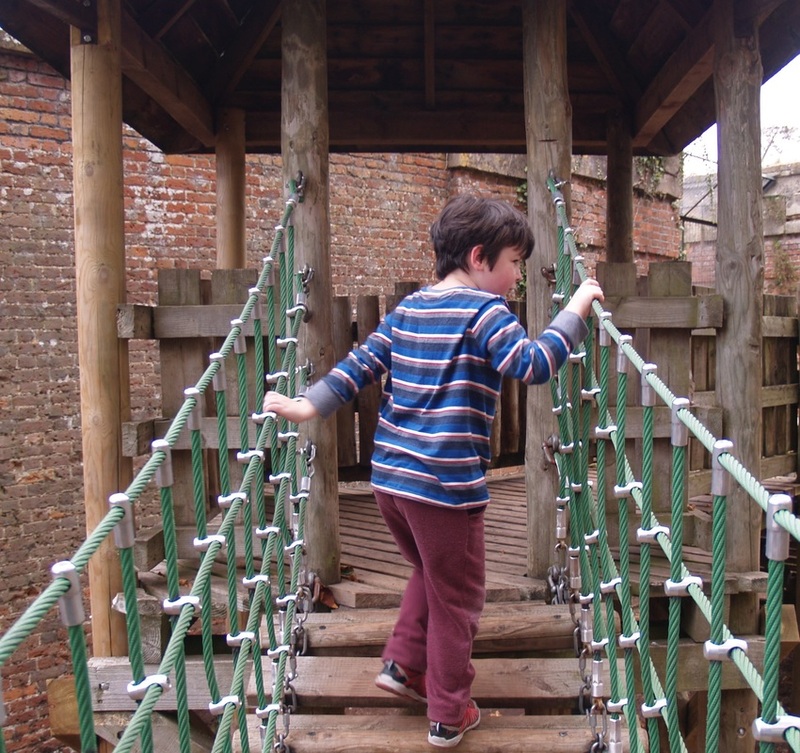 If you exit the Museum and head to the side of it there is a path which leads you over a bridge which spans the dual carriageway to Tring Park. 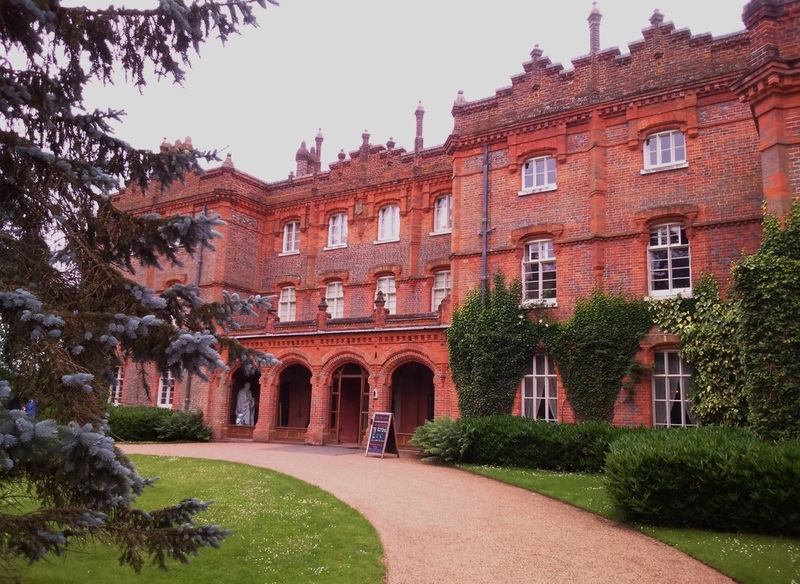 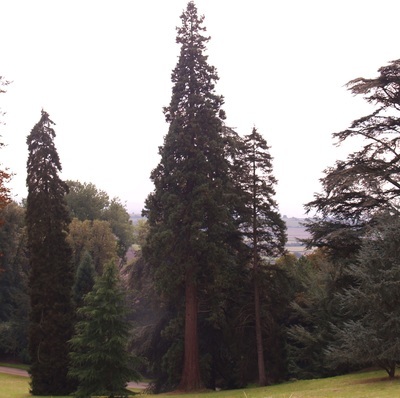 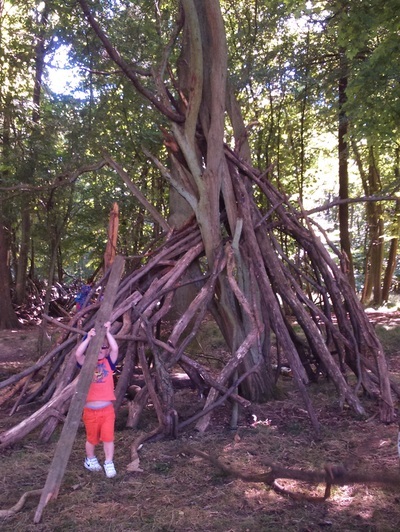 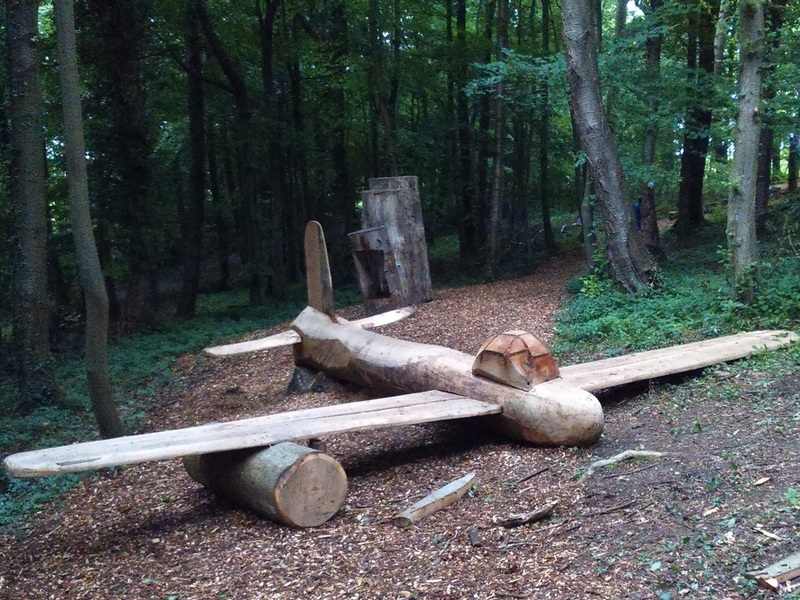 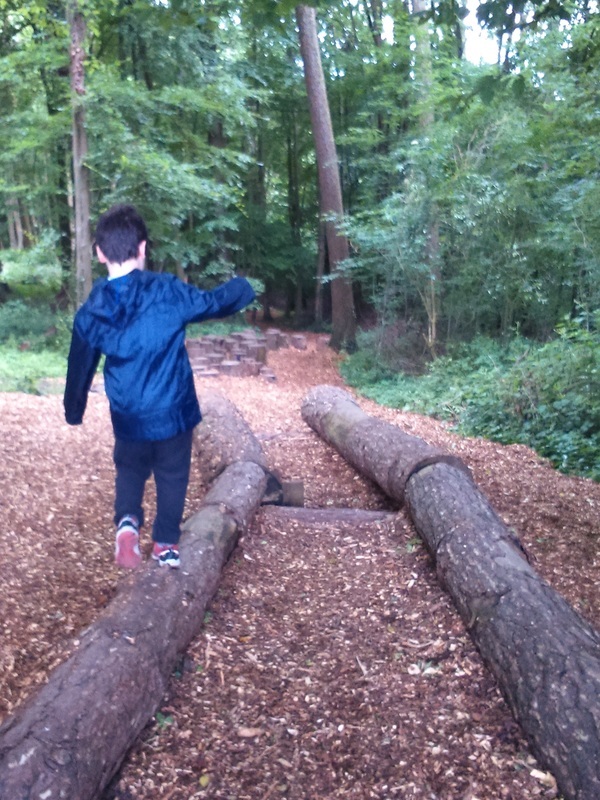 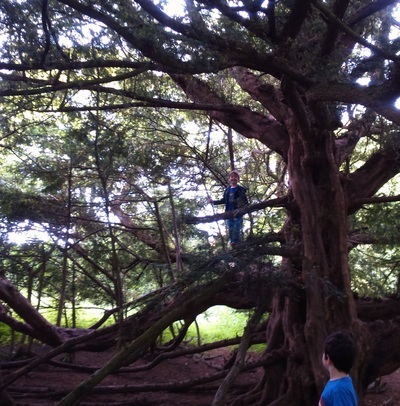 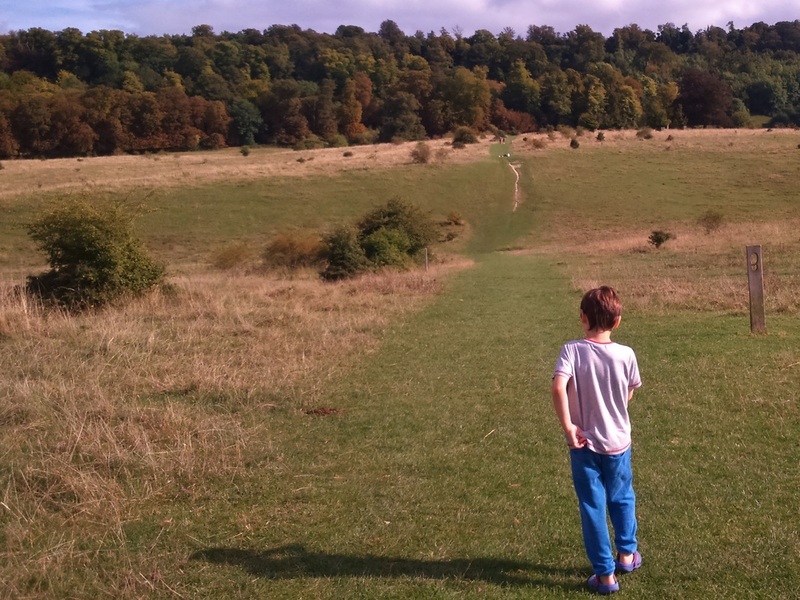 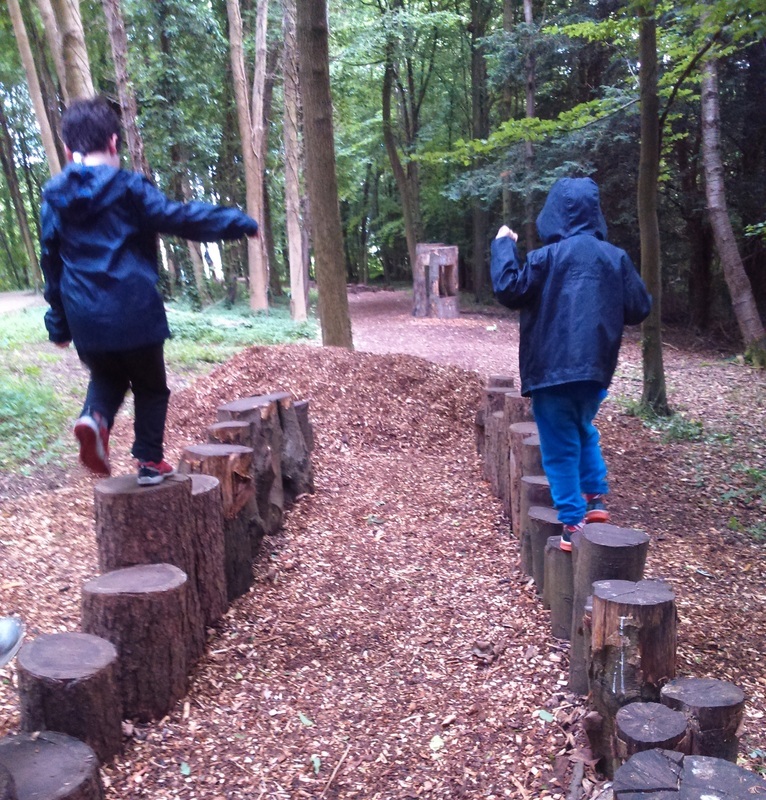 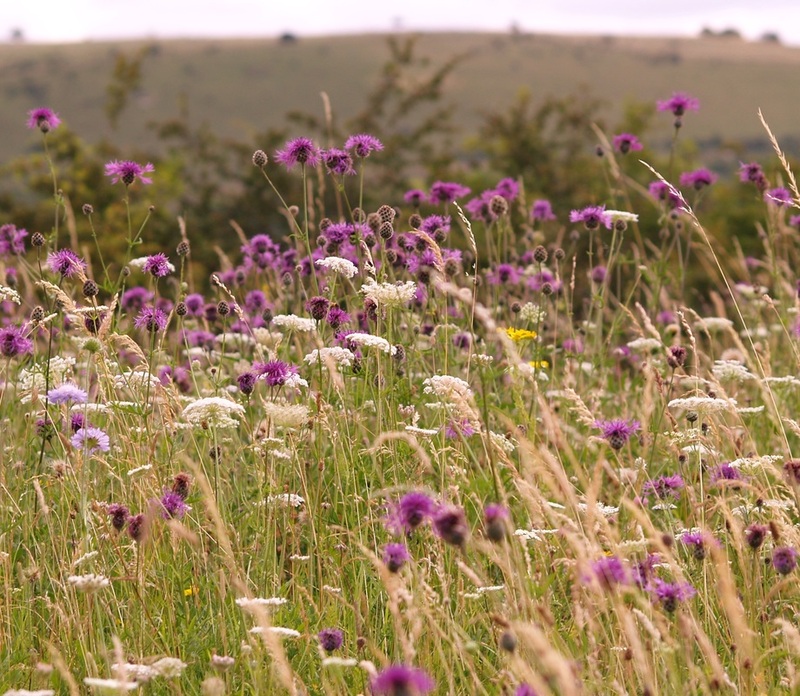 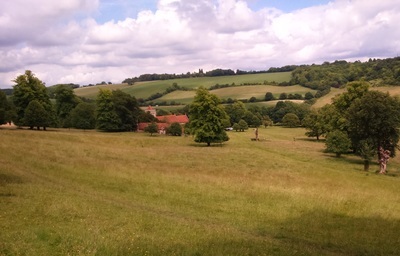 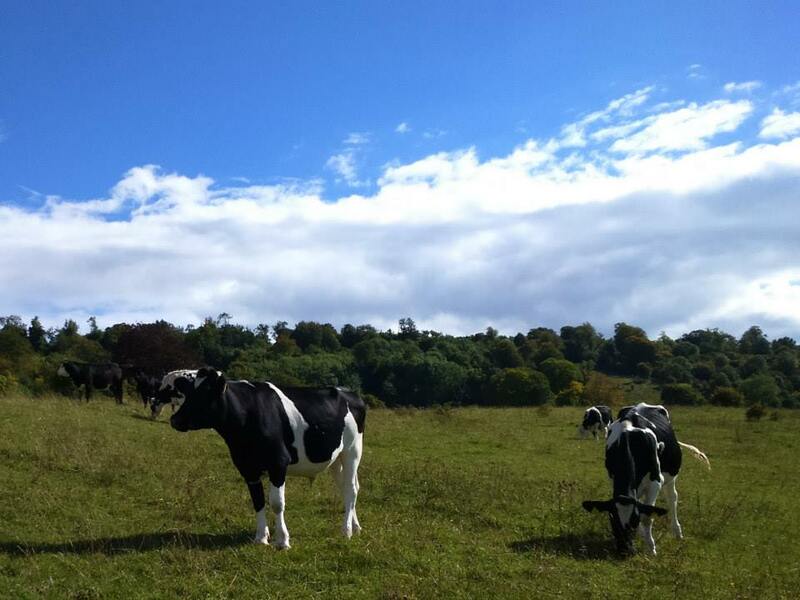 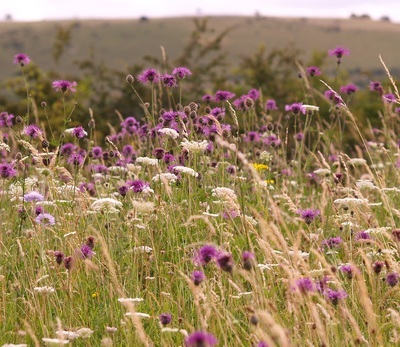 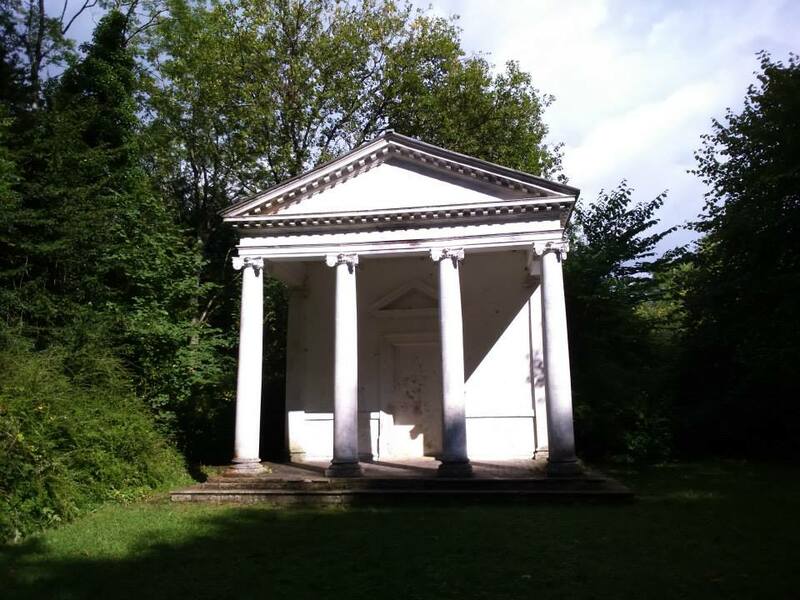 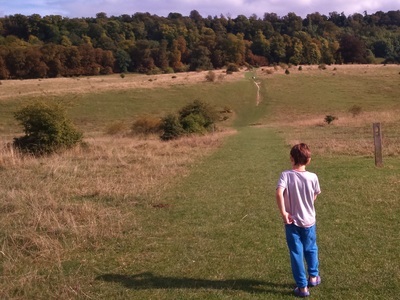 Tring Park has over 300 acres of downlands and woodlands to explore and is managed by the woodland Trust. 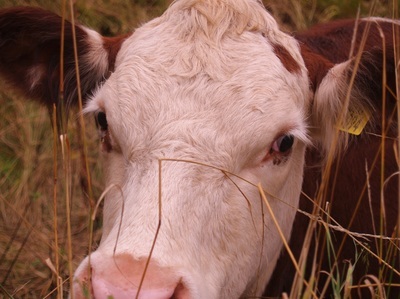 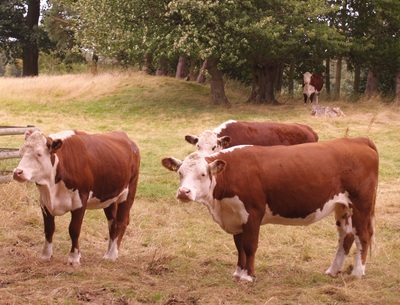 They have free roaming cattle who can often be seen and are totally unfazed by people walking past them. 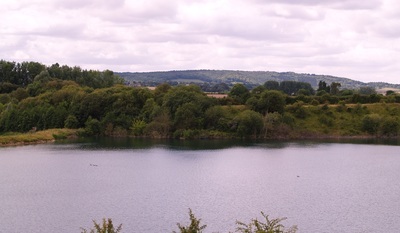 There are lovely views in this area and its pleasant to walk around. 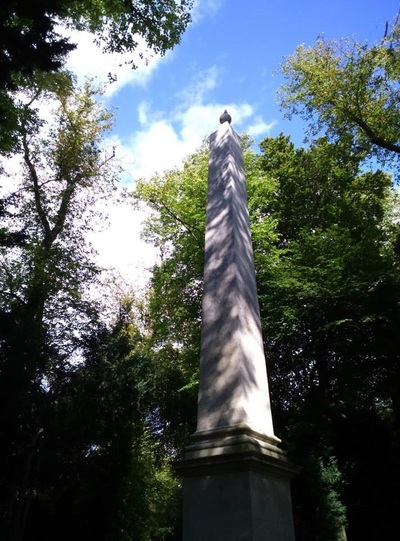 We headed through the main pasture to get to the woodlands in which there are various monuments to find including a mock Greek temple and an obelisk. 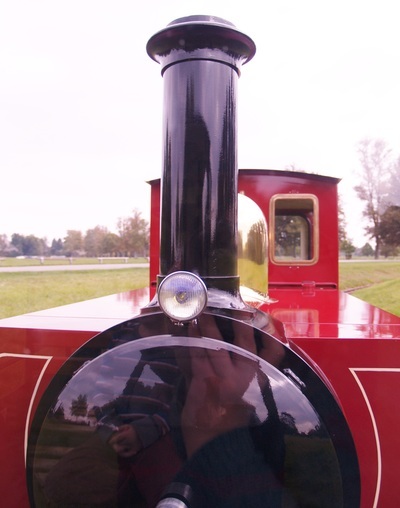 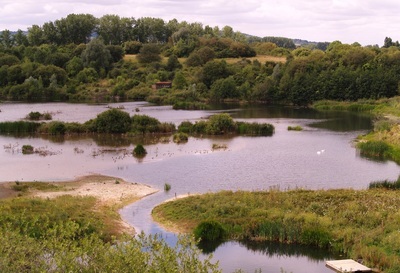 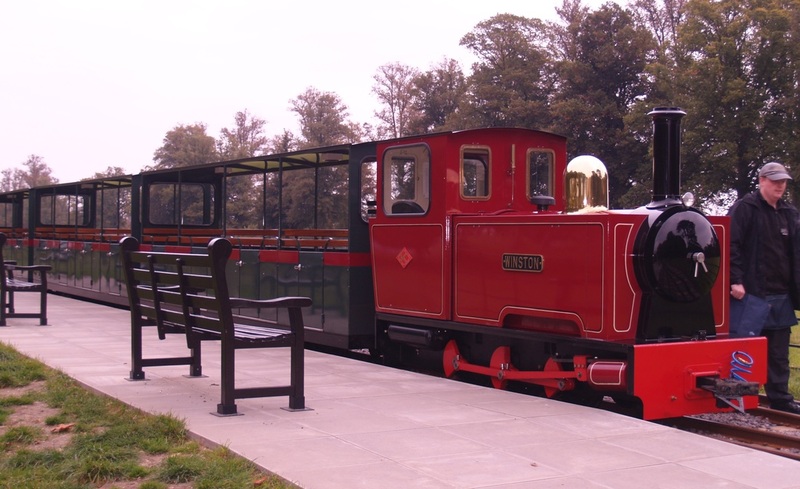 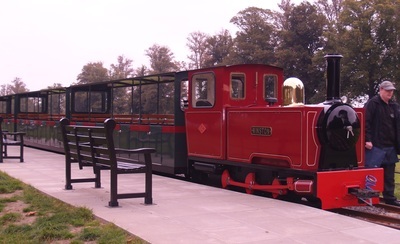 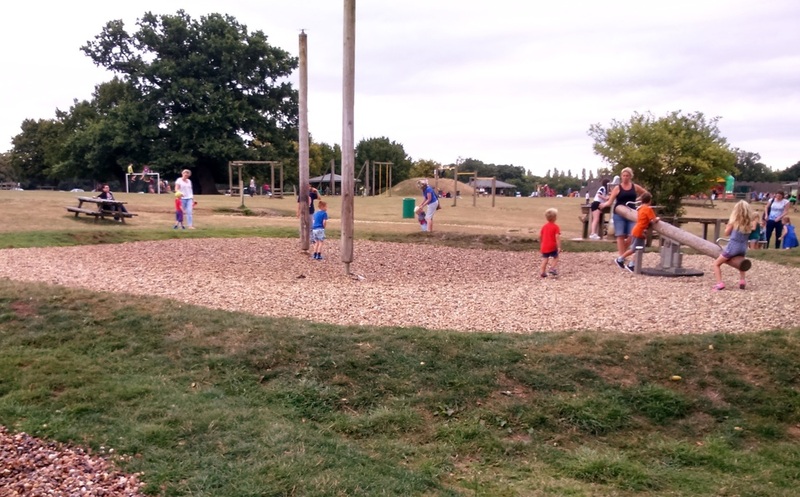 The park again is free to enter so for a low cost or free day out Tring is well worth considering. 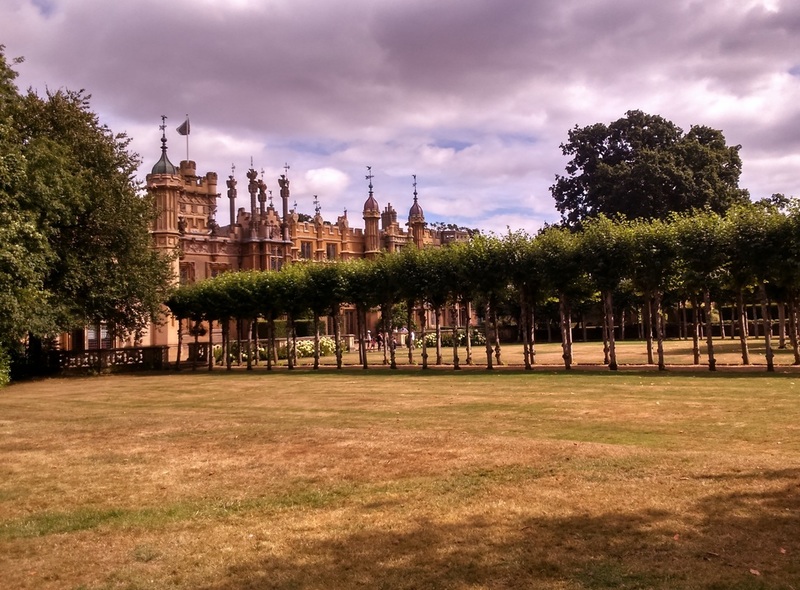 Today we returned to Knebworth House which is close to Stevenage in Hertfordshire. 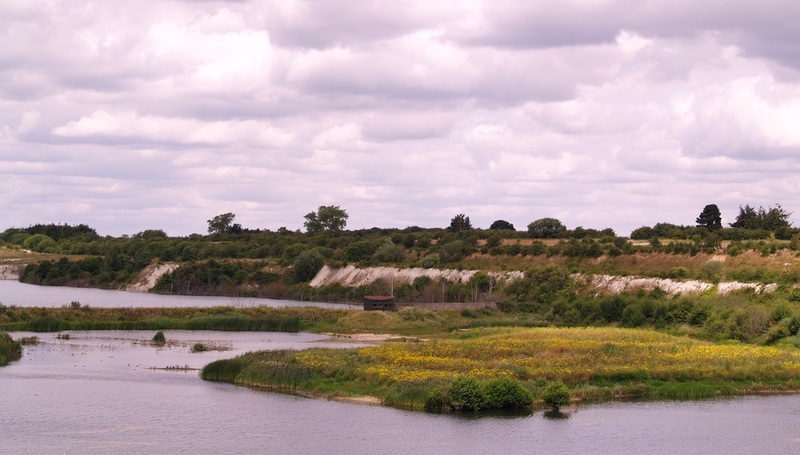 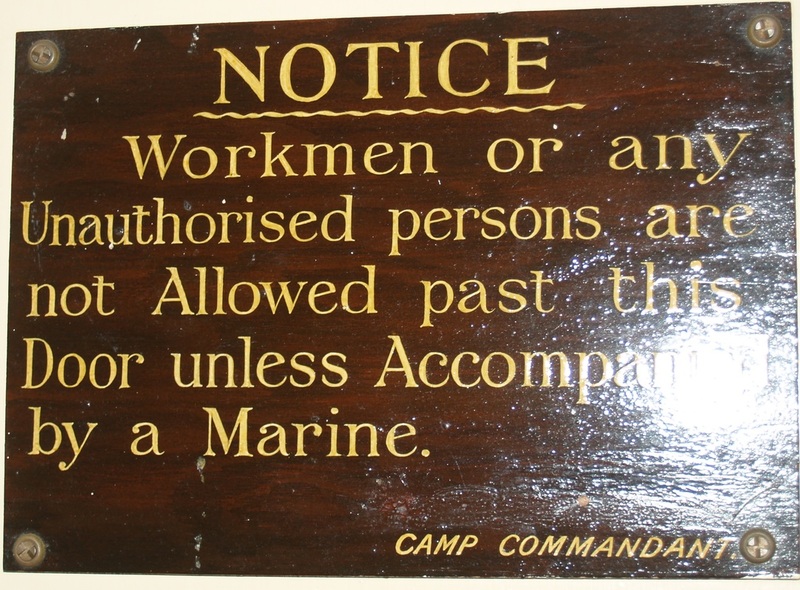 It is very well signed locally and is just off of the A1M. 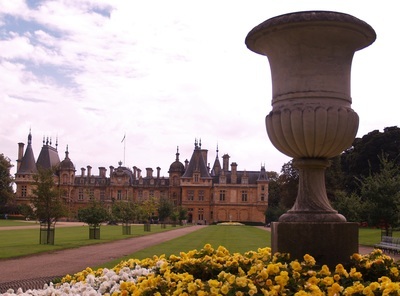 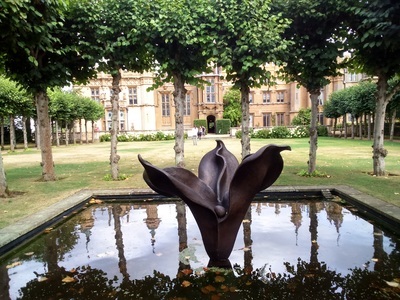 Knebworth is a Tudor-Gothic style house surrounded by formal gardens and acres of parkland. 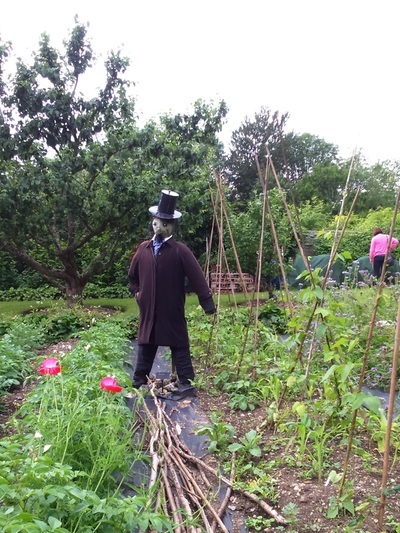 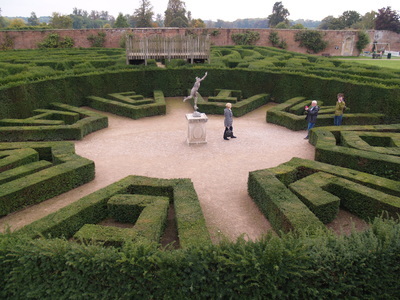 The gardens are very pleasant with different areas to explore such as woodland, a kitchen Garden, formal gardens and a maze. 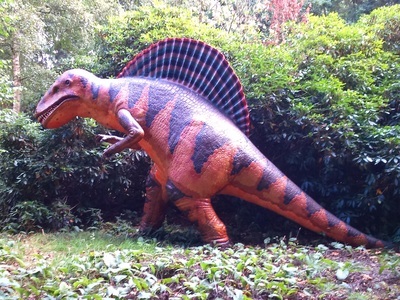 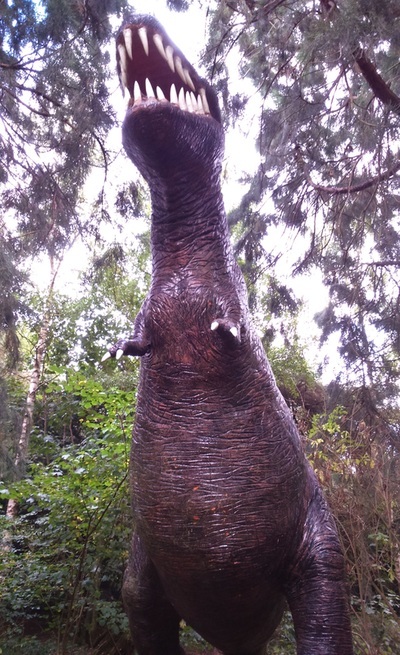 Also within the gardens are Knebworths dinsosaurs ! 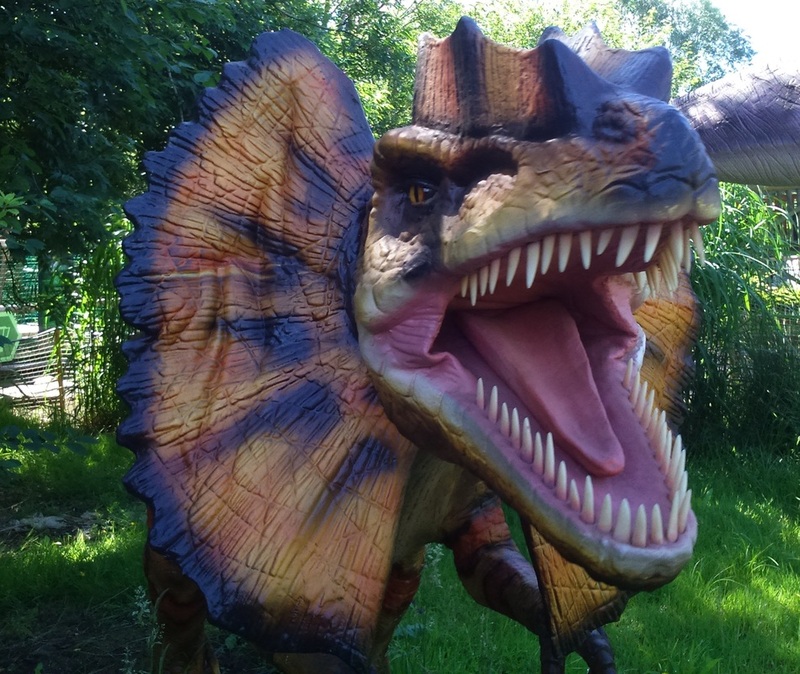 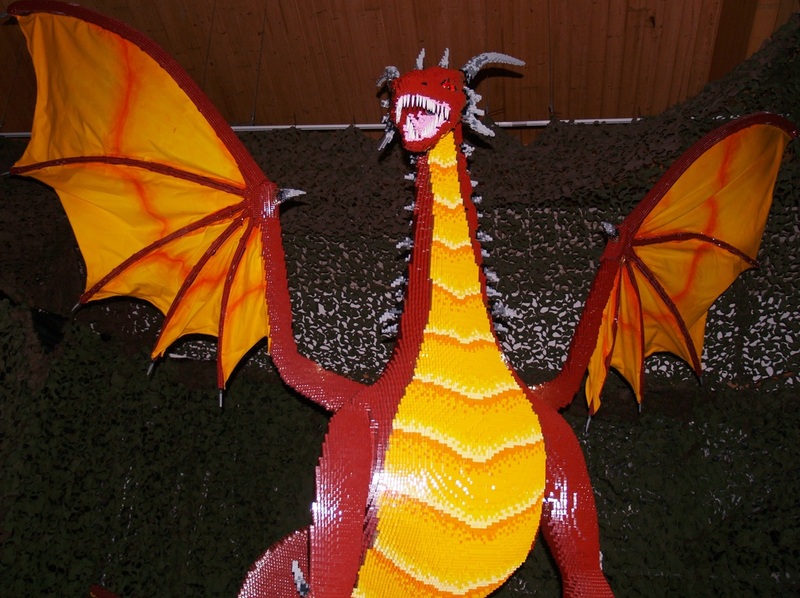 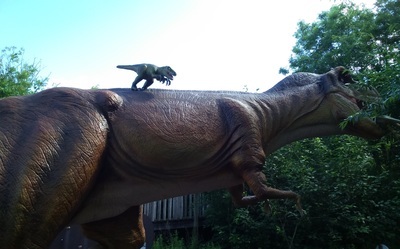 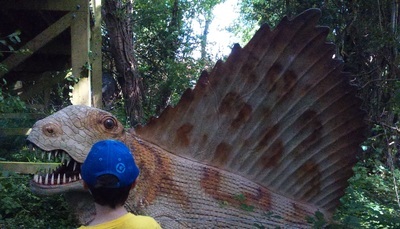 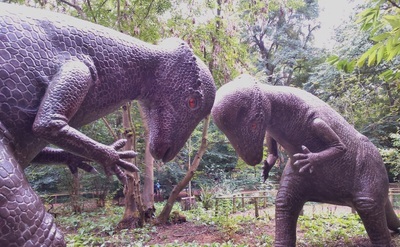 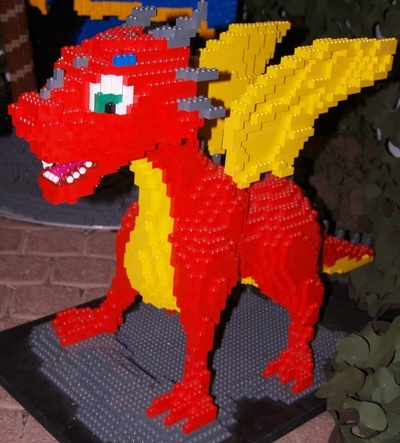 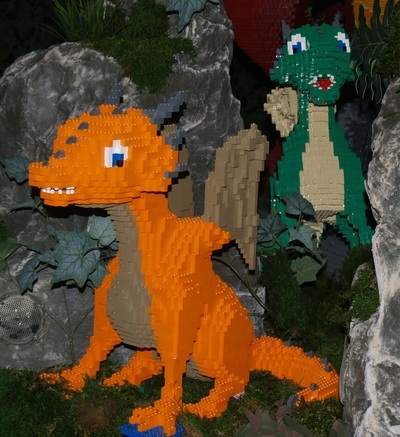 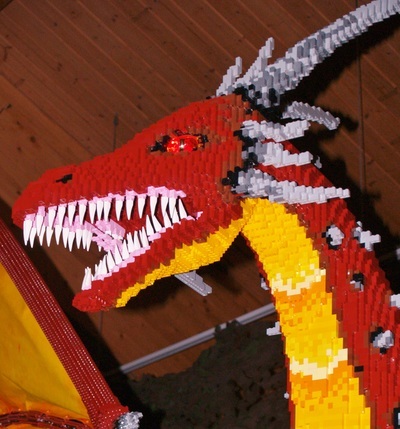 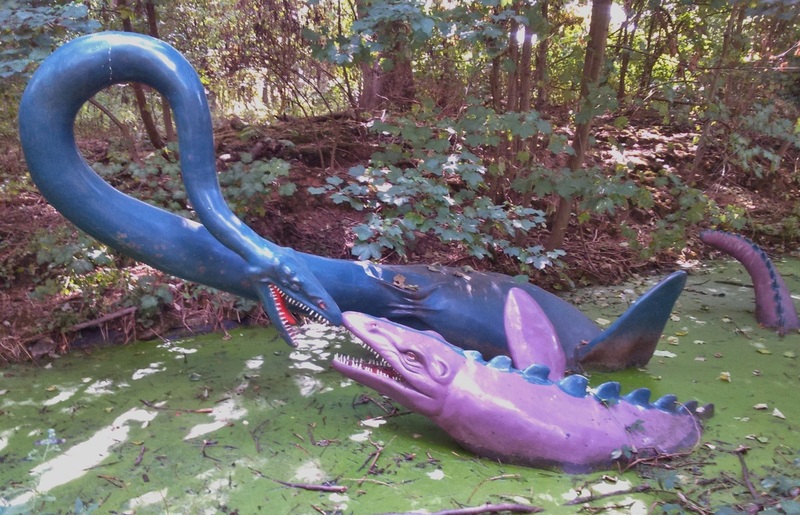 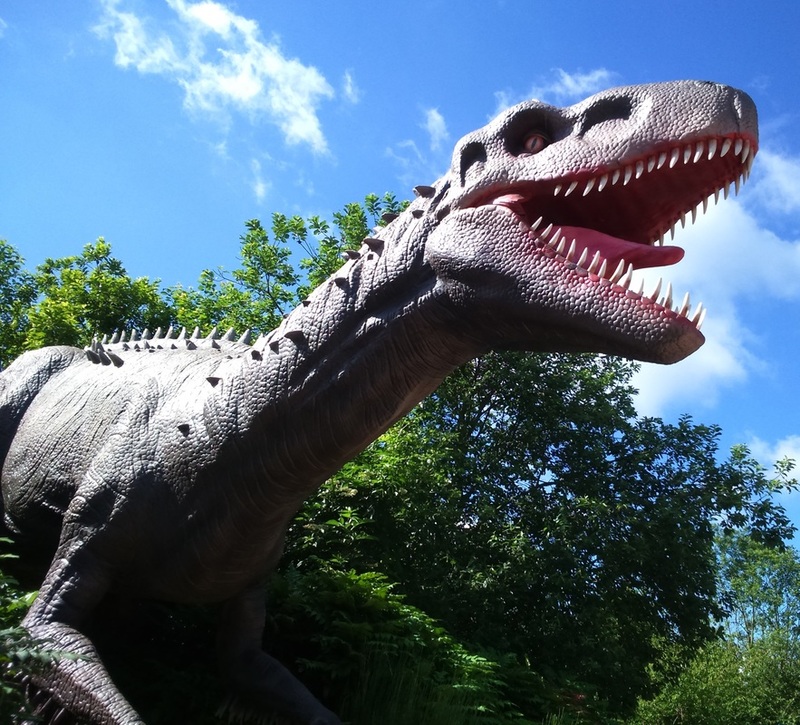 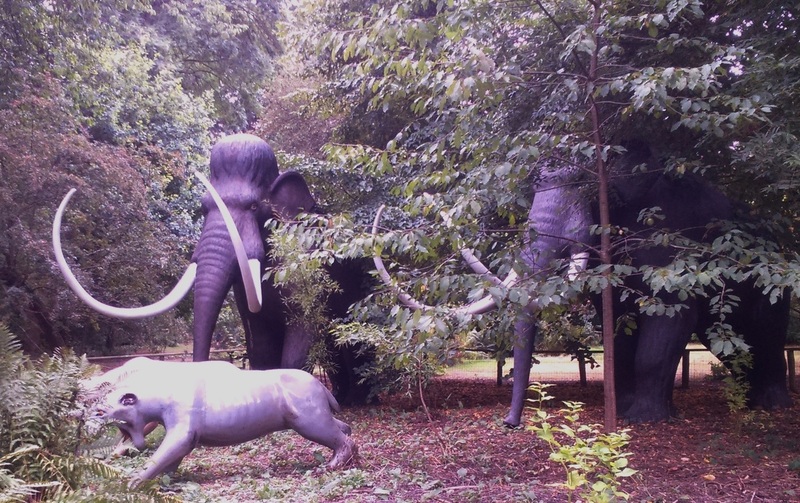 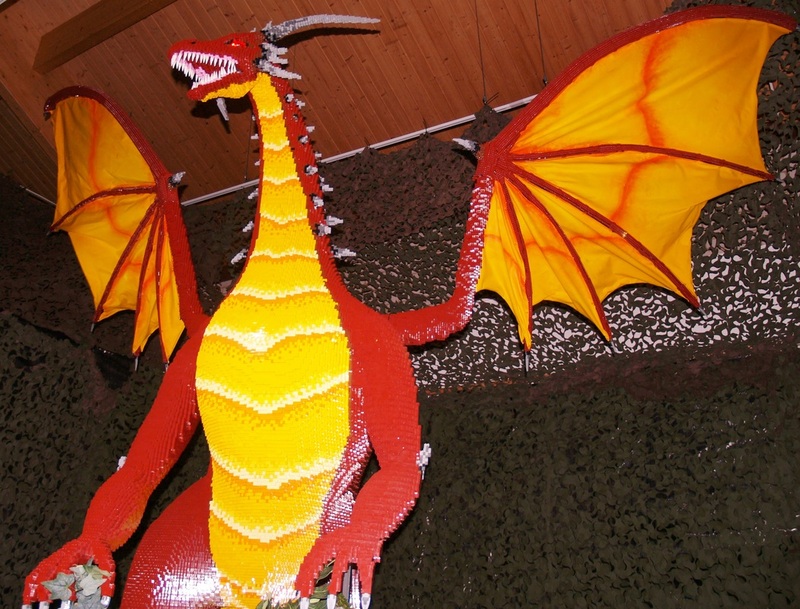 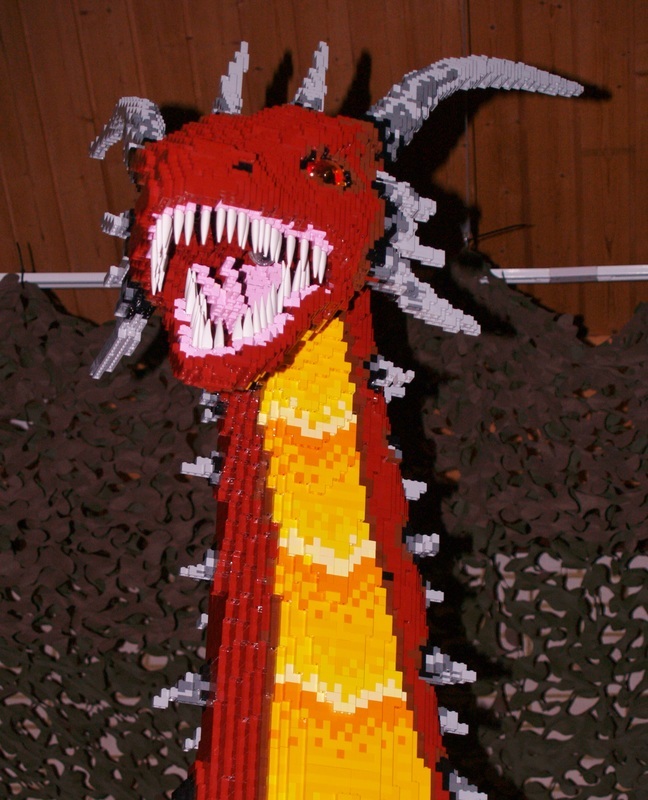 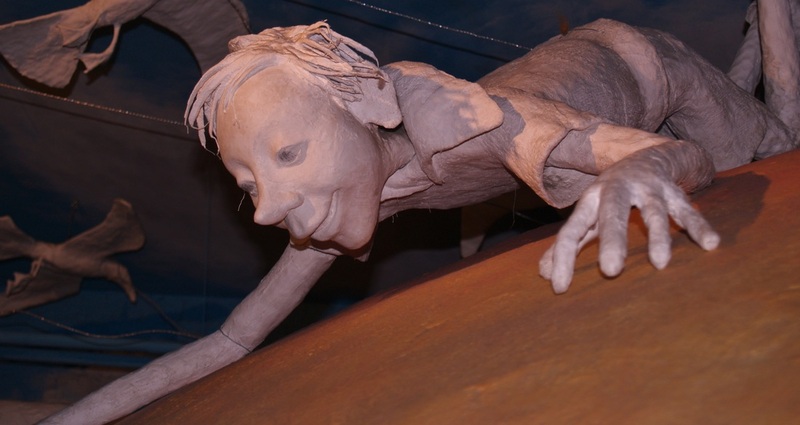 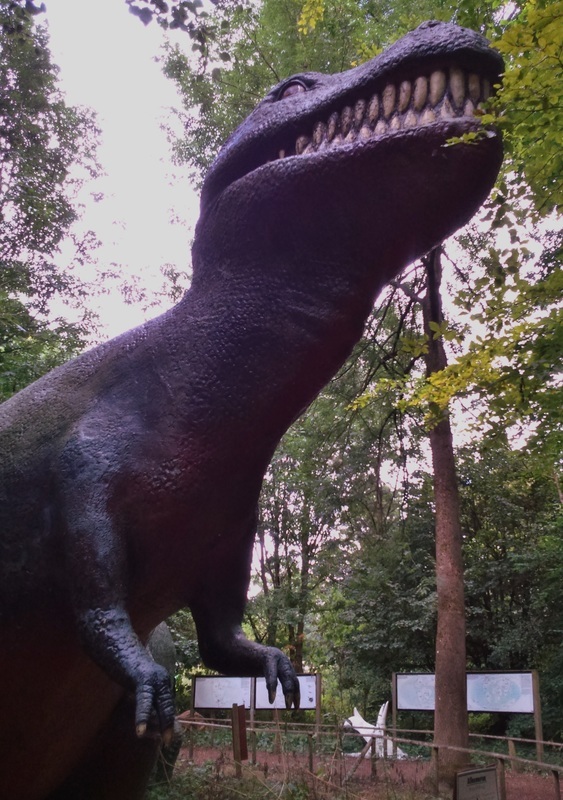 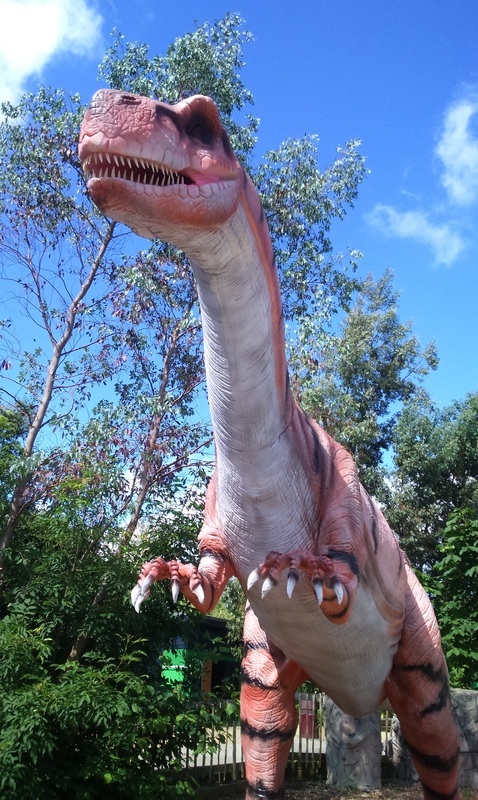 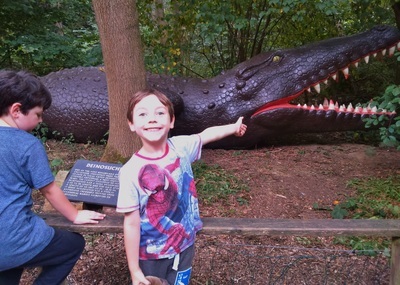 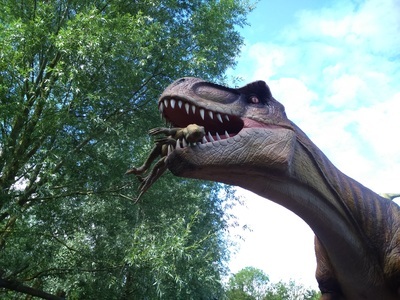 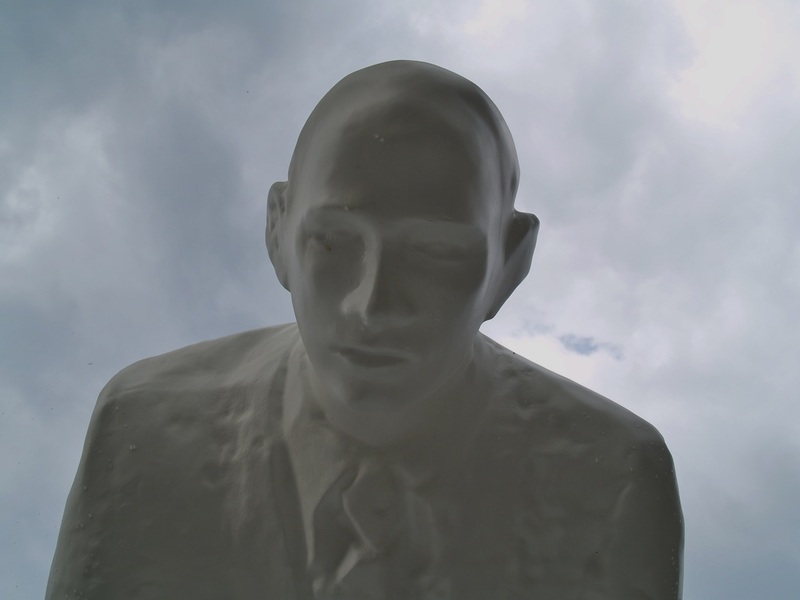 There are about 30 large fibreglass dinosaurs and prehistoric creatures to be found. 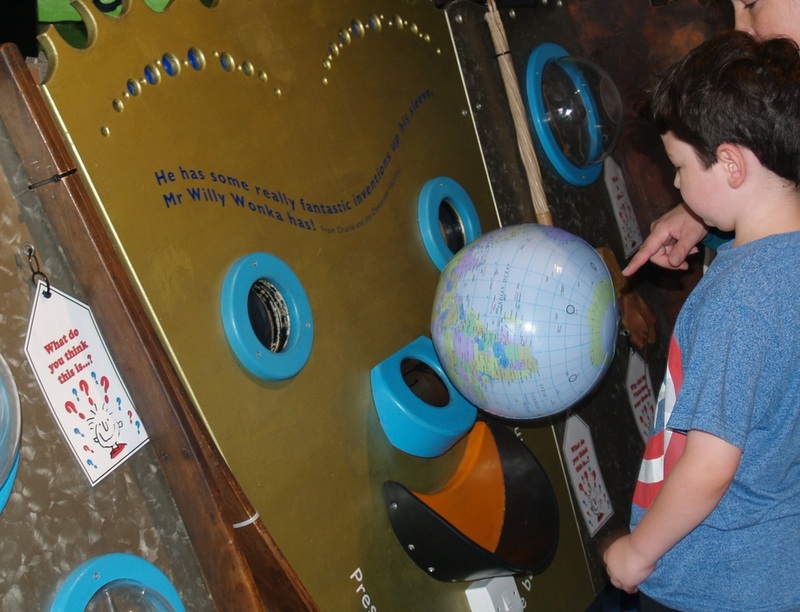 All have information boards about them and there is also a chalk board to draw on and a sound machine which you turn to make the sounds of some of the creatures. 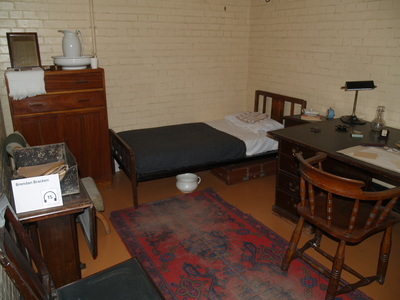 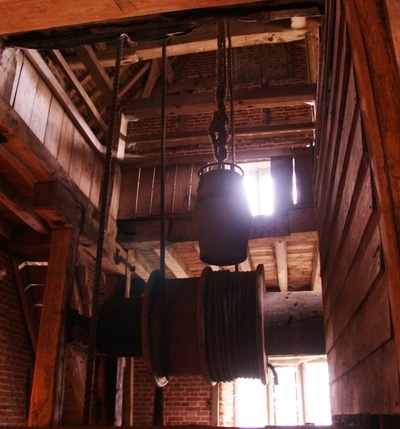 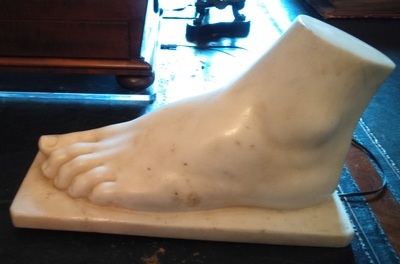 You can tour round the house itself with a guide. 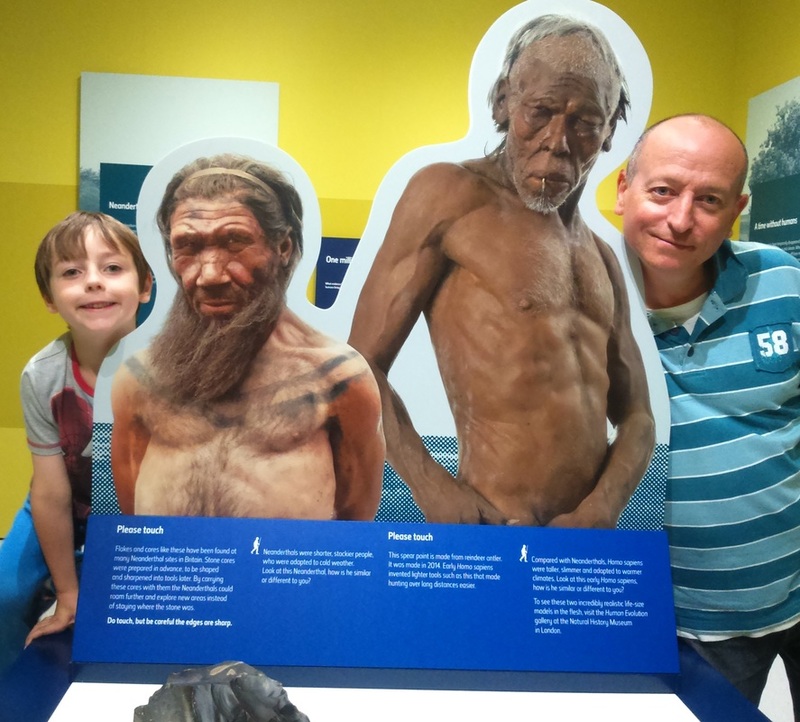 Les has done it before and found it interesting but I think the tour is designed for adults or older teens as both boys found it a little dull. In this area there is also a cafe and restaurant and a shop. We then headed to the adventure playground. 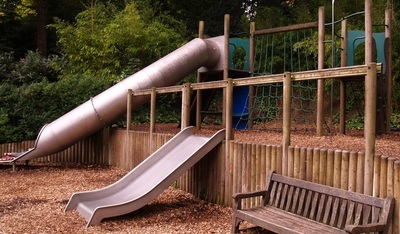 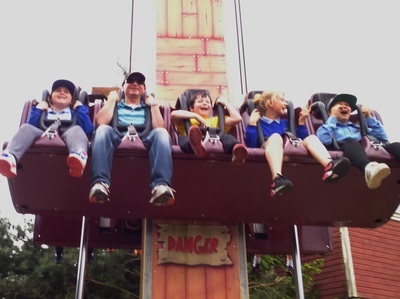 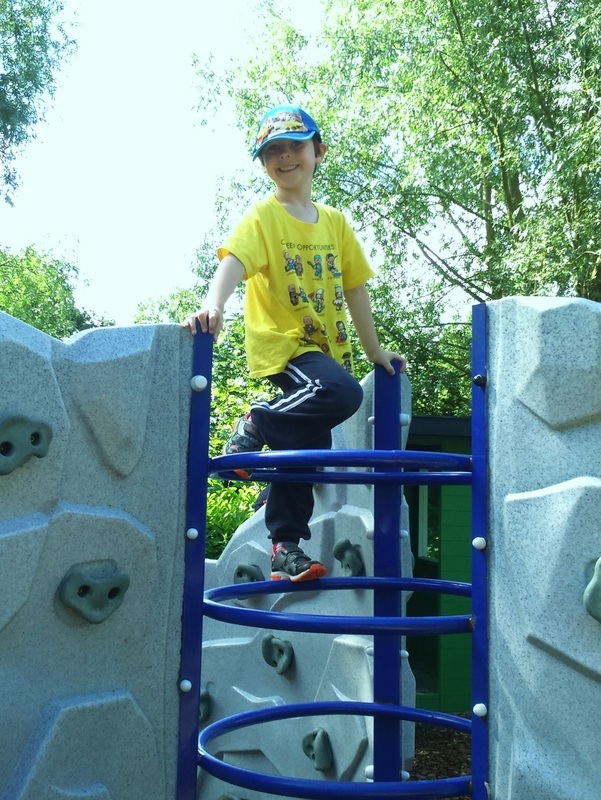 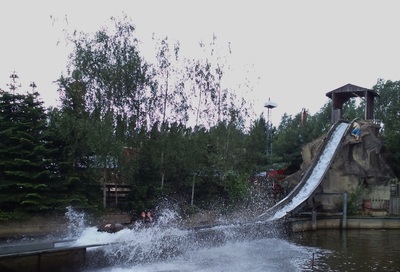 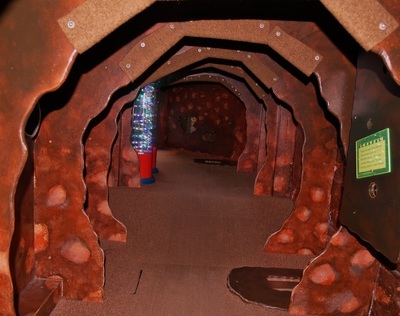 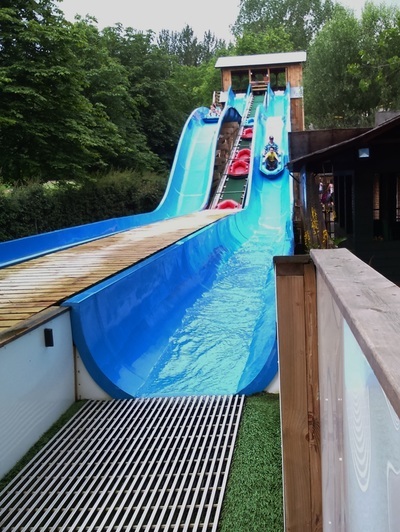 There are things here for all ages, like a water play area, obstacle courses, a bouncy castle, a wooden fort with climbing equipment, zip wires and swings and various other apparatus but one of the main draws in the play area are the astro slides. 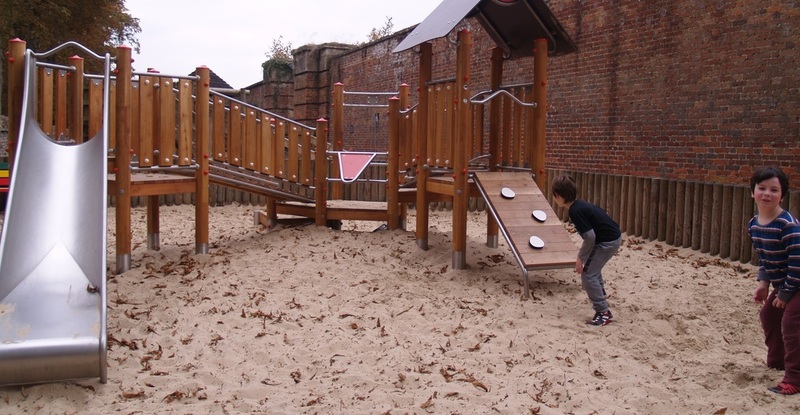 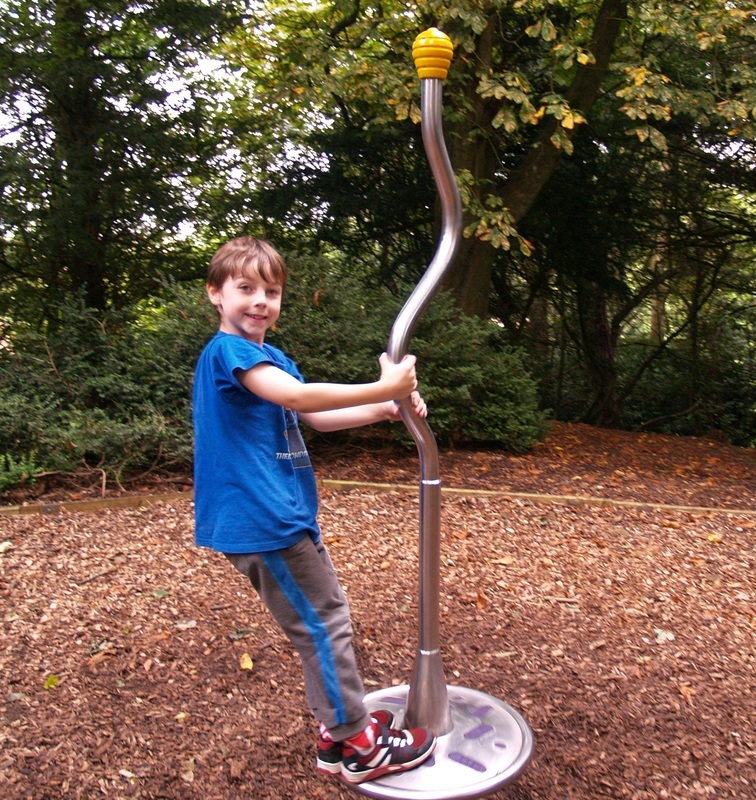 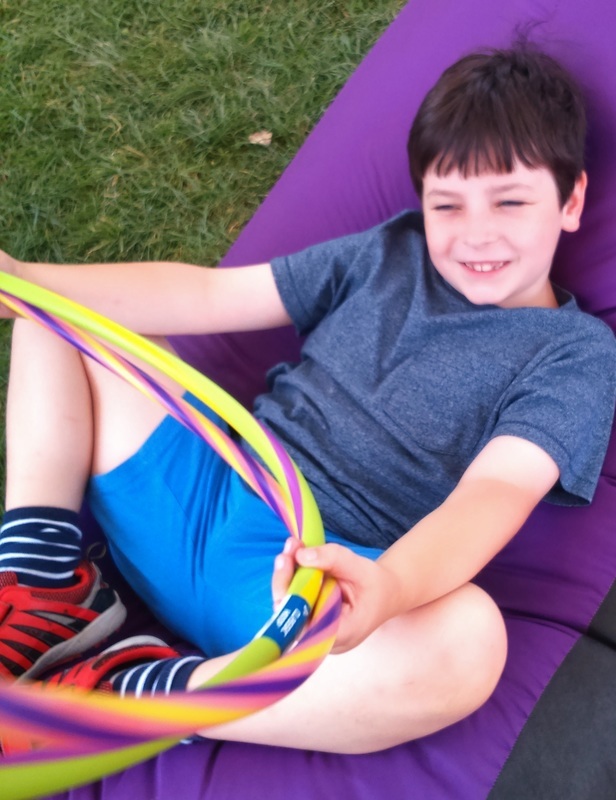 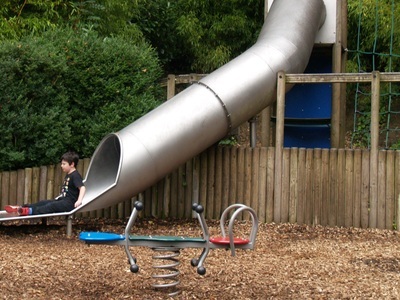 There are three types, a slower more gradual astro slide which is suitable for all ages and then a spiral slide which is very fast and has a slight drop so suitable for slightly older children and finally a "deat hslide" which has a vertical drop. 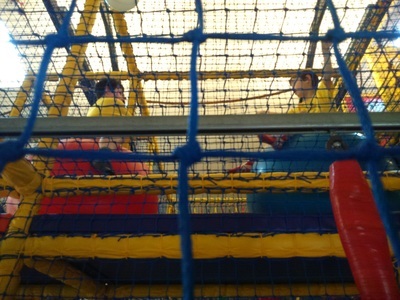 All of these have staff supervising at the top of the slide to make sure children are correctly in their mats. 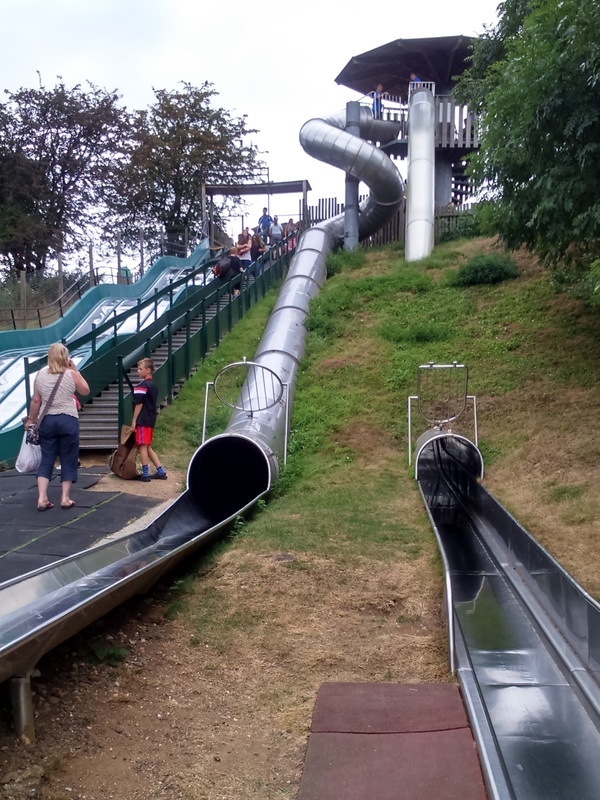 The slides are always a big hit with my two. 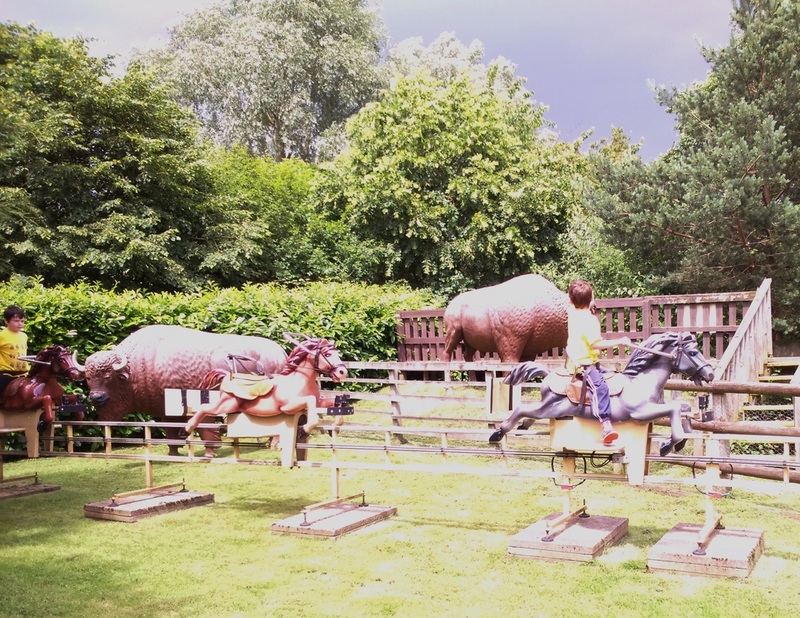 Knebworth has something for all the family and I would highly recommend it. 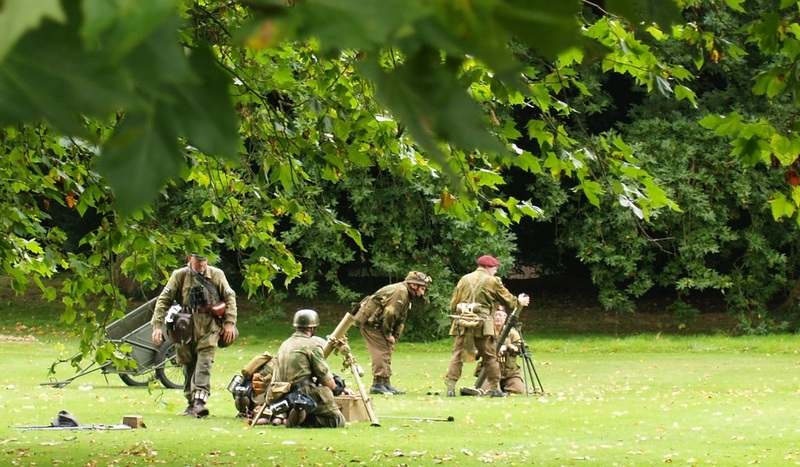 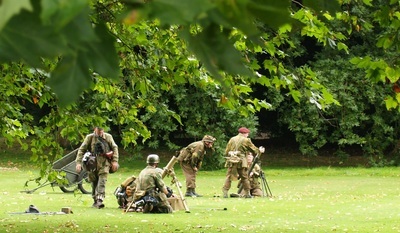 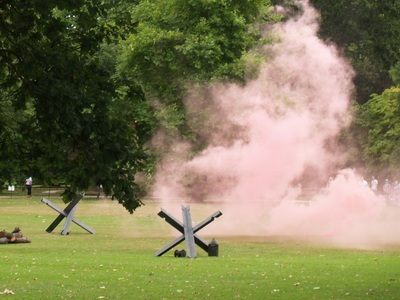 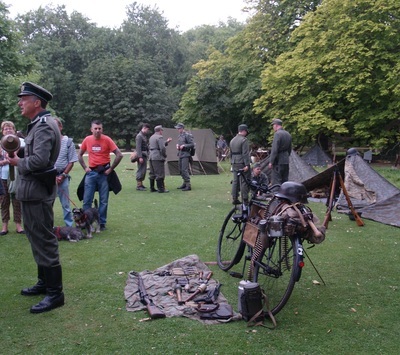 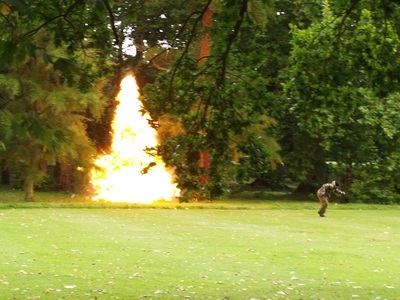 Over this bank holiday weekend Audley End which is an English Heritage property in Essex had a World War two event on. 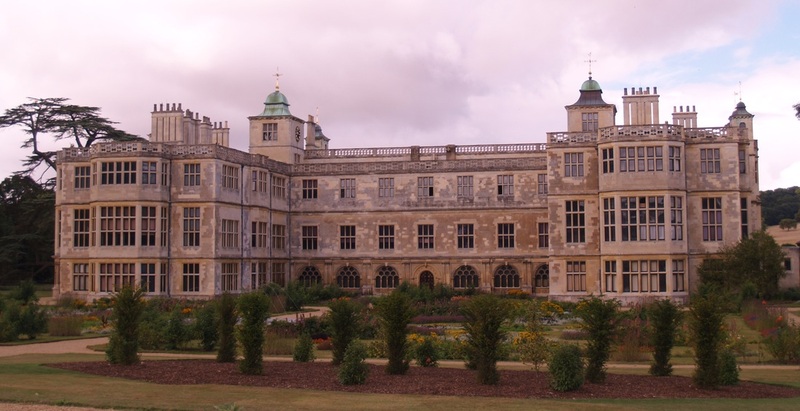 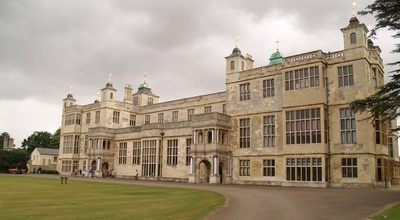 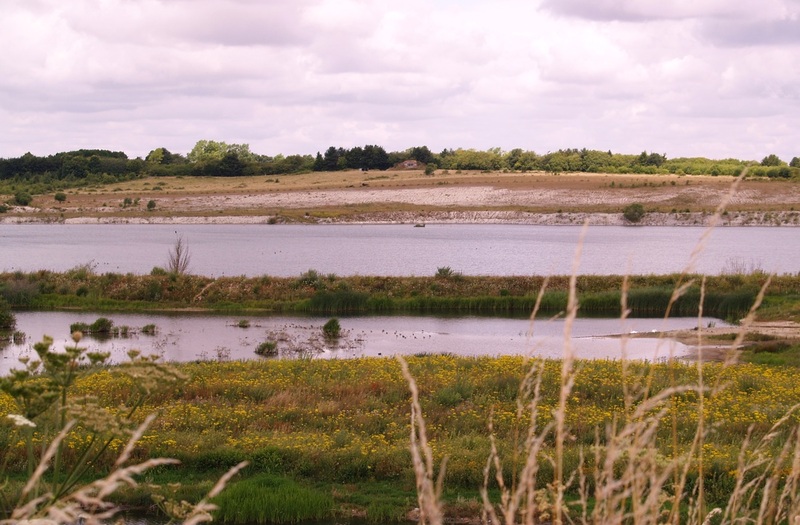 Audley End is close to the Essex/Cambridgeshire border and is well signed. 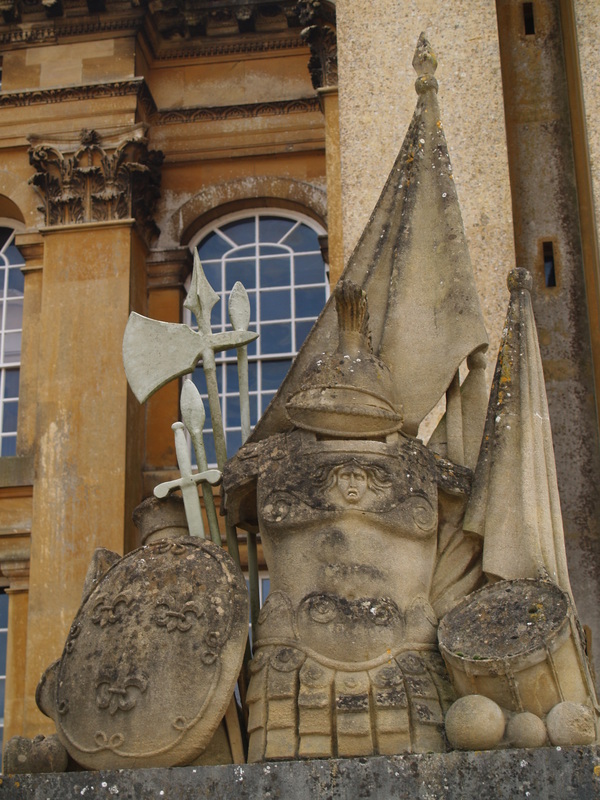 The house itself is interesting with stuffed animals, shell and fossil collections, and lots of paintings and weaponry on the walls. There are formal gardens to the back of the house and the rest of the gardens is parkland designed by Capability Brown which covers acres of the surrounding landscape. 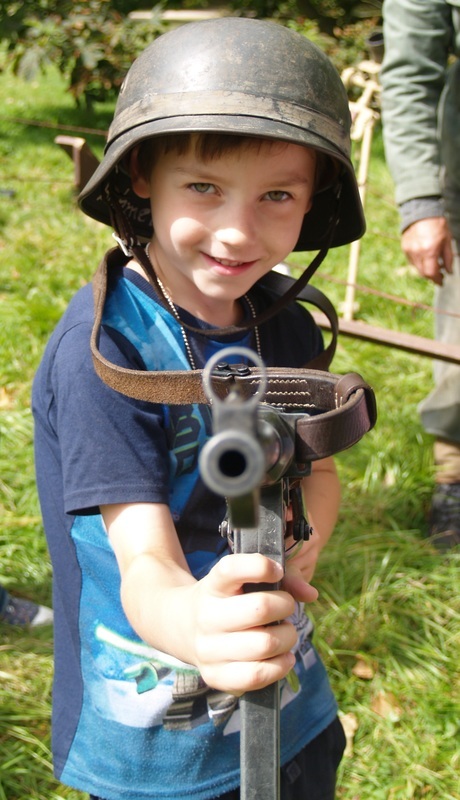 This weekend they had various activities on linked to the war which included demonstrations of guns and grenades, military vehicles that children could sit in, parachuting demonstrations and a reenactment of the storming of a bridge complete with explosions. 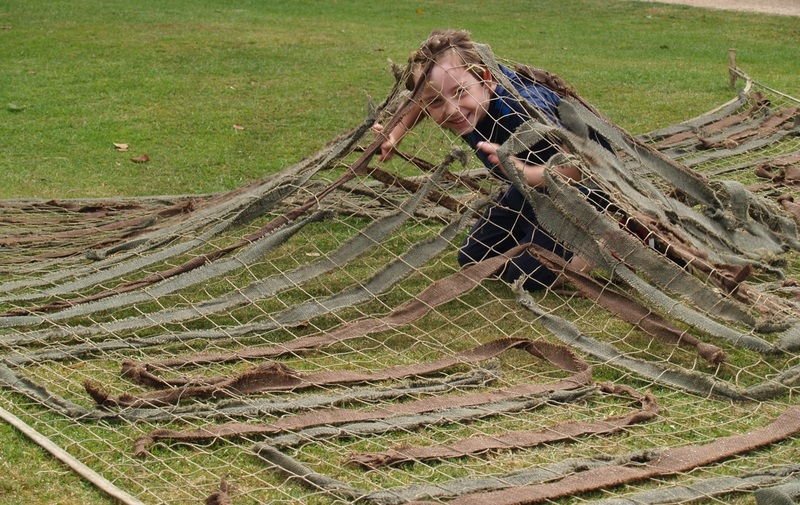 Also there were children's activities such as traditional games like skittles, battleship, hoopla etc and cargo nets to climb under. 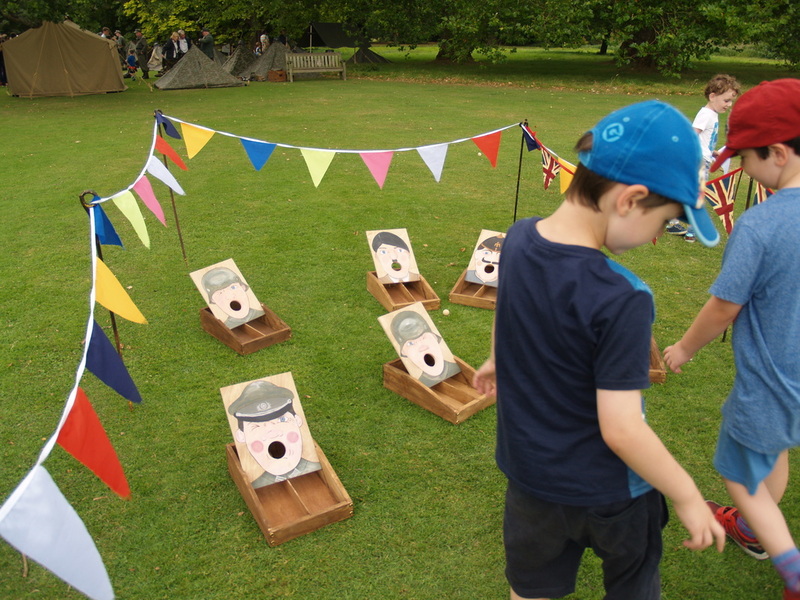 An assault course was also set up for children complete with a very bossy Sergeant Major to put them through their paces. 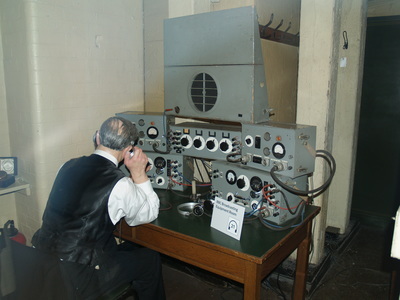 There were lots of re-enactors with equipment you could look at and they were all very welcoming to our questions. 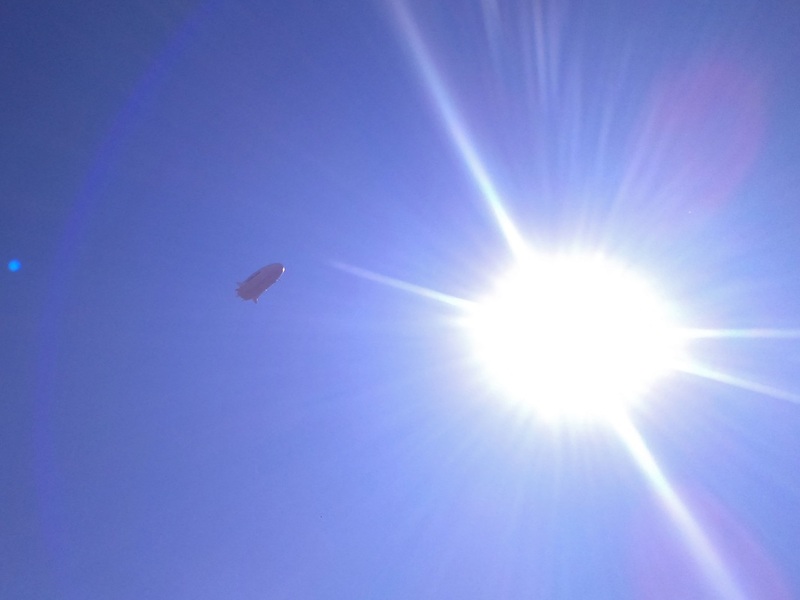 It was a good day out. 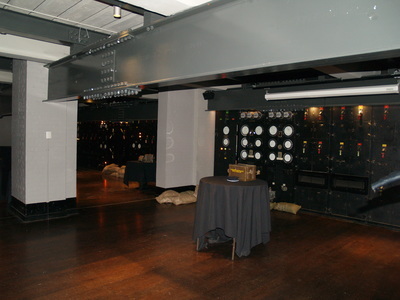 A nice location and an interesting event. 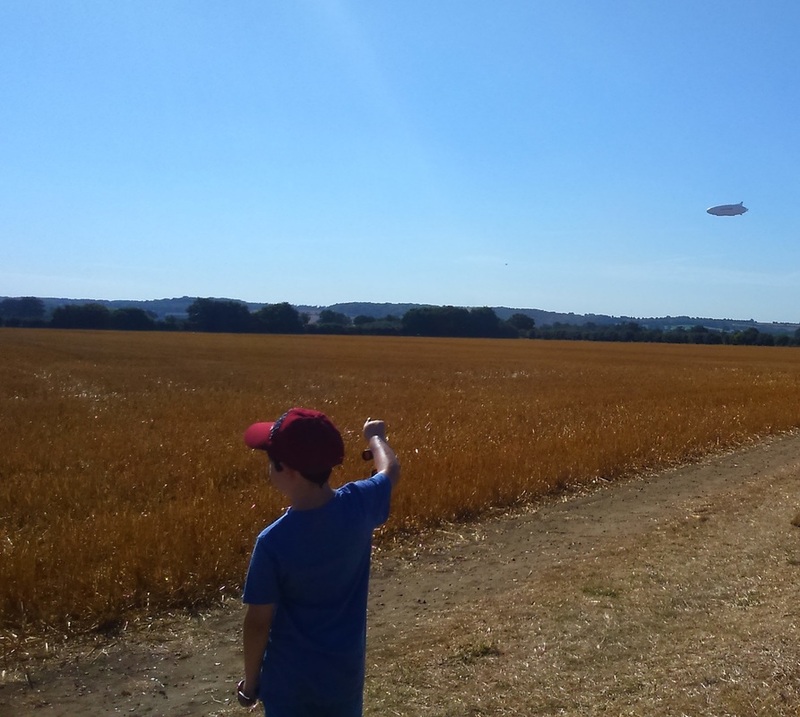 In the north of Bedfordshire is a village called Cardington which is home to two humongous hangers, originally built to house airships in the early 1900's, famously being home to the R101 Airship. 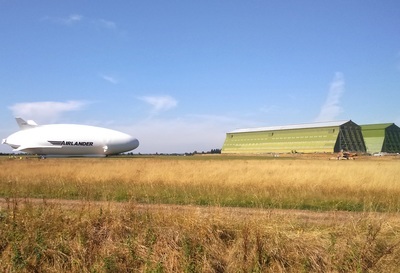 More recently the sheds have been used for filming for Batman, Star Wars and Inception and for tv programmes like Its Not Rocket Science and Top Gear and also music videos such as Rihanna's Shut Up And Drive. 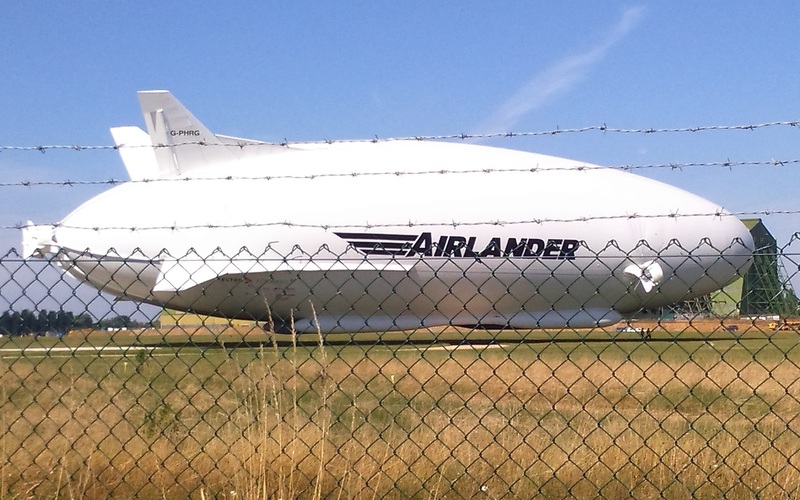 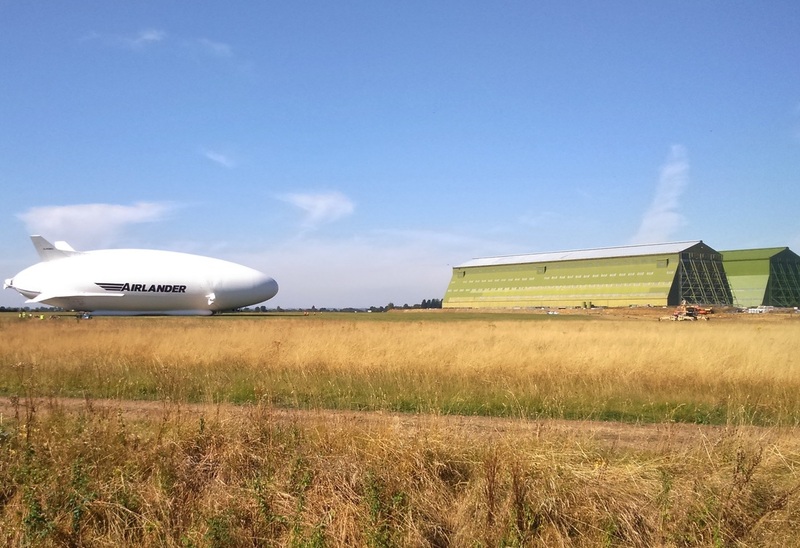 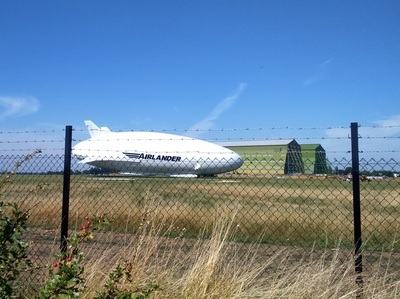 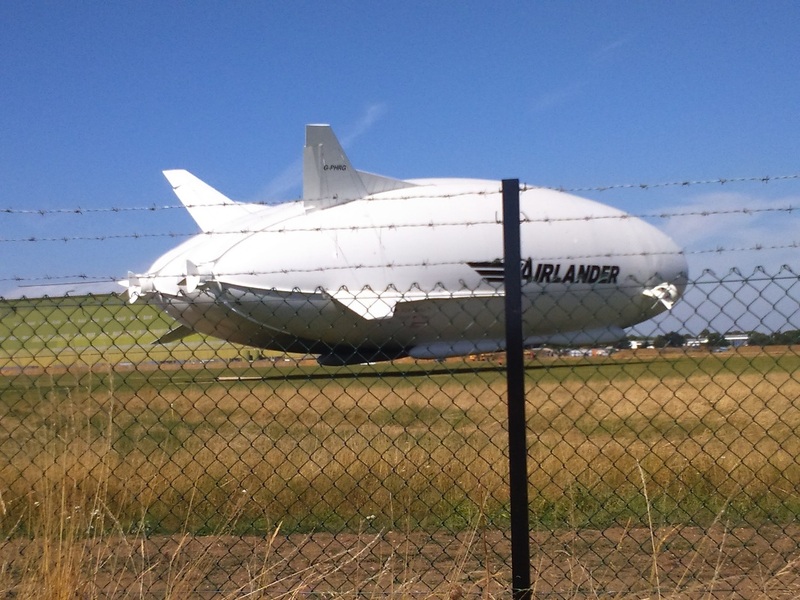 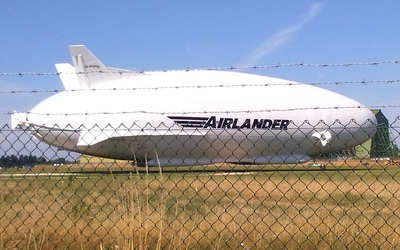 One of the sheds is home to the Airlander 10 a hybrid airship which is currently the largest flying aircraft of all time. 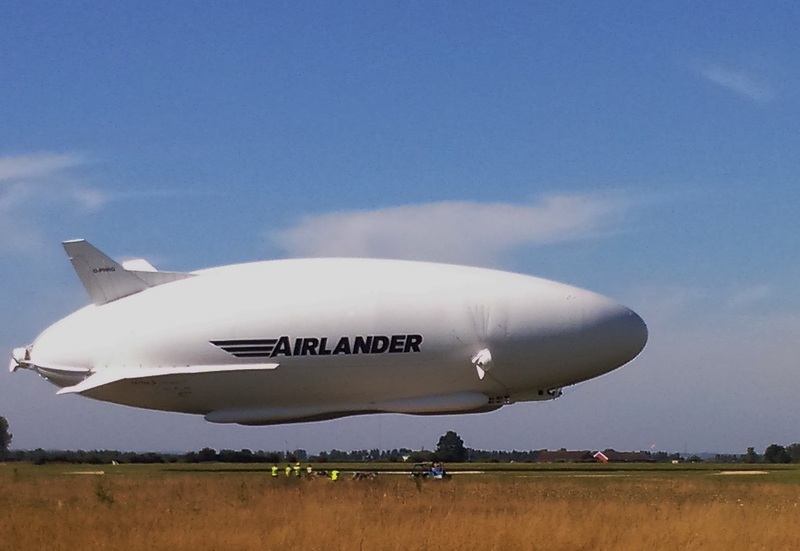 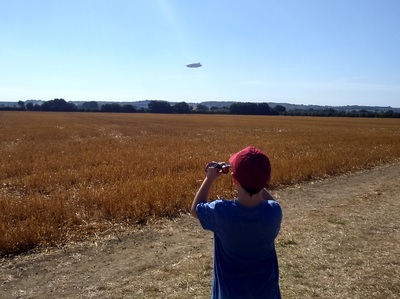 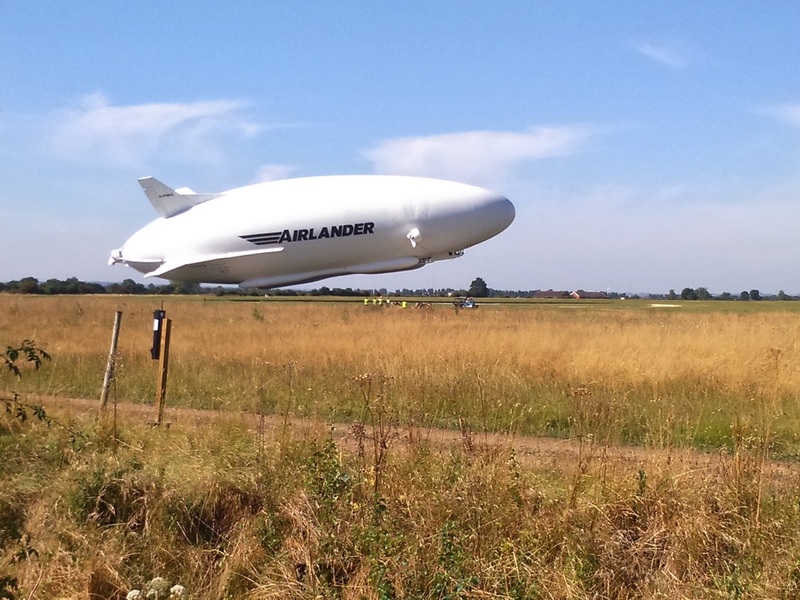 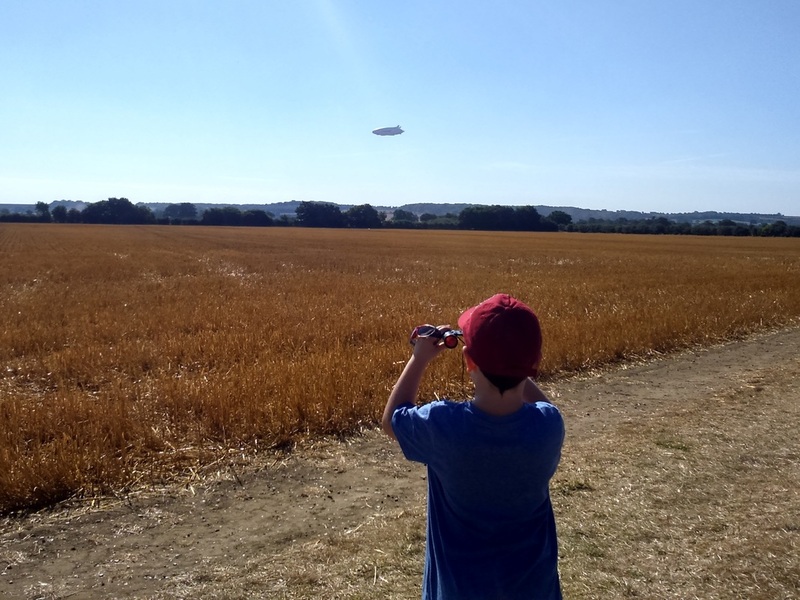 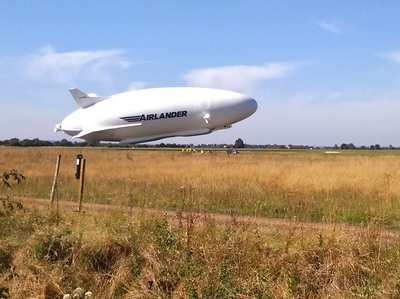 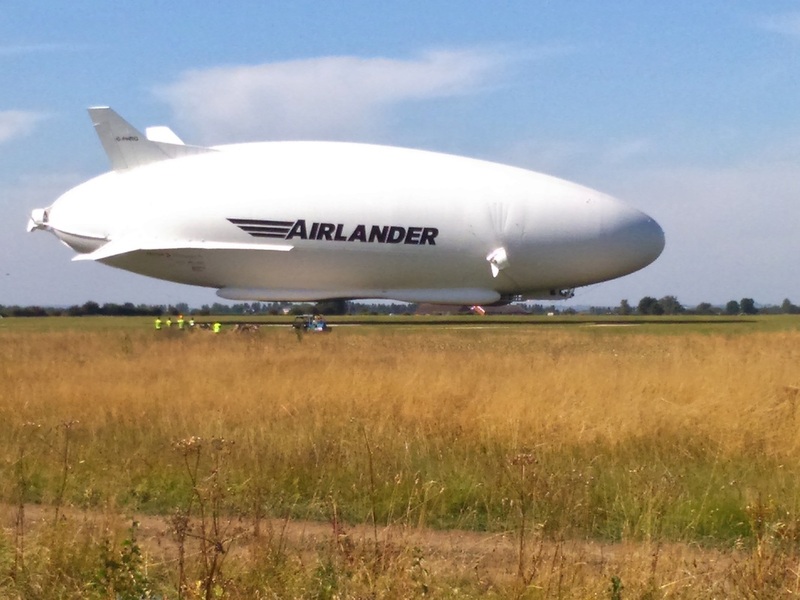 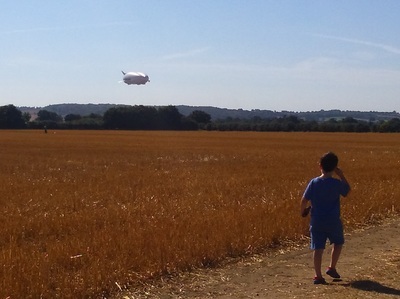 Last week the Airship made its maiden flight and today we found out that it was undertaking another test flight so we headed over to Cardington to see if we could get a good view of it. 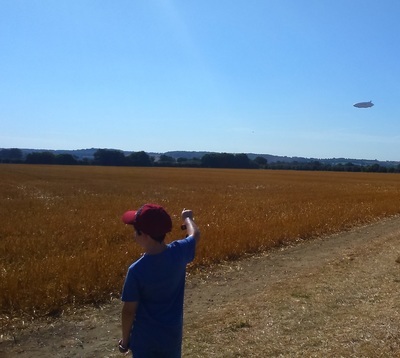 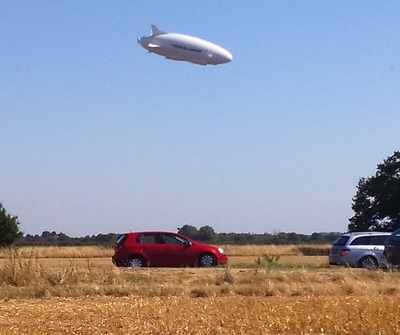 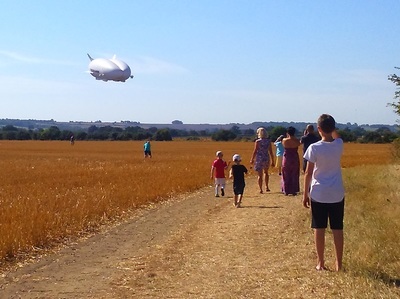 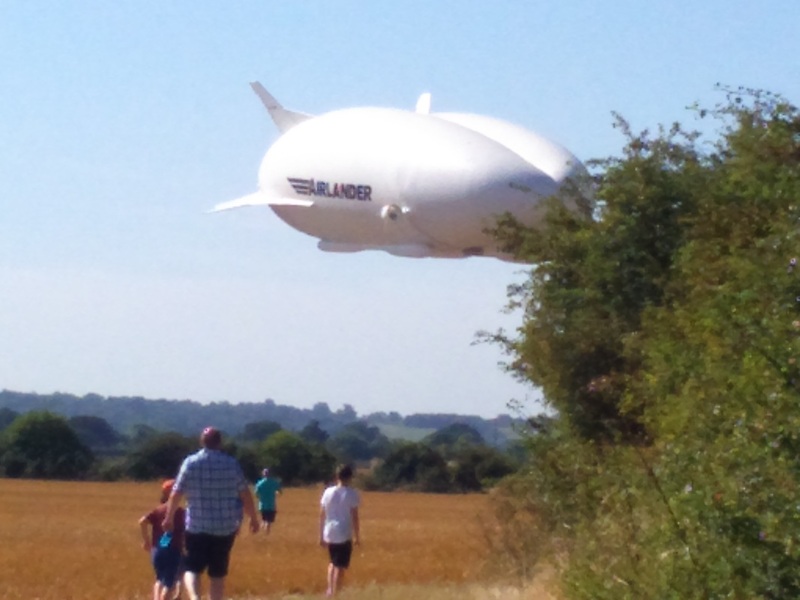 We were very lucky to find a field which was right next to the site and we got a great view of the airship flying, circling and then landing successfully before then taking off a few minutes later for a second flight. Today we visited Ashridge Forest near Tring in Hertfordshire with some friends. 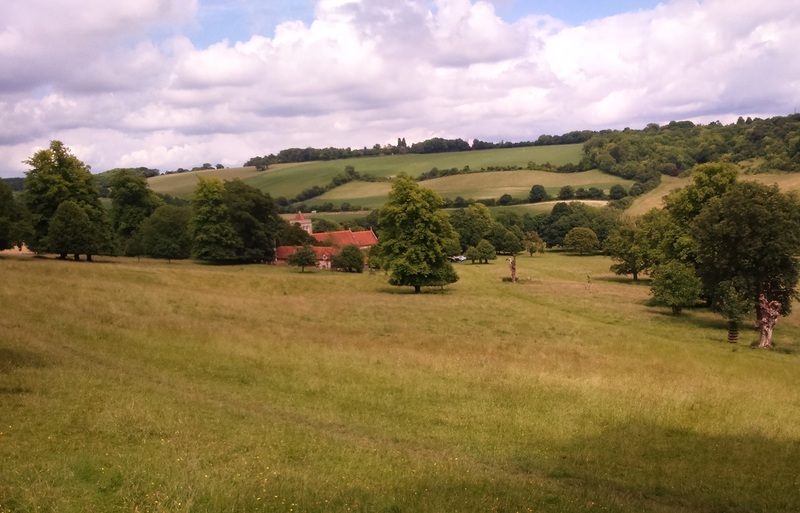 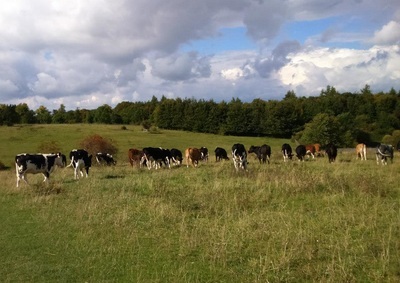 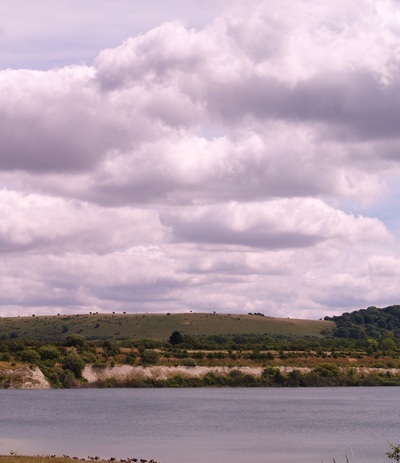 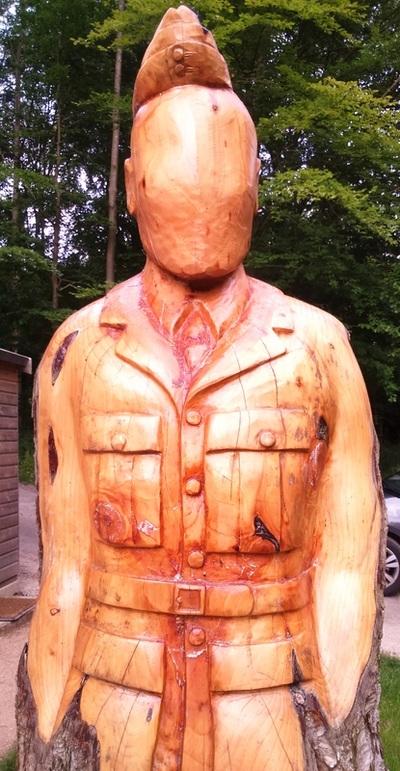 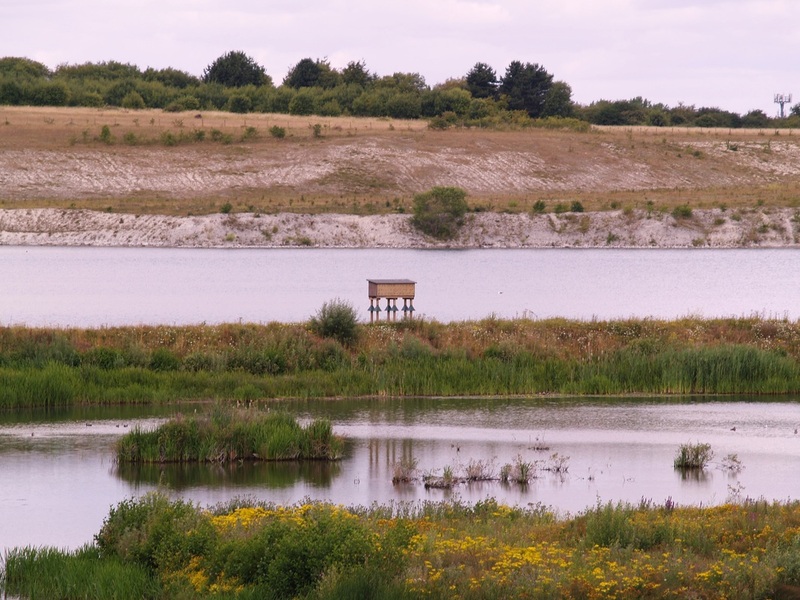 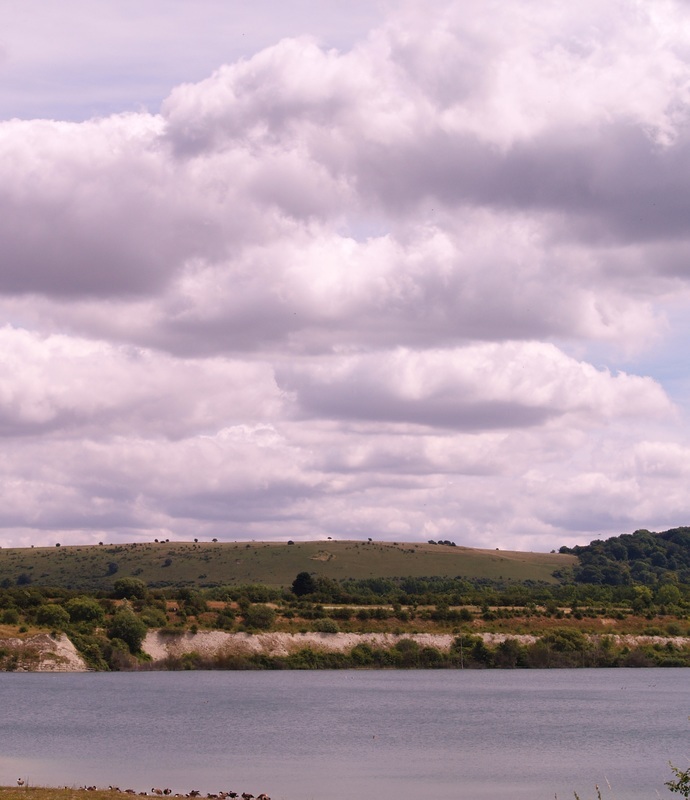 Its free to park and there is always lots of space as it covers over 5000 acres of the Chilterns countryside. 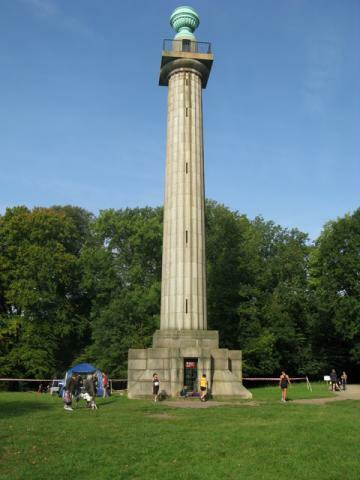 First we headed to see the Bridgewater Monument which is the first thing you notice when you arrive. 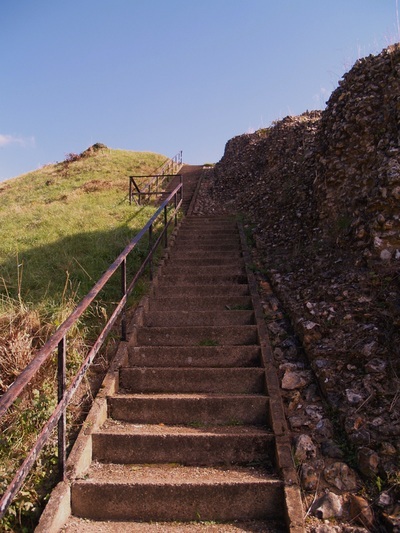 You can climb to the top via 172 steps and it has far stretching views including towards London. 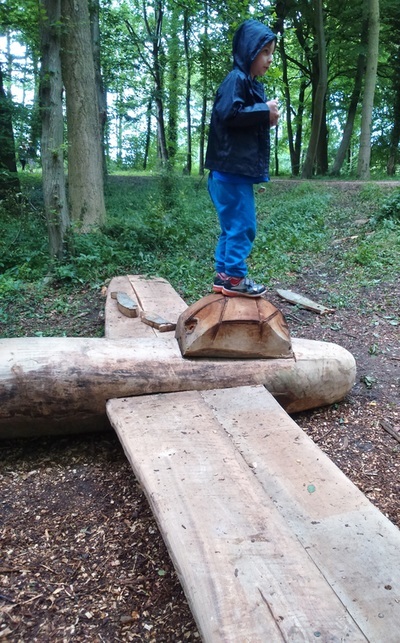 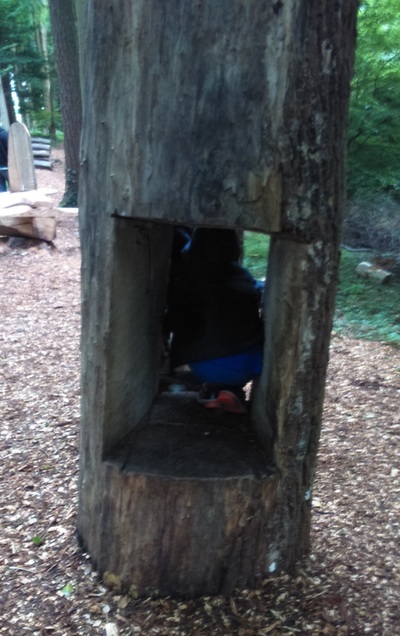 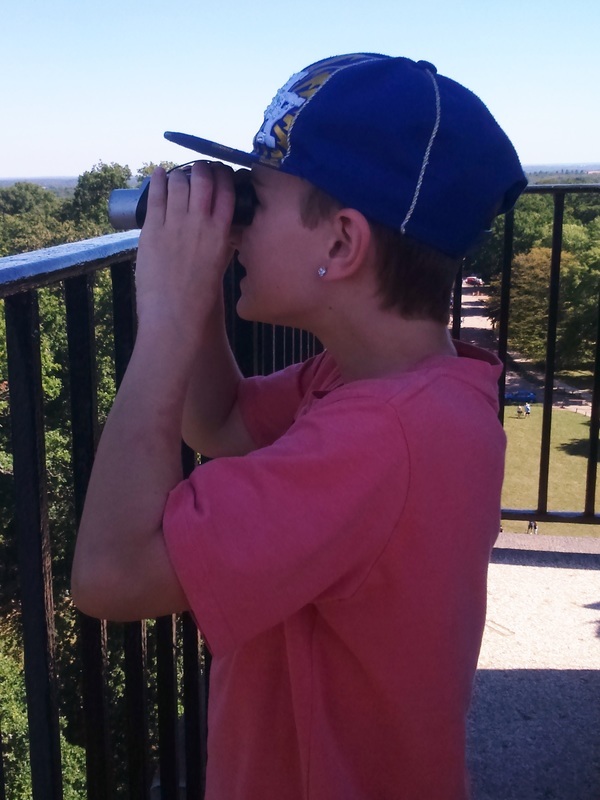 There is a small charge to climb it and the staff gave us some binoculars for the children to use at the top and a spotting sheet so we knew what to look out for. 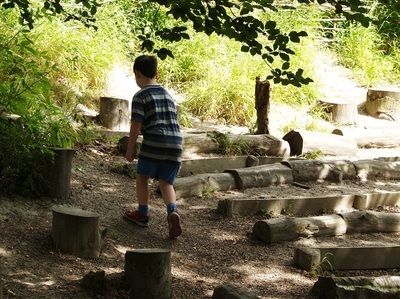 We then headed for a little play area to the left of the monument which had logs etc to climb on and over. 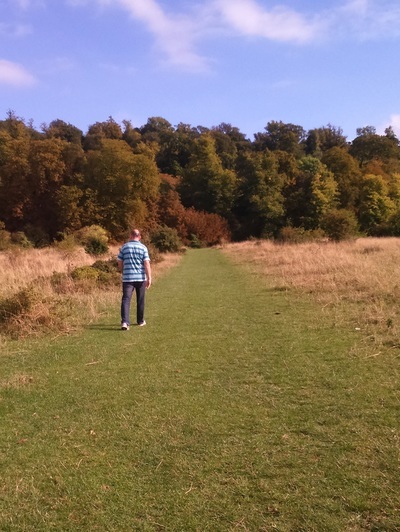 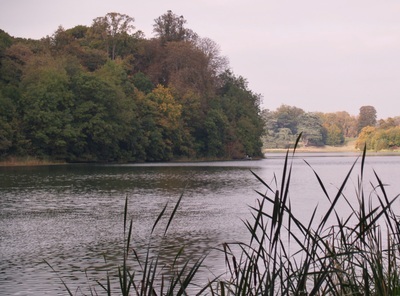 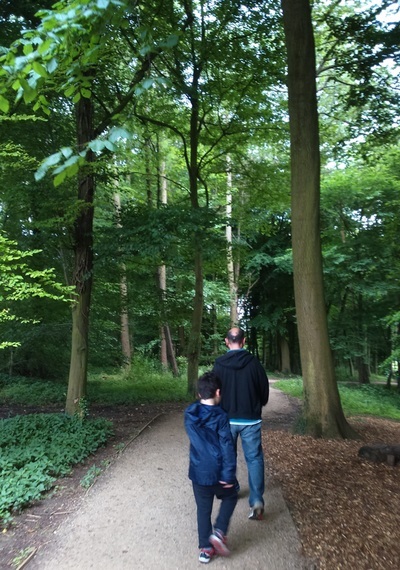 There are lots of different walks that you can do at Ashridge which vary in length from about 1 mile to over 10 miles so it really depends how energetic you feel. 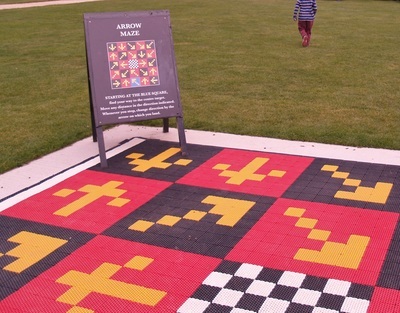 The visitors centre has maps of the different routes. 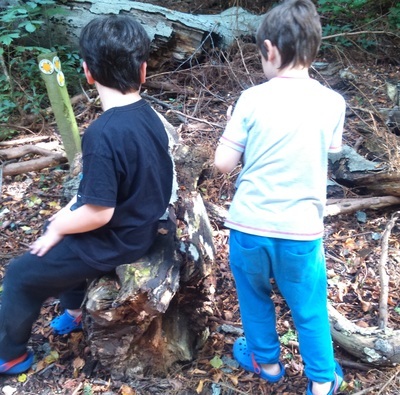 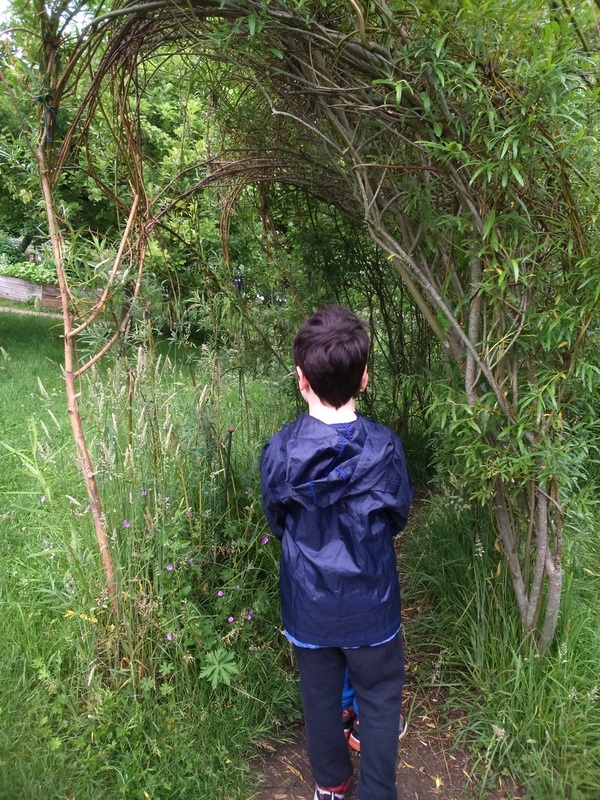 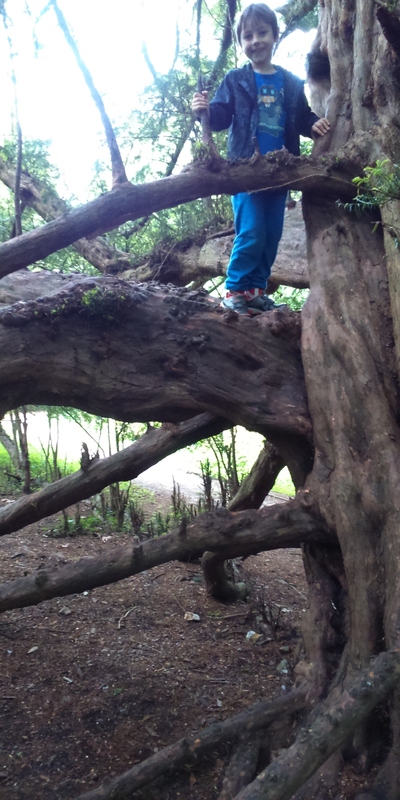 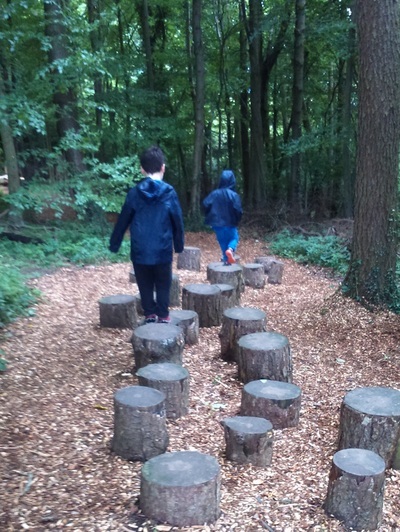 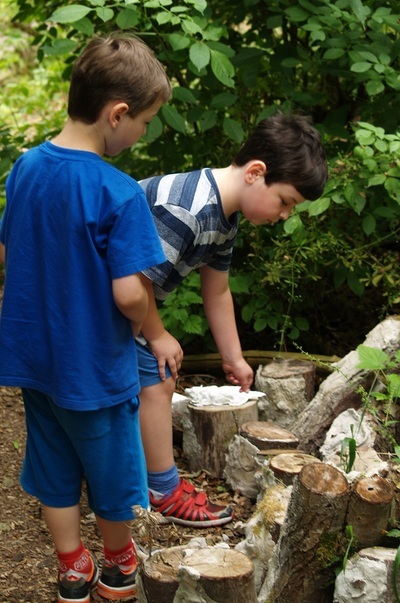 We took the path that circles the meadow and found plenty of dens and things to explore in the woodland. 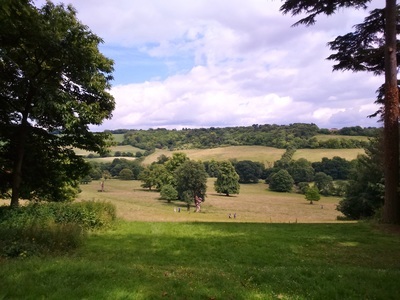 The main meadow and the area in front of the monument have open spaces so are suitable for ball games/ kite flying etc. 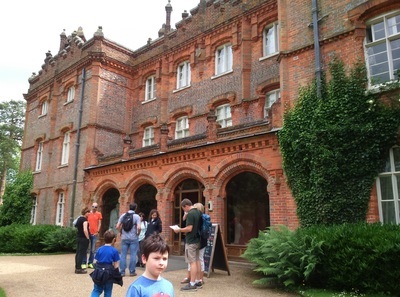 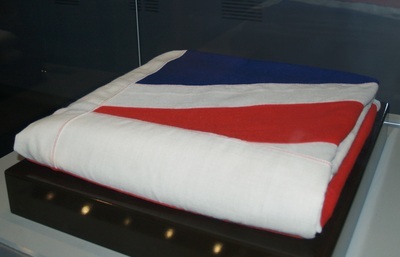 There is also a small visitors centre, shop and cafe near the monument. Ashridge Estate is a 2,000 hectare (5,000 acres) area of the Chiltern Hills with beech and oak woodlands, commons and chalk downlands. 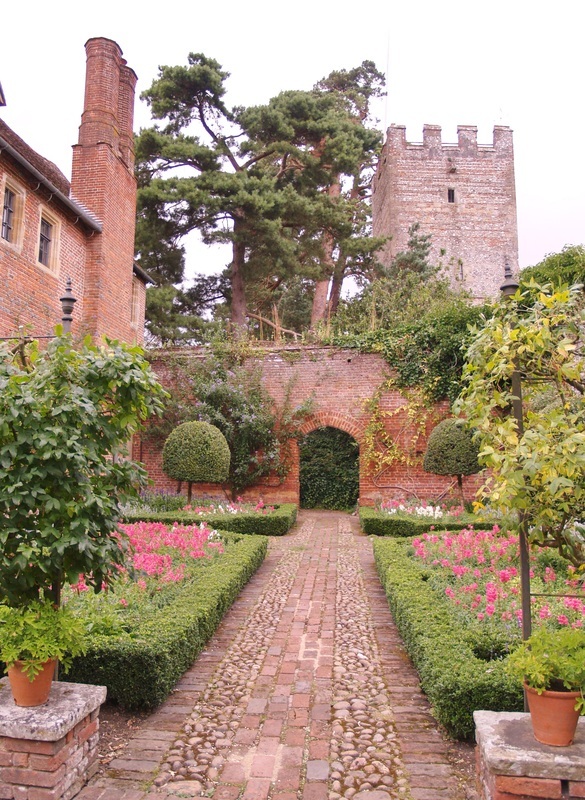 Yesterday we visited Greys Court which is a National Trust Property just outside of Henley Upon Thames. 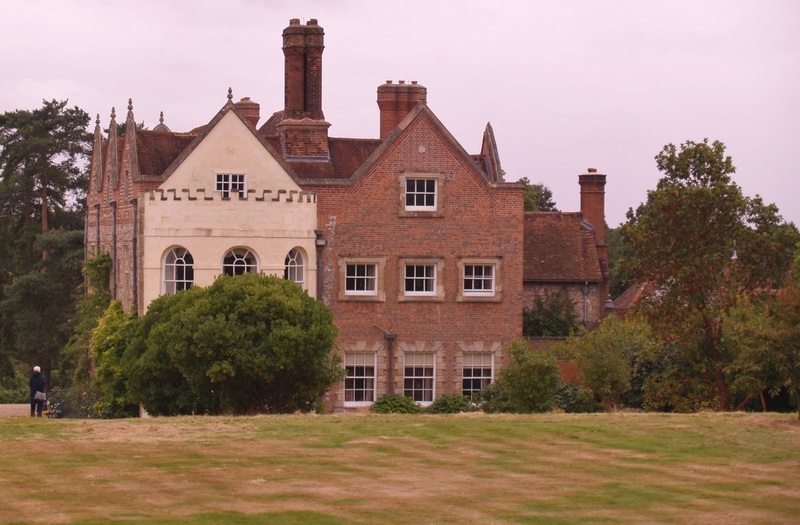 It comprises a medieval castle tower and a Tudor style house and gardens. 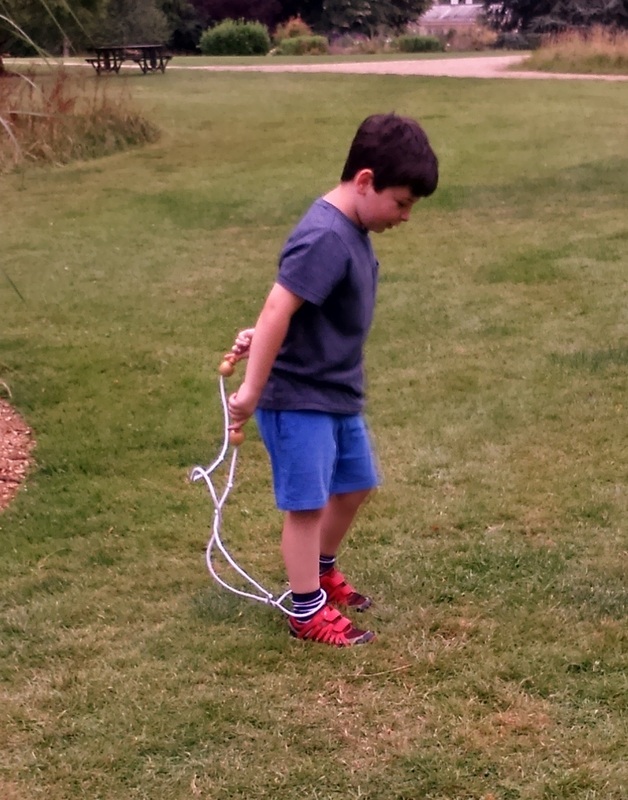 The first thing the boys wanted to discover though was the donkey wheel. 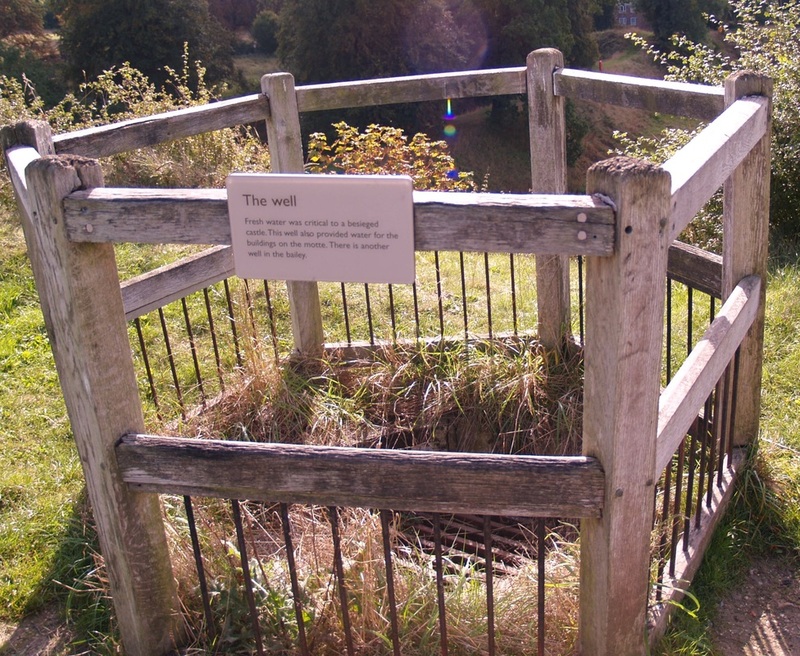 This was basically a massive donkey sized hamster wheel that the donkey would walk around in order to raise water from a well. 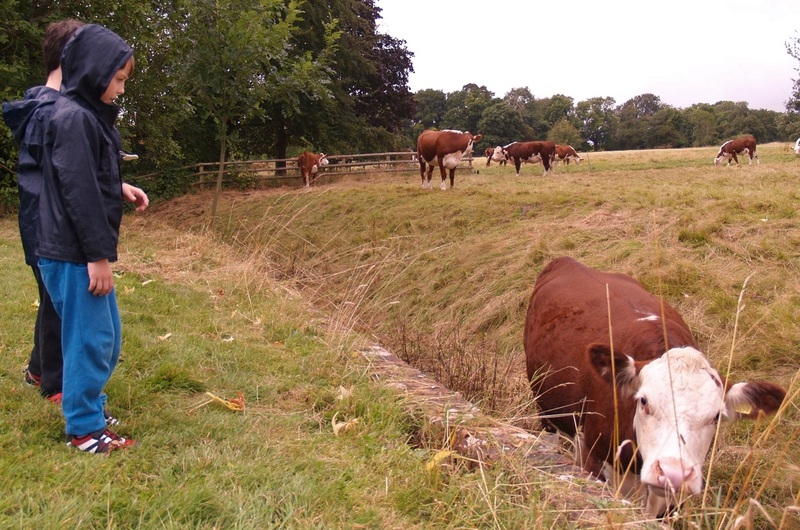 We then headed to the meadows near the house as the boys wanted to see the many Guernsey cows and their calves that were grazing there. 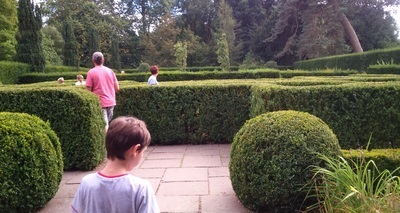 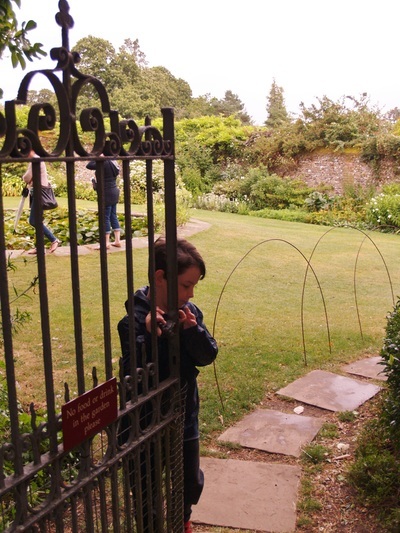 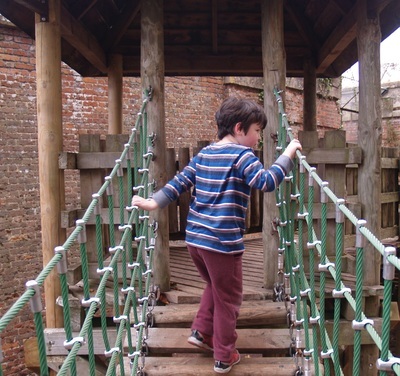 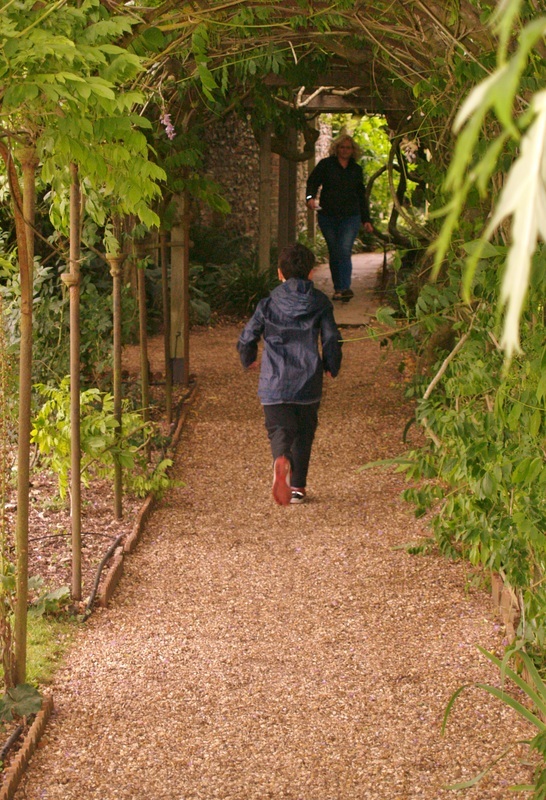 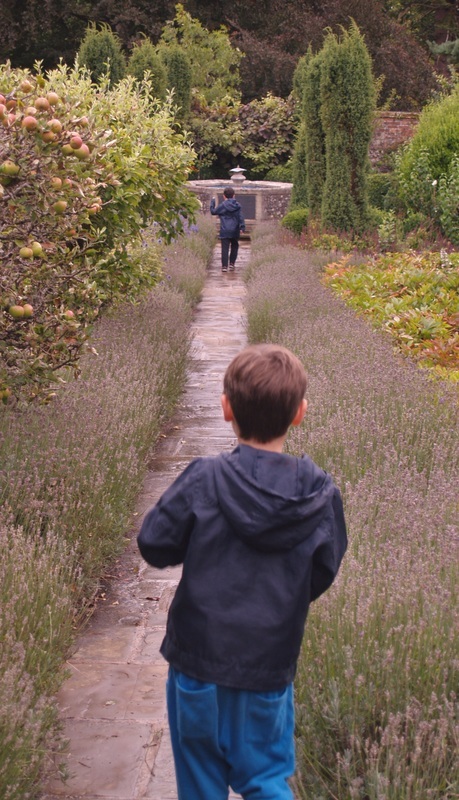 The gardens at Greys Court were split into different areas and there was lots for the boys to explore including tunnels around a wisteria that was over 100 years old and a brick maze. The house itself was interesting and the boys Grandad played the grand piano that was in the main room. 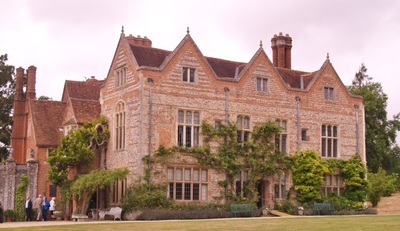 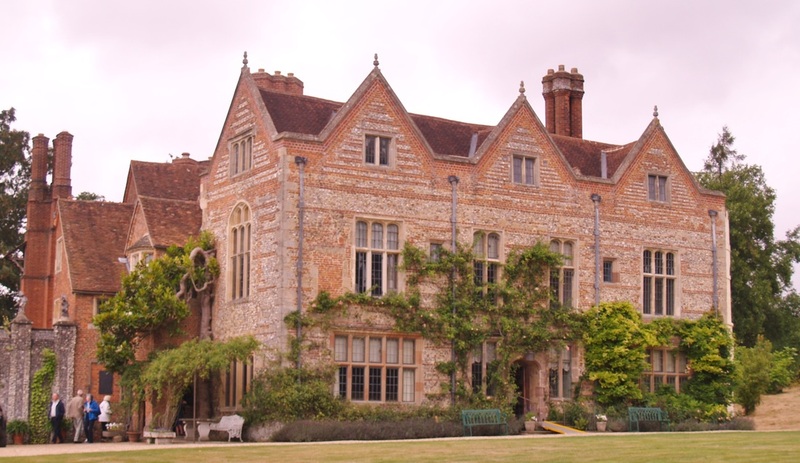 They did have a childrens guide to the house which the boys looked at but the staff were not overly child friendly so I would probably advise sticking to the gardens if you are visiting with younger children. 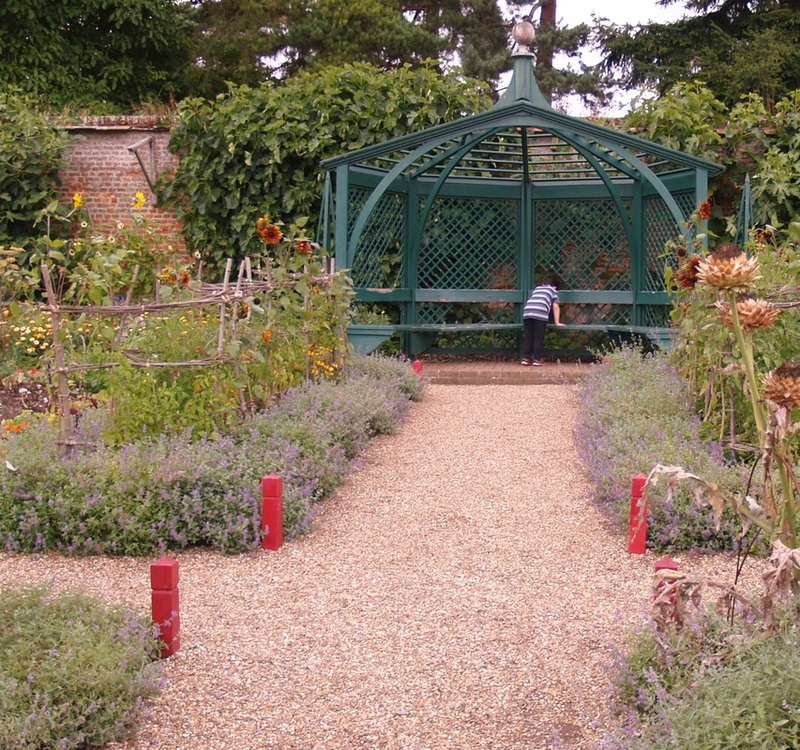 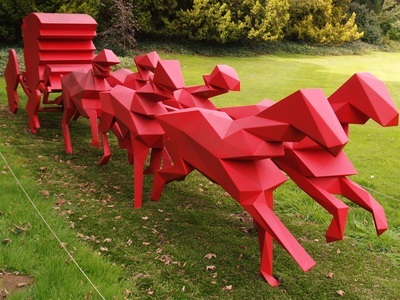 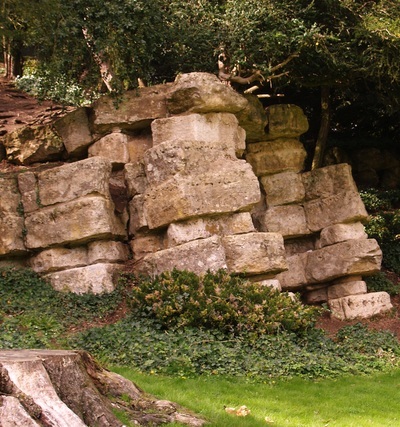 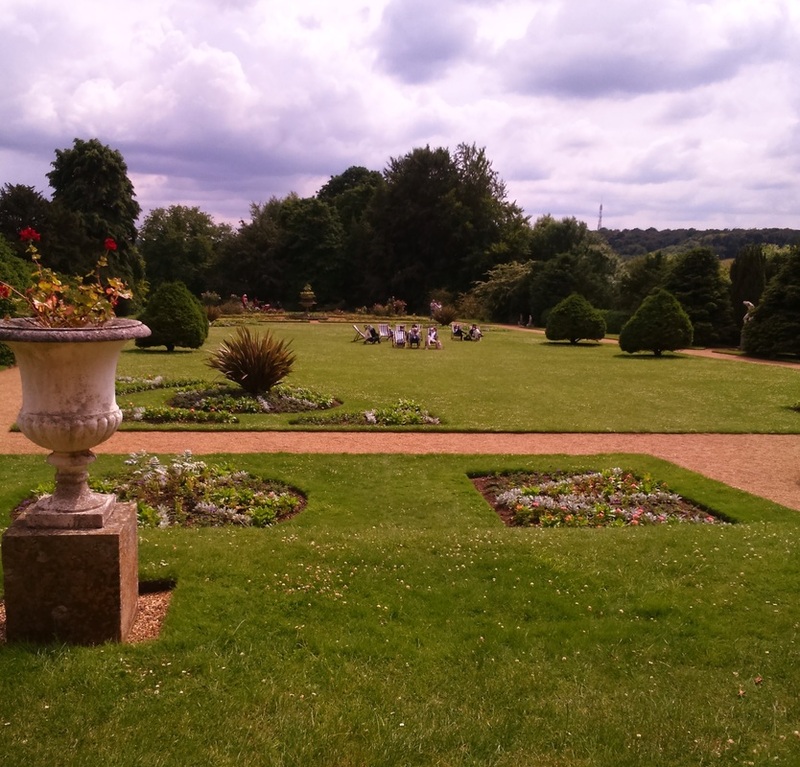 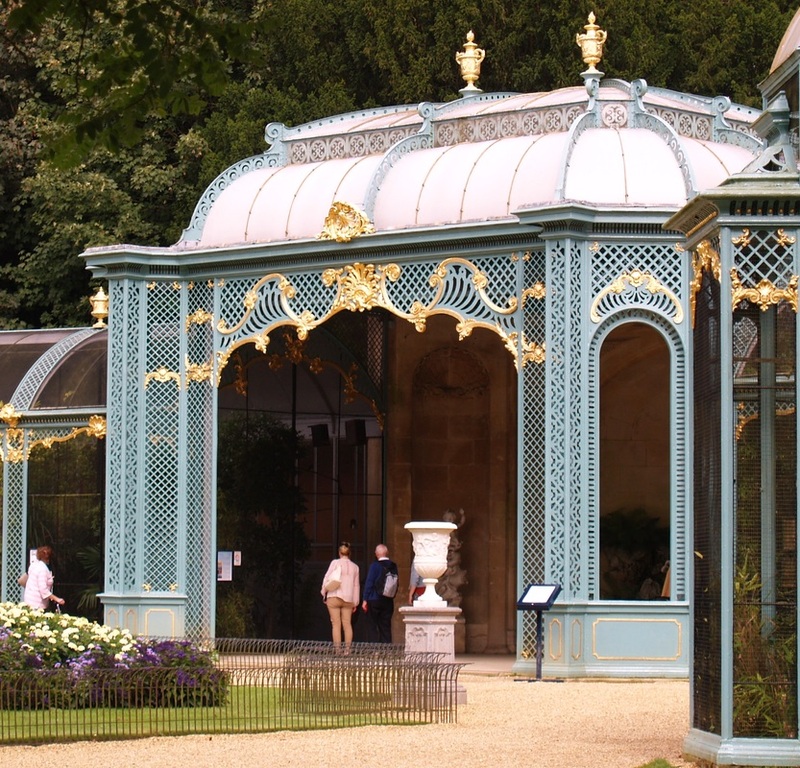 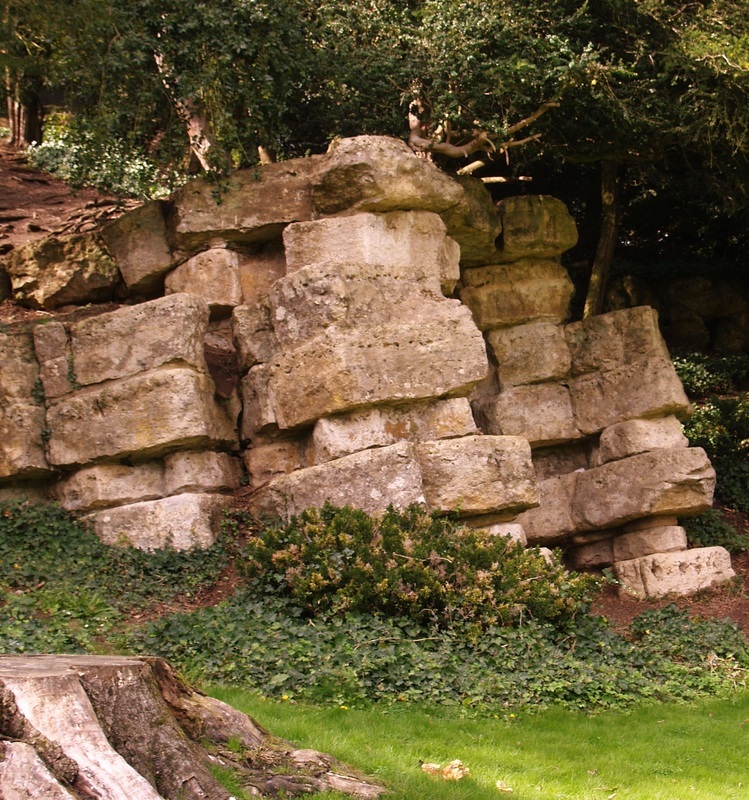 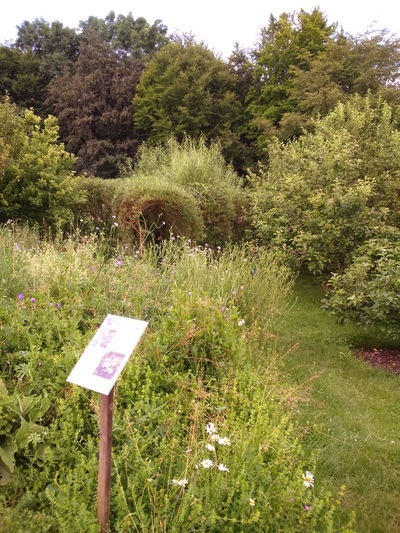 Last Sunday we headed back to Woburn Abbey Gardens, in Bedfordshire which is well signed from both the A5 and the M1. 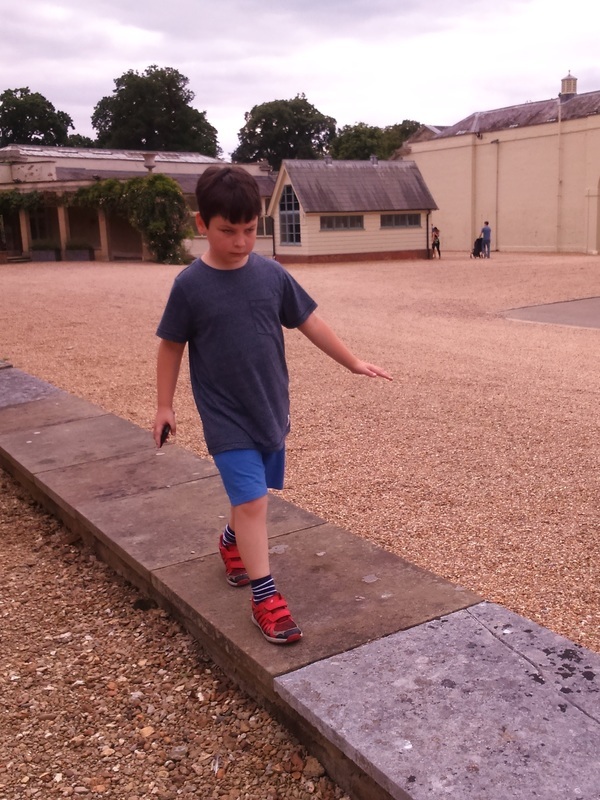 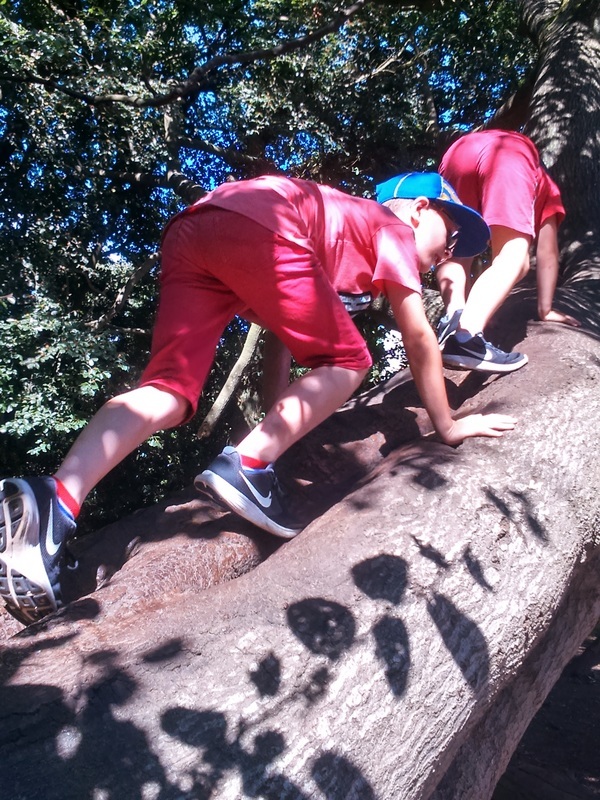 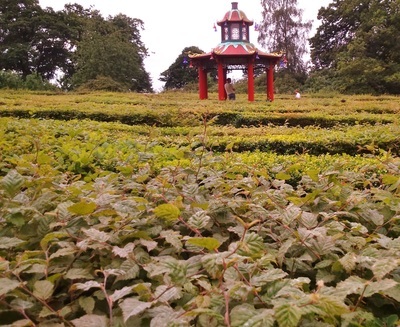 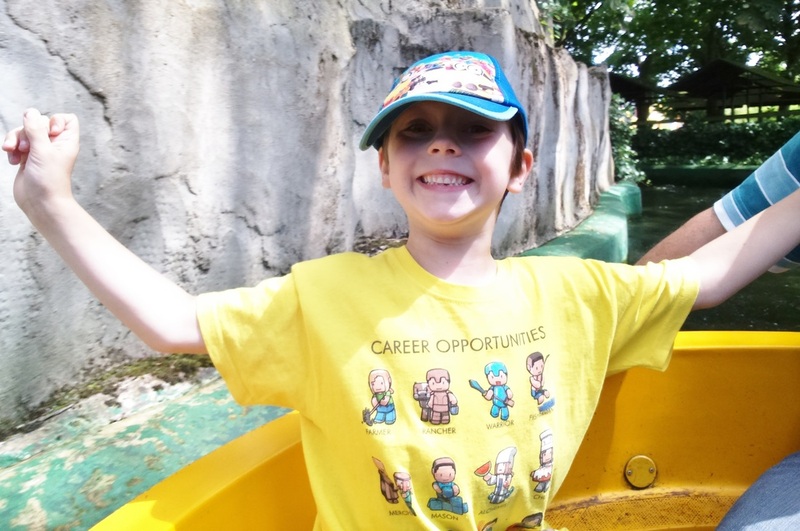 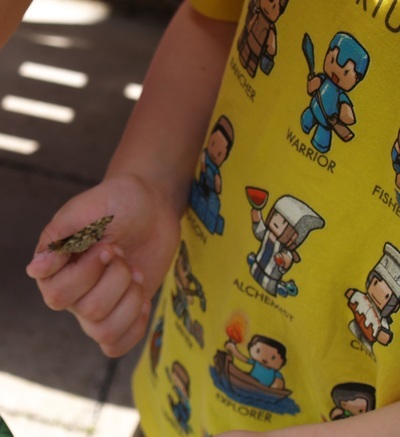 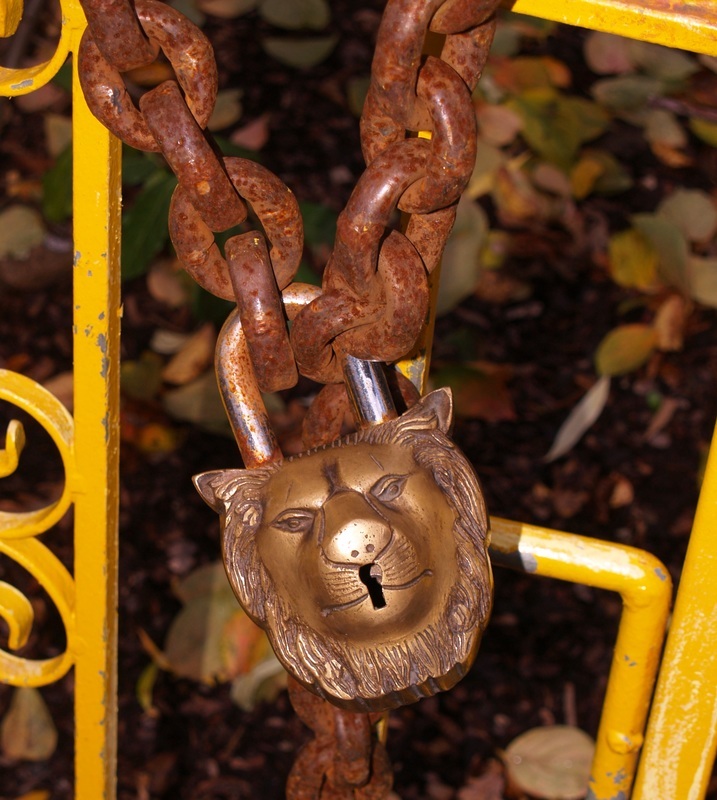 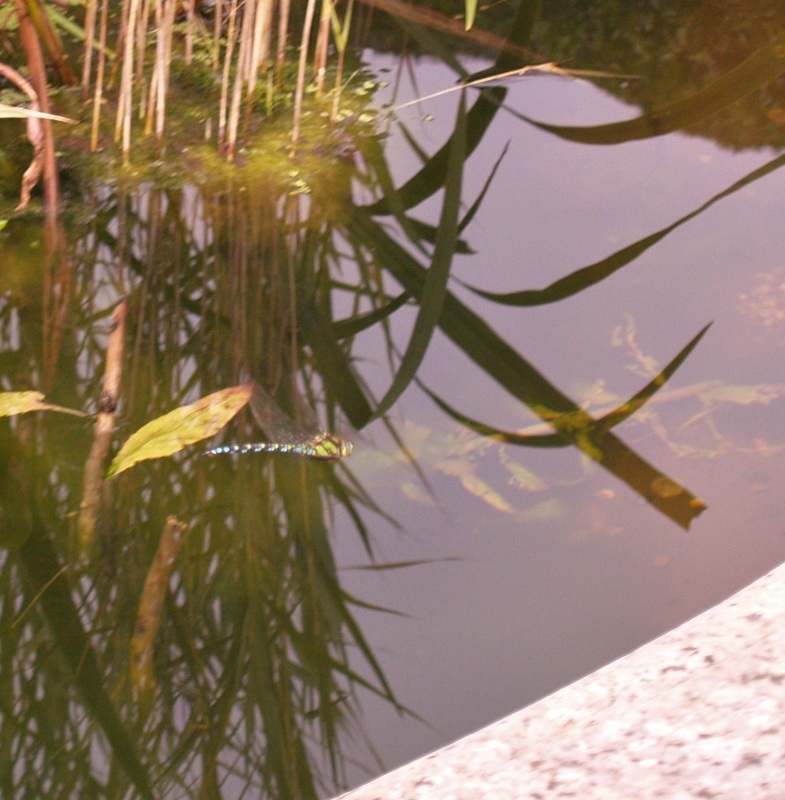 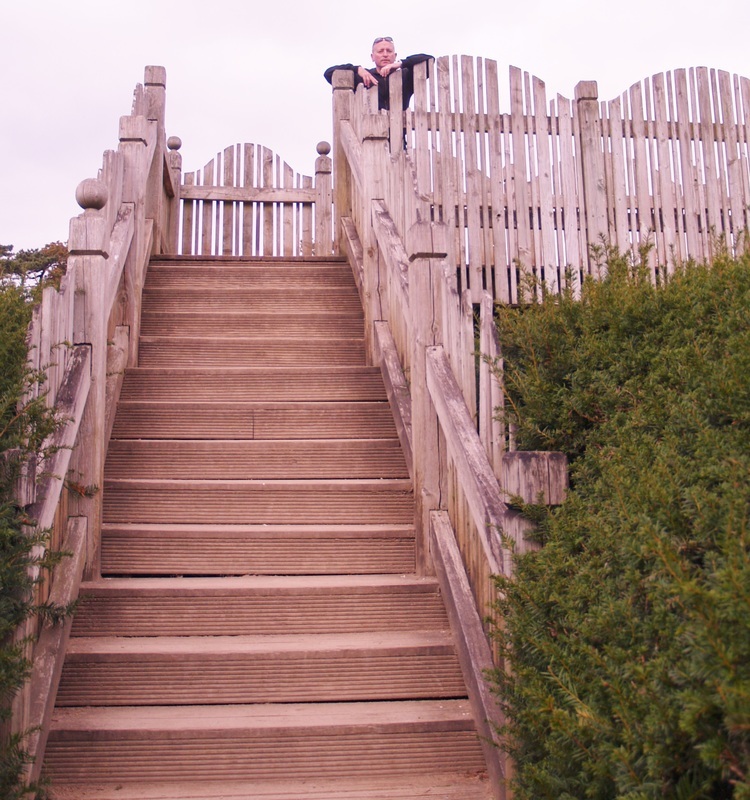 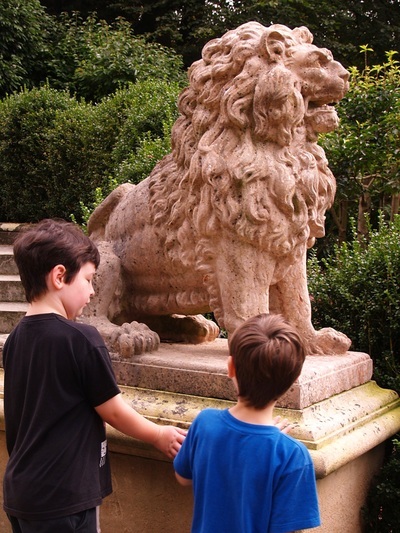 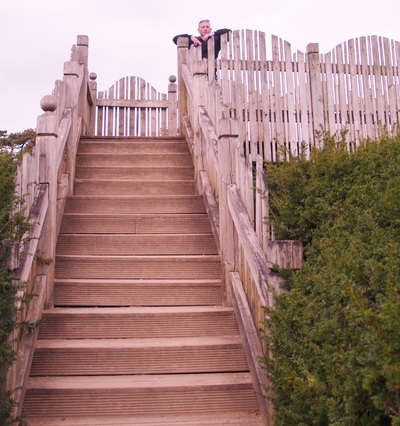 The gardens are really great for exploring as there are lots of different areas including a pond, grotto, aviary, green house, maze and Chinese temple among other things. 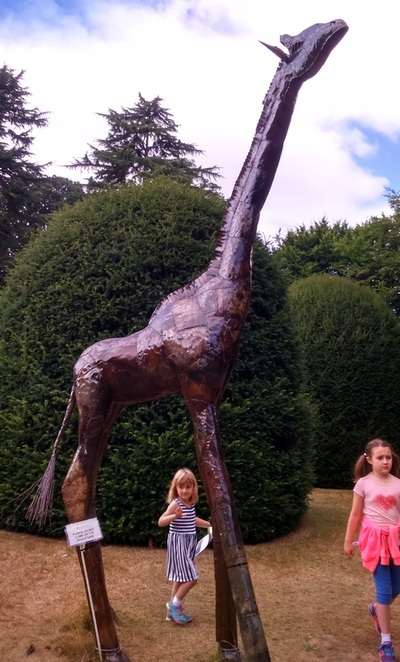 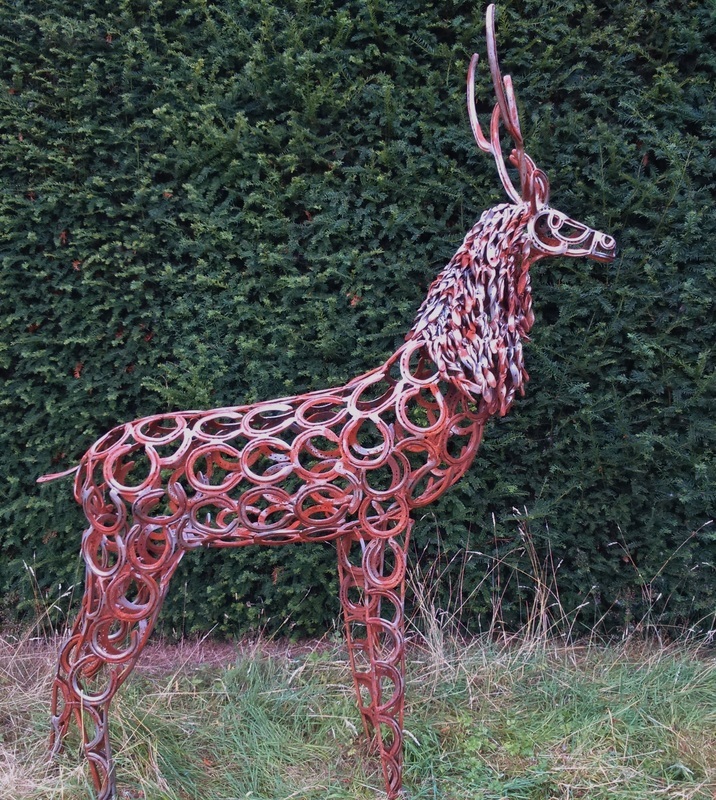 The gardens are lovely themselves but what makes them even better is that to get to them you have to take a drive through Woburn's deer park which is home to over 3000 deer which can be easily seen as you pass through. This time when we visited they had a special trail on which is apparently on for the whole summer holidays. 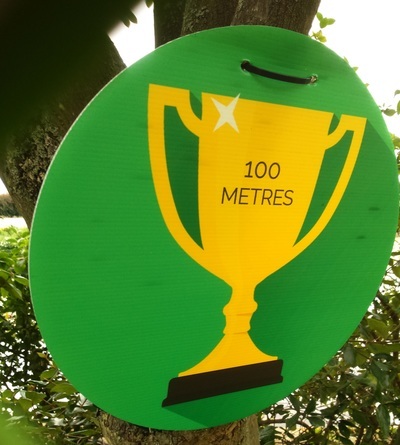 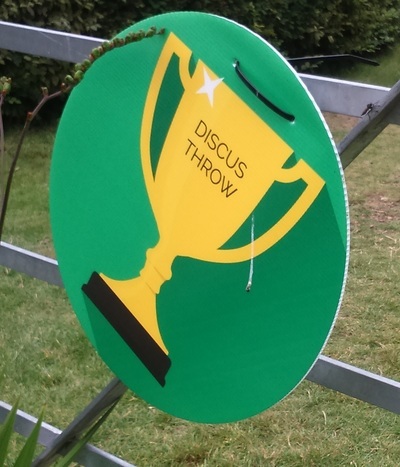 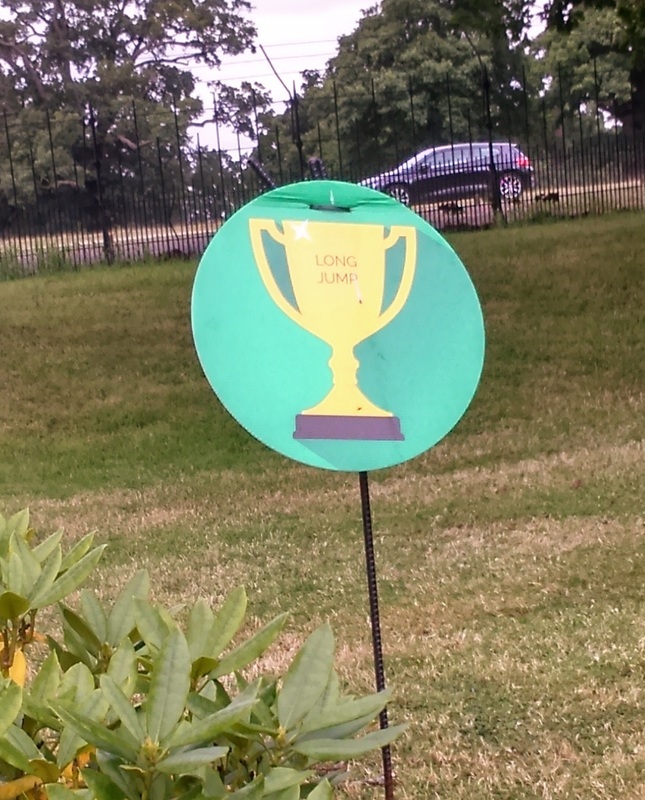 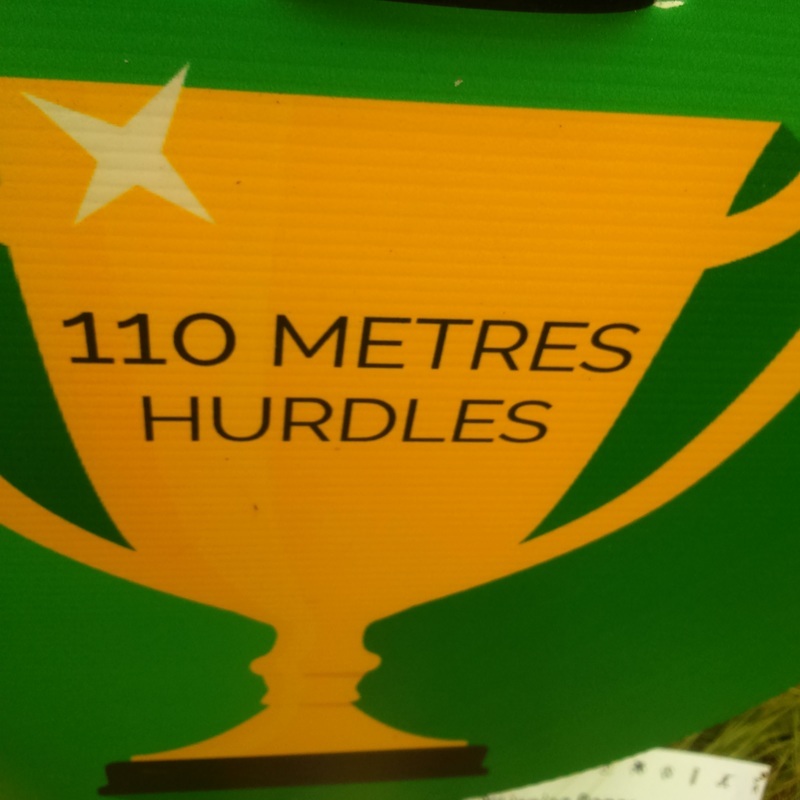 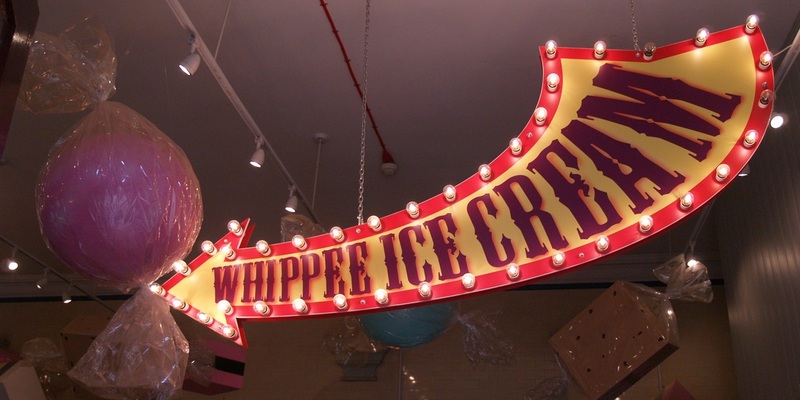 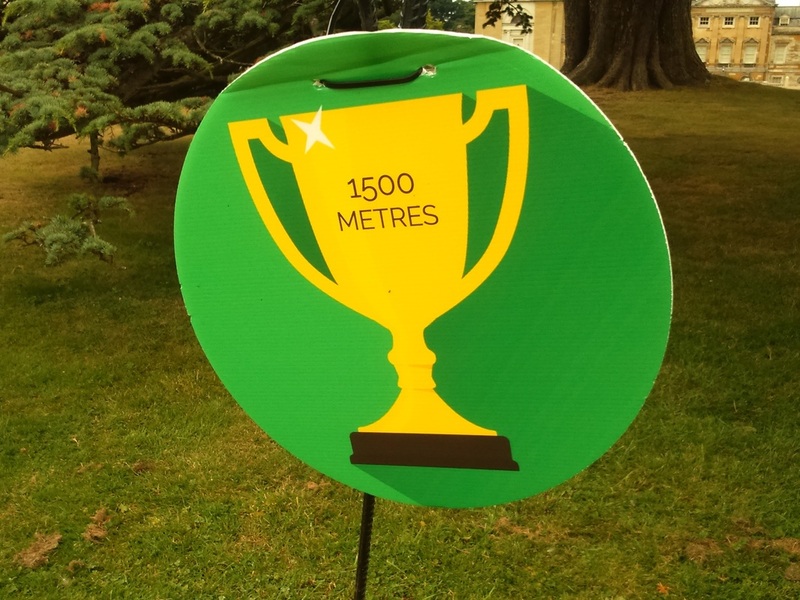 It was themed on the Olympics and you had to find different trophy signs with the names of Olympic sports dotted around the ground and if you found them all you got a gold chocolate medal. 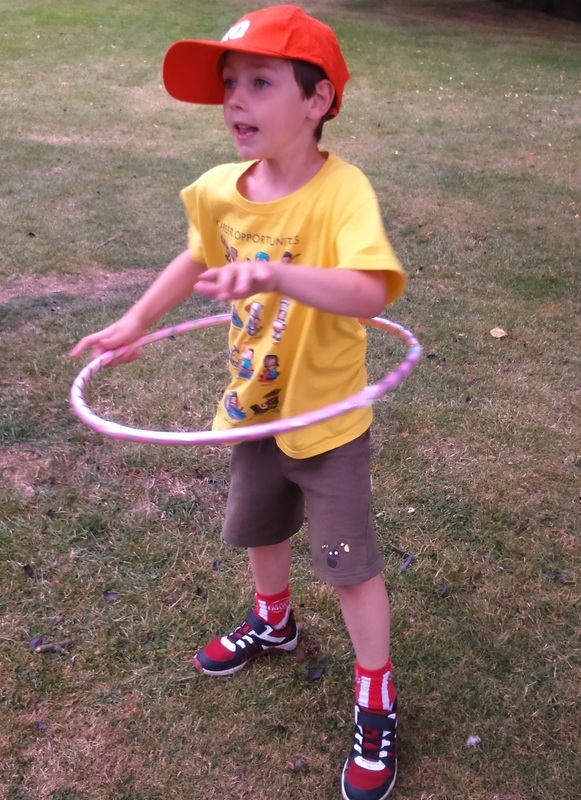 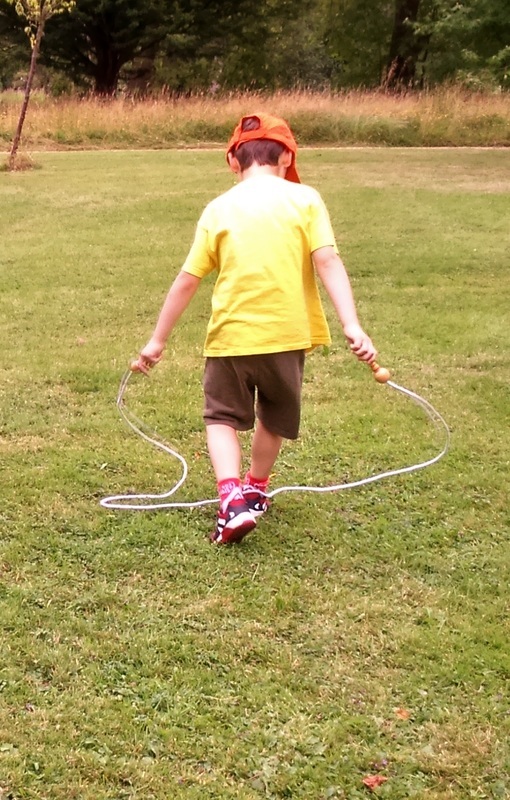 There were also little challenges as you went round like how long you could hula hoop or skip for etc. 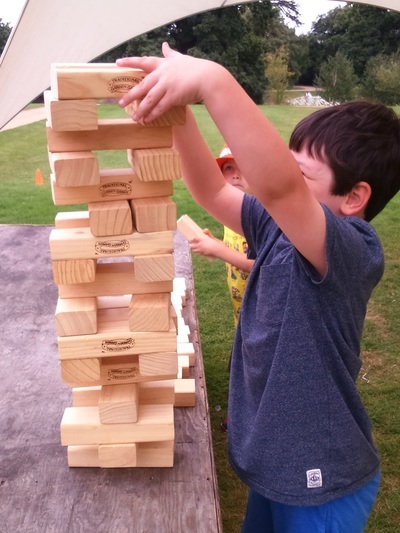 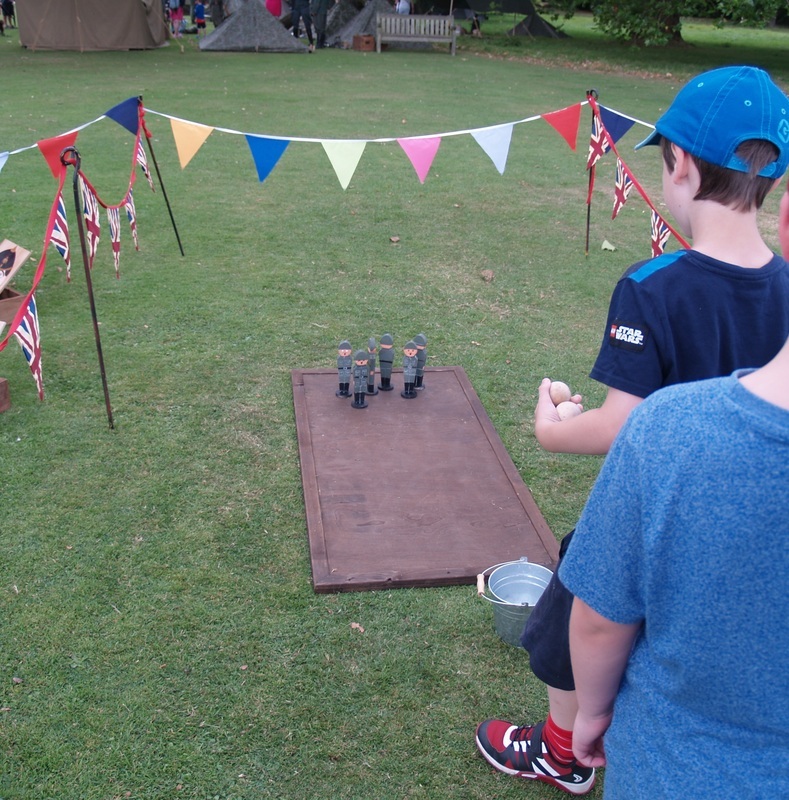 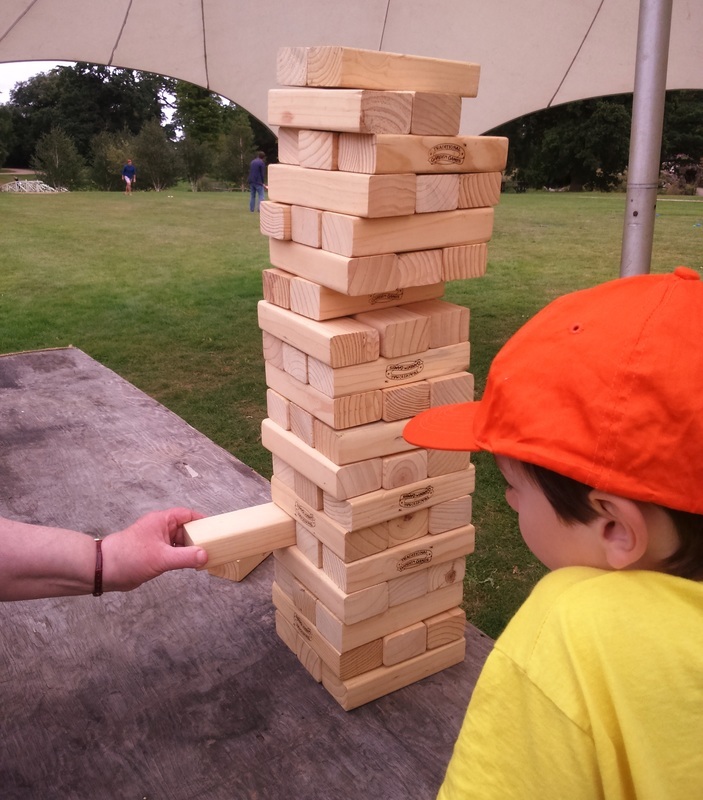 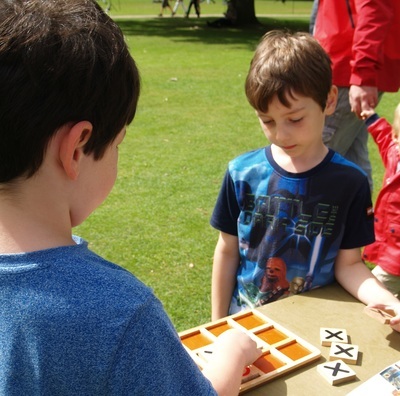 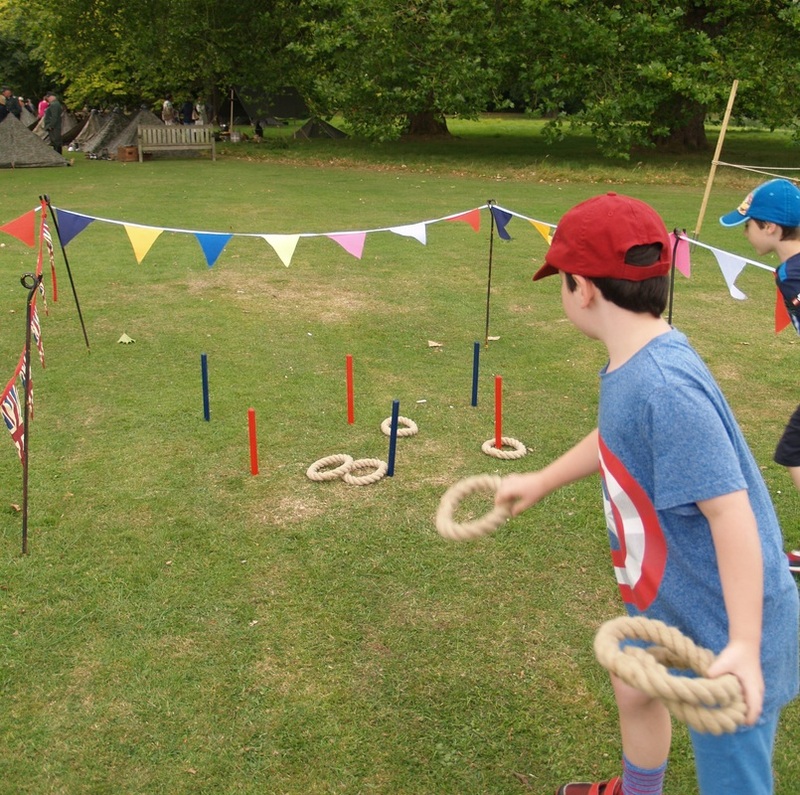 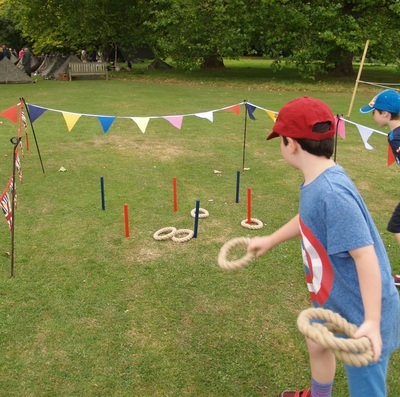 In the centre of the gardens they had set up a big gazebo set up with giant jenga and connect four, skittles, cricket, bean bags, croquet and bowls which you could try. 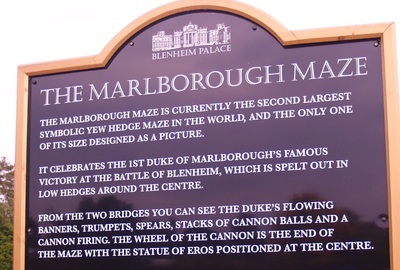 Woburn is well worth a visit at any time but this made it even more fun ! 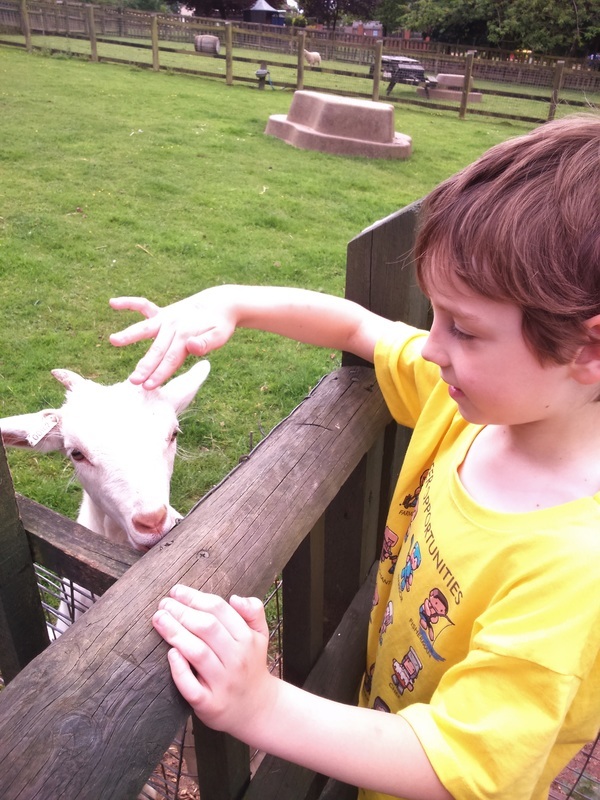 Today we went with family to Grove Farm in Ivinghoe, Hertfordshire which is a pick your own farm. 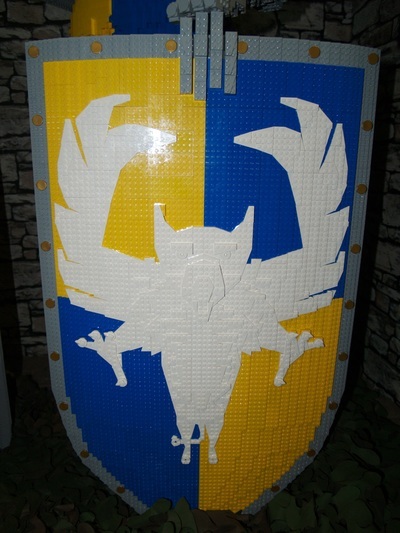 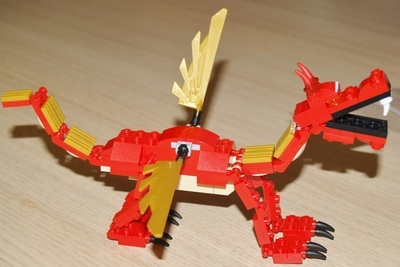 This was a great activity for the children. 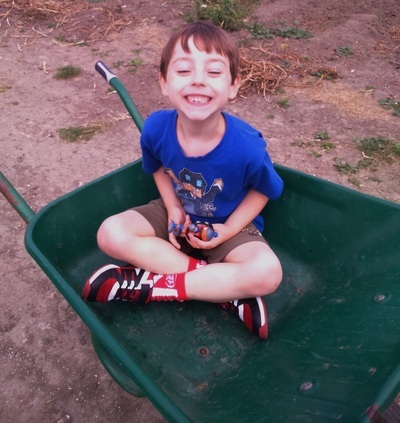 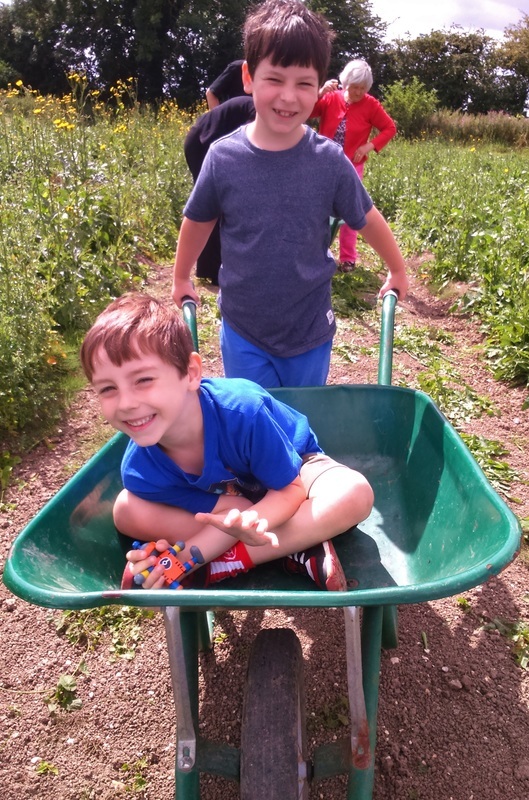 They enjoyed the novelty of riding in a wheelbarrow ! 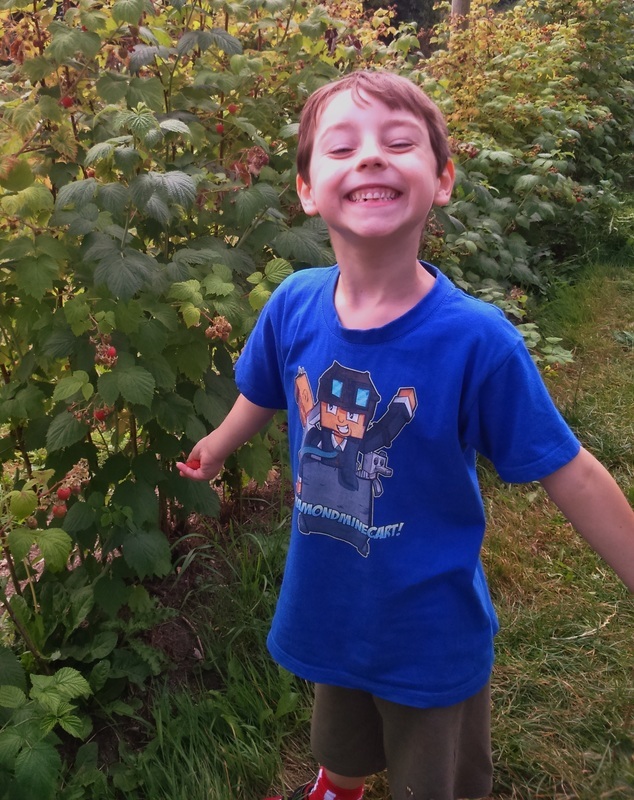 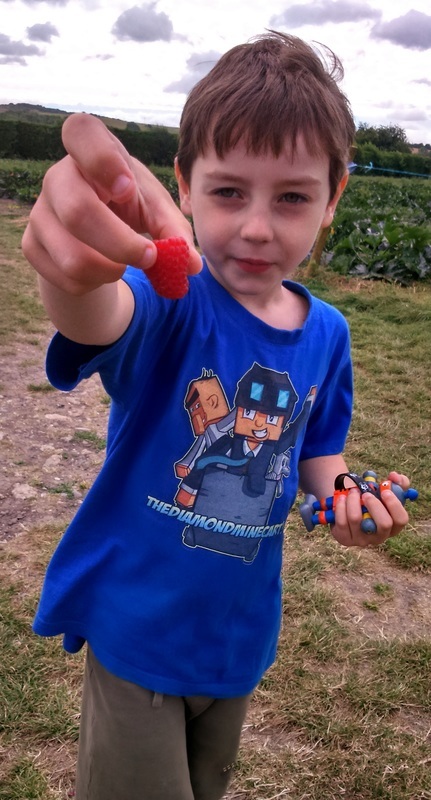 We picked green beans and raspberries but they have a real variety of produce growing here and David was impressed and interested by the field of solar panels that they now have and James was more drawn to the sheep ! 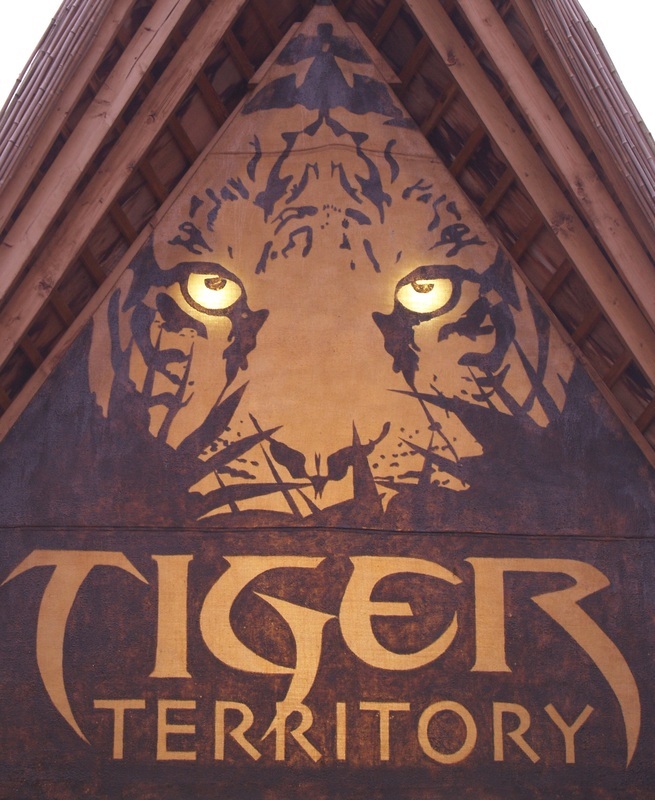 The staff were really friendly and helpful. 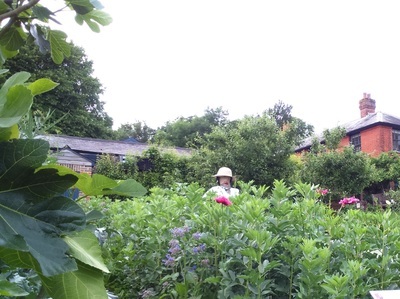 A lovely morning out. 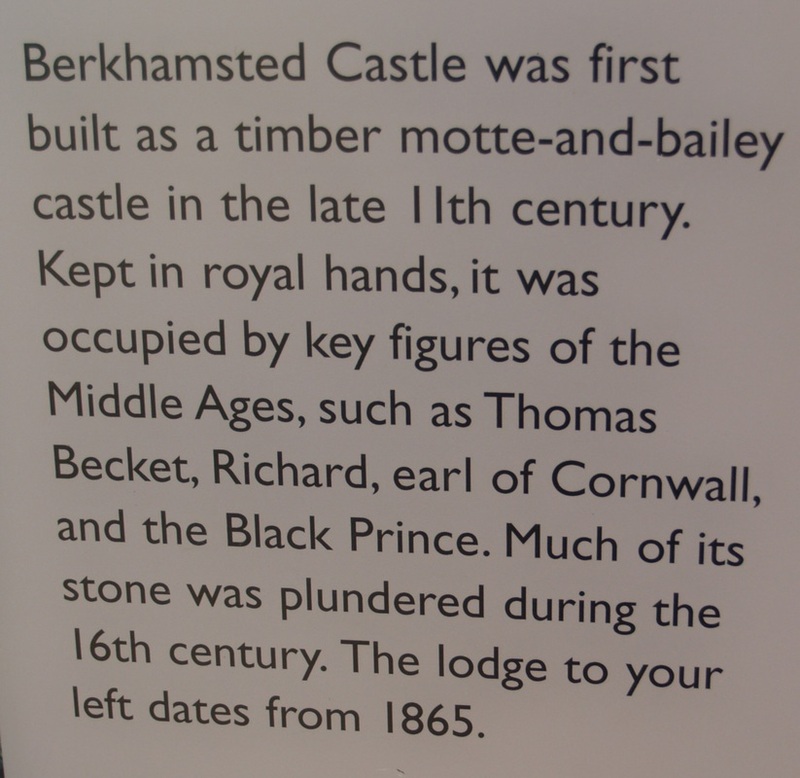 Today we visited Aylesbury to see the Buckinghamshire County Museum. Its centrally located and quite well signed from the town centre where there are lots of places to park. 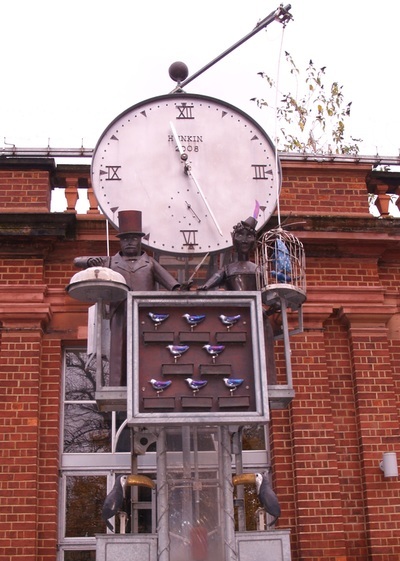 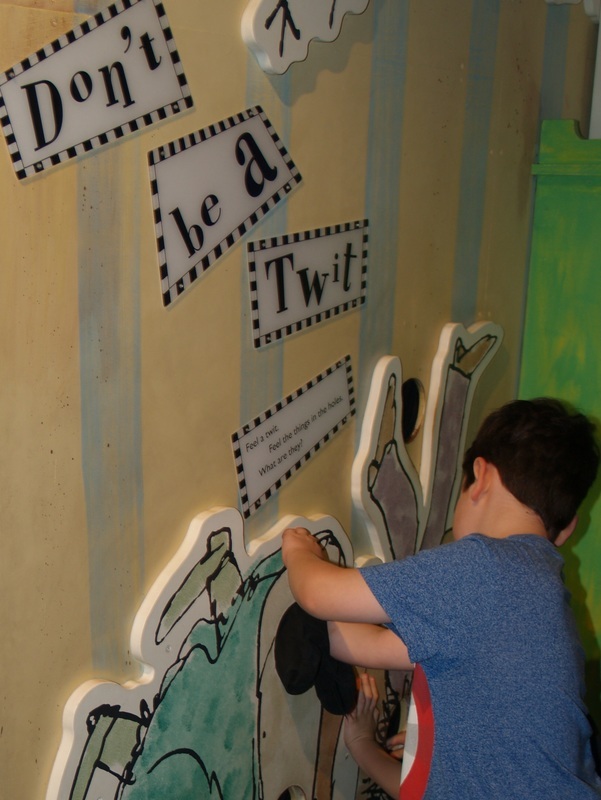 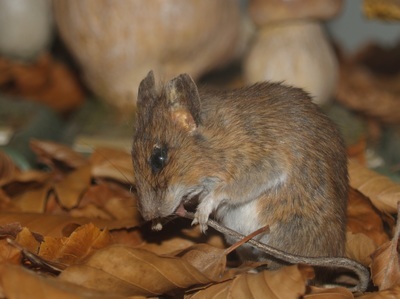 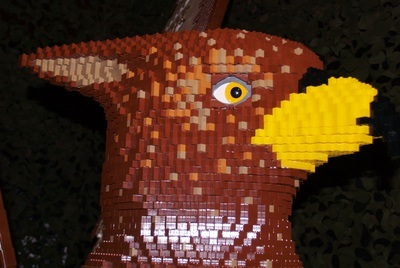 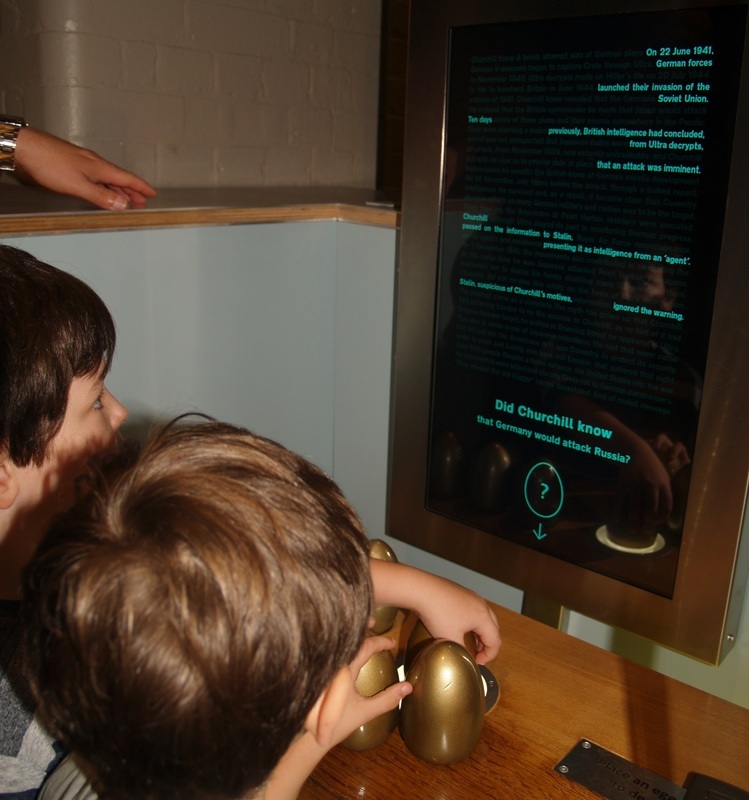 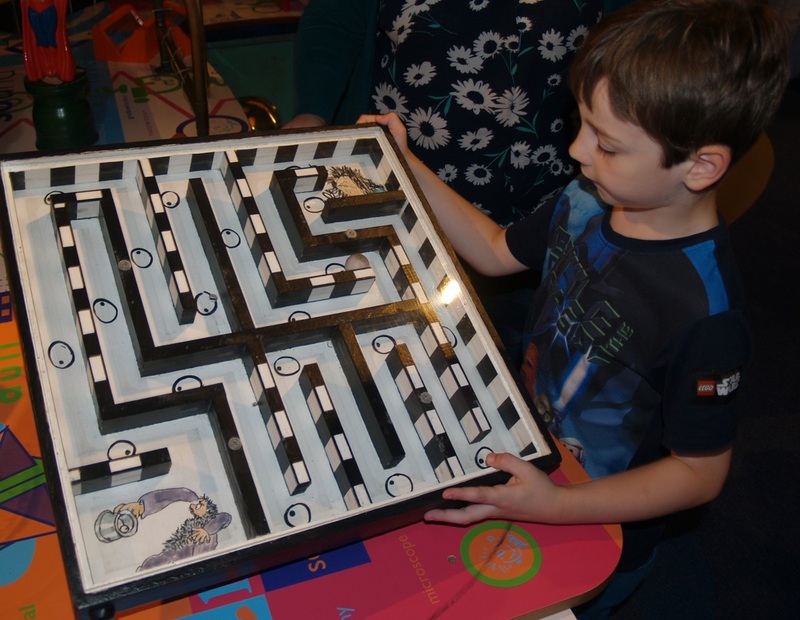 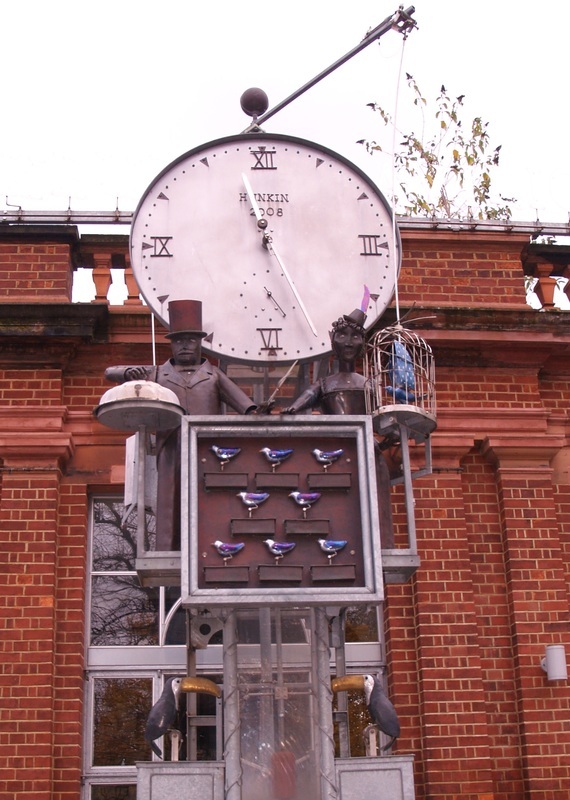 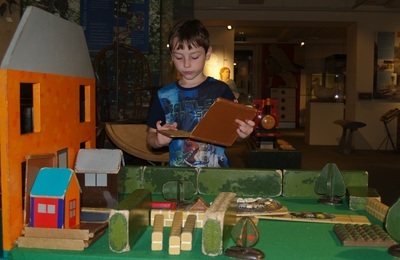 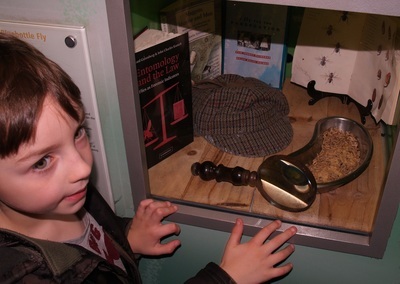 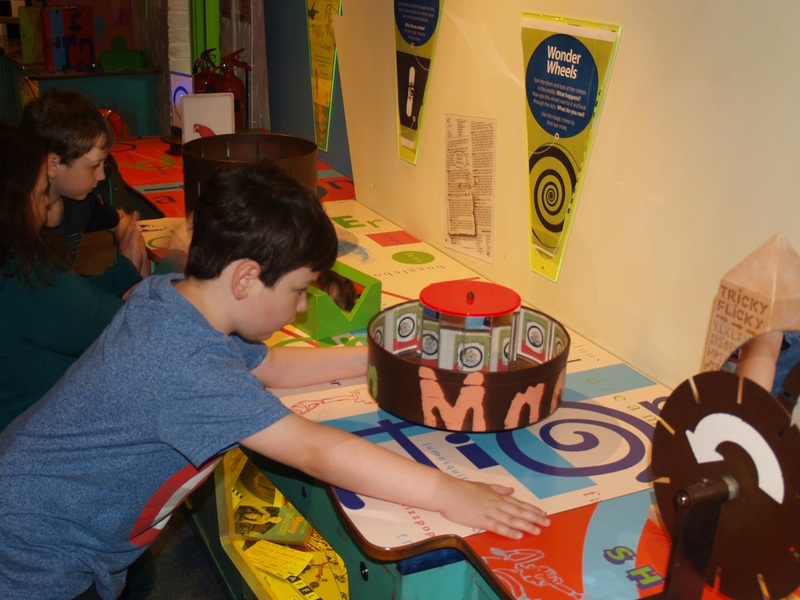 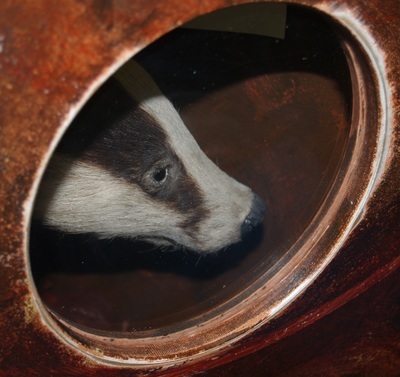 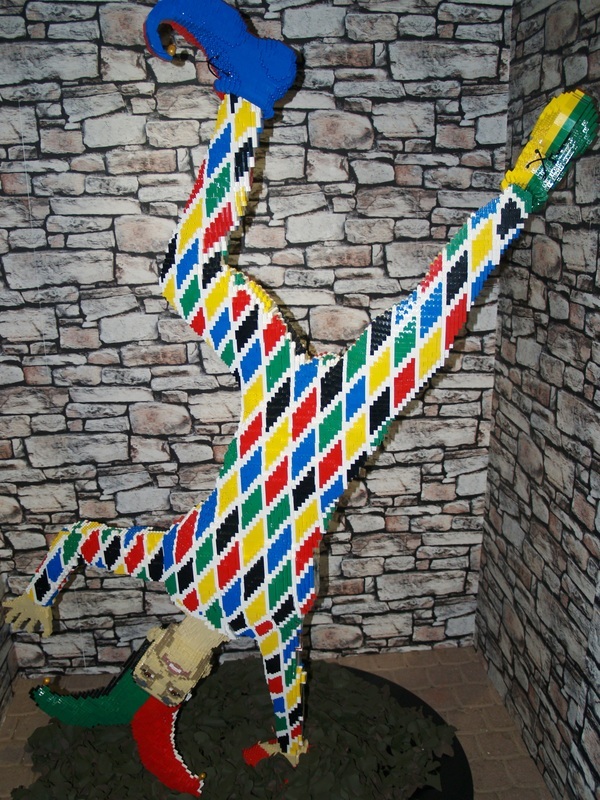 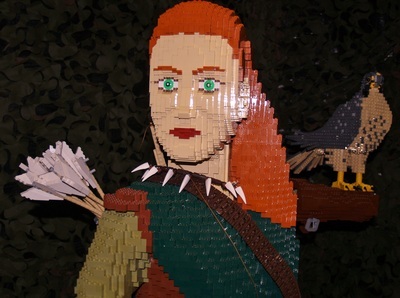 The museum is divided into the main Buckinghamshire County Museum, which is free and a separate Roald Dahl Children's Gallery for which there is a small charge. 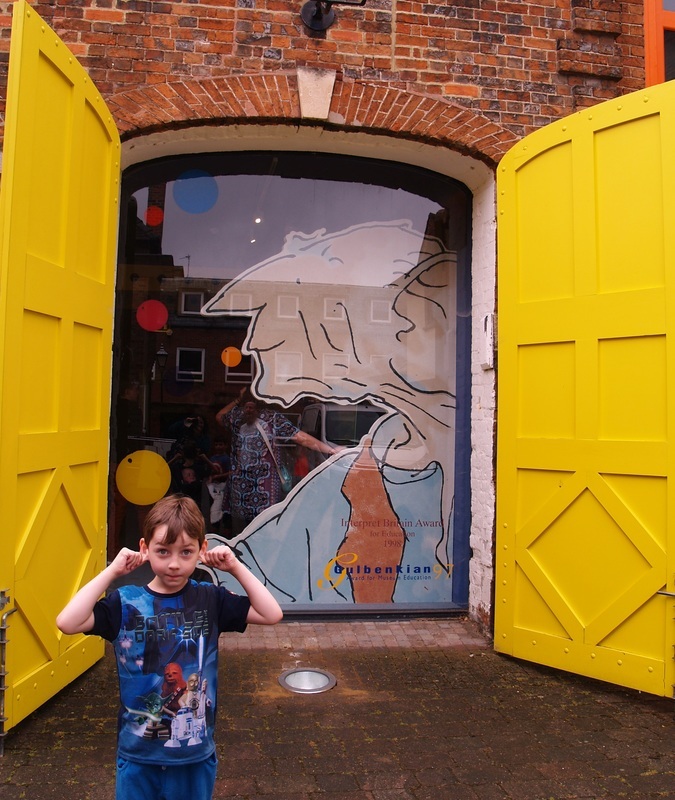 We headed to this first, and as you enter you are taken into the world of Roald Dahl's imagination. 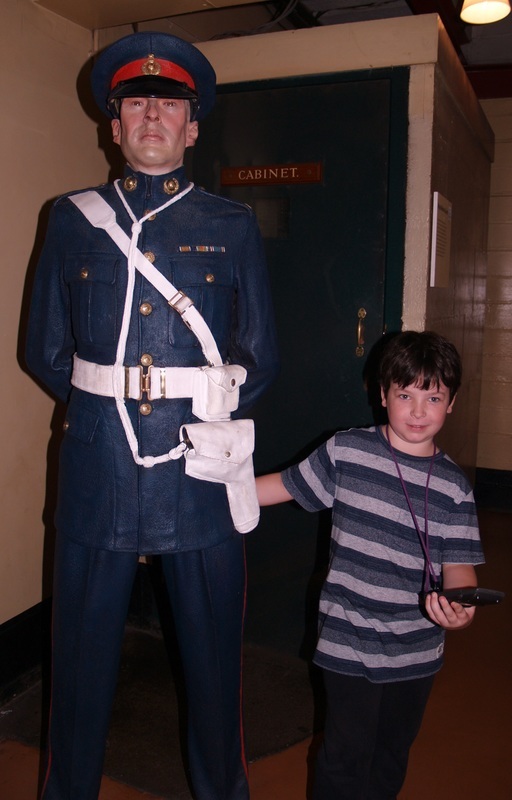 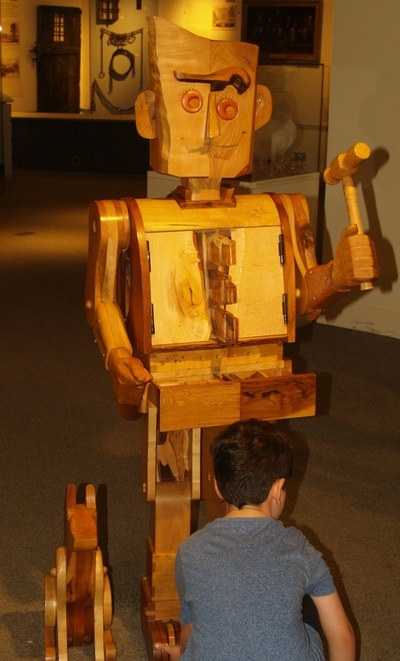 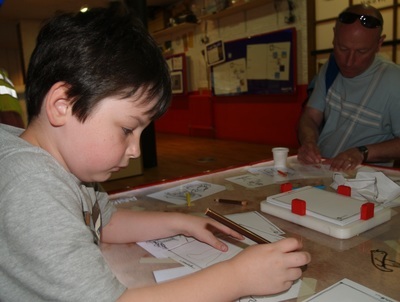 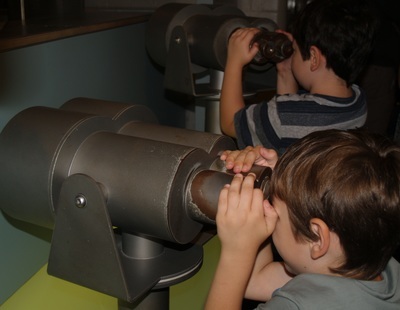 It really is a good museum for children, as everything is hands on and there is lots to experiment with and experience. 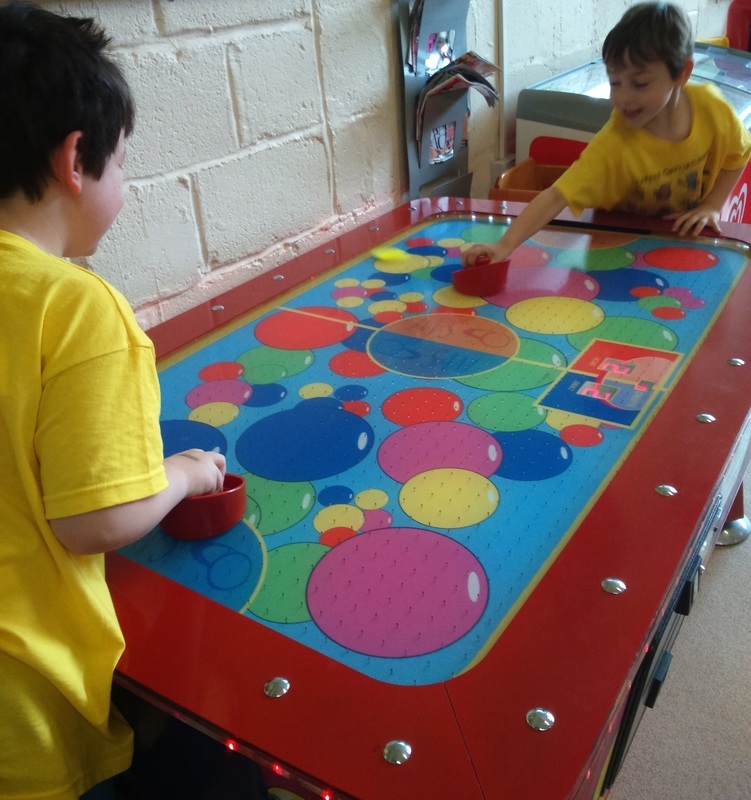 The staff were fantastic in showing all the features to the children and getting them engaged. As we entered we saw a giant peach, complete with James and the other characters on top which you could go inside. 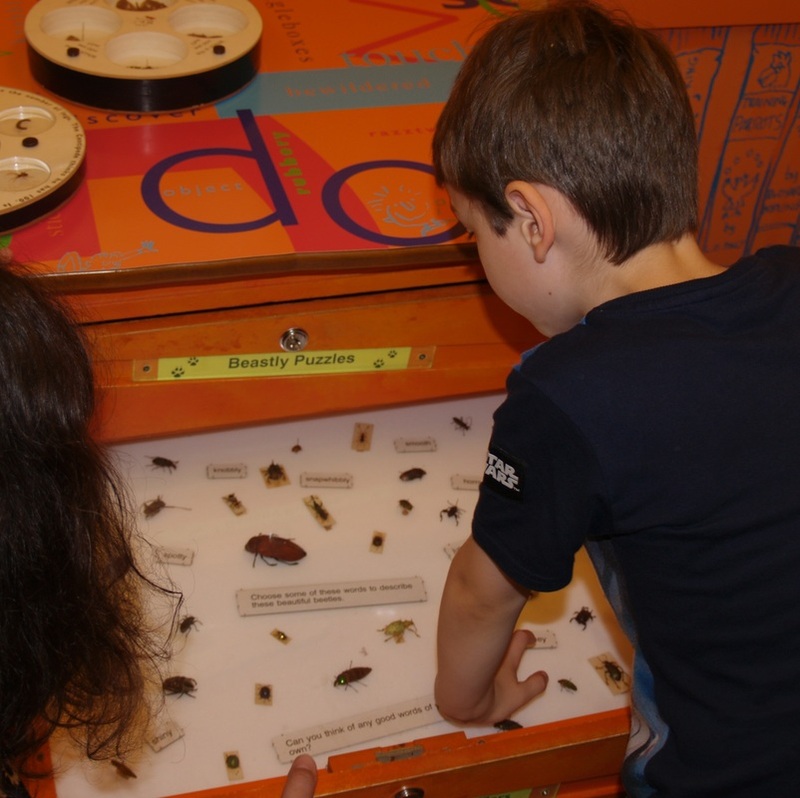 There were microscopes with various bugs and things to examine, fossils and corals to feel, butterflies to look at and puzzles to do etc. 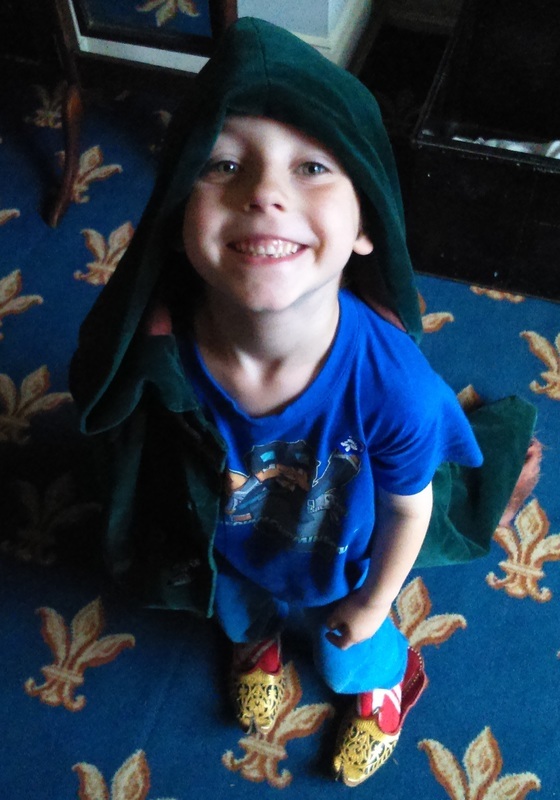 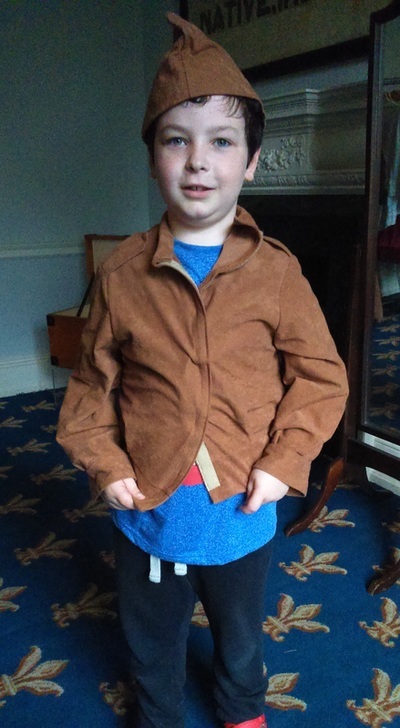 There was a great dress up area, where you could be like Roald Dahl or a character from one of his stories. 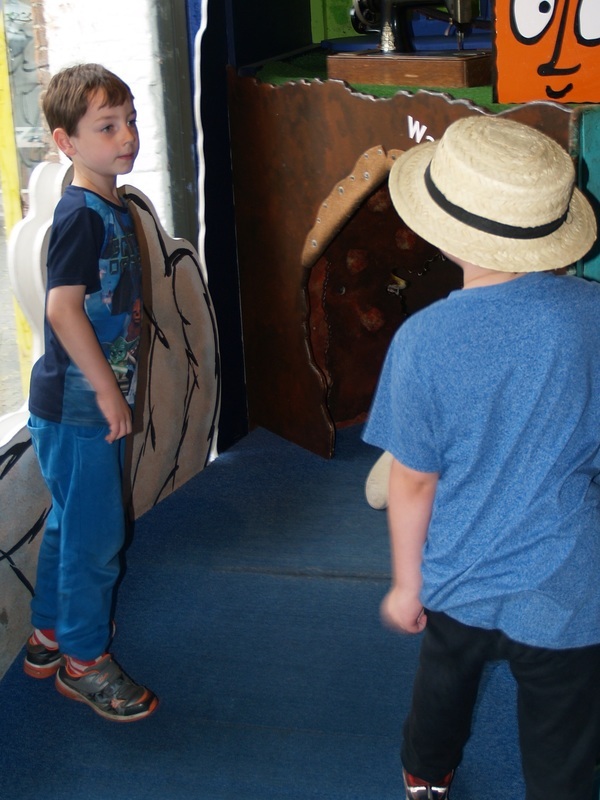 A real hit with all the kids seemed to be Mr Fox's tunnel which you could crawl through and discover different things and your face came up on a tv screen which the kids loved. 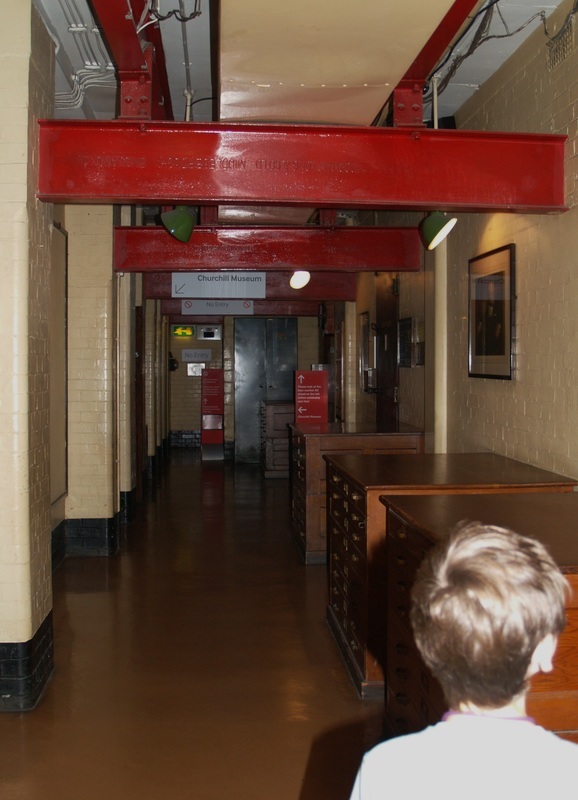 There was a lot in this area to promote curiosity, including an area to experiment with sounds and then a separate quiet reading room. 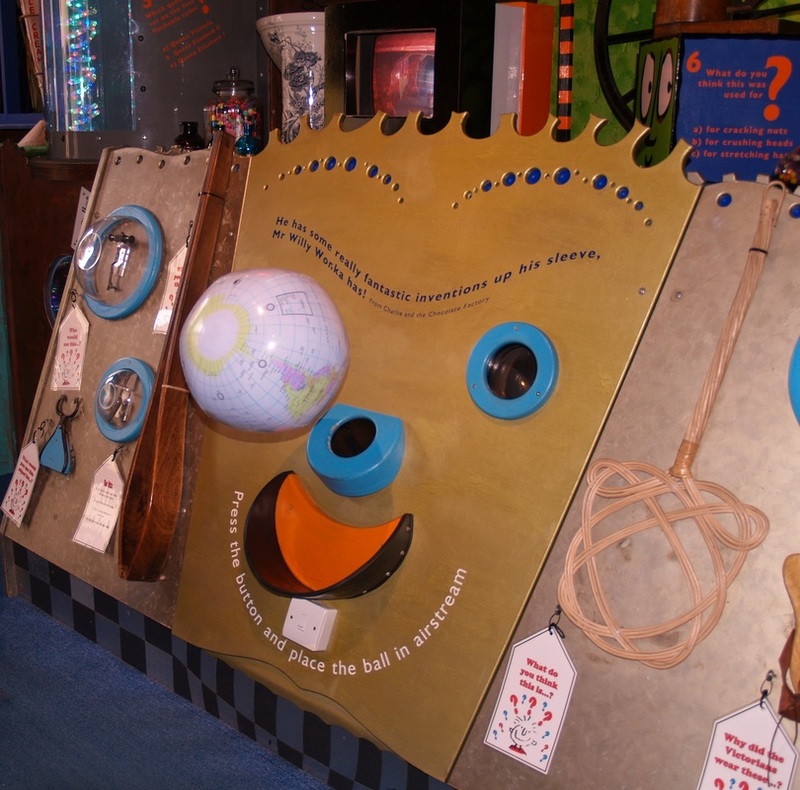 This had copies of all Dahl's books and you could sit and read for as long as you wanted. 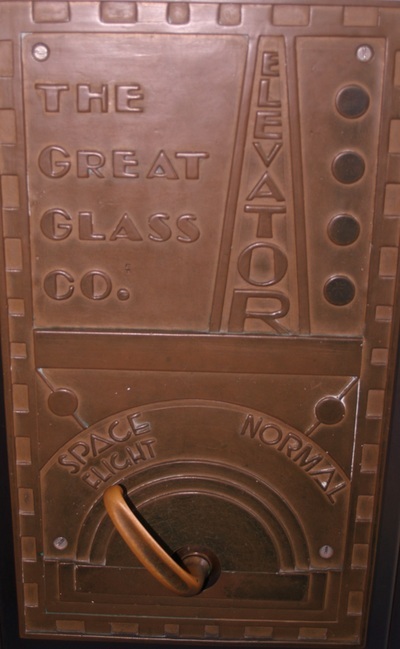 There was also a second floor to the gallery which you accessed via a great glass elevator!! On the second floor you experimented with mirrors and perception, Illusions and shadows. 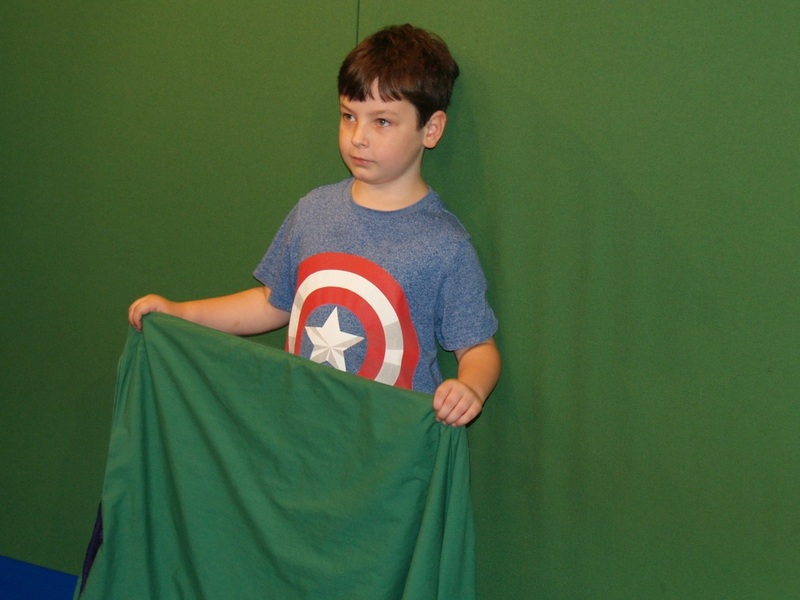 The boys loved standing against a green screen and using an "invisibility cape to disappear. 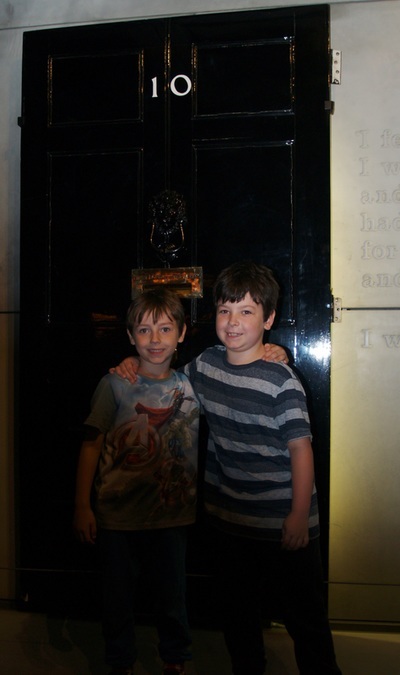 There was also a shadow room where you could pose and a flash would freeze your shadows so you could look at them. 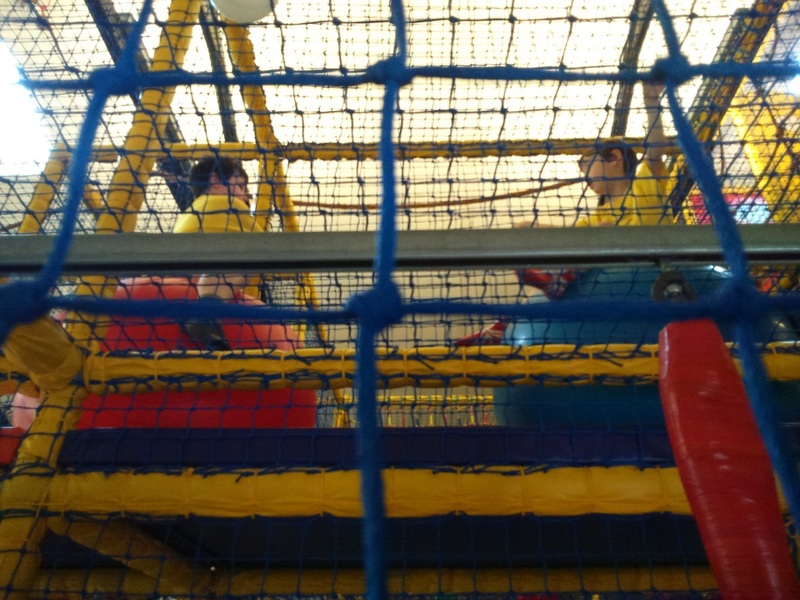 It really was a lot of fun and we spent a good chunk of time here. After we had seen everything in the Roald Dahl galleries we headed back to the main Buckinghamshire County Museum. The museum has a small cafe and shop as you enter and they lead on to the exhibition rooms. 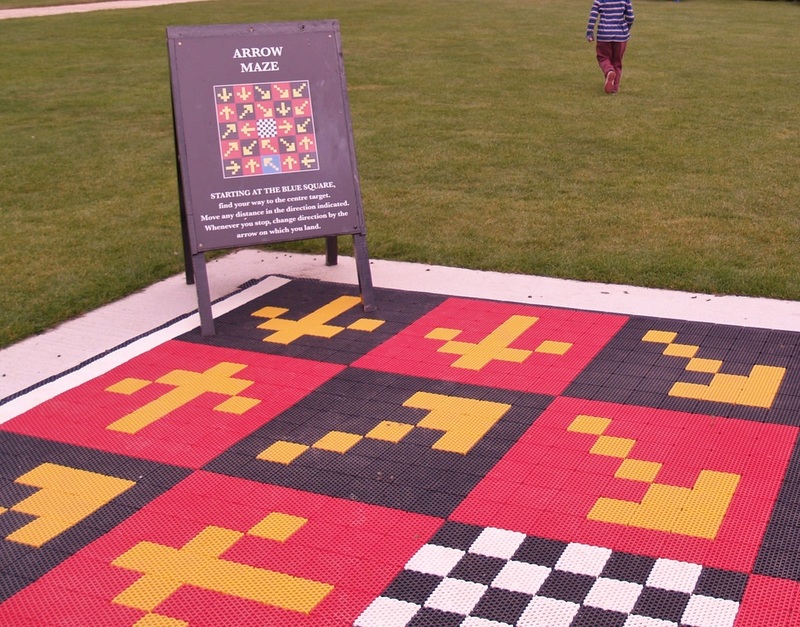 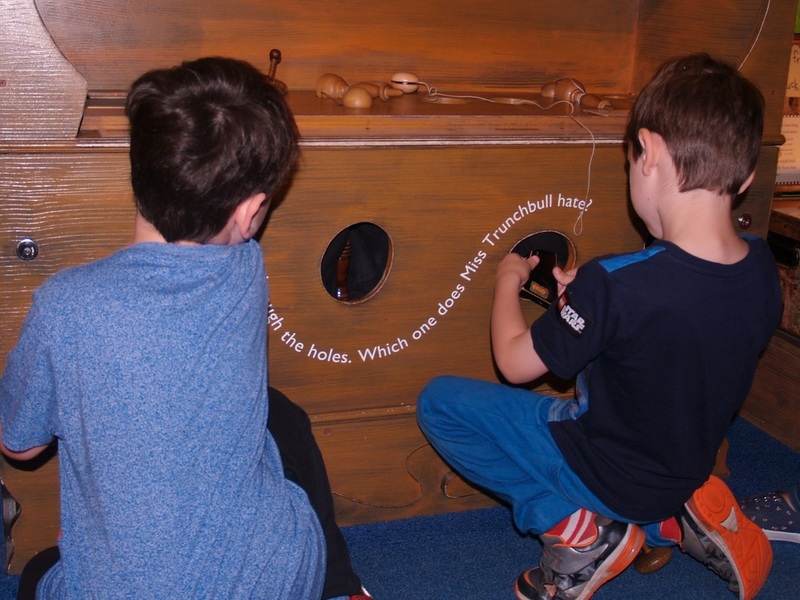 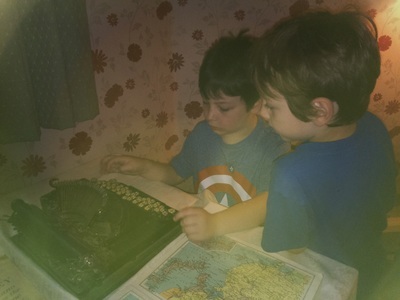 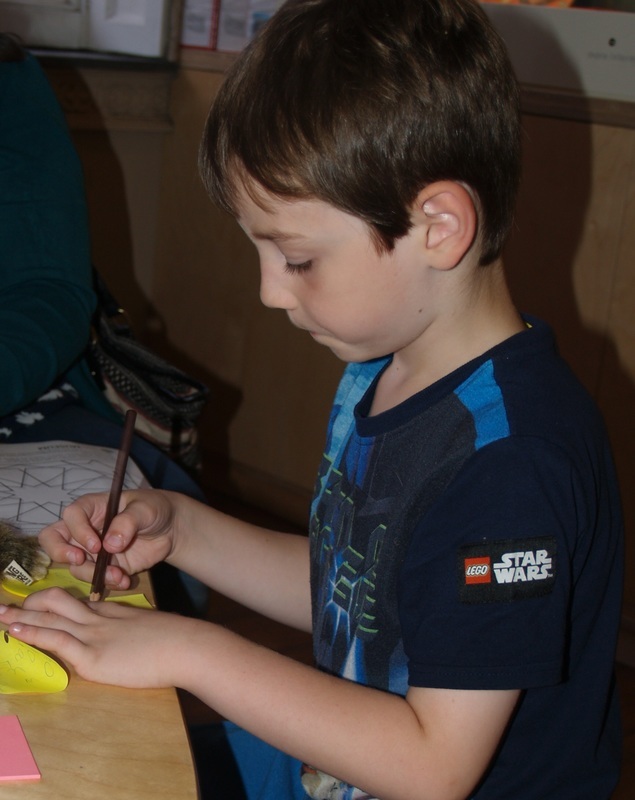 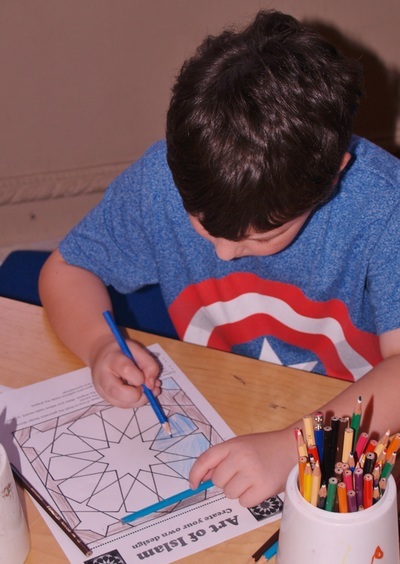 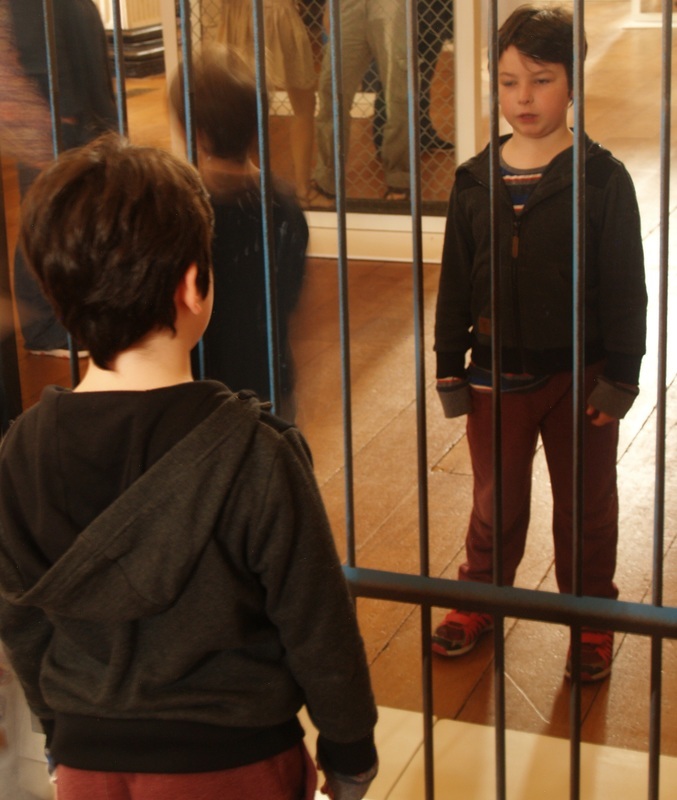 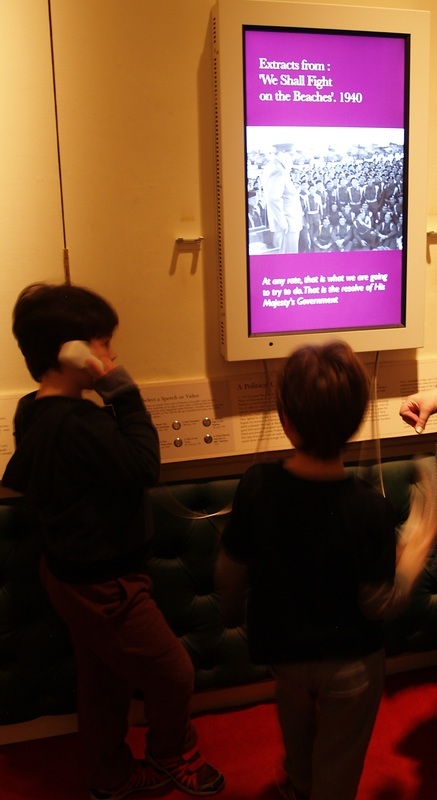 There are some permanent features to the museum which include a tudor house area which had interactive bits for the children to do and the rooms had been stripped so you could see the tudor features. 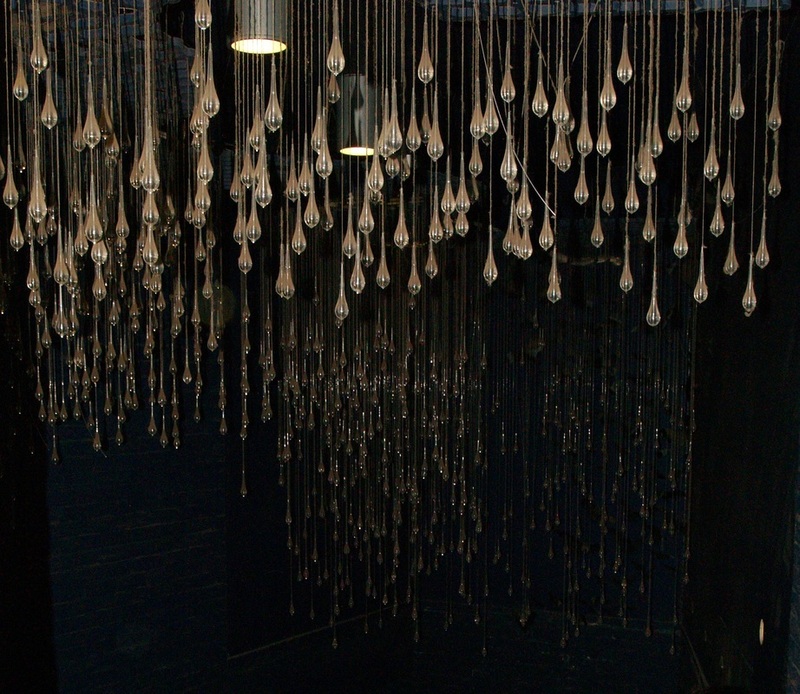 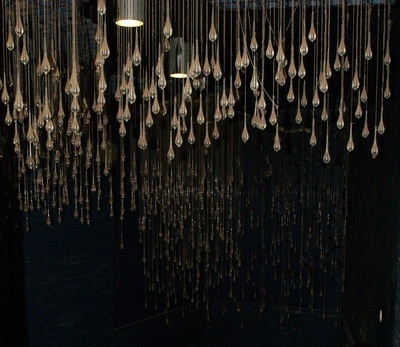 They also have temporary exhibitions which change each season. 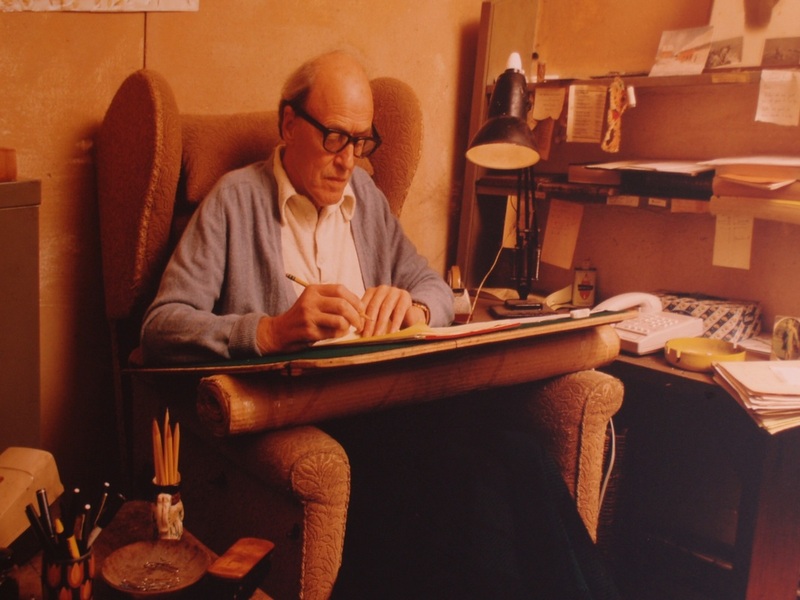 At the moment they had a further feature on Roald Dahl to commemorate 100 years since his birth. 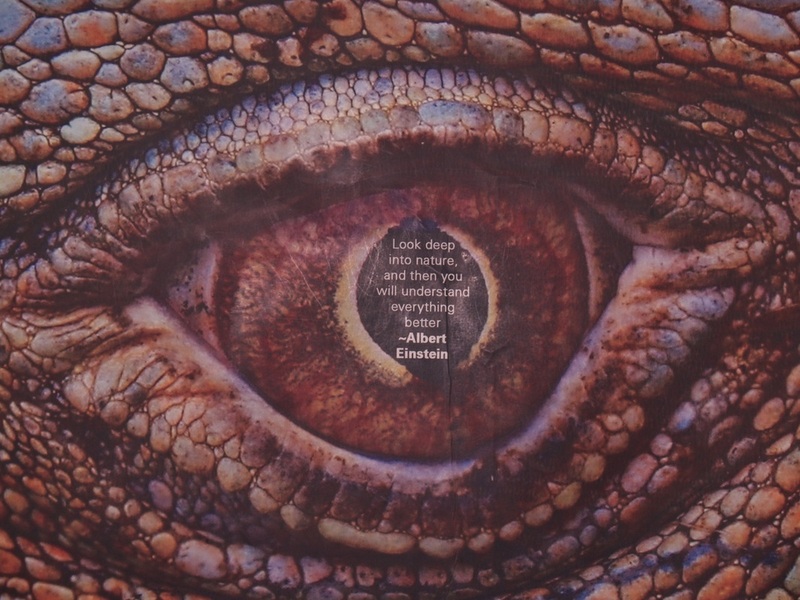 Again this had books to read, animals to look at and information about his life, inspirations and books. 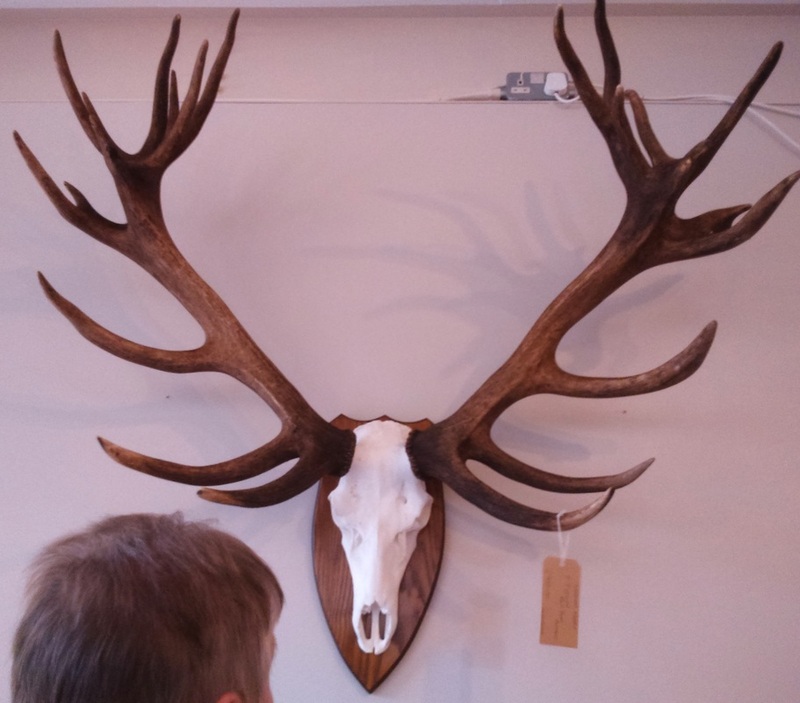 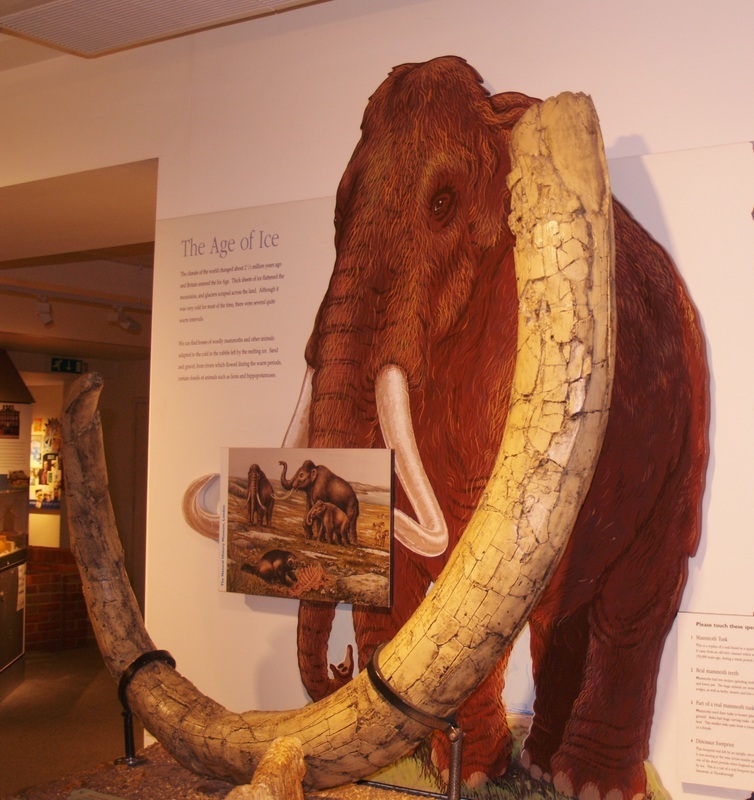 There was also a gallery with a mammoth tusk, fossils, and other objects that had been found locally. 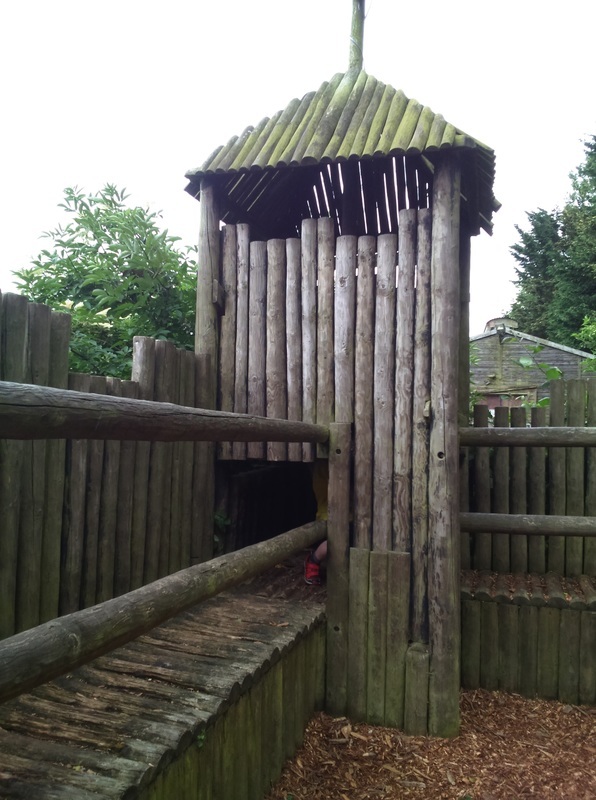 There were lots of things in this area for toddlers and younger children to do and I believe during the summer holidays they also do craft activities all day for which there is a small charge. The museum also had a small garden at the back of it which would be suitable for picnics on a sunny day. I would say you'd need about 2 to 3 hours to see both parts of the museum and we'd highly recommend it for both variety and for being a lot of fun. 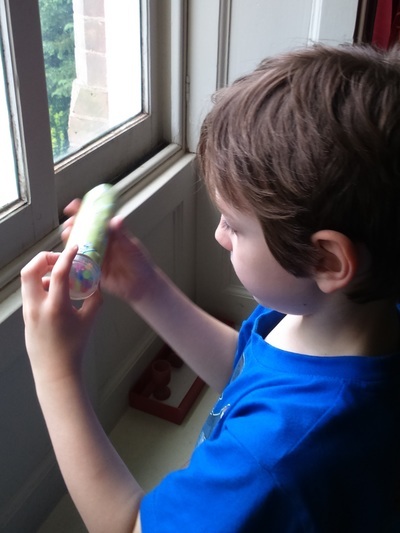 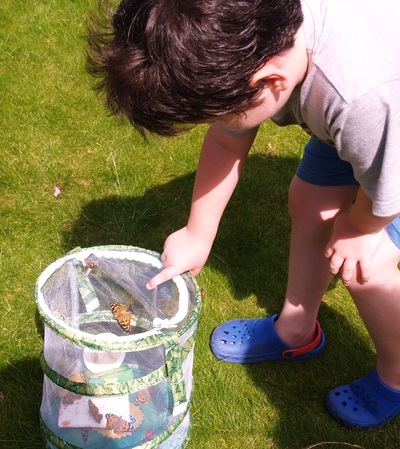 Over the last few weeks using a kit from a company called Insect Lore, we have been watching caterpillars metamorphasize into butterflies. 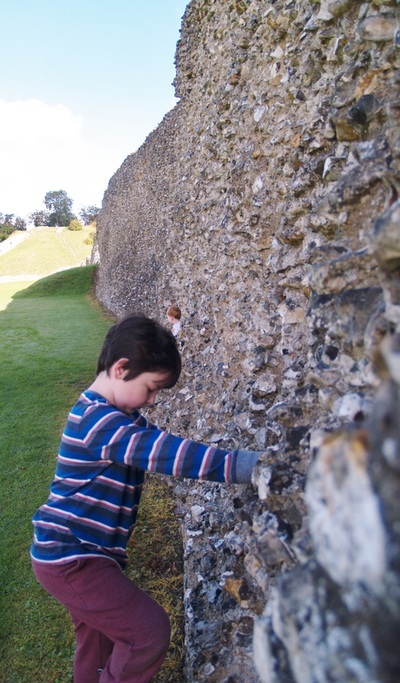 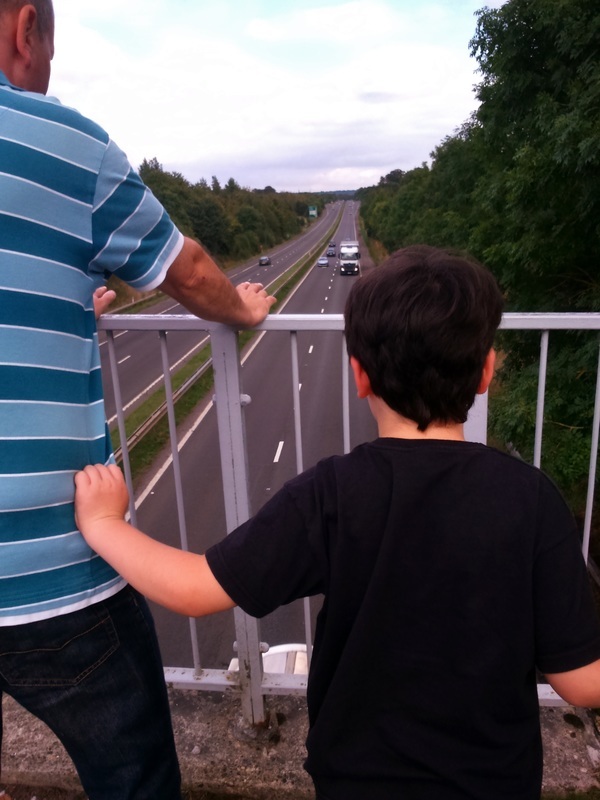 We did this once before when my eldest was little and thought we'd do it again for our youngest. We got the kit from Amazon, although I'm sure it is also available elsewhere. 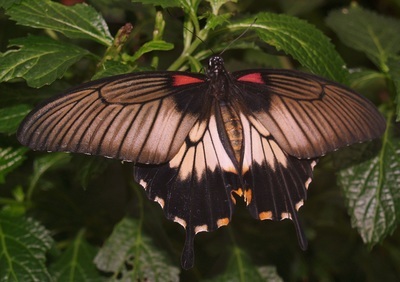 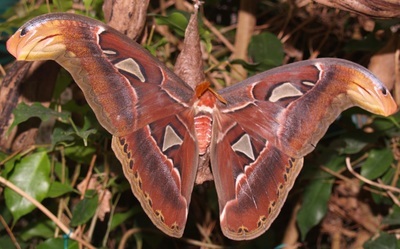 This is the one we used https://www.amazon.co.uk/Insect-Lore-10416-Butterfly-Garden/dp/B00000ISC5/ref=sr_1_1?ie=UTF8&qid=1468786794&sr=8-1&keywords=insect+lore+butterfly . The kit comes with a butterfly habitat, feeding pipette and a voucher. 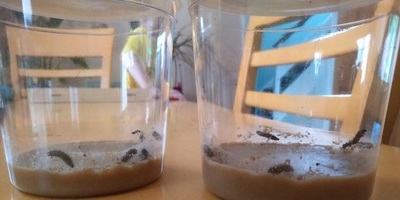 The voucher you send off to the Insect Lore company and they send you a small tub with 5 caterpillars in them. 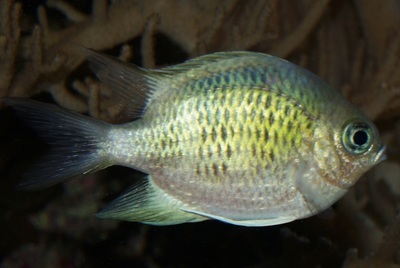 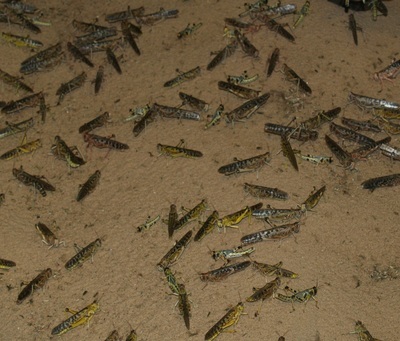 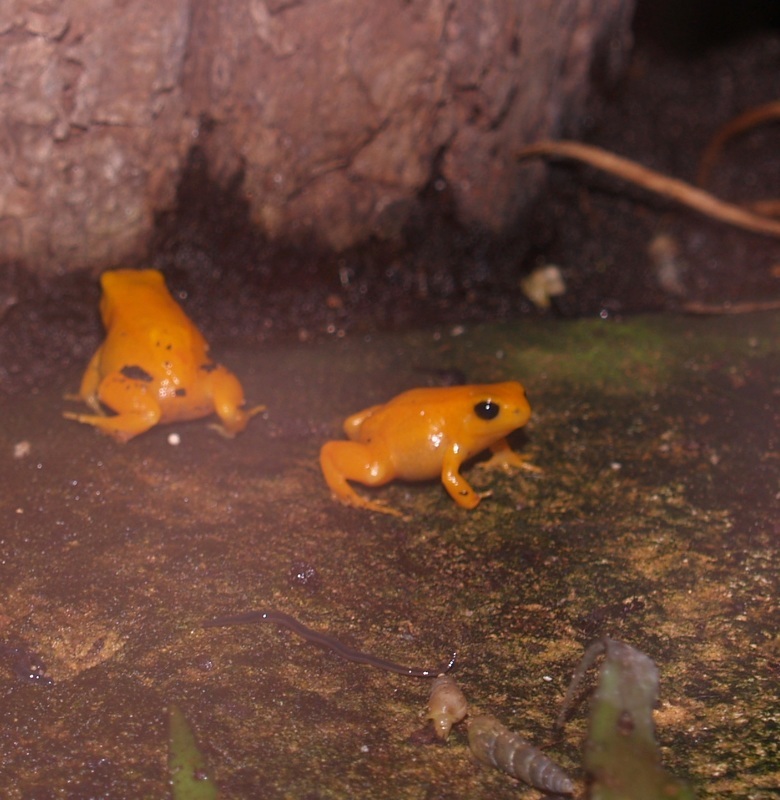 They are really tiny when they arrive but in the next week grow to 10 times their original size. 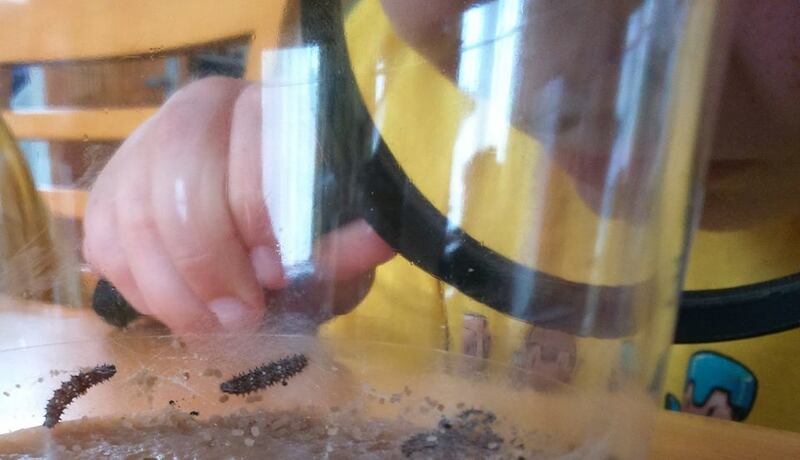 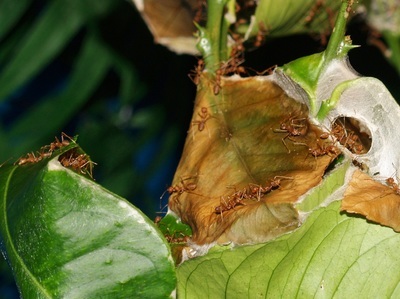 For those that are not keen on creepy crawlies there is no need to handle the caterpillars as the tub has air holes at the top and contains a brown substance on the bottom which is the caterpillars food. 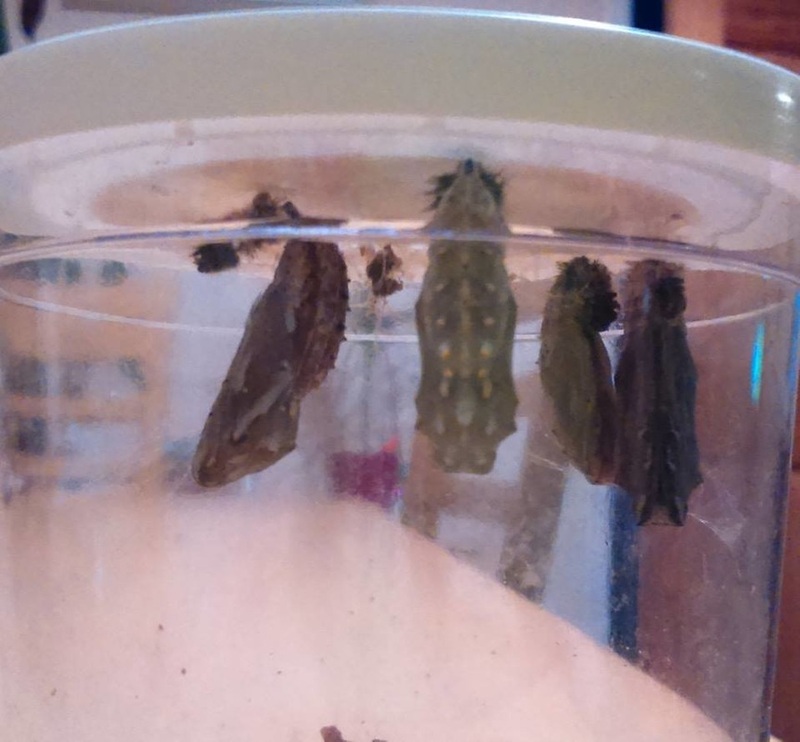 You leave the caterpillars in the tub until they turn into chrysalises which they start doing by hanging from the lid in a j shape. 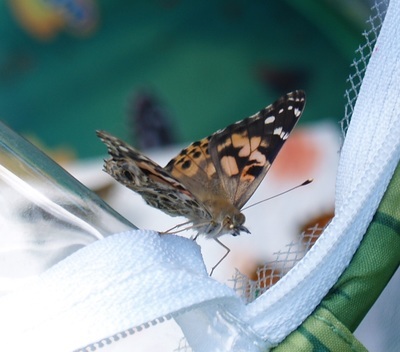 Once they have hardened over a couple of days into the chrysalises you take the lid to which they are attached and put this in the butterfly habitat. About one week later your butterflies should start emerging. There is something kind of magical about the whole process. 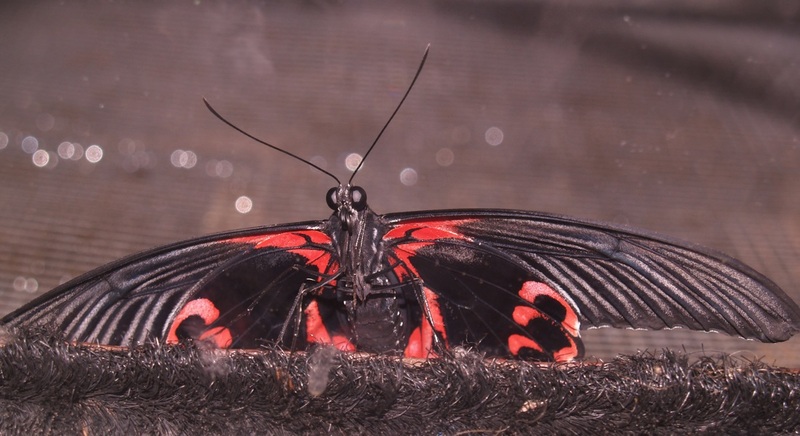 The butterflies climb onto the side of the net and you can see them testing out thier wings. 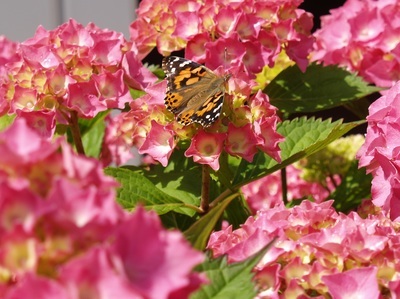 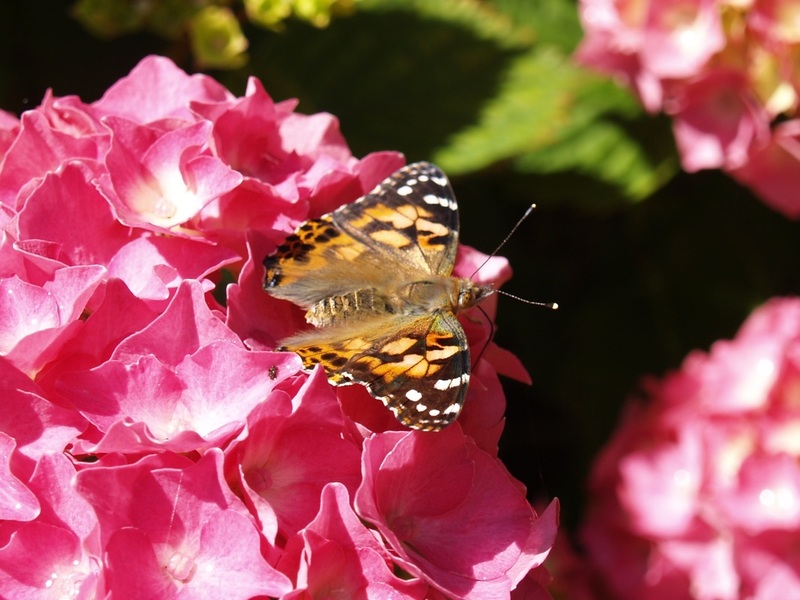 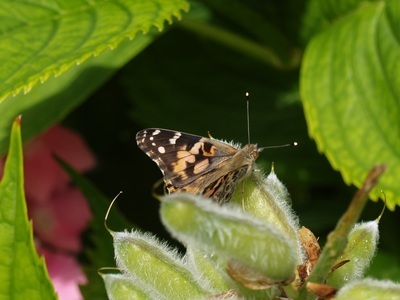 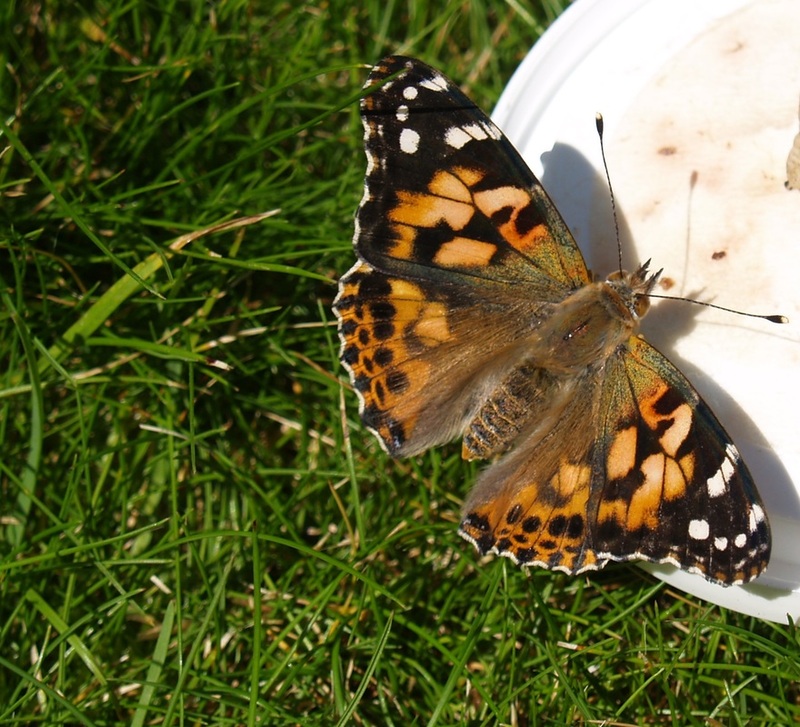 After a couple of days you release the butterflies on a warm day in your garden. 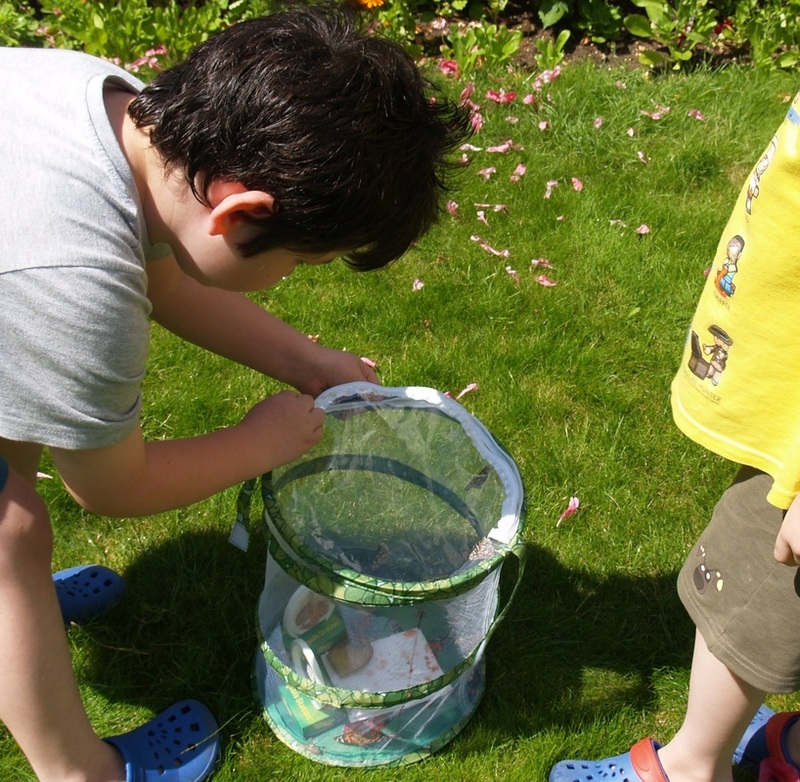 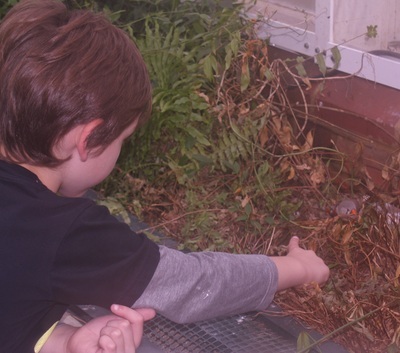 The boys really enjoyed this and although they were sad to see them go they were excited that the butterflies were going to lay eggs and start the life cycle all over again. 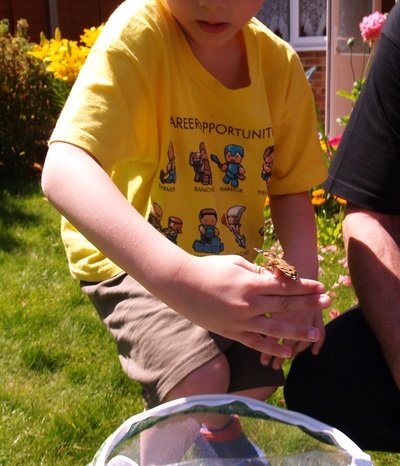 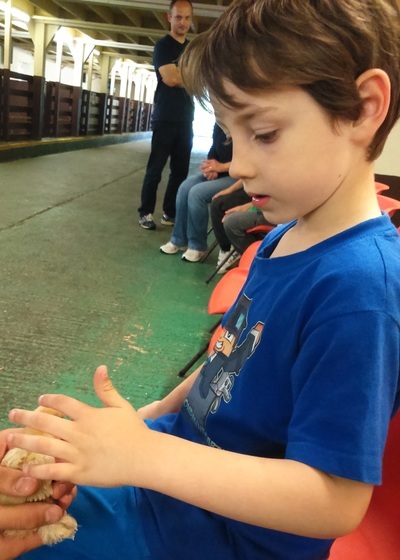 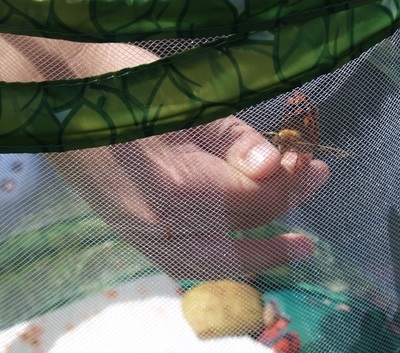 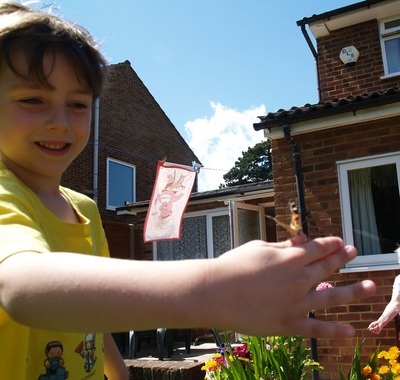 We had one very placid butterfly which sat on James's hand for a while before leaving which was really sweet. 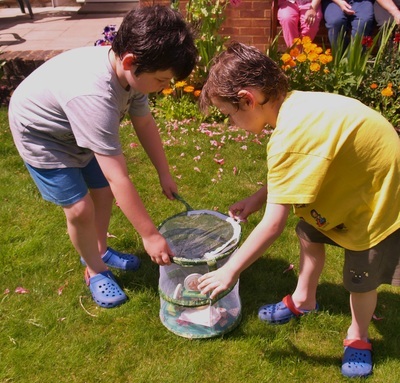 I would highly recommend this activity for children and it is something they'll always remember and a lot more intresting that learning about life cycles from a book ! 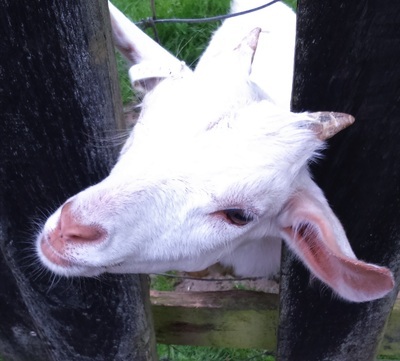 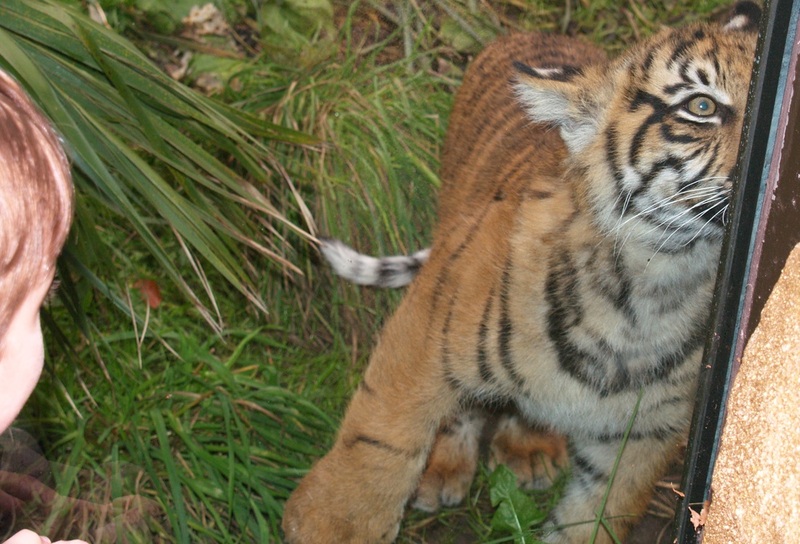 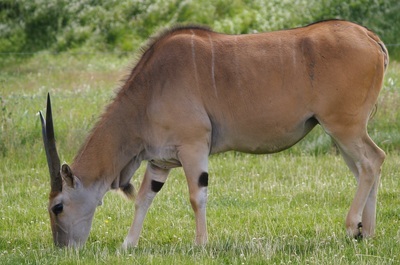 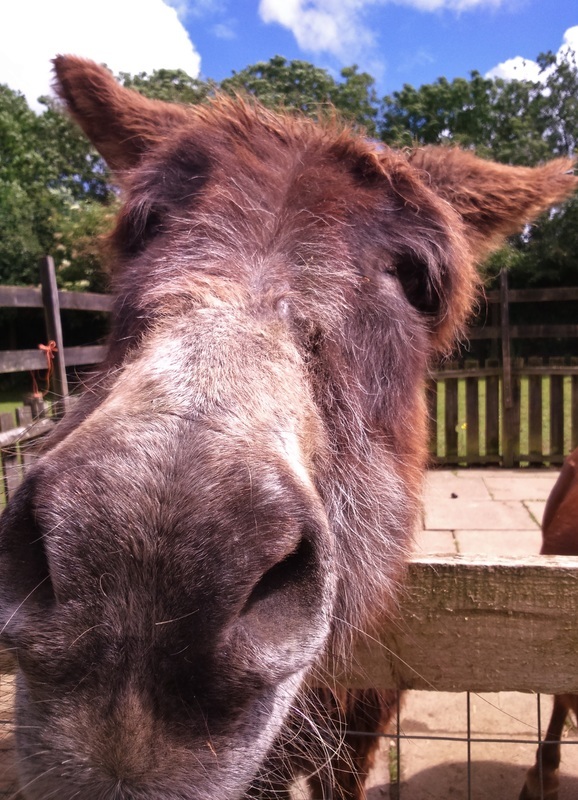 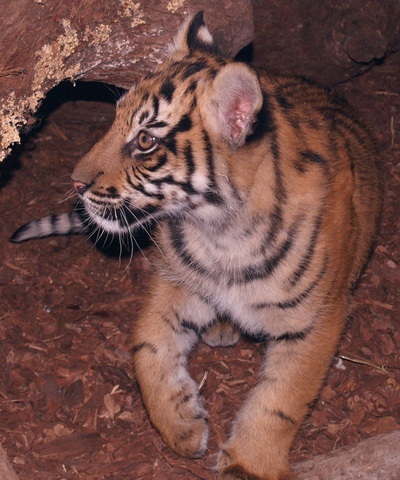 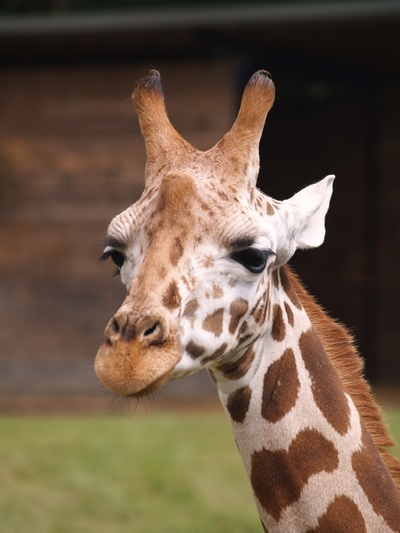 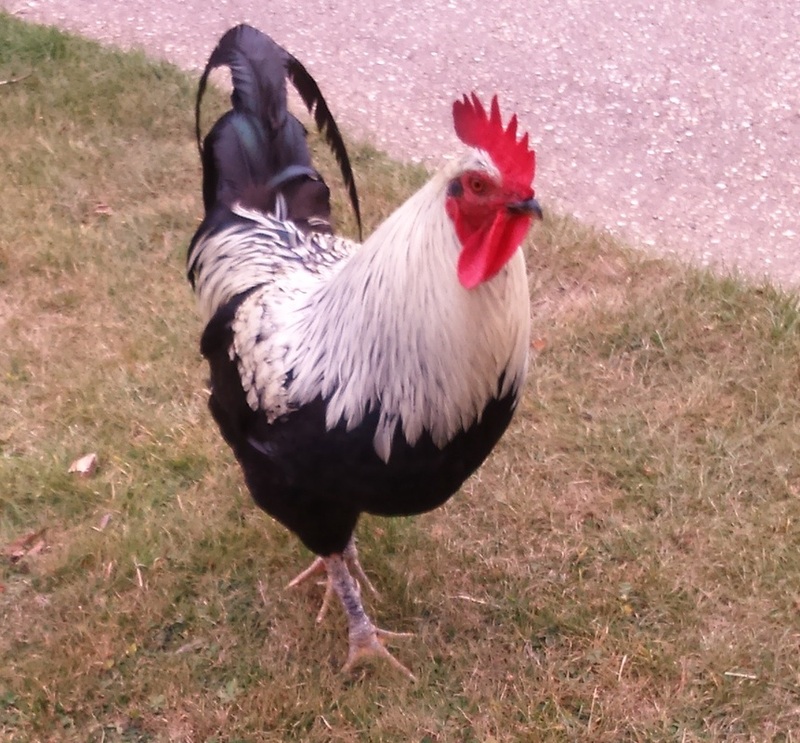 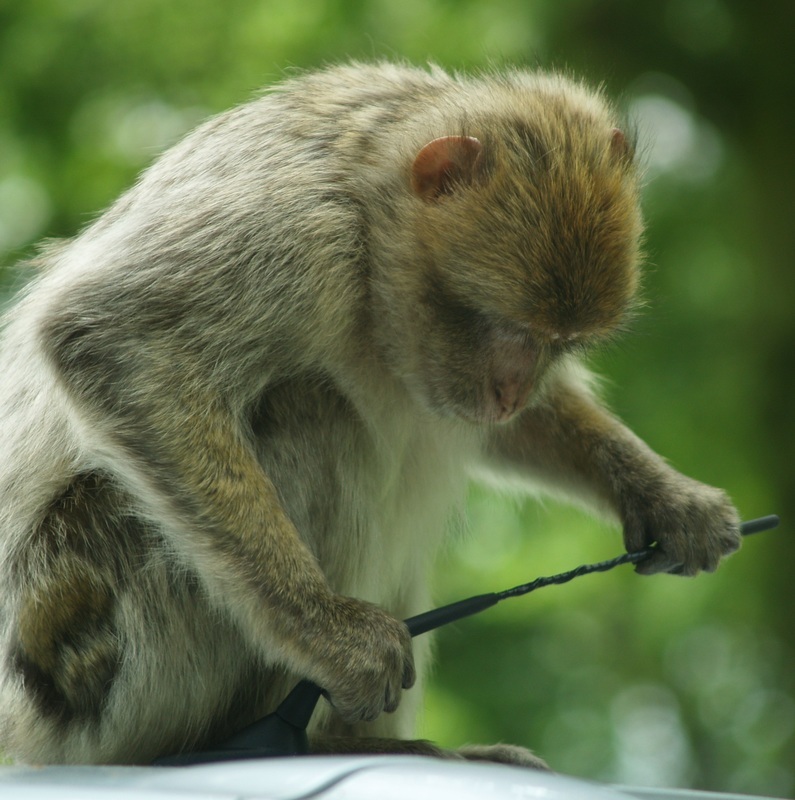 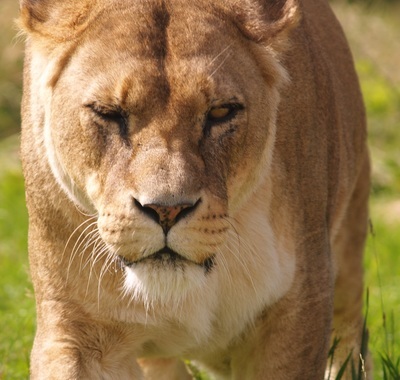 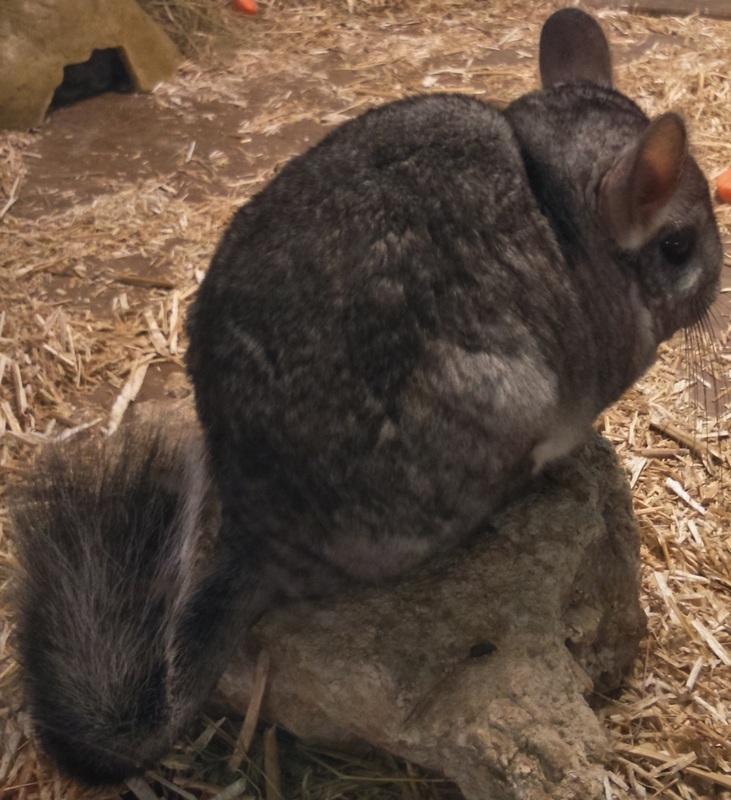 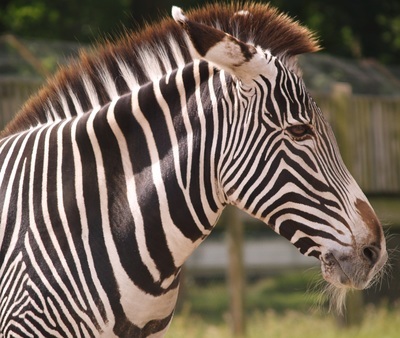 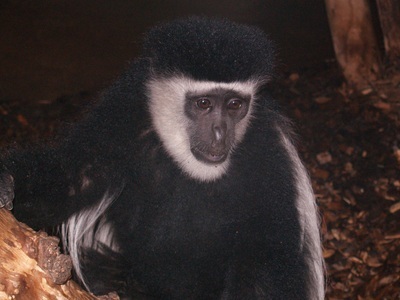 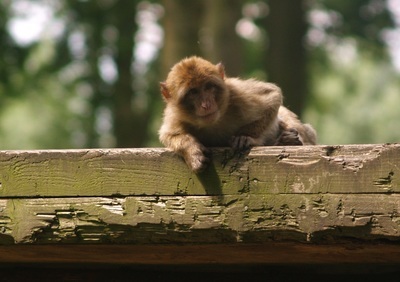 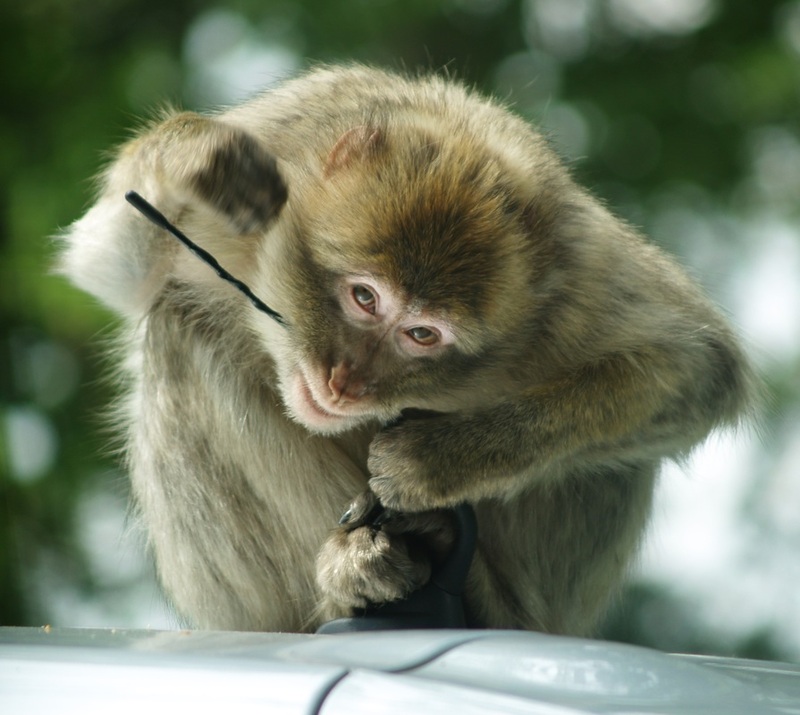 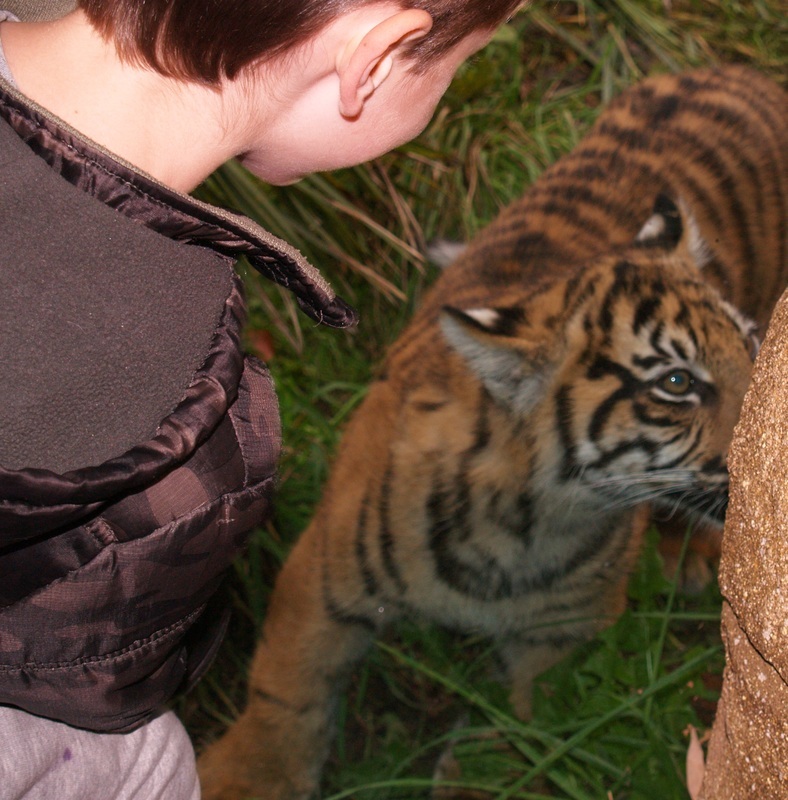 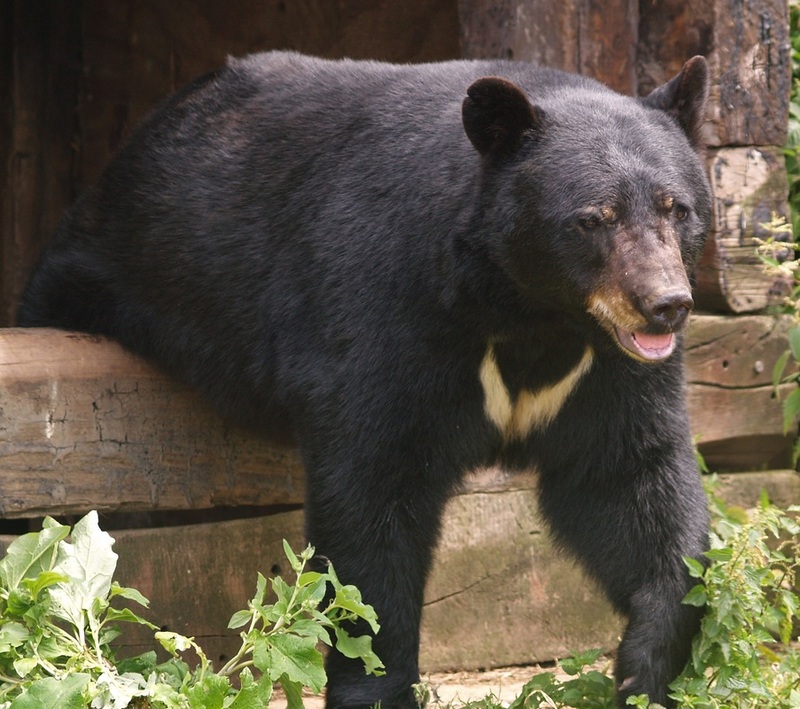 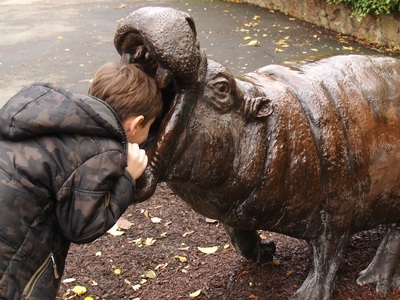 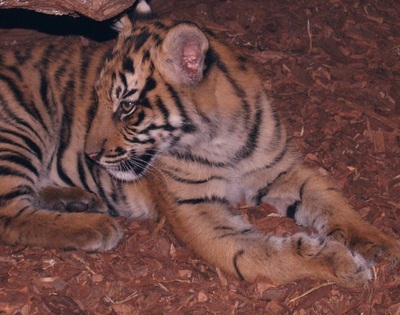 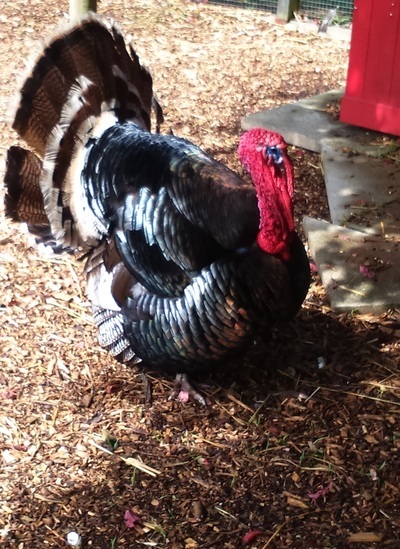 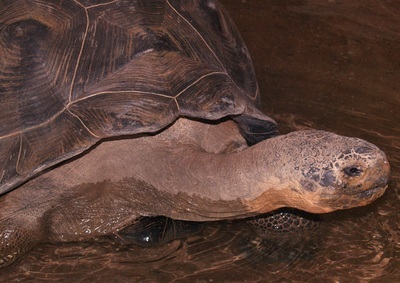 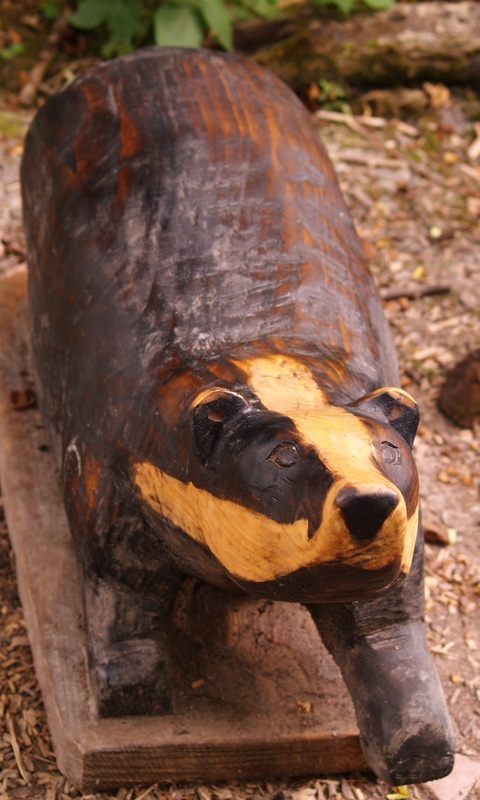 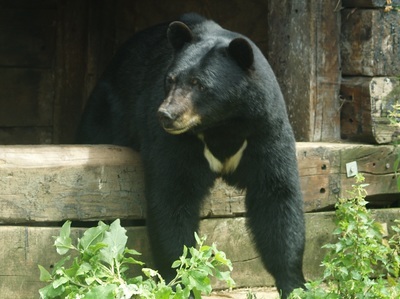 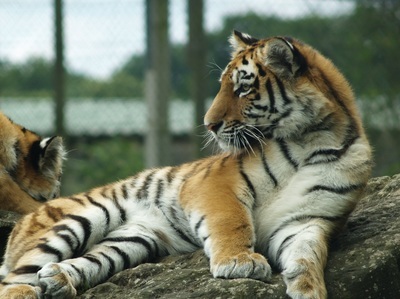 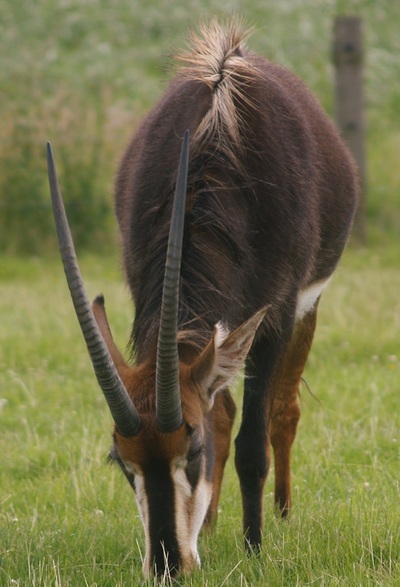 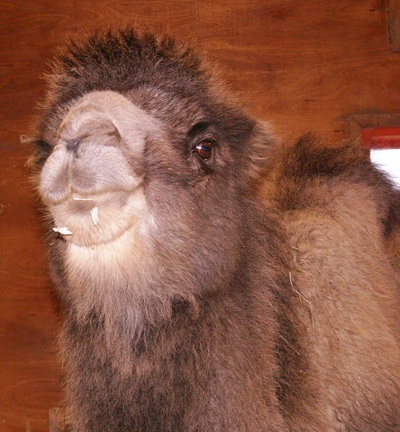 Get close to the animals at Woodside. 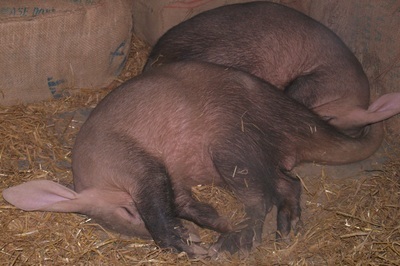 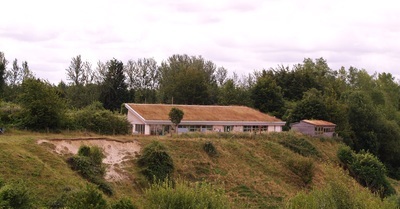 Woodside Animal Farm is just off of the A5 near Dunstable in Bedfordshire, and is well signed from both Dunstable and Luton. 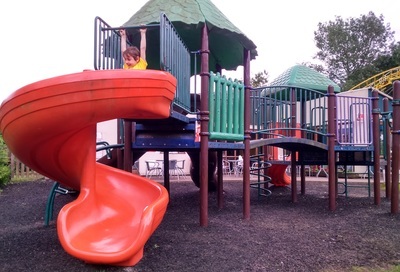 It has lots of free on site parking. 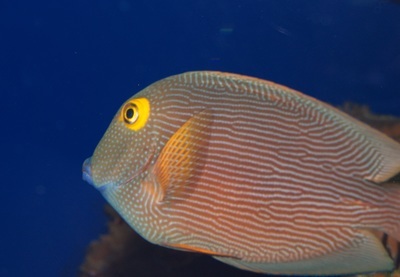 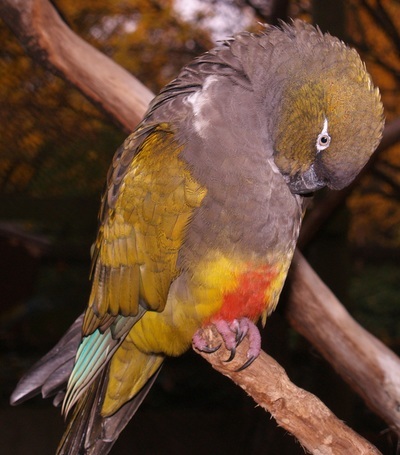 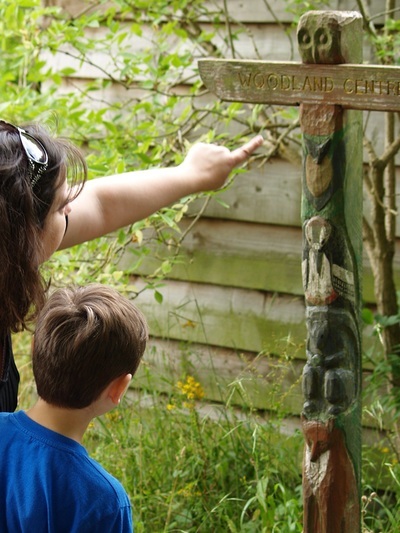 Woodside is a fairly small site but it has some really good opportunities for getting close to a range of different animals and the staff are all incredibly friendly and knowledgeable. You enter via the shop which sells farm animal related toys and also pet supplies and fresh eggs from the farms chickens, geese and quails. At the rear of the shop is an area where there is poultry for sale and there are always some chicks and ducklings on view here. 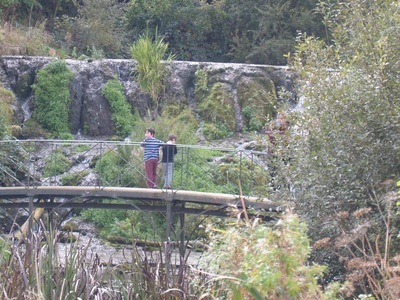 As you head into the main park there are several different areas to visit. 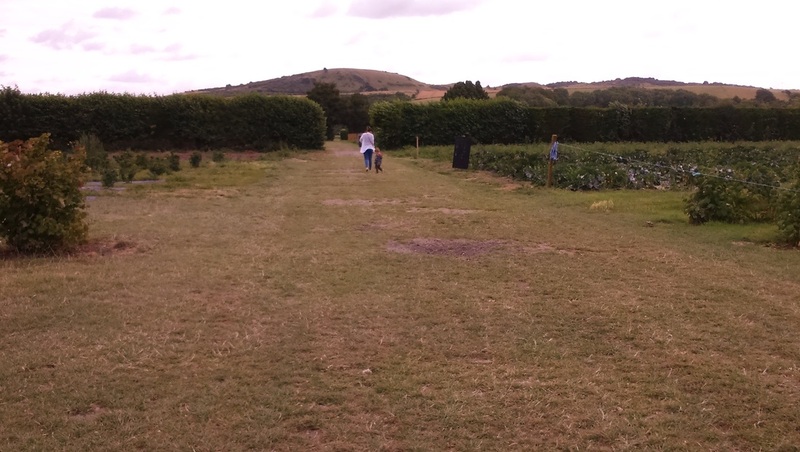 Just in this area alone there are chickens, llamas, a european eagle owl, A tortoise, goats and sheep. There is a free tractor ride that takes place at various times during the day which is really good for getting your bearings of the site. 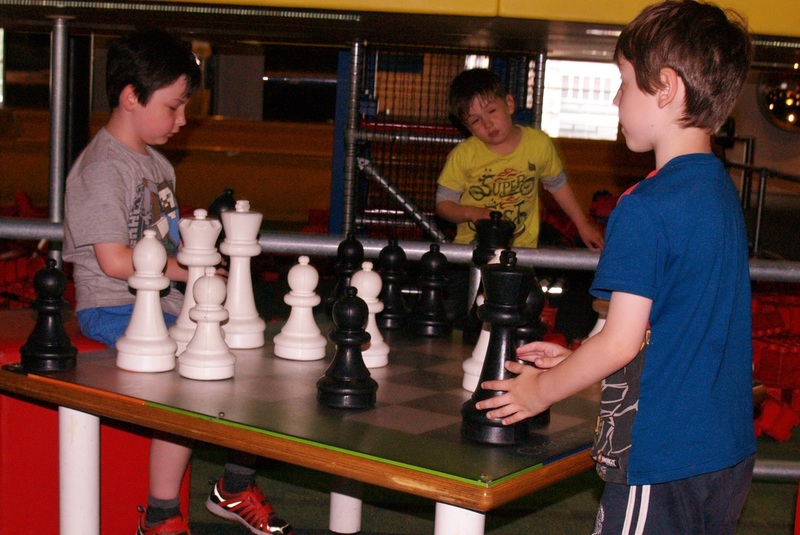 Near here is an indoor soft play barn which is suitable for children aged up to 11 with a separate upstairs area for children under 3. On the ground floor there is a cafe selling snacks, meals, drinks and ice creams. 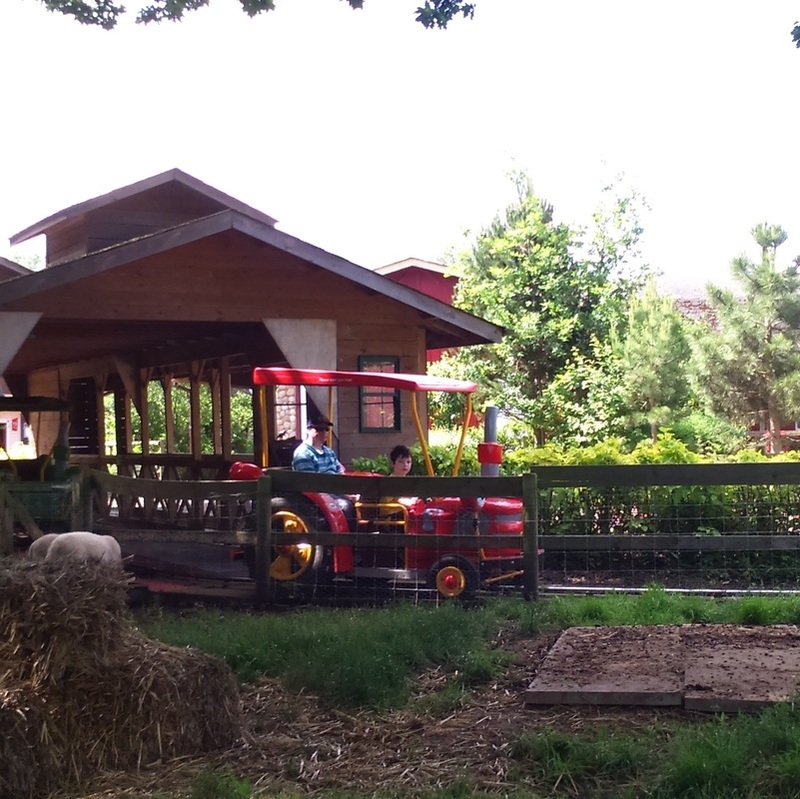 Next to the play barn is the animal handling barn. 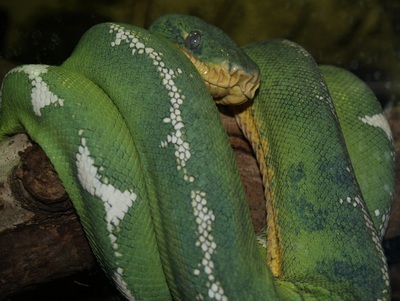 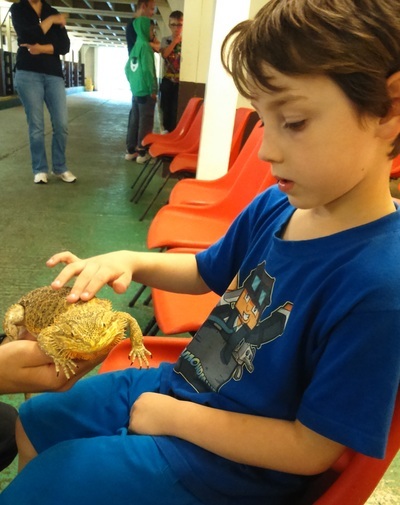 They have various animals in here including rabbits, guinea pigs, chinchillas, corn snakes and a boa constrictor. 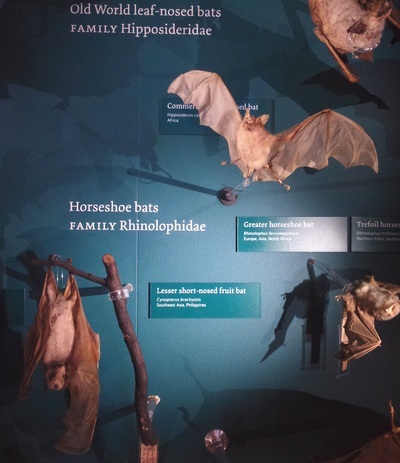 All the animals have information signs about them giving lots of useful facts. t certain times during the day they do a hands on session which I'd highly recommend as the staff are brilliantly knowledgeable and respond really well to the boys questions. 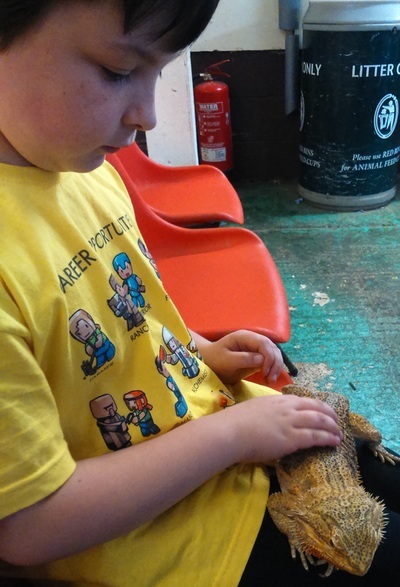 They have held bearded dragons, chicks, rabbits and cornsnakes and got to stroke owls and chinchillas too. 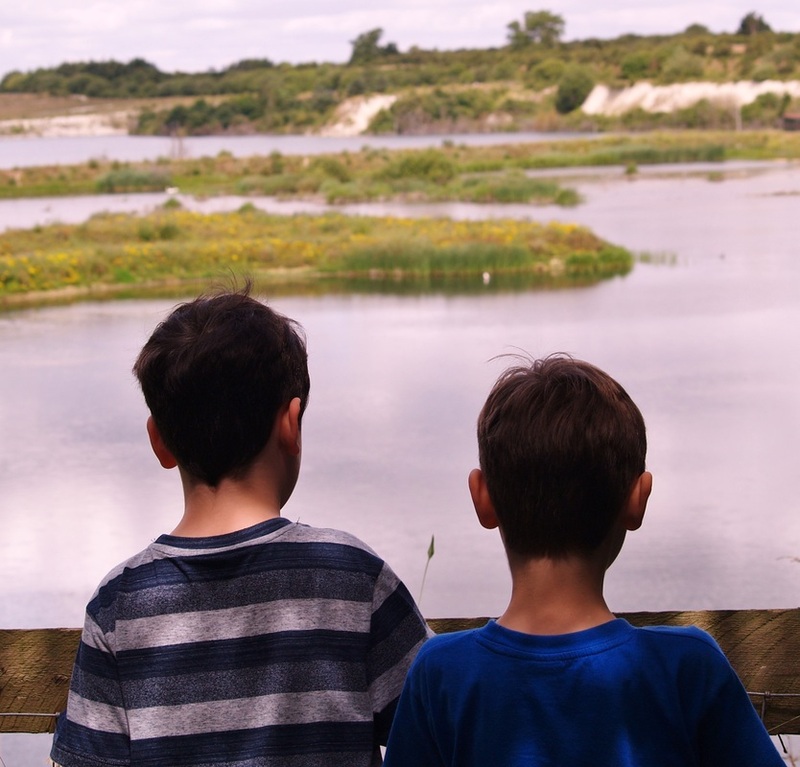 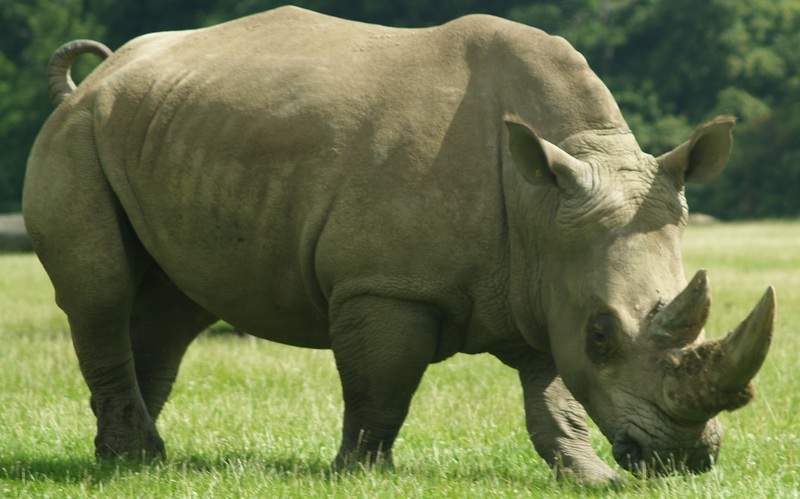 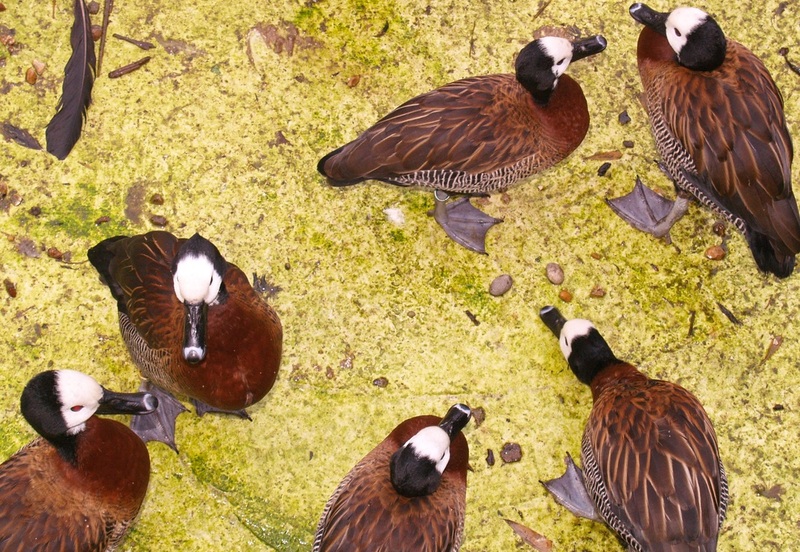 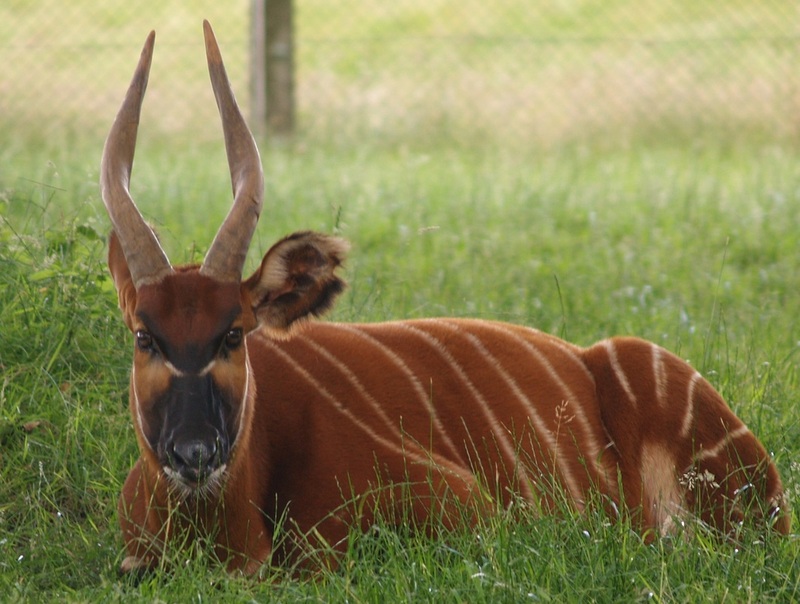 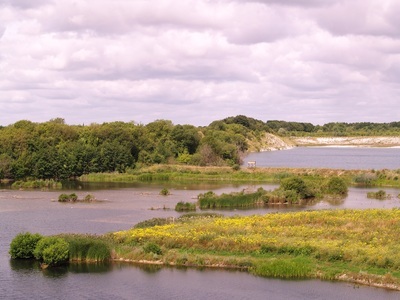 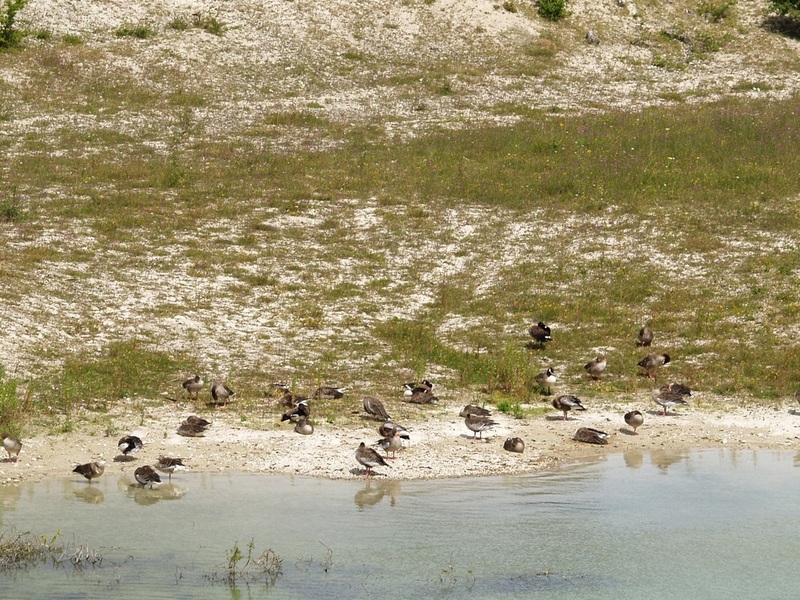 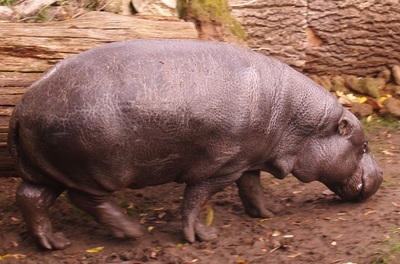 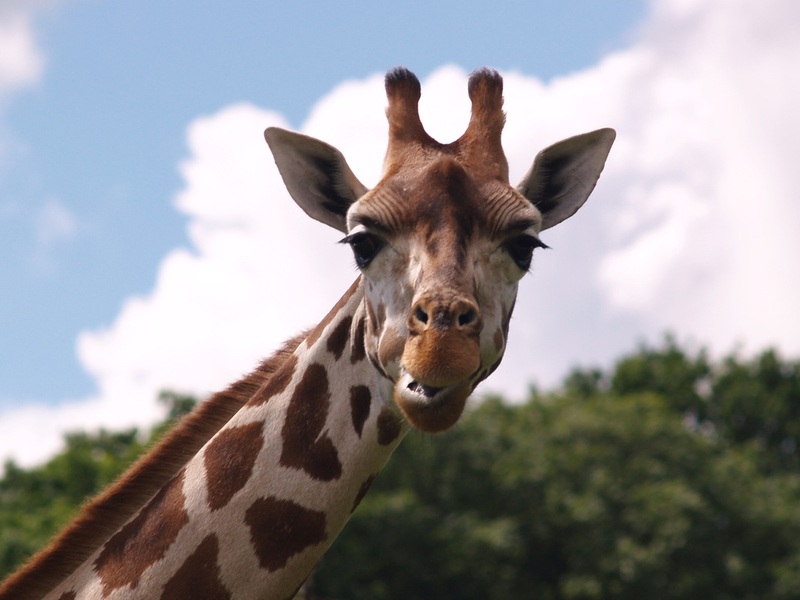 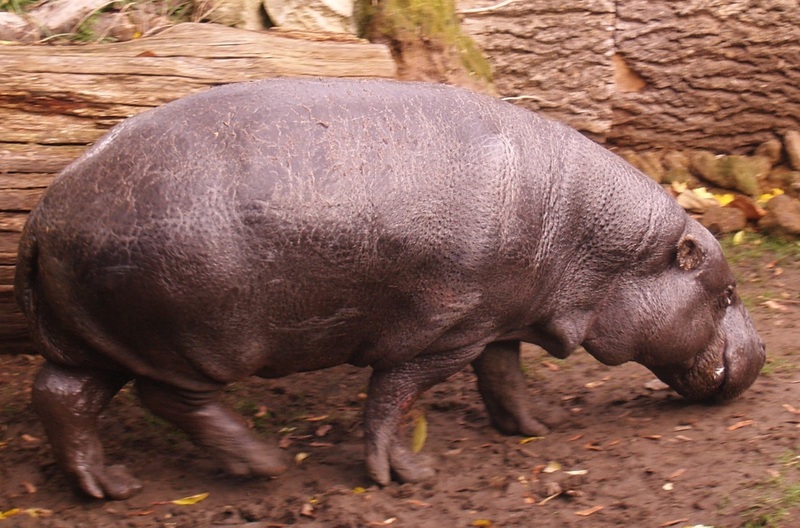 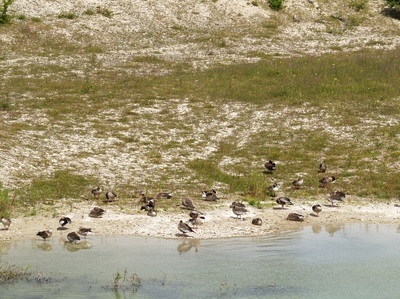 It is worth seeing every area of the park, as there is a really good range of animals to see such as, geese, turkeys, donkeys, shetland ponies, alpacas, flamingos, ibises, peacocks, pigs, and even lemurs. 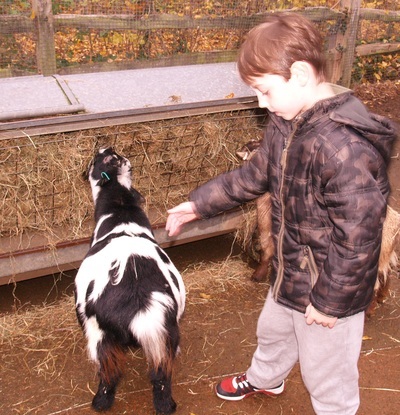 Most of these animals you can feed and the food is available from the shop when you enter. 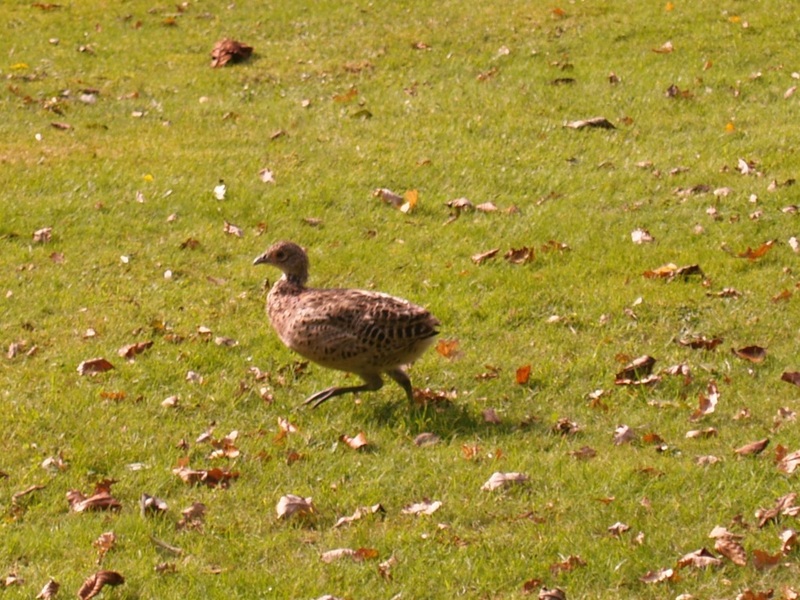 The birds are in a separate walk through area. 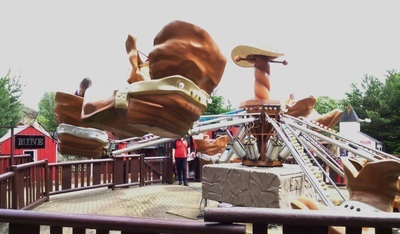 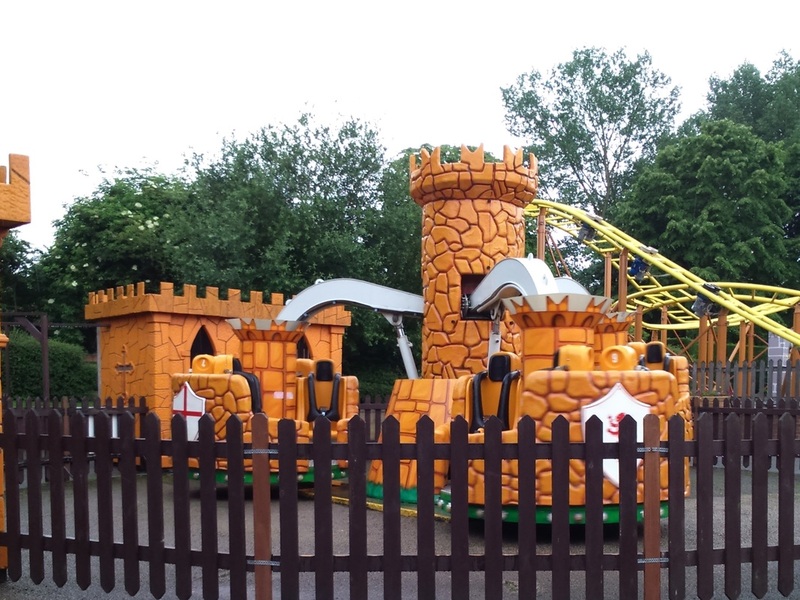 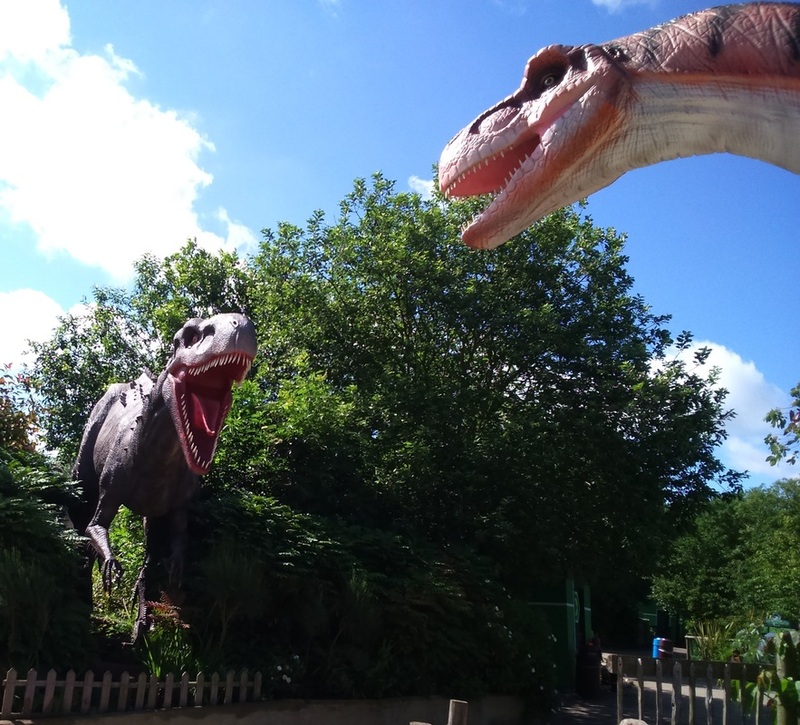 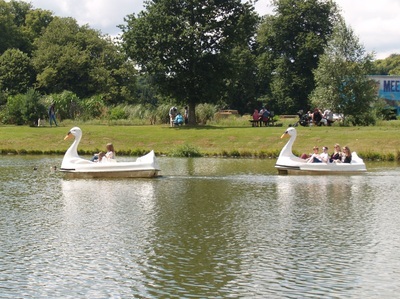 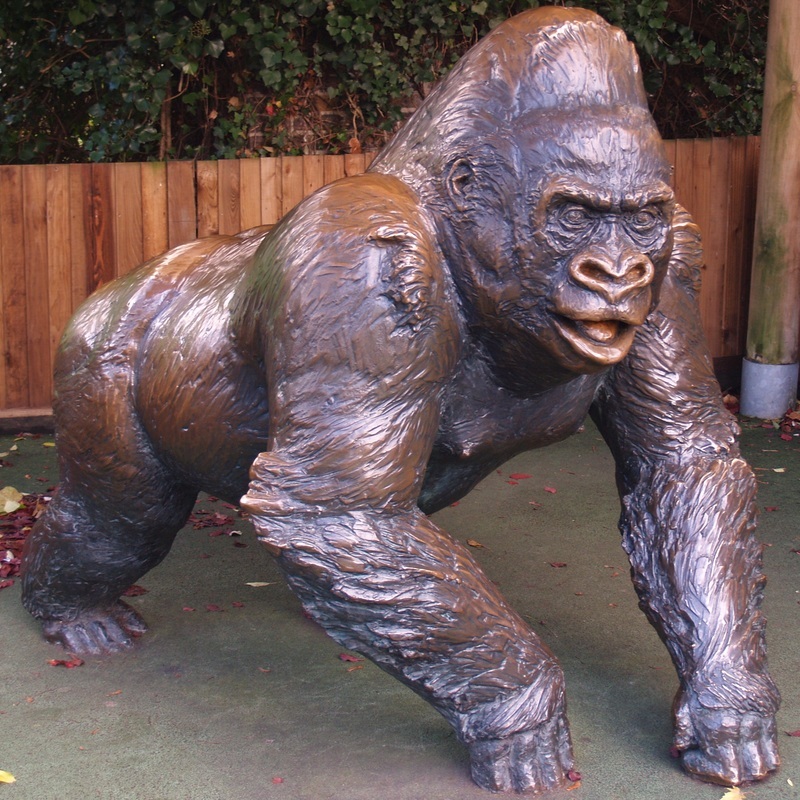 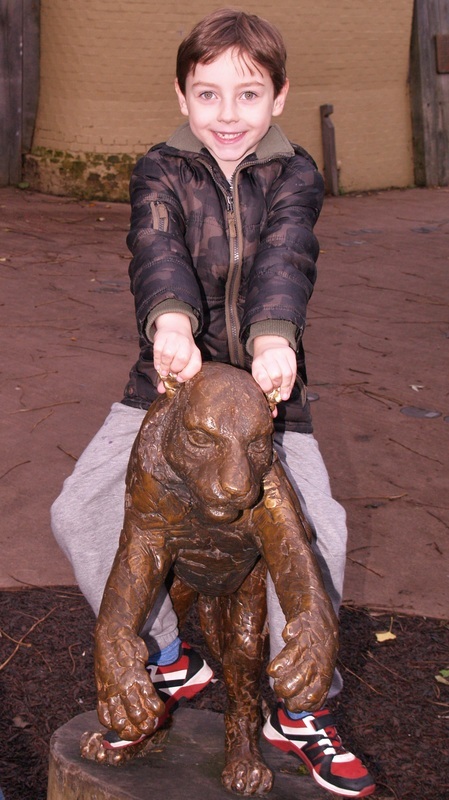 In addition to all of the animals there are little play areas dotted around the park including swings, playhouses for toddlers, a sandpit, an obstacle type play area, bike and scooter area, crazy golf and trampolines. 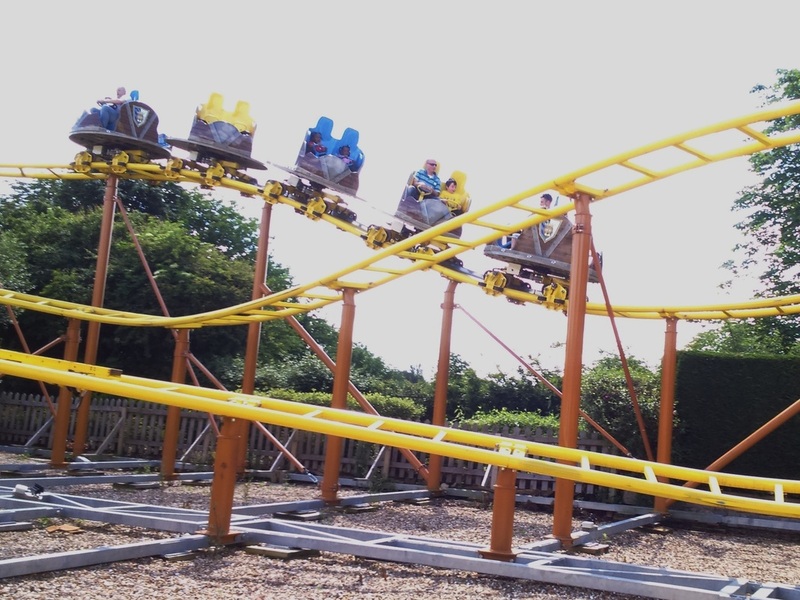 There are also two funfair type rides, a carousel and teacups. 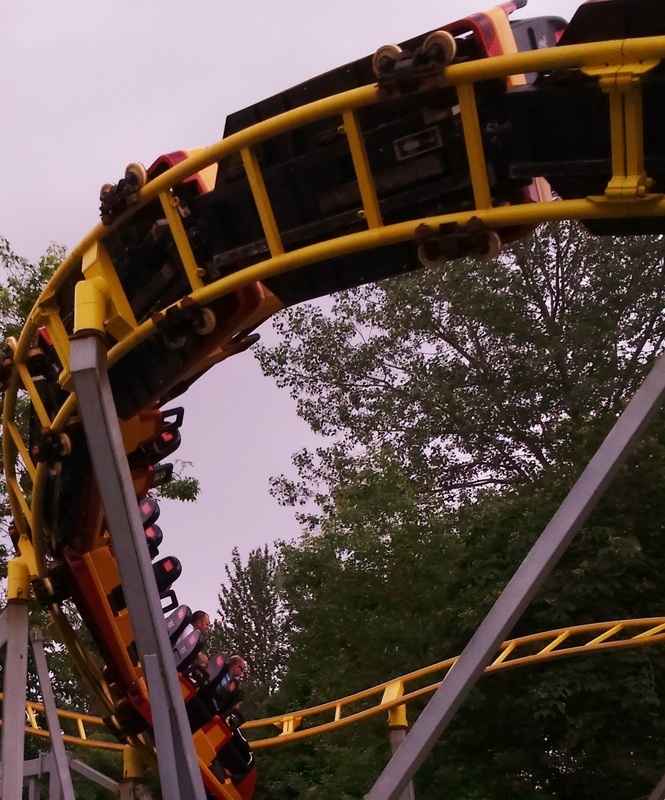 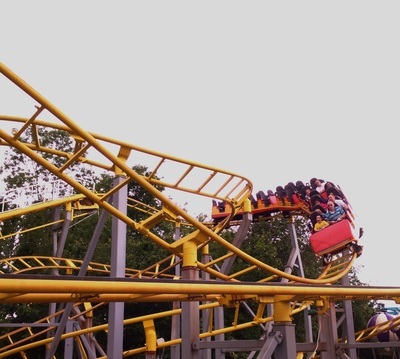 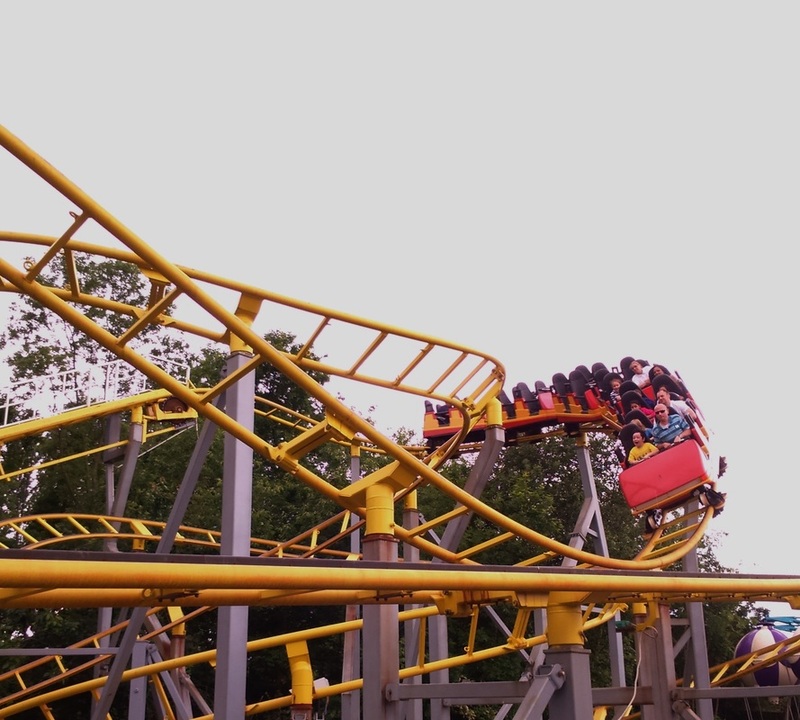 You can go on these as many times as you like and its all included in your entrance. Woodside would take approximatley 2 hours to see everything it has to offer. 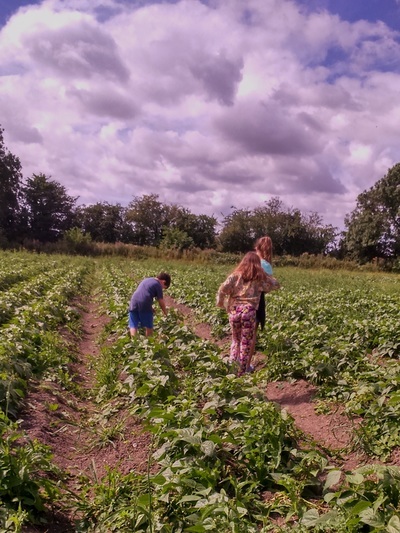 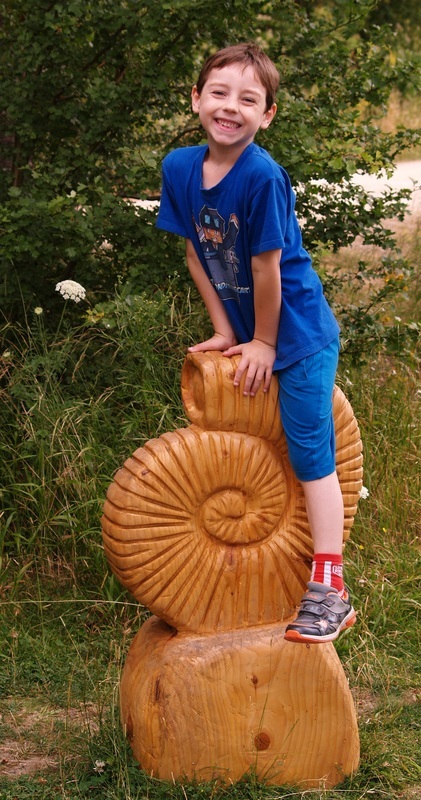 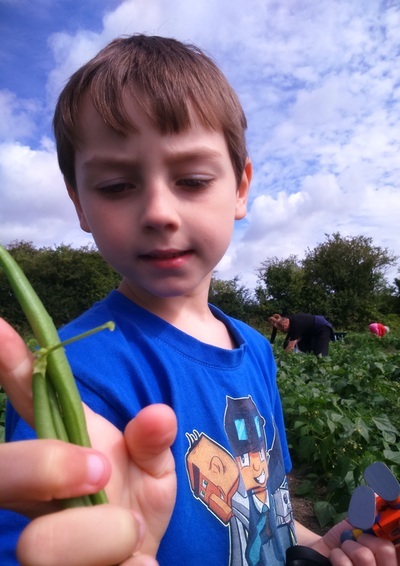 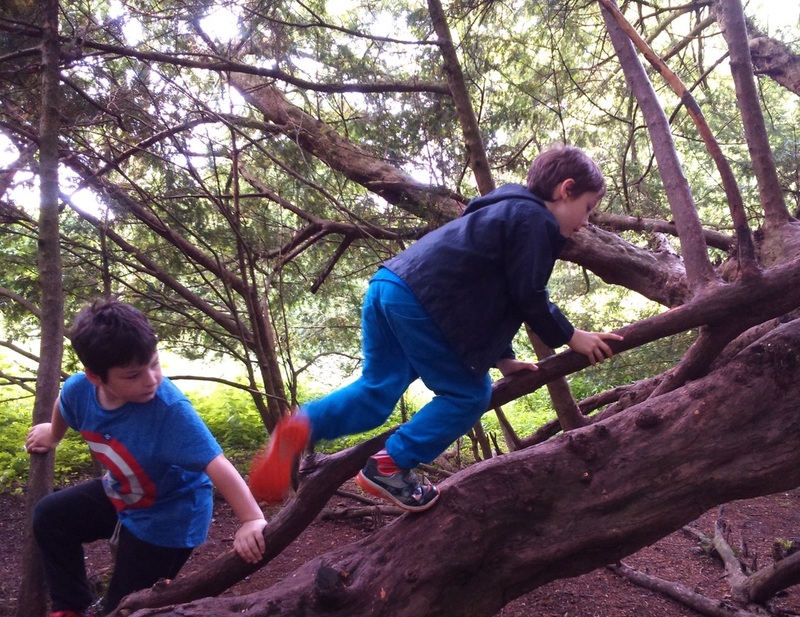 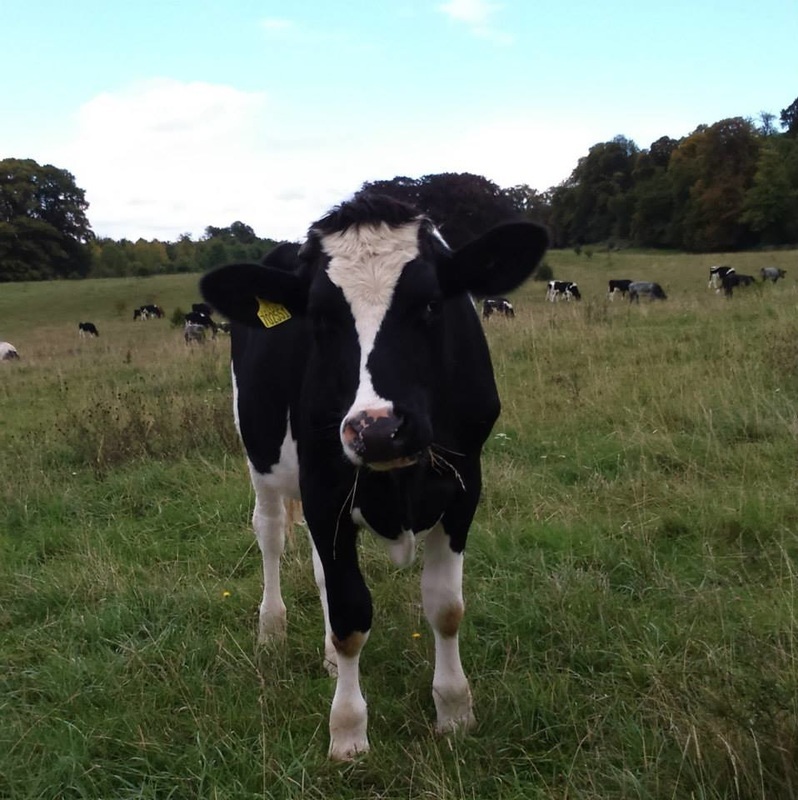 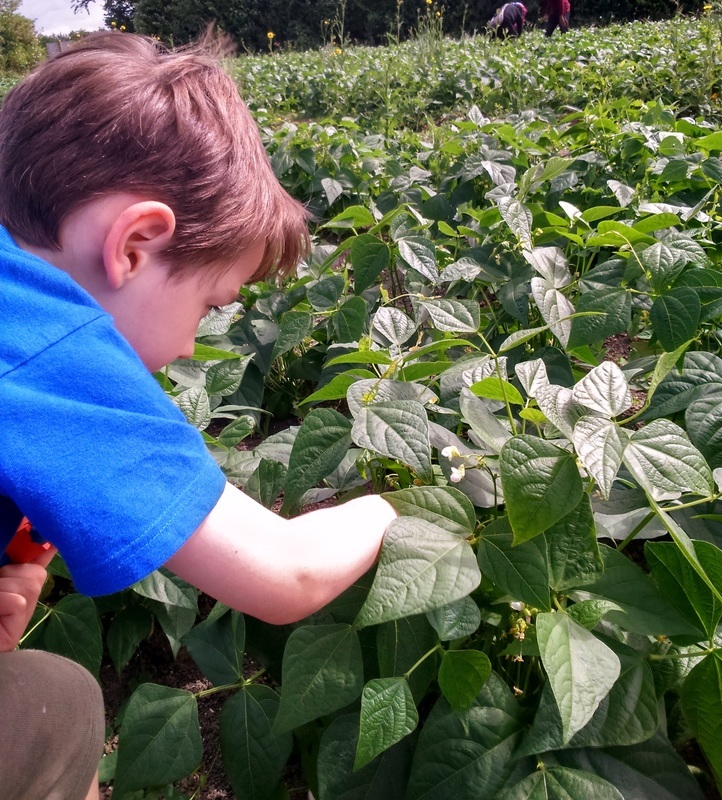 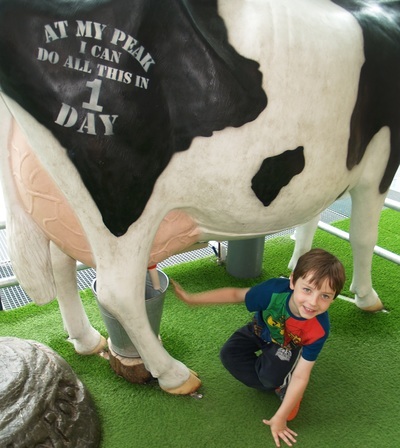 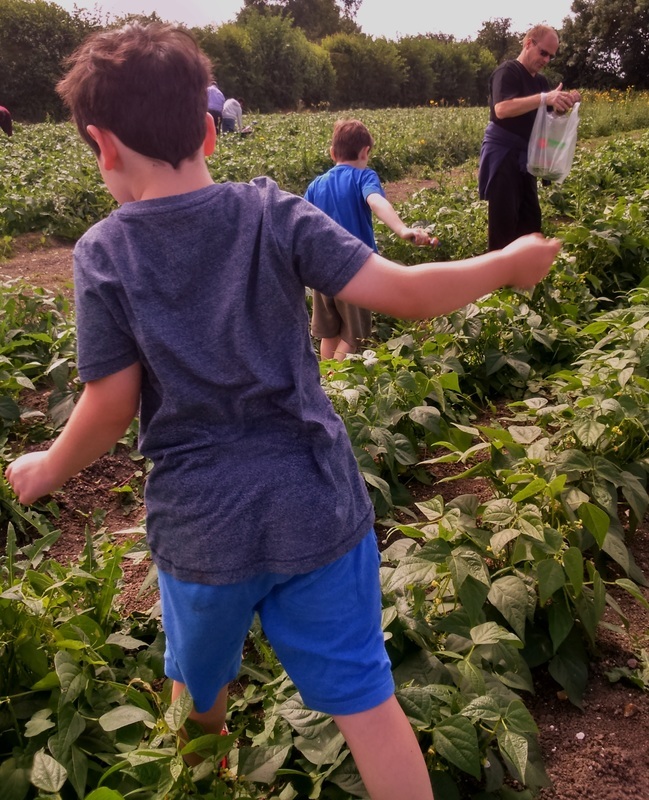 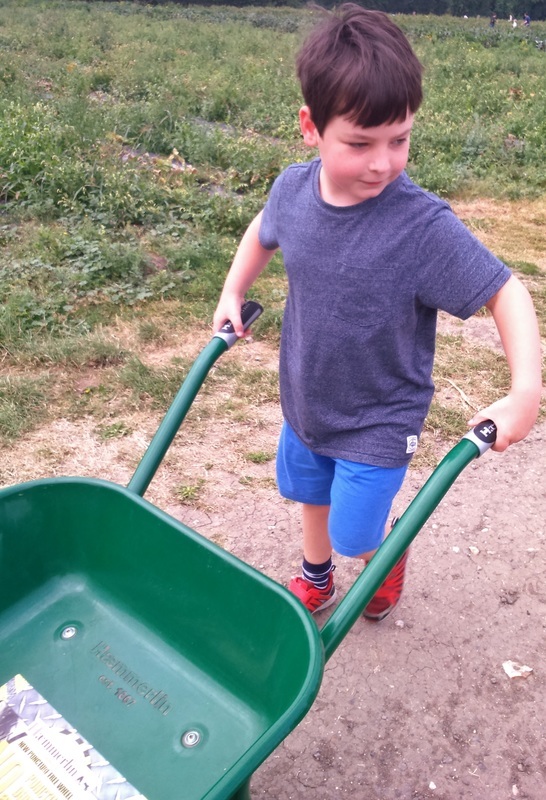 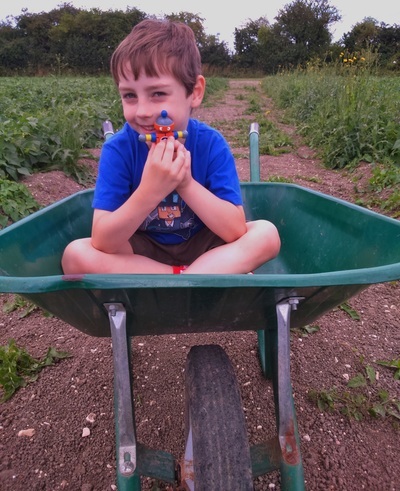 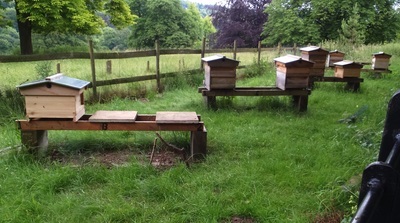 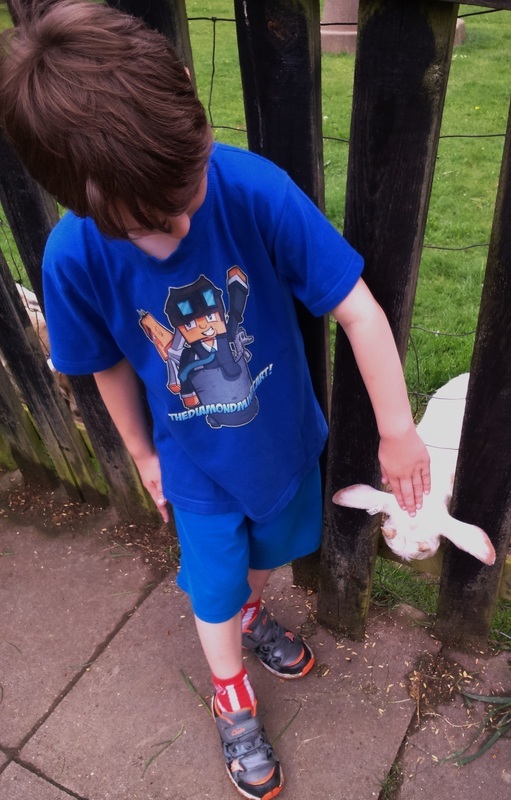 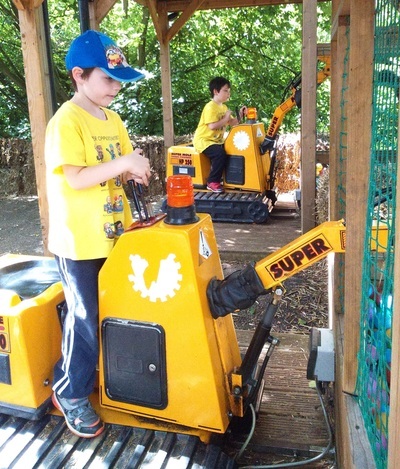 I would recommend it for younger children as the play areas are more suitable for them as our boys now aged 9 and 6 are starting to find them a bit young now compared to other local farms. 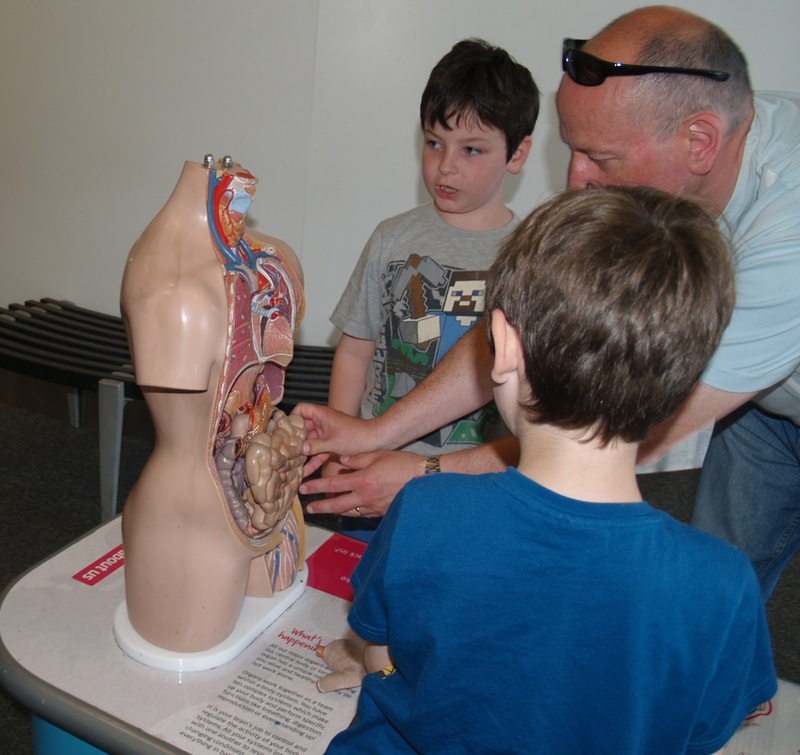 Bodies, Blasts and Bubbles in Bristol. 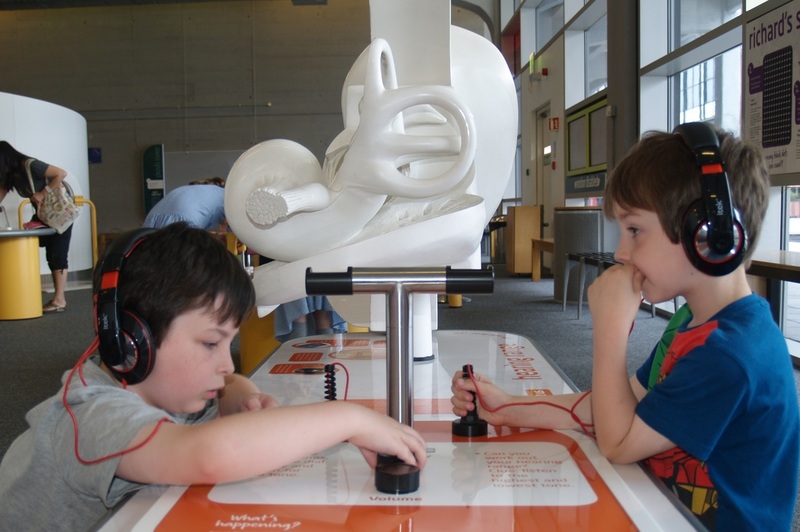 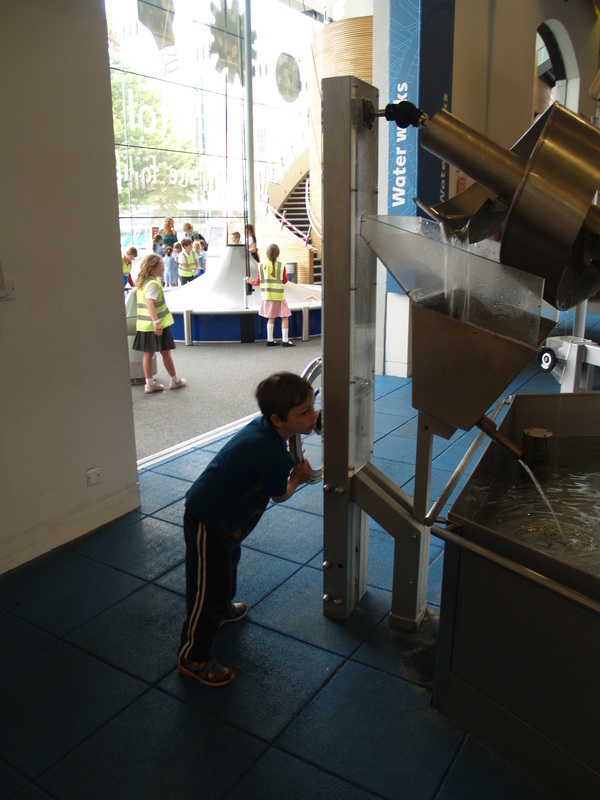 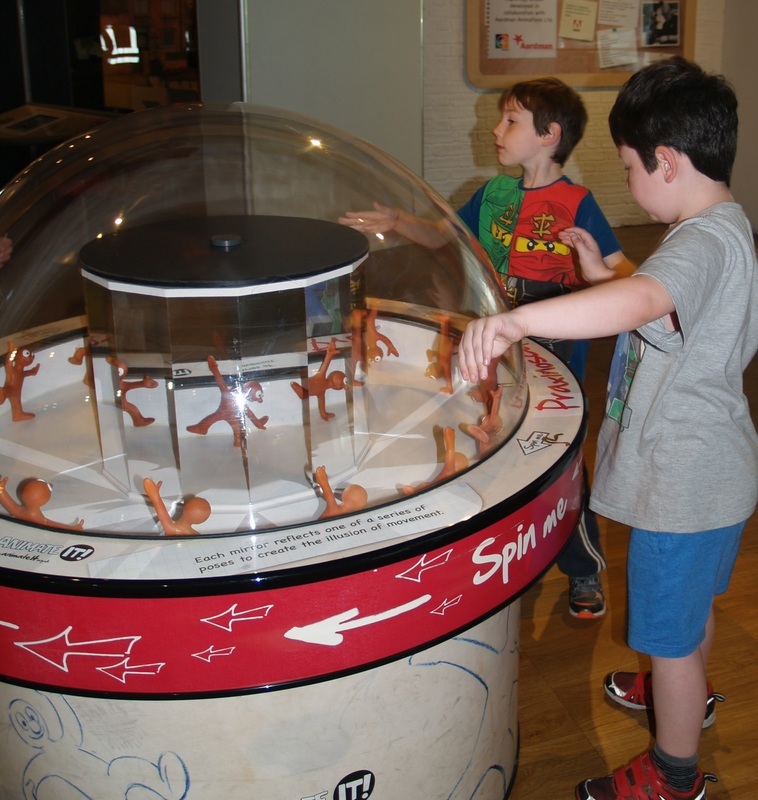 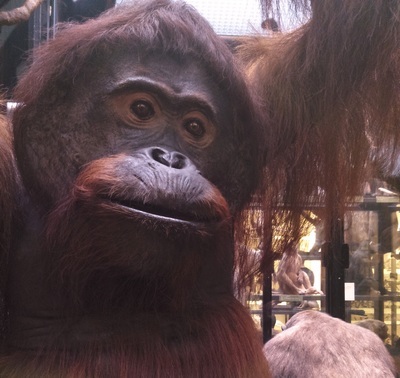 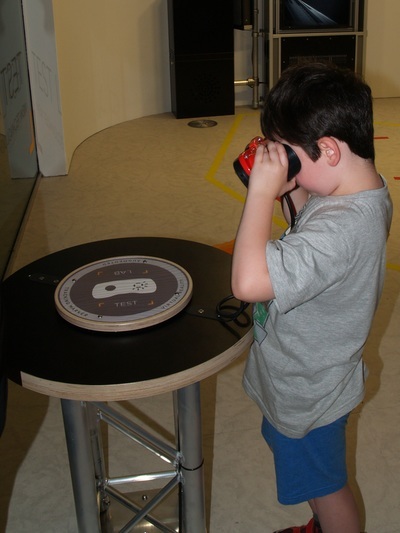 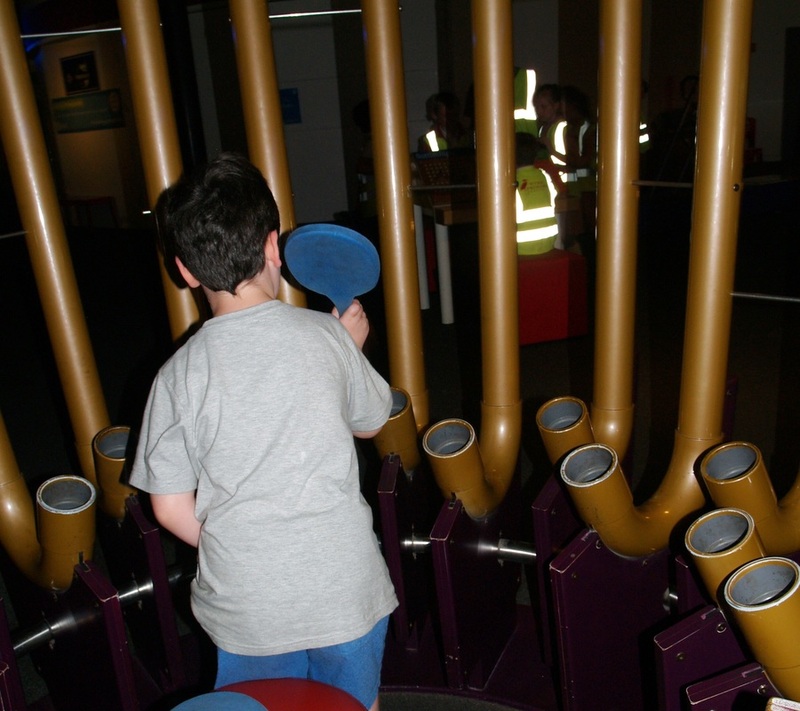 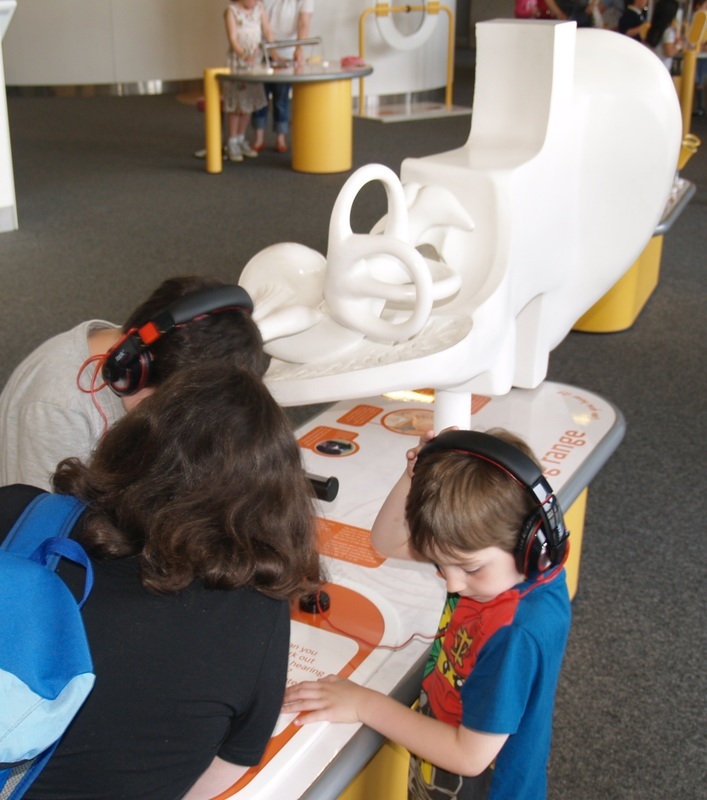 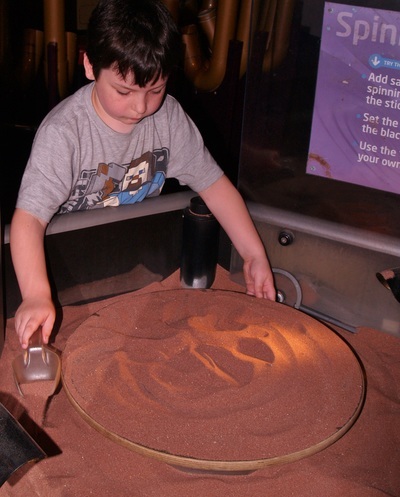 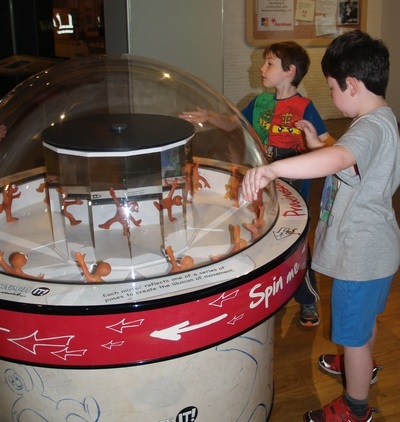 Recently we visited a brilliant science centre called @Bristol. 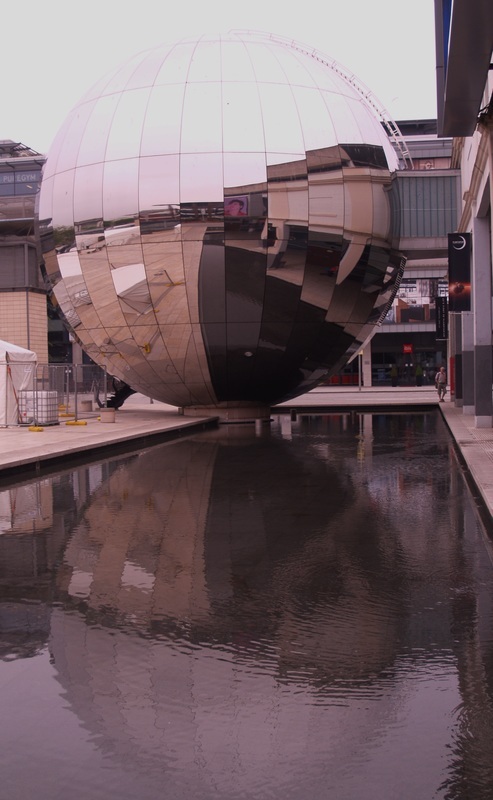 It is in the city centre and is well signed from all approaches to Bristol. 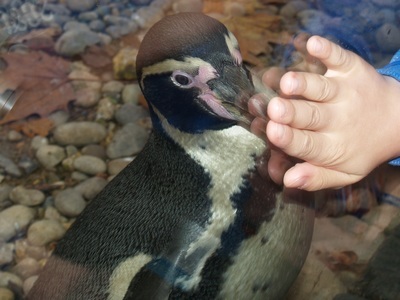 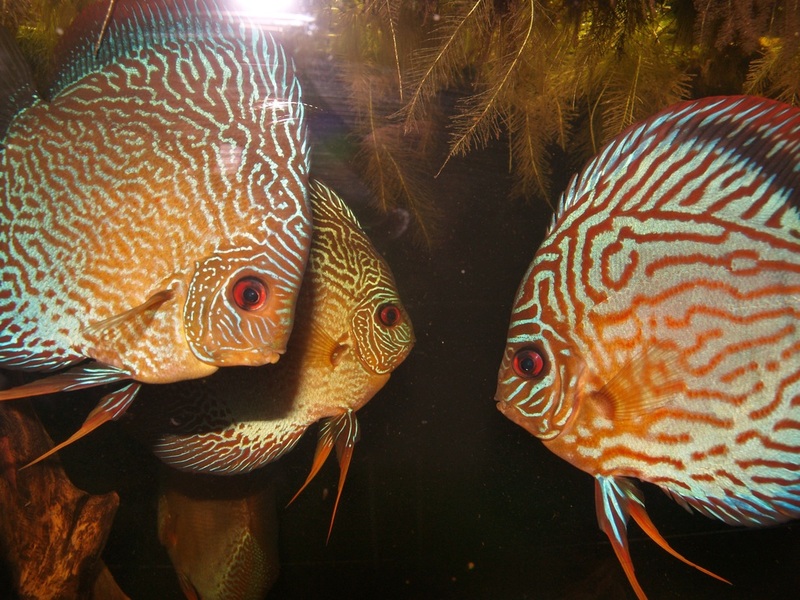 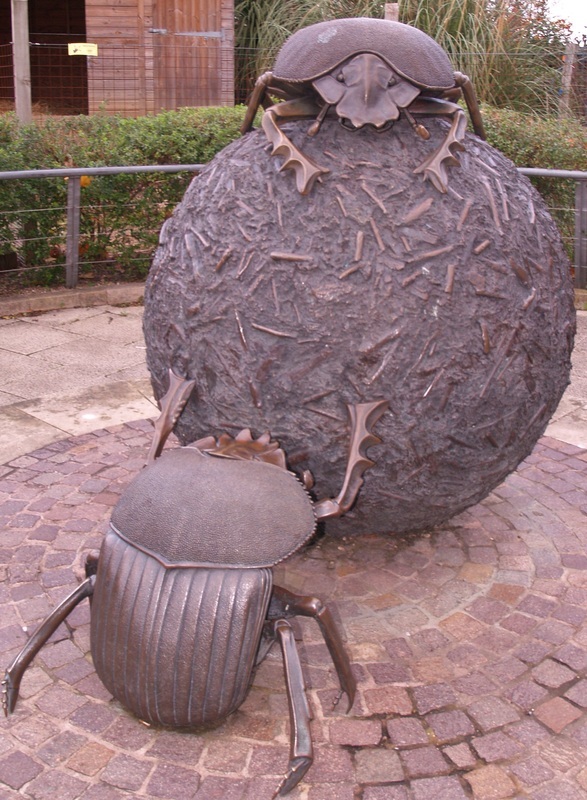 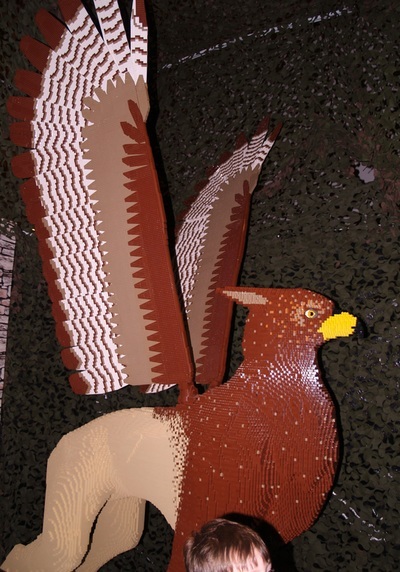 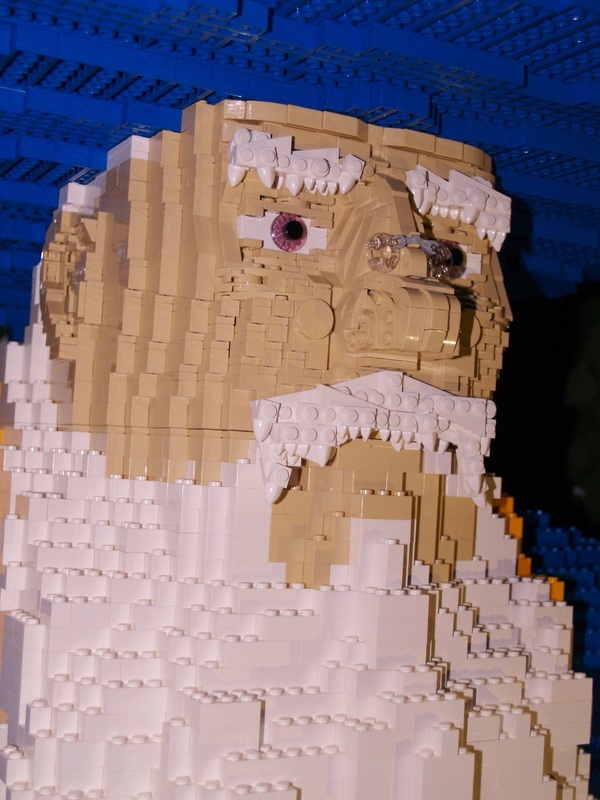 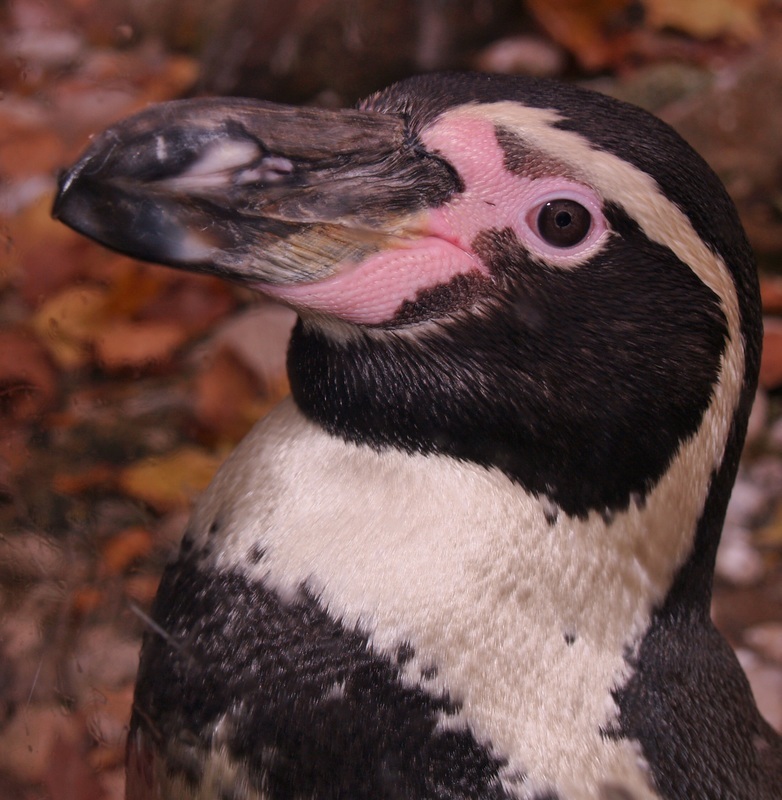 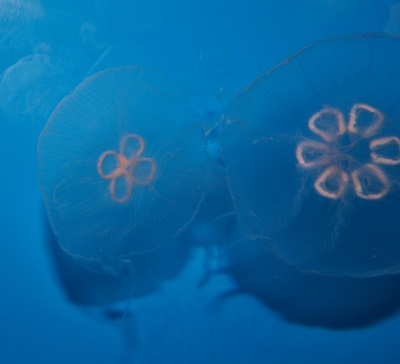 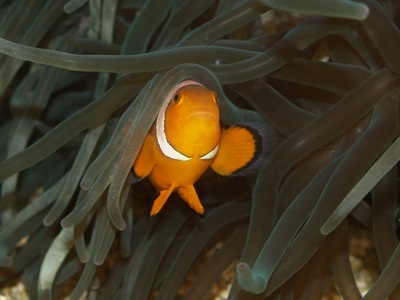 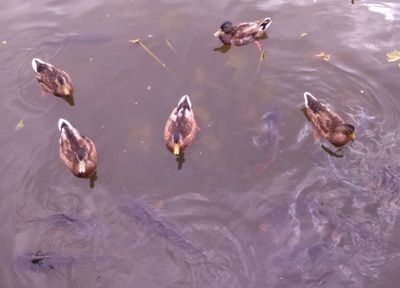 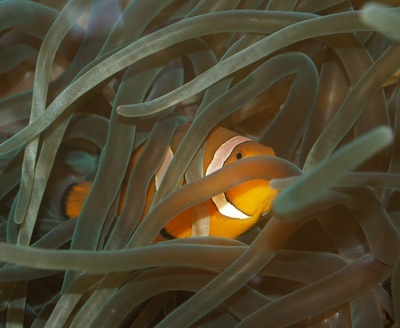 It is also close to other sites such as the next door Bristol Aquarium and SS Great Britain. which is only a 5 minute walk away. 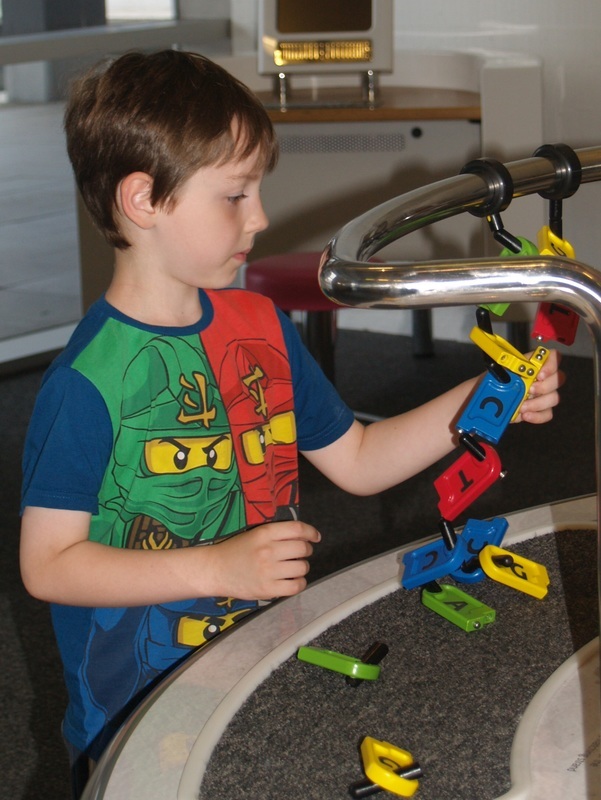 The centre does not have its own car parking though but there is multi-storey car park less than a 3 minute walk away which we used. 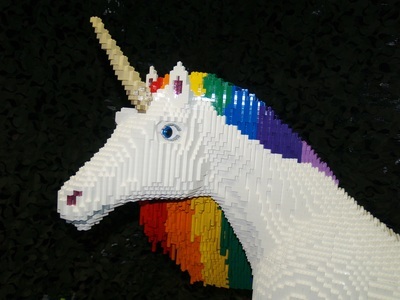 @Bristol is a fully interactive and immersive science centre. 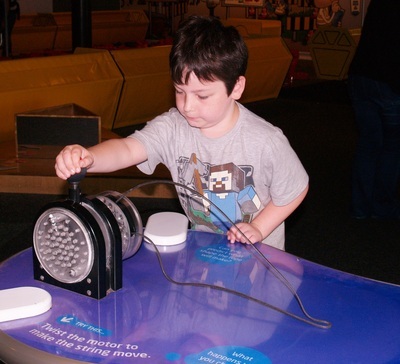 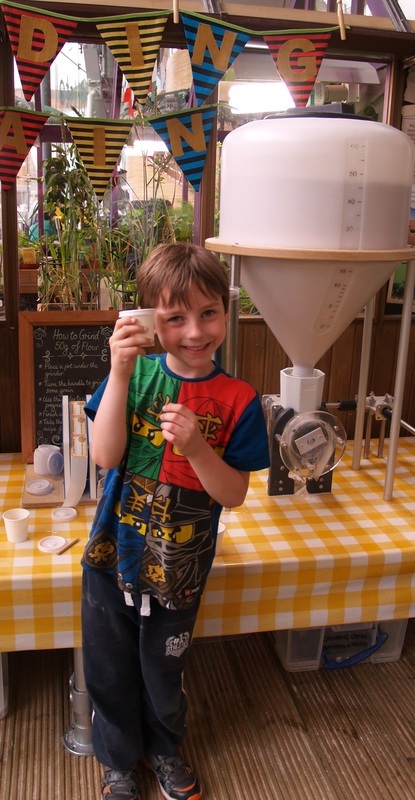 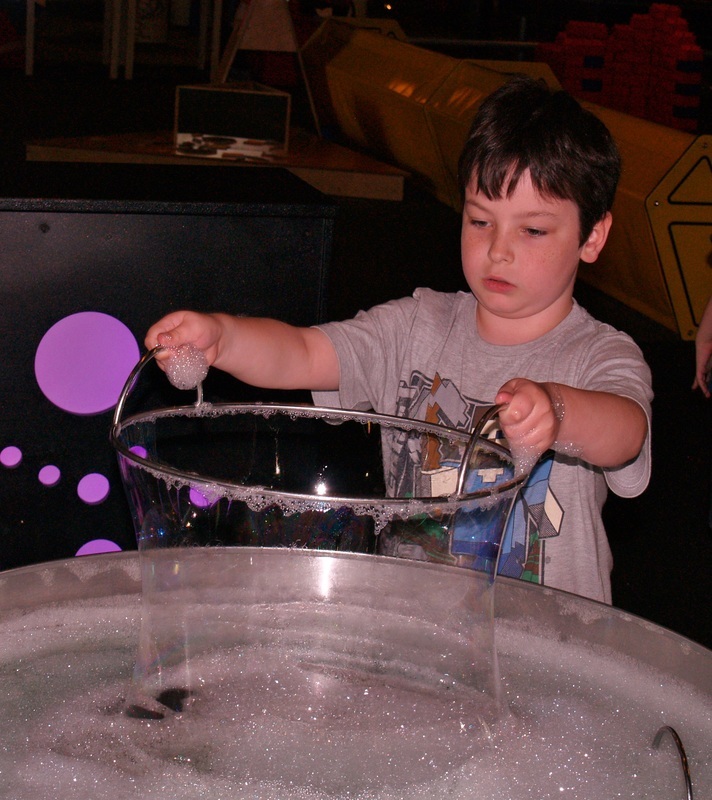 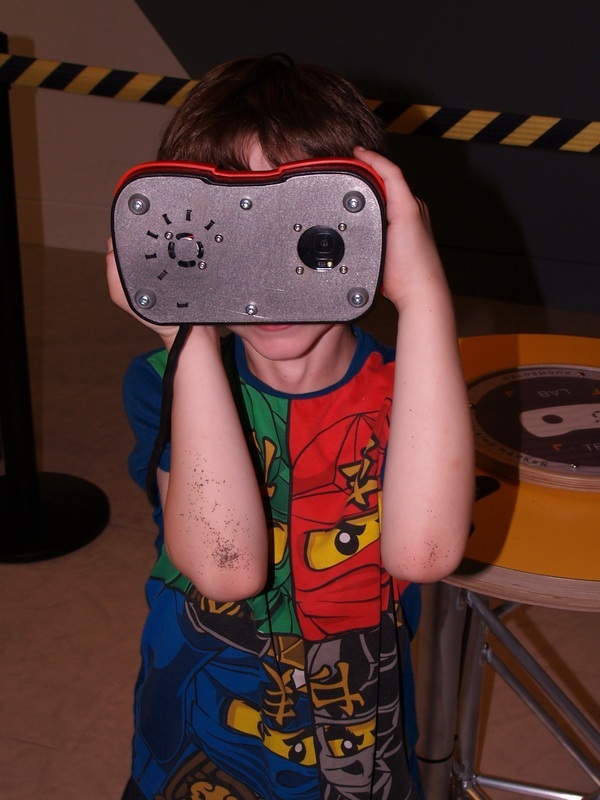 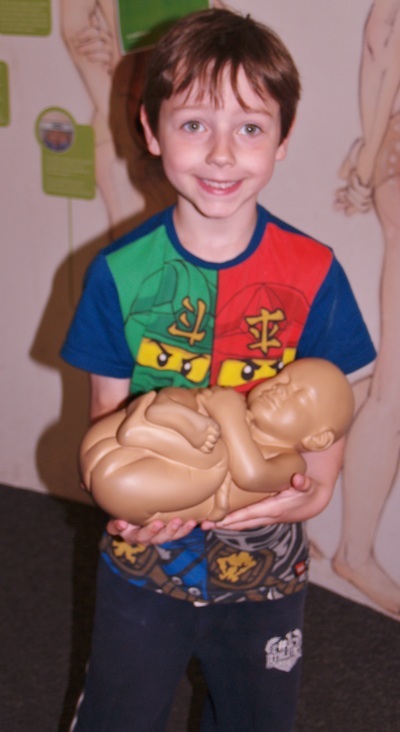 Every exhibit is hands on and there really are things to suit all ages from toddlers to adults. There are planetarium shows throughout the day and we'd highly recommend them . 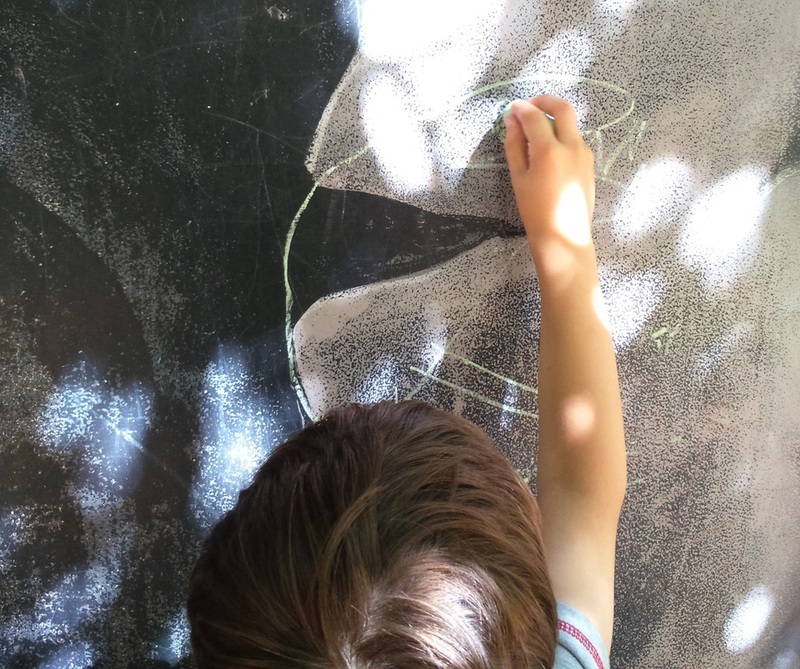 We watched one called "We are Aliens" and it was really good. 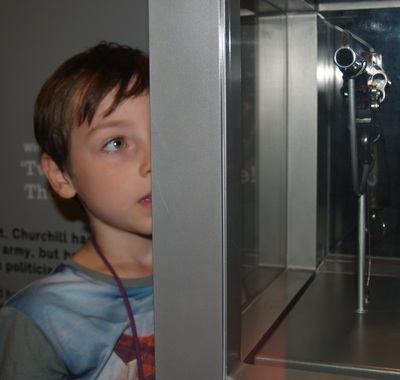 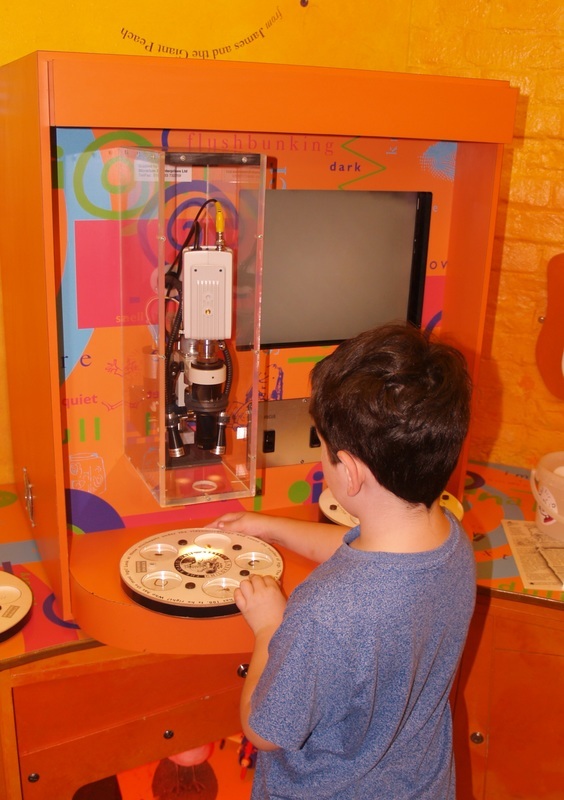 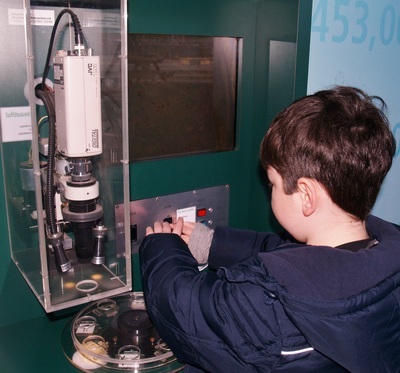 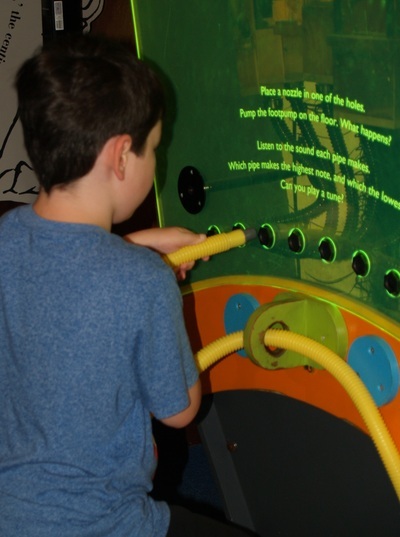 All areas of science are explored, there are exhibits about your senses, DNA, Brains, Childbirth etc all in one area and a favorite for the boys was a vein viewer machine that showed you where your veins are inside your body by scanning your arm. 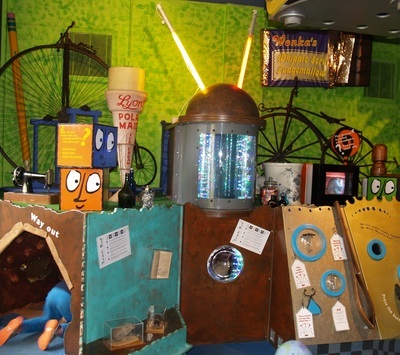 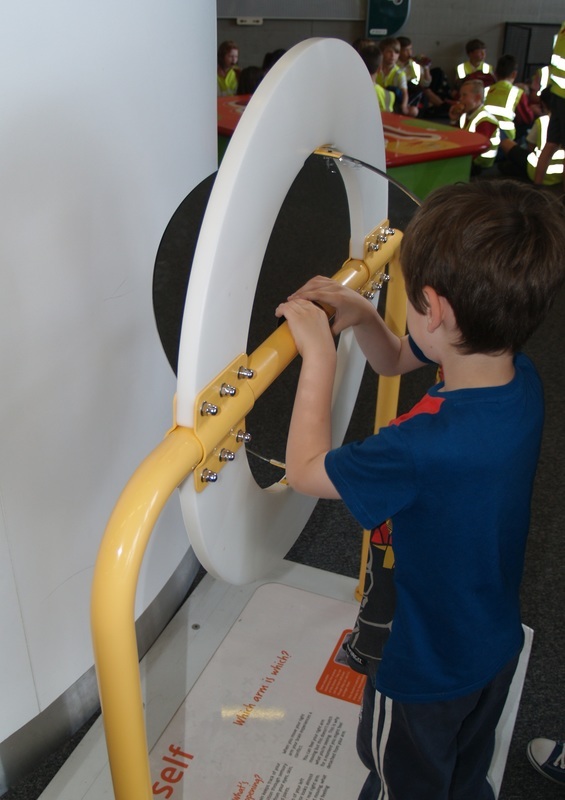 There are exhibits about food and where it comes from, water and different ways to control it, electrical circuits, planets and space and even a giant hamster wheel that you can run in which was a big hit especially with Les !! 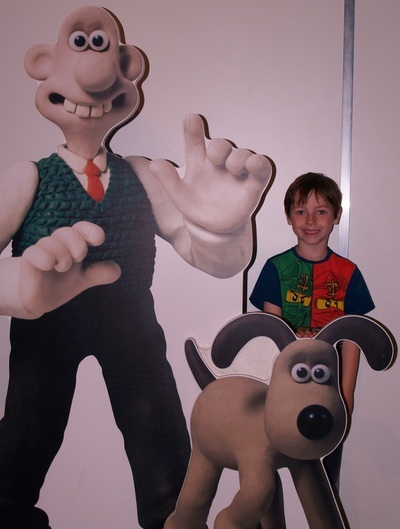 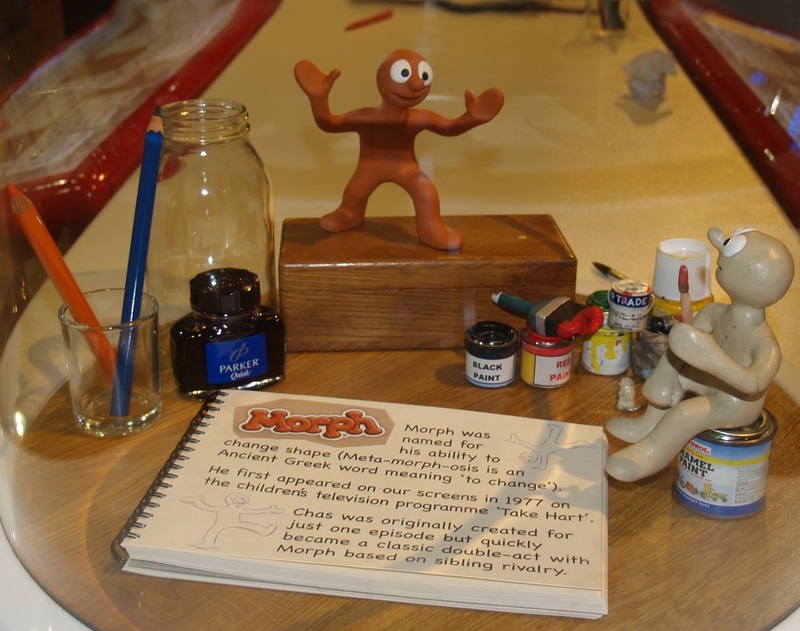 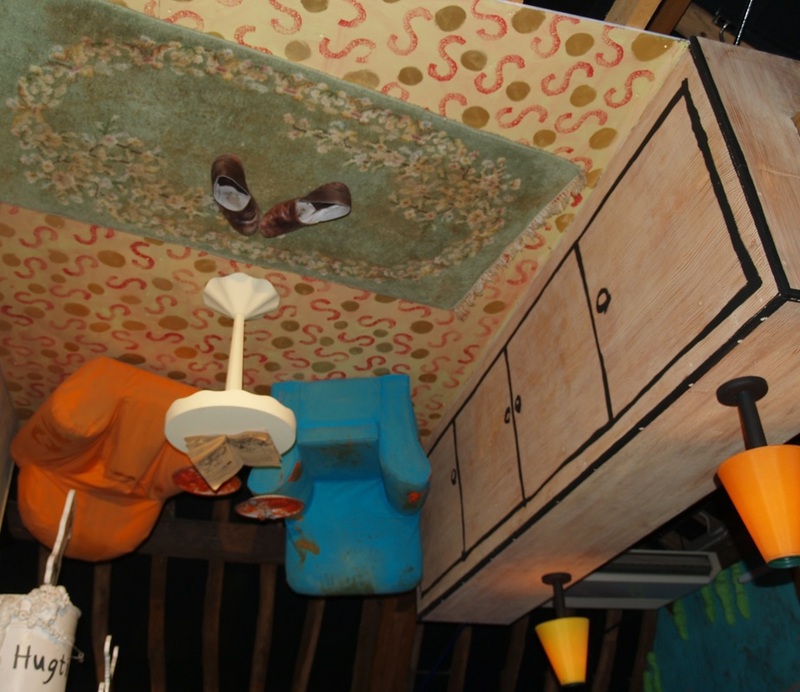 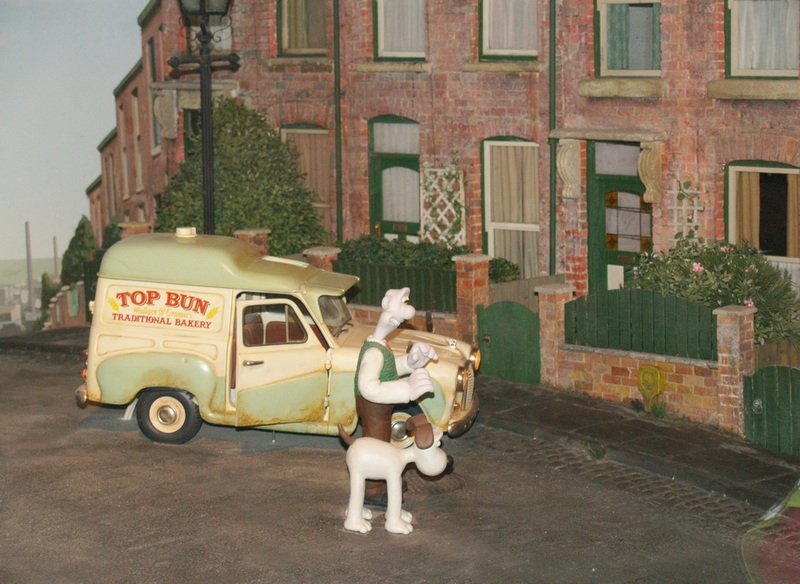 There is also a great area upstairs which is partially dedicated to animation and particularly to Aardman films and characters such as Wallace and Gromit , Shaun the Sheep and Morph as they orginate from Bristol. They have tracing tables, various tools and computers you can use to make your own animations and models of some of the main characters. 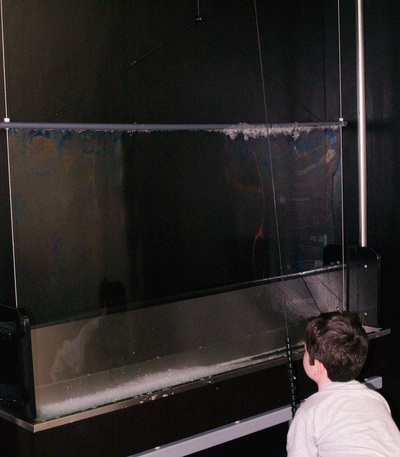 Also upstairs are various exhibits about structures, vibrations, magnetism, construction, and extreme weather, and a really fab corner all about bubbles where you could make some really humungus ones. 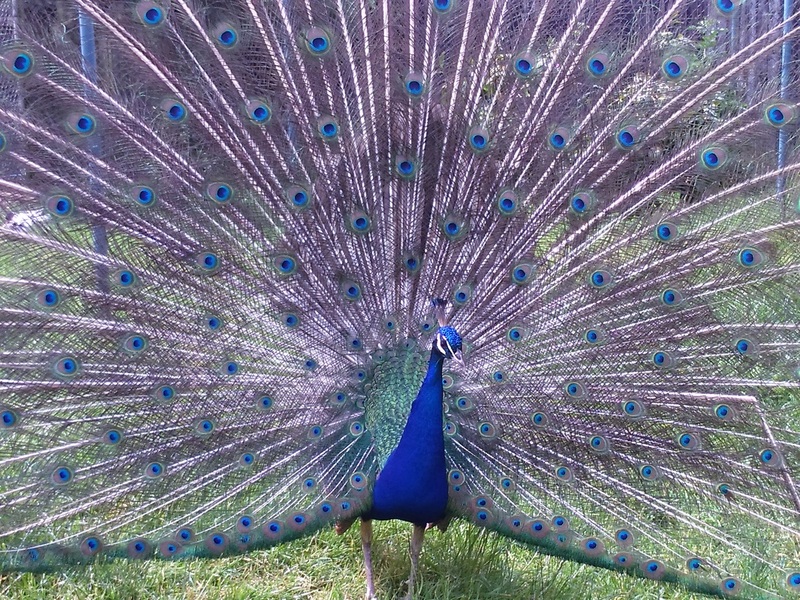 The staff are fabulous. 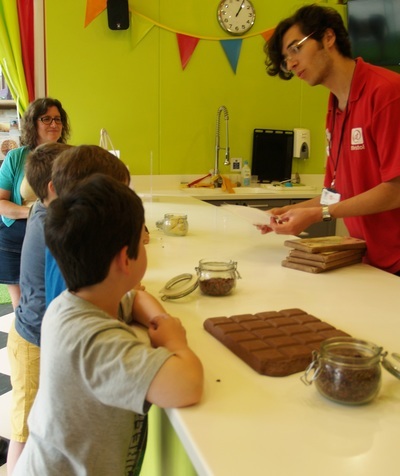 They did a chocolate workshop for the boys telling them all about how chocolate is made, how to taste it like a pro (the highlight for them !) 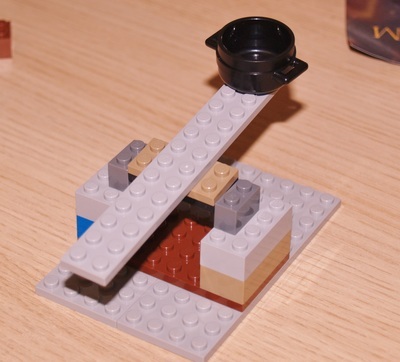 and what is used to make white, milk and dark chocolate. The man doing it was so engaging and the children loved it. 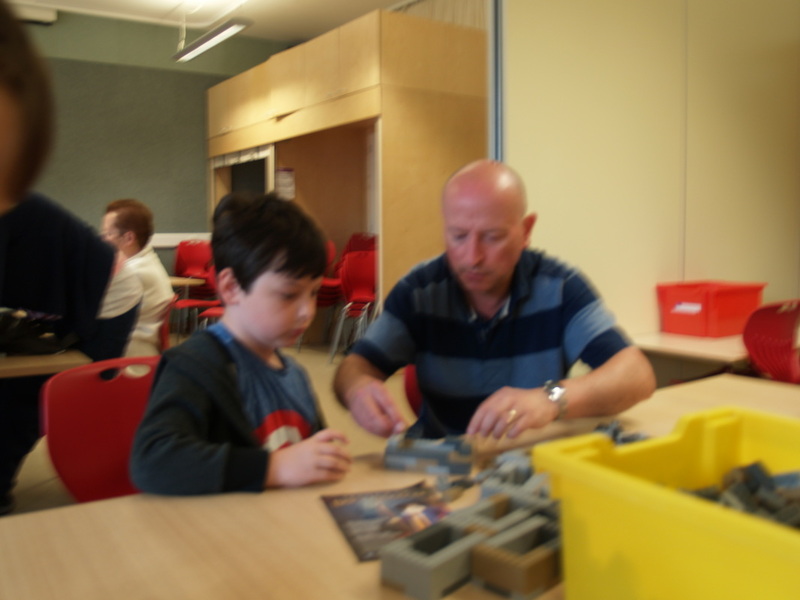 There were other workshops during the day too and plenty of members of staff wandering around and talking to children to explain what they were looking at etc. 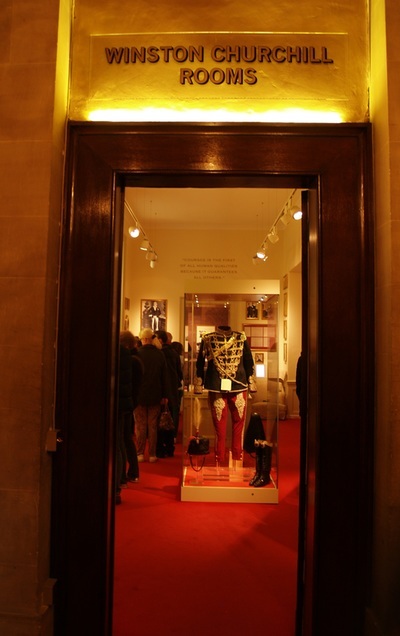 As you exit there is a small shop which had some really interesting things and a small cafe area. I would highly recommend a visit. 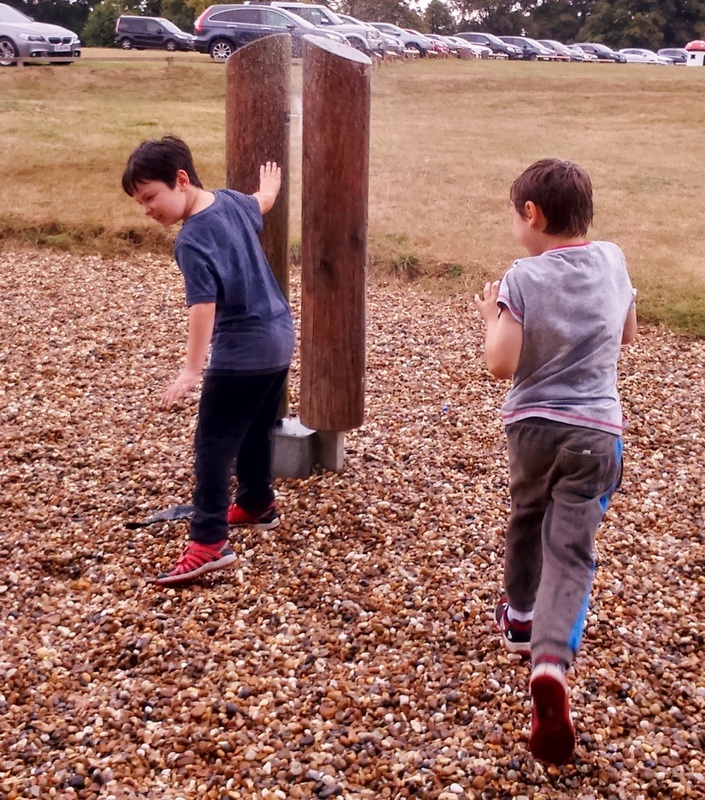 We were there for 6 hours and still probably didn't get to do it all, so a full day of fun. 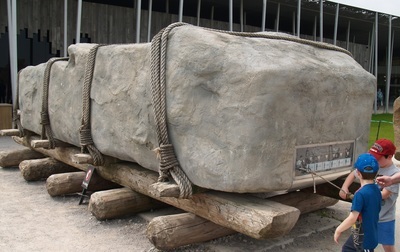 Going back to the stone age. 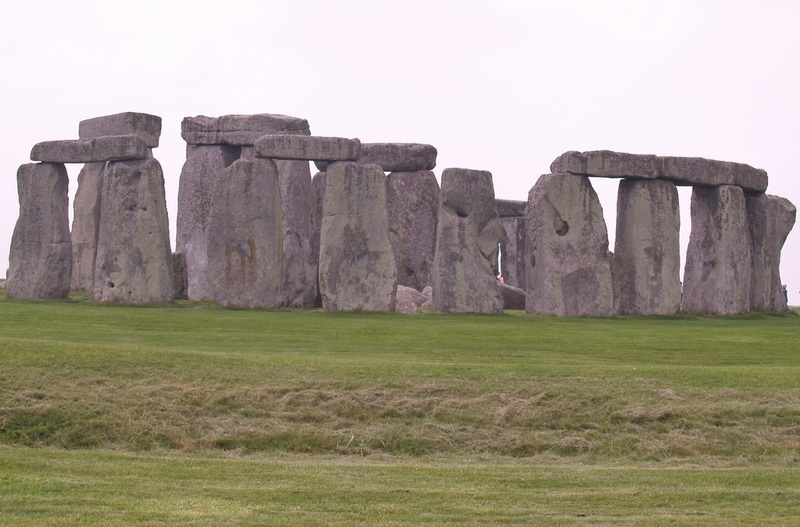 A couple of weeks ago we went to visit Stonehenge in Wiltshire. 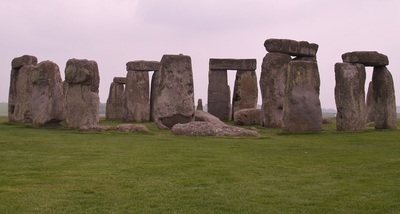 Stonehenge is a world heritage site and is so famous it needs little introduction, but basically it is the best preserved neolithic monument in Europe, a unique stone circle made around 2500 BC. Obviously Stonehenge itself doesn't change much over the years but the visitor experience has changed quite a lot recently . 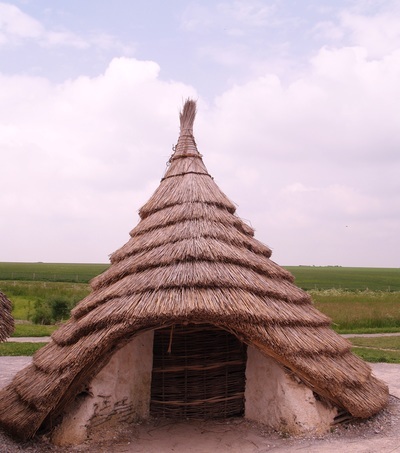 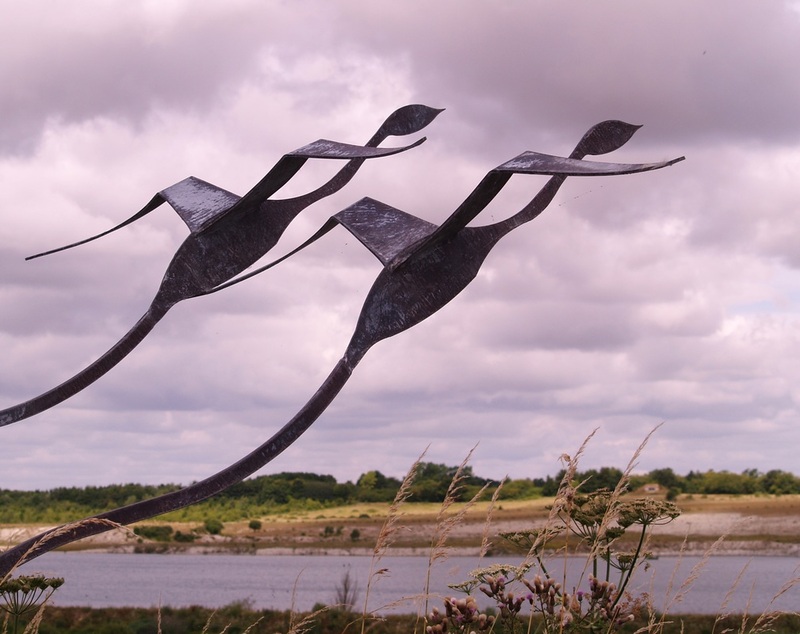 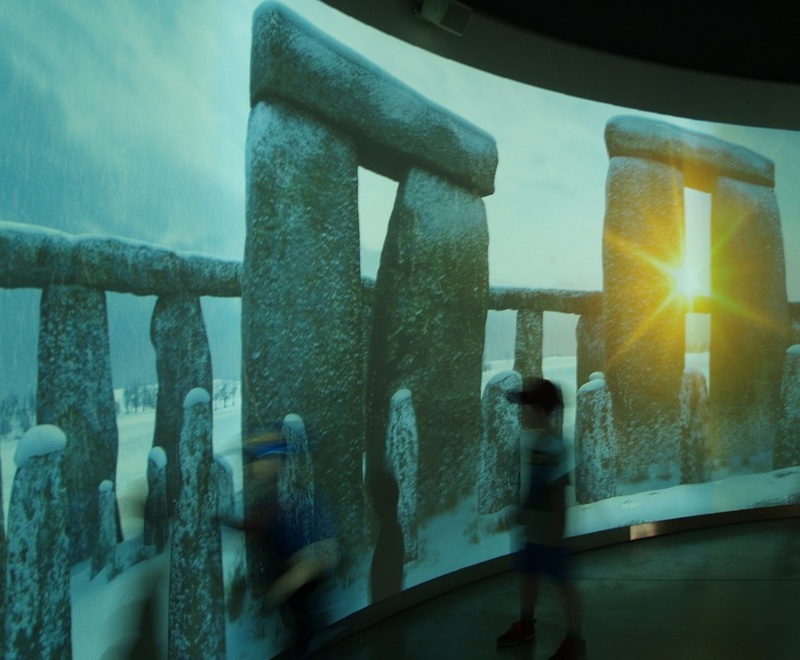 There is now a fully fledged visitors centre which has its own large free car park, a large gift shop, a restaurant and then the Stonehenge exhibition. 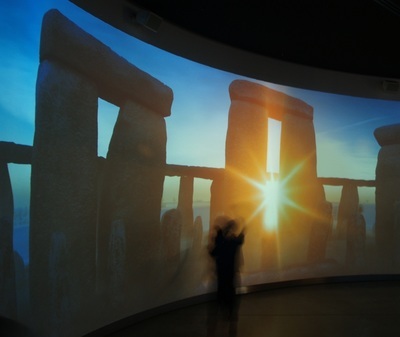 As you enter the exhibition there is a room which you stand in the middle of and it seems like you are standing in the middle of the stone circle, with images of it in different weathers and time periods projected onto the 360 screens around you. From there you pass to the main exhibition area which shows you how the site has changed and has skeletons and reconstructions etc in it and lots of information about life in the stone age. 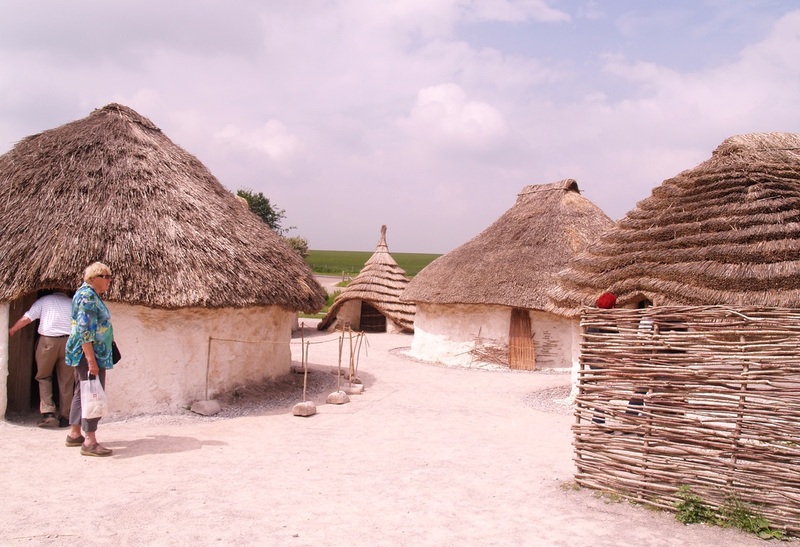 Outside the visitors centre they have built a small neolithic village using original materials which consists of about 5 houses that you can go in, that have helpful guides who will tell you anything you want to know about them. 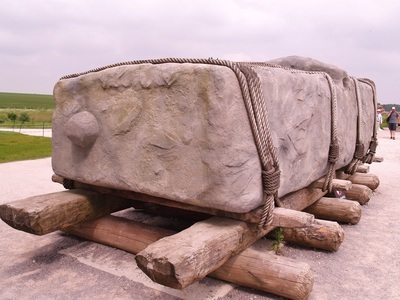 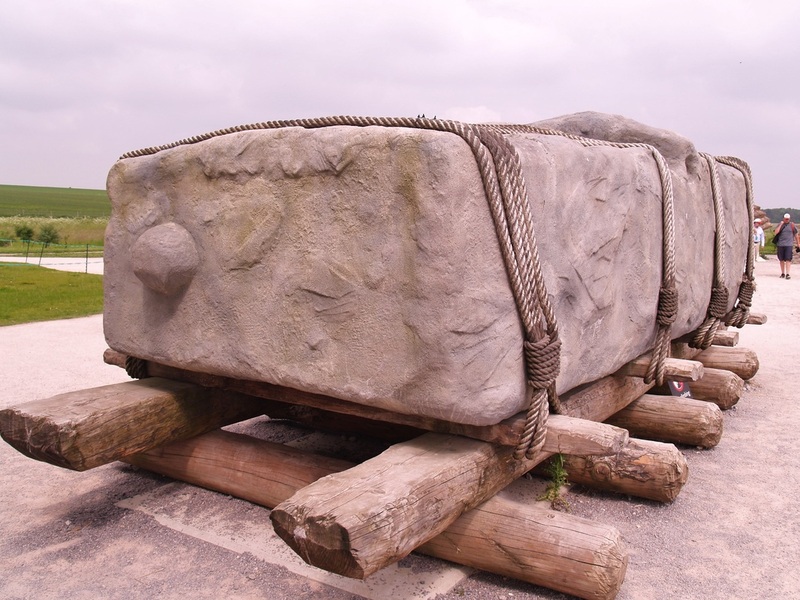 There is also a replica of one of the stones that you can attempt to pull and it tells you how many more people you'd need to help you. 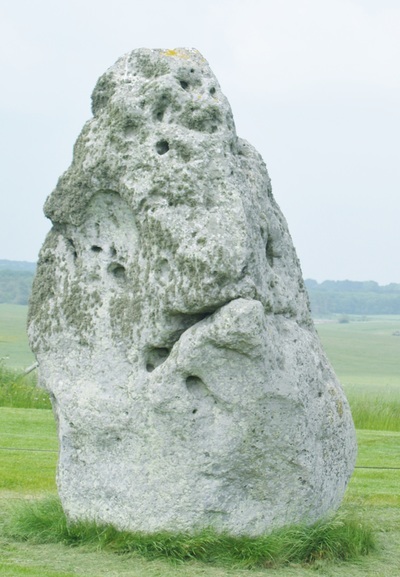 Once you have explored this area you can pick up a free audio guide and there are free shuttle buses that take you up to the stones. 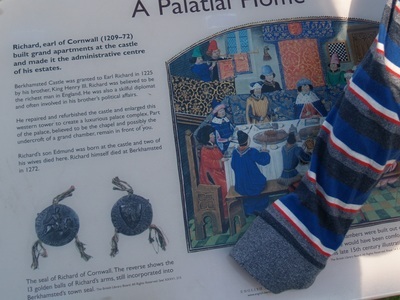 When you arrive the audio guides tell you in several different languages all about the history and meaning of the site. There are also members of staff on hand who were very helpful. Stonehenge is extremely well signed from all directions, and has lots of free parking. 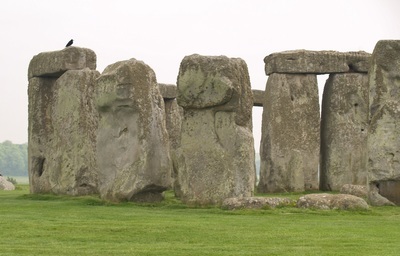 It took us about 2 hours in total for our visit but would depend on how long you want to look at the stones for.